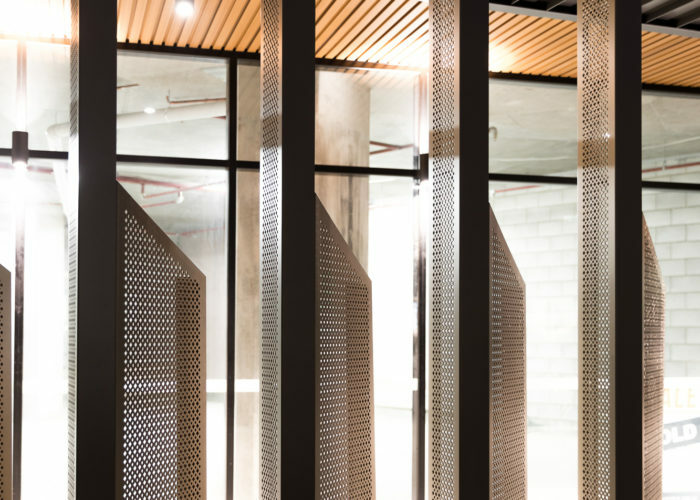 Arena is a collective response to the context of the people, the site, views, orientation and ground level activation. 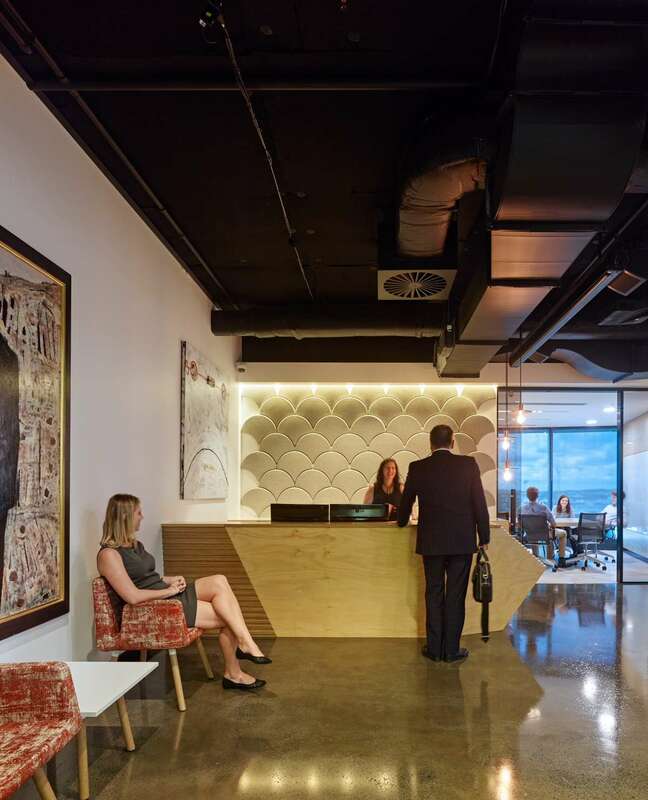 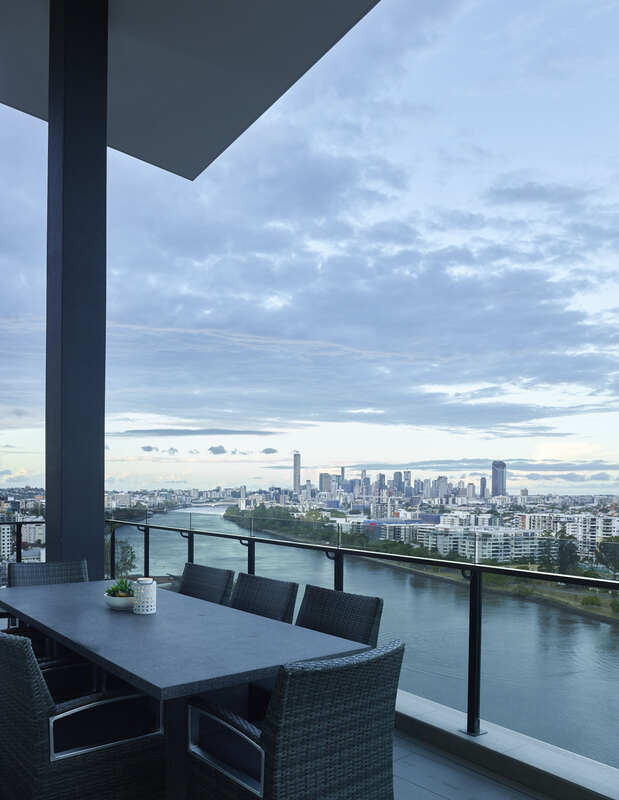 We partnered with Galileo, to deliver something unlike anything else is South Brisbane. Arena is a collective response to the context of the people, the site, views, orientation and ground level activation. 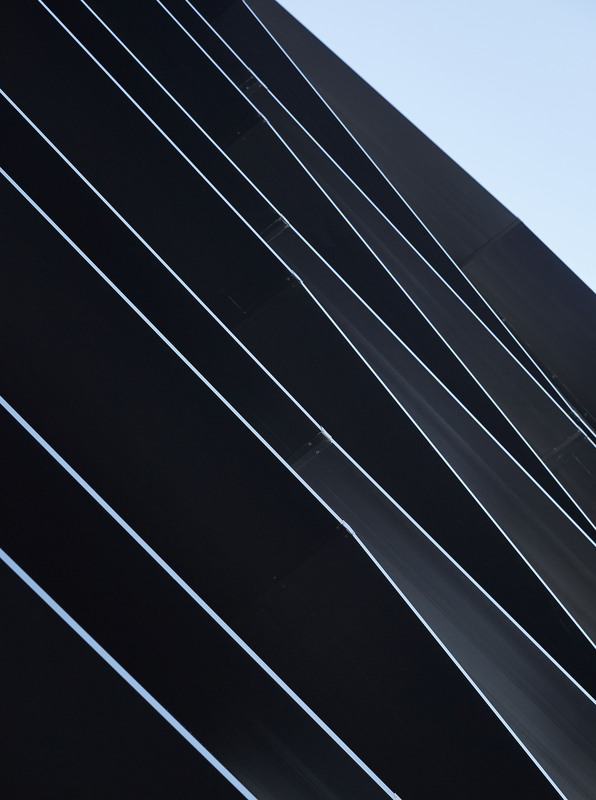 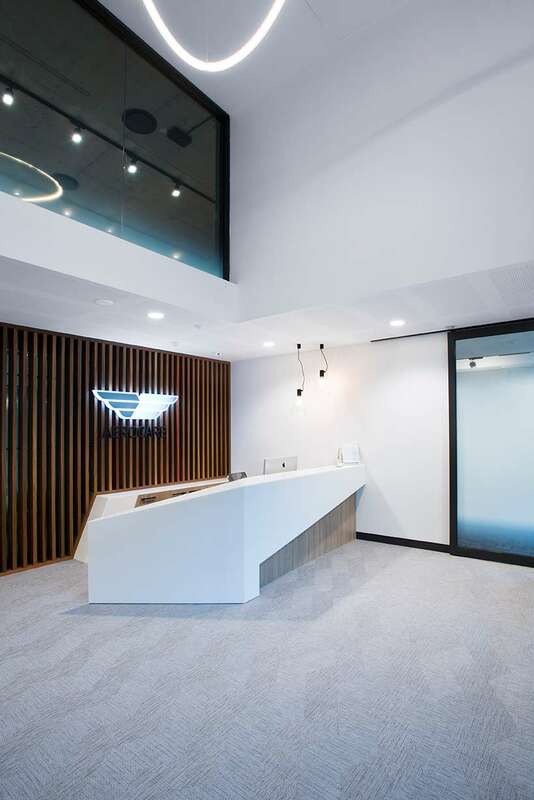 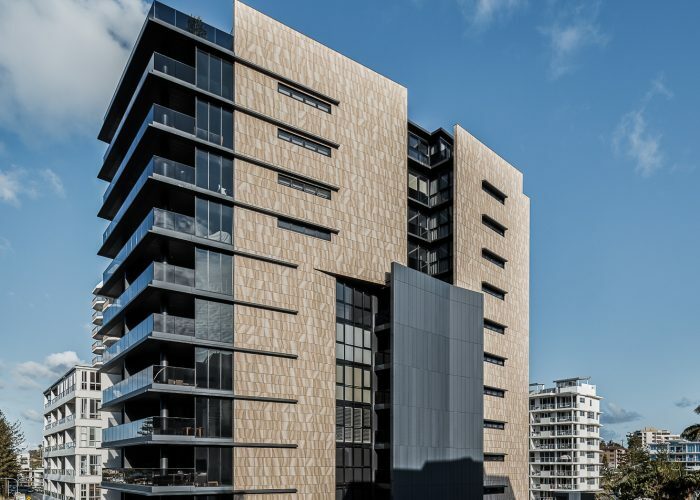 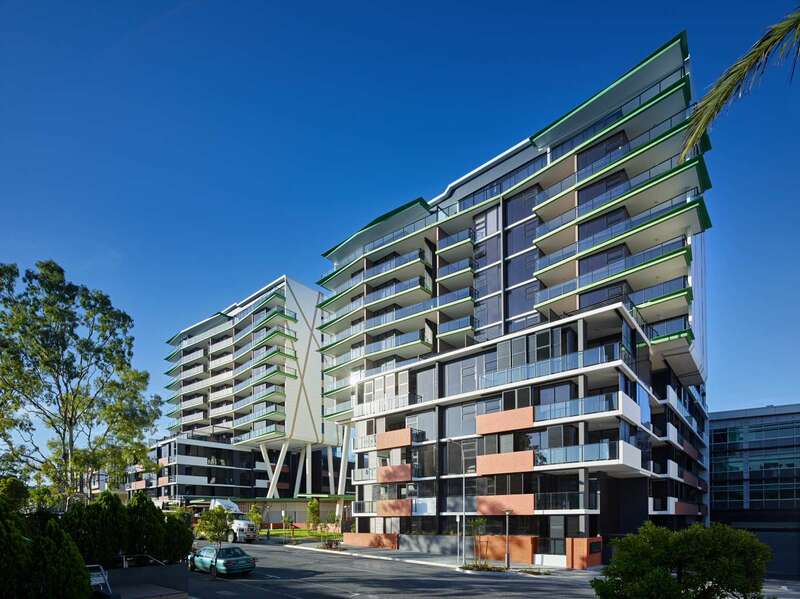 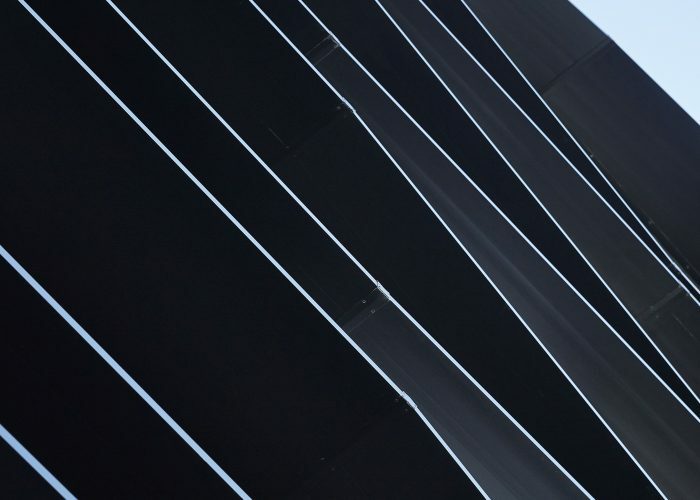 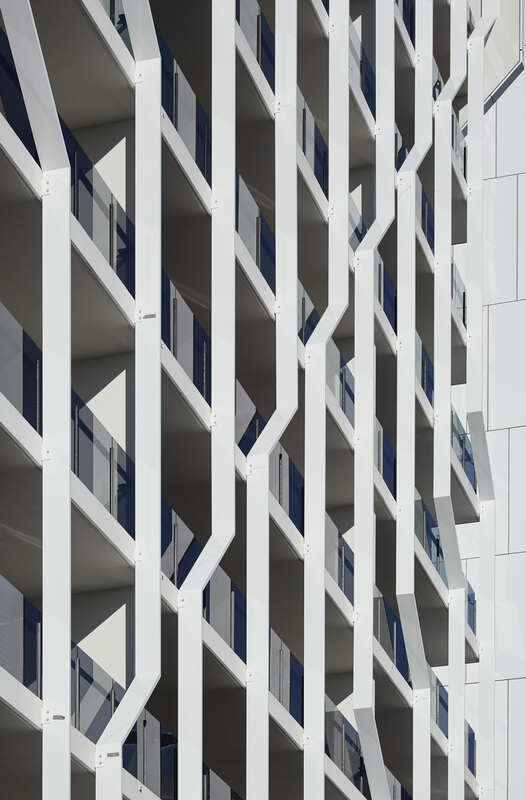 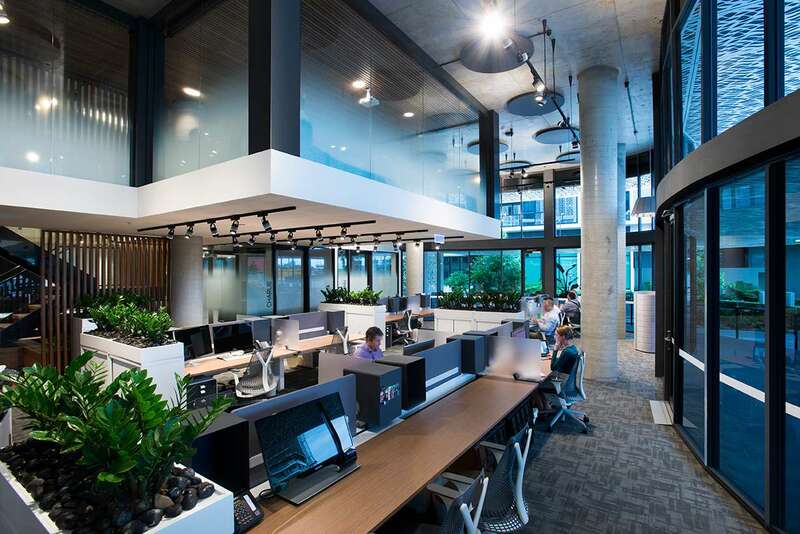 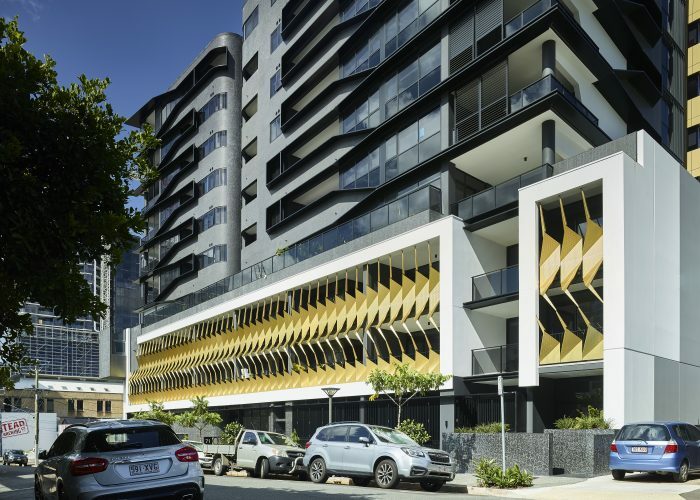 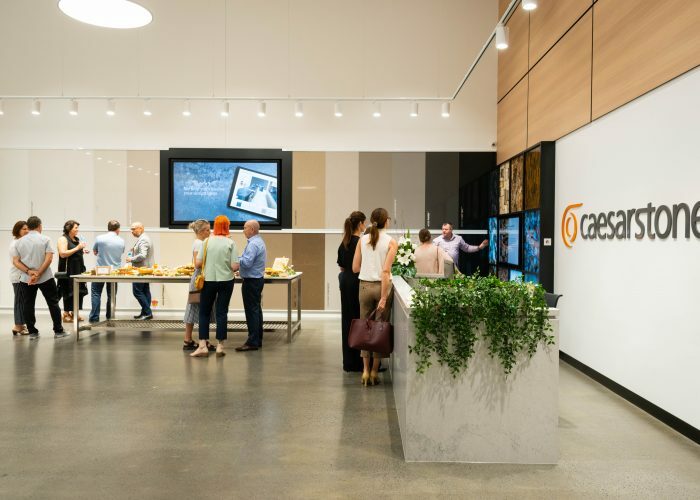 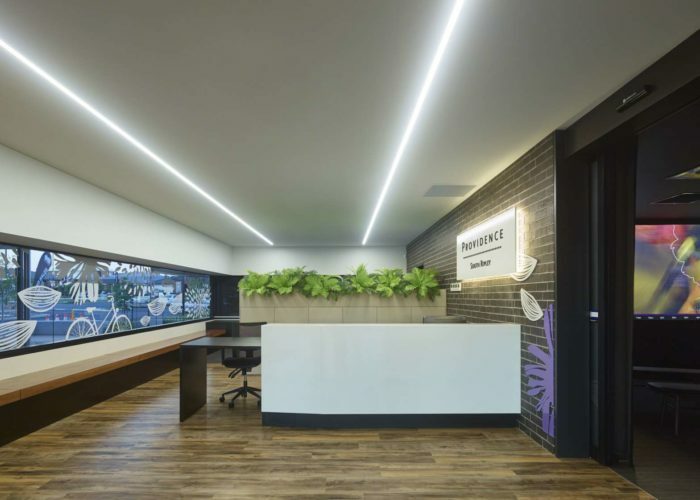 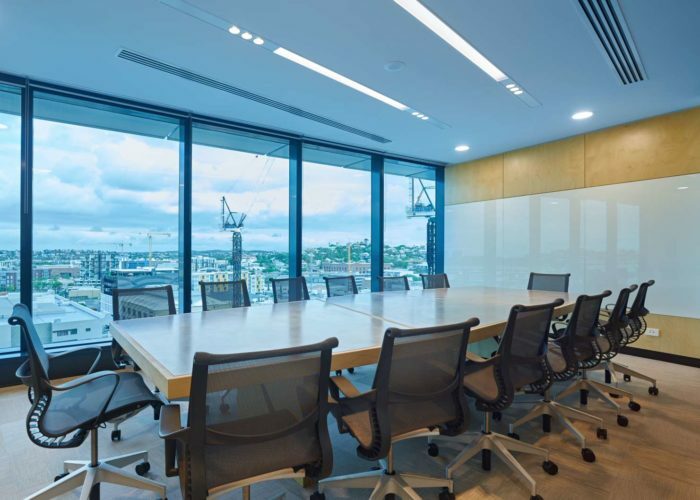 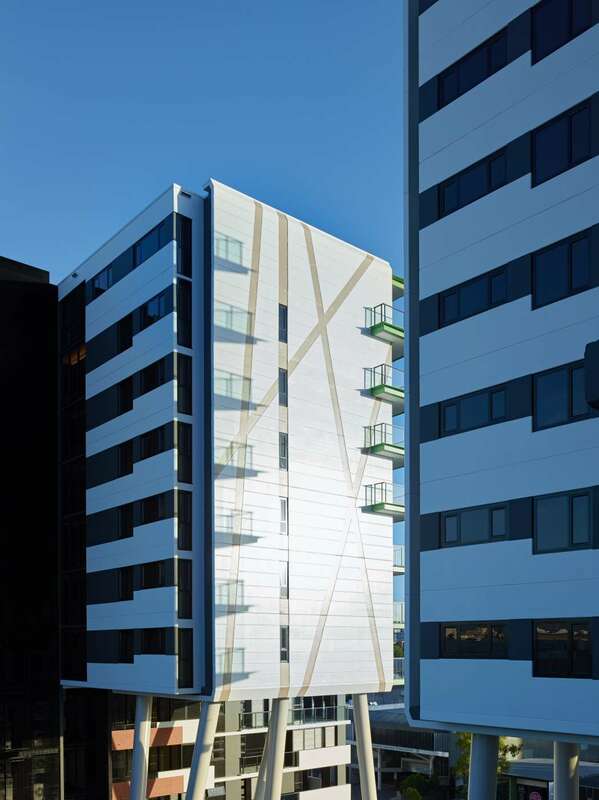 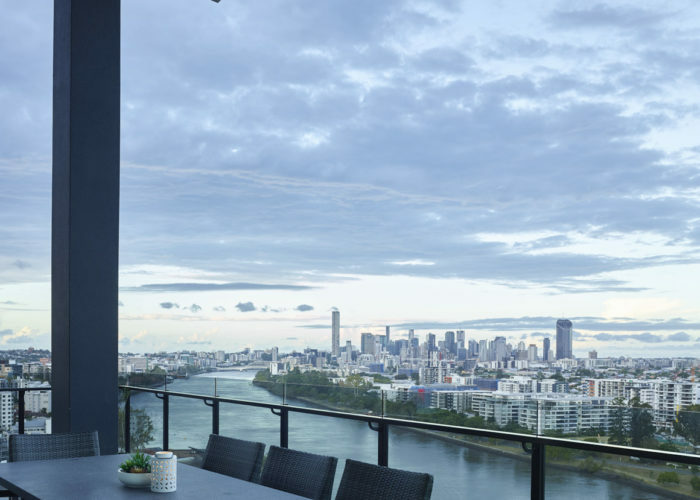 We partnered with Galileo, to deliver something unlike anything else is South Brisbane and its strong bold form makes a real statement in the vibrant South Brisbane community. 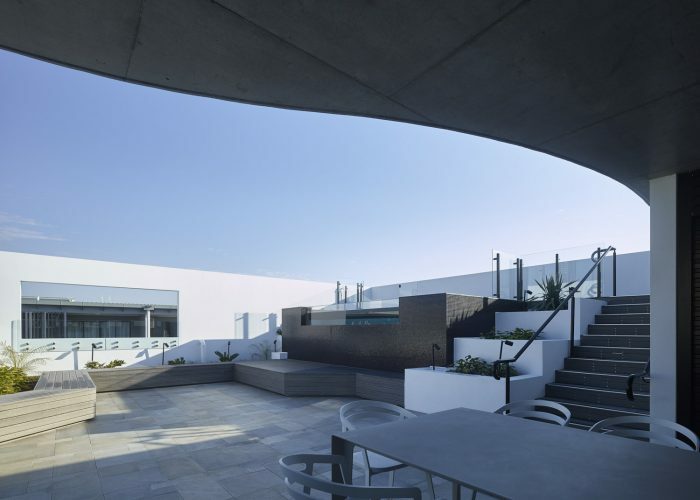 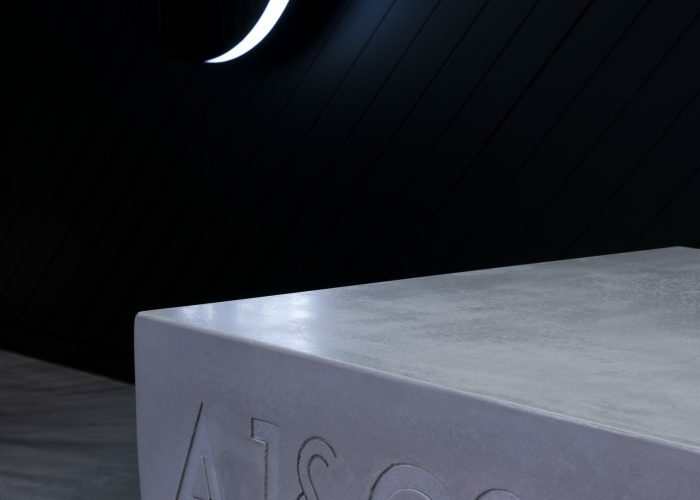 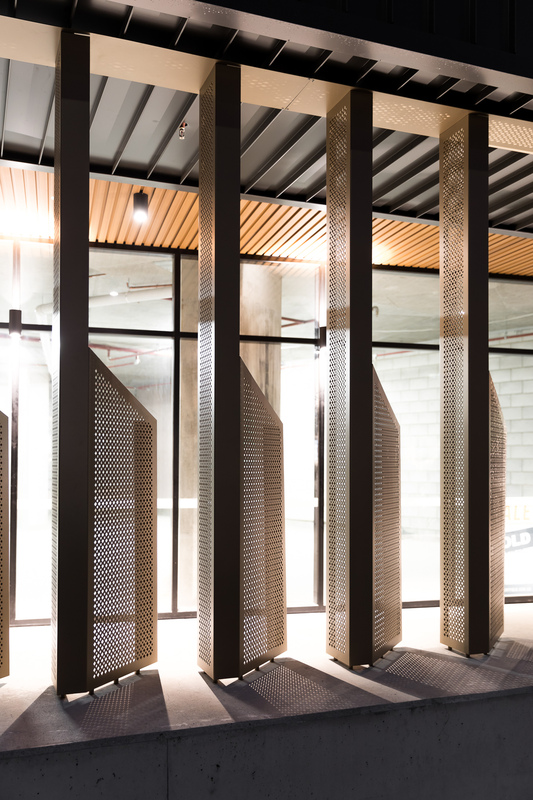 The central courtyard defined by the expression of the podium form, is the heart of Arena and is host to active public gathering areas, and private retreat and refection nooks. 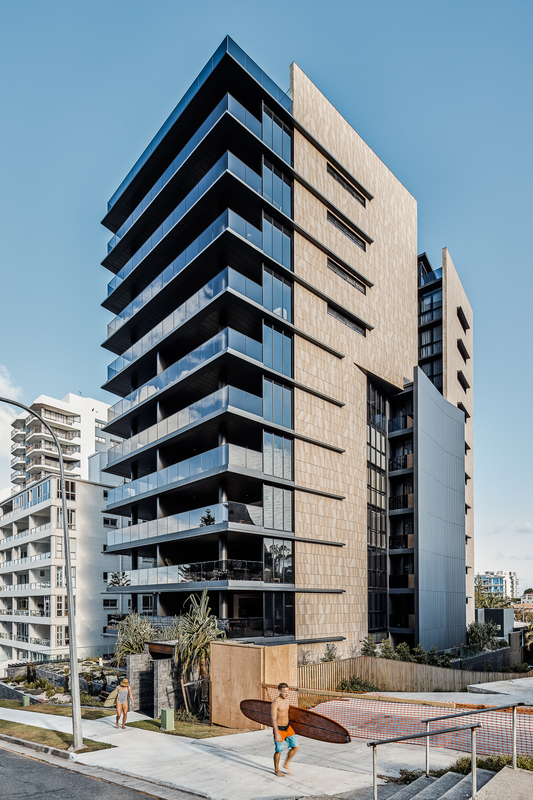 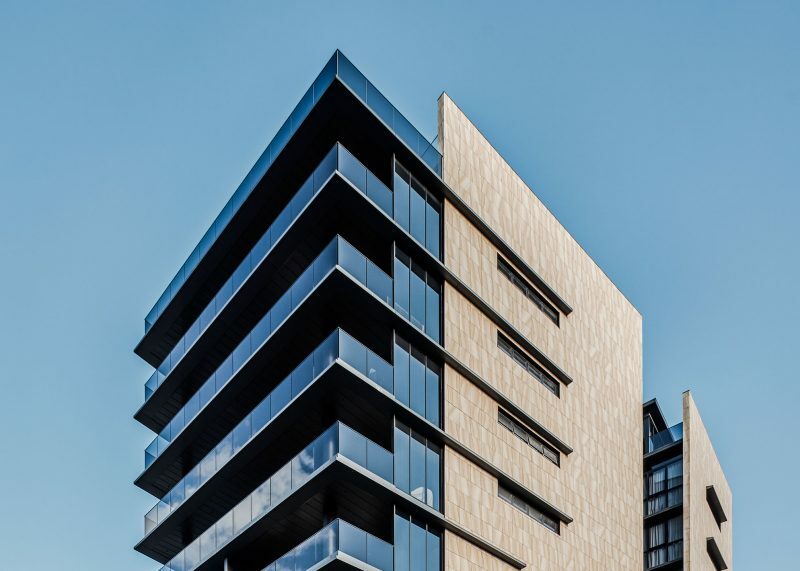 The rotated podium and tower form takes advantage of the expansive view lines, allow views for neighbouring buildings and creates an urban courtyard that contributes to both the public and private amenity. 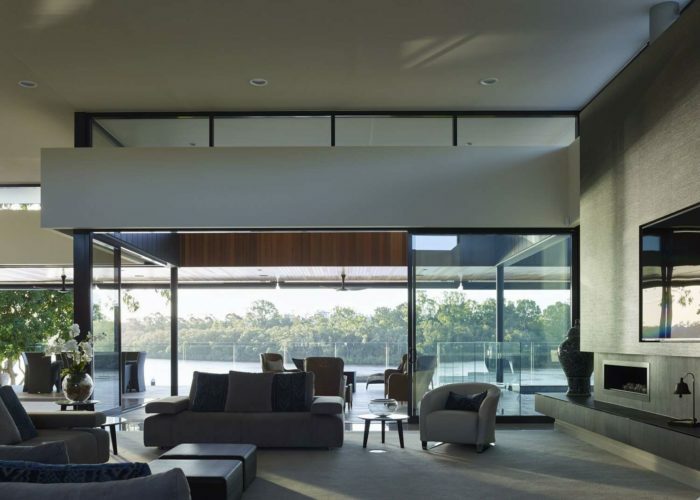 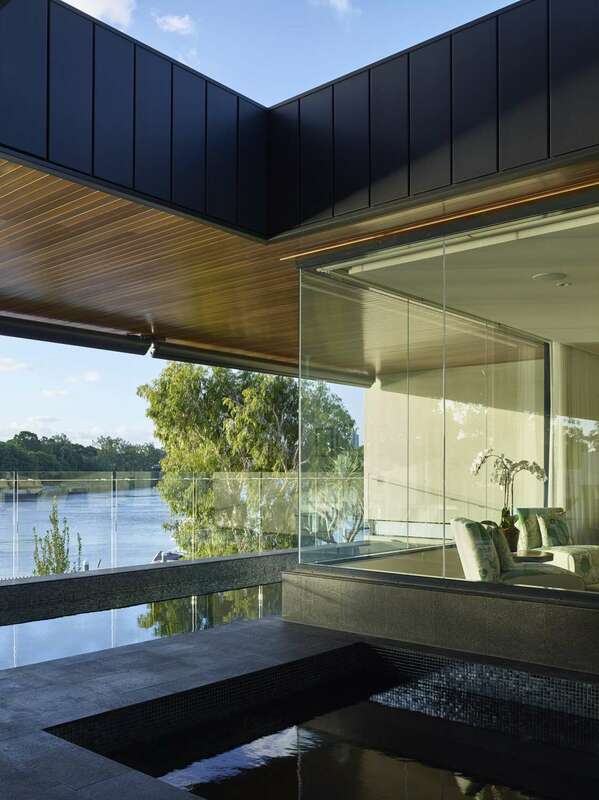 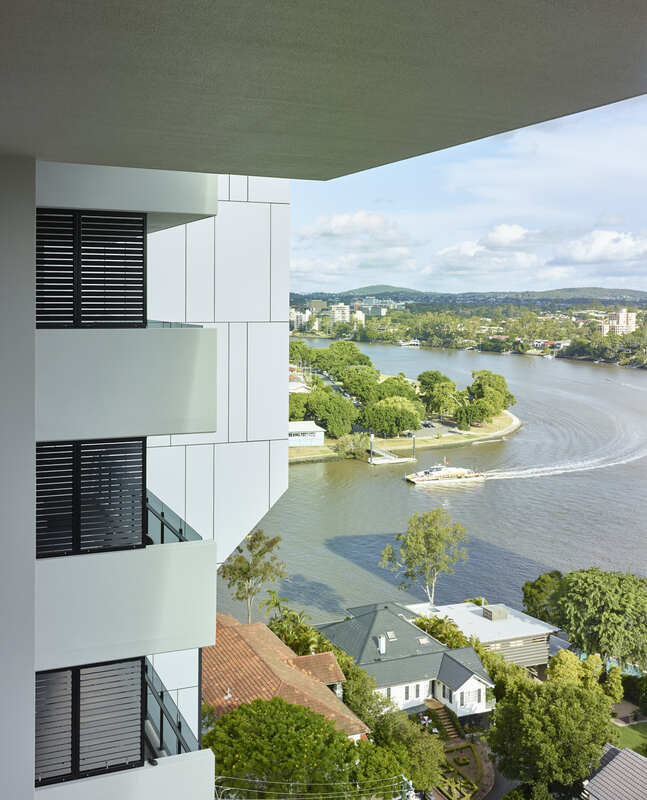 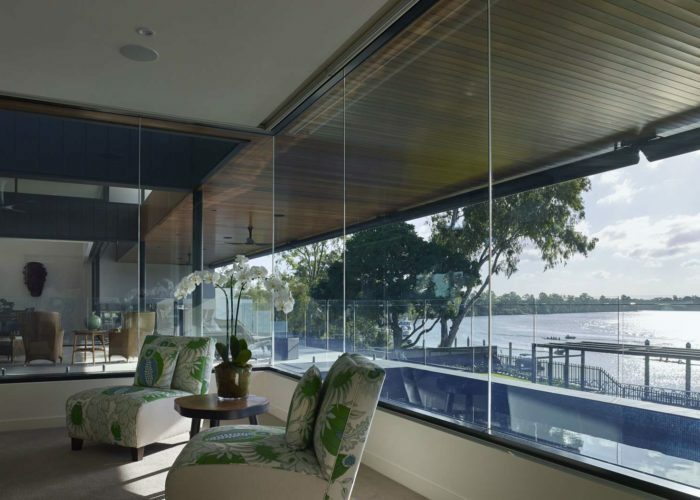 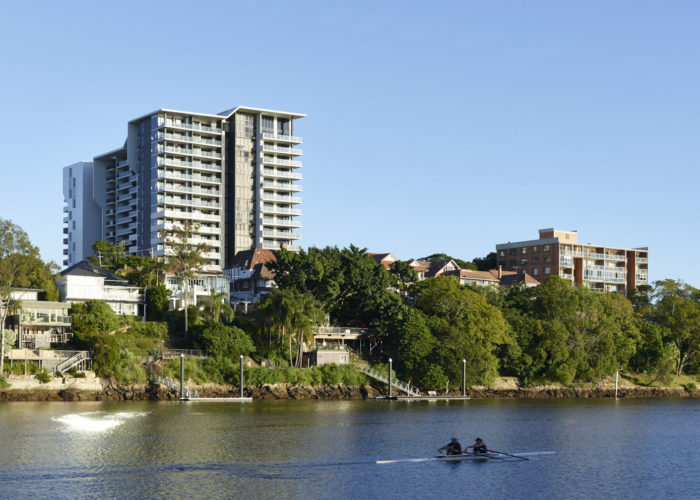 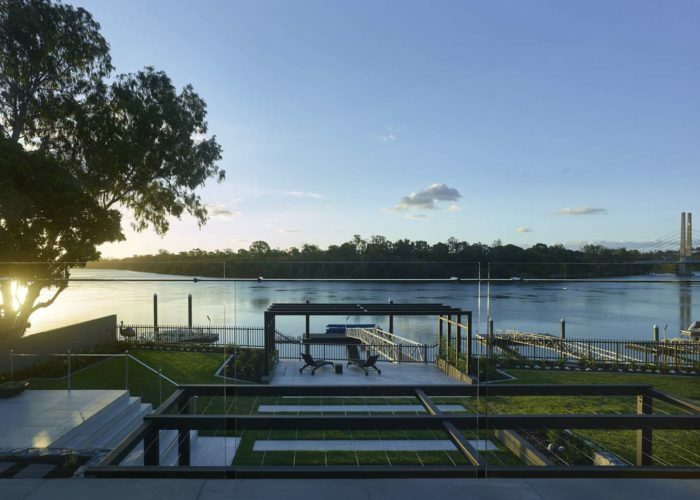 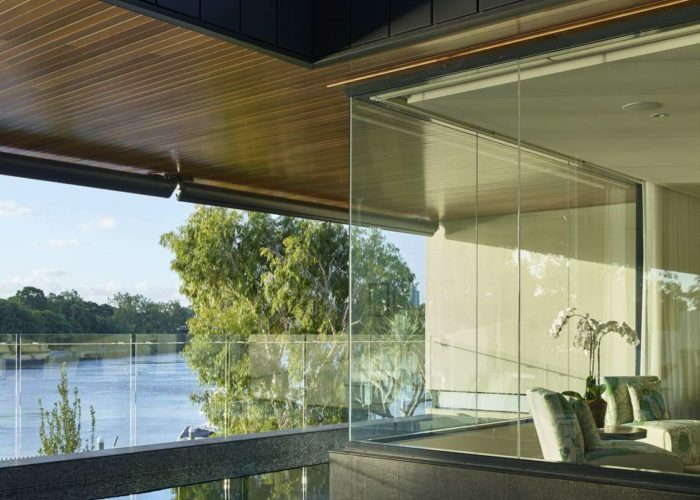 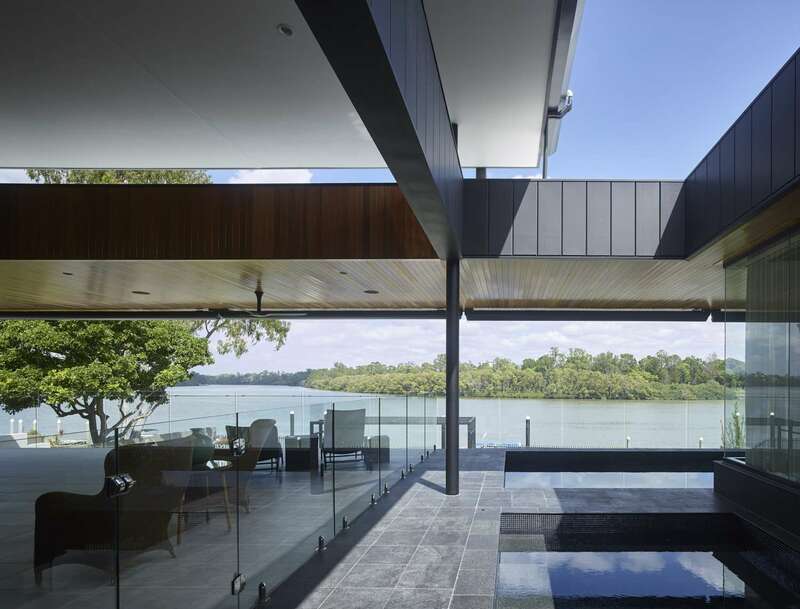 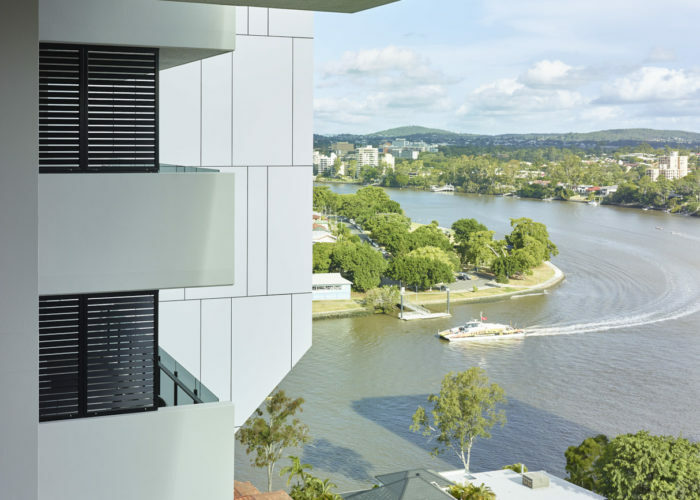 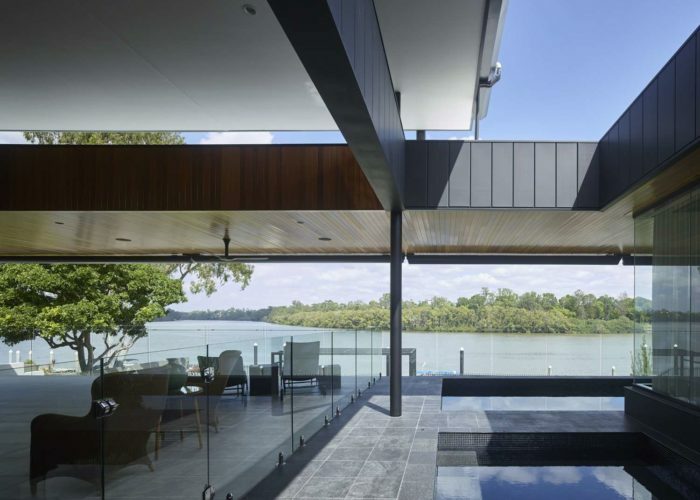 The site of Corso House occupies a unique oxbow in the Brisbane River in Fairfield that provides for uninterrupted river views. 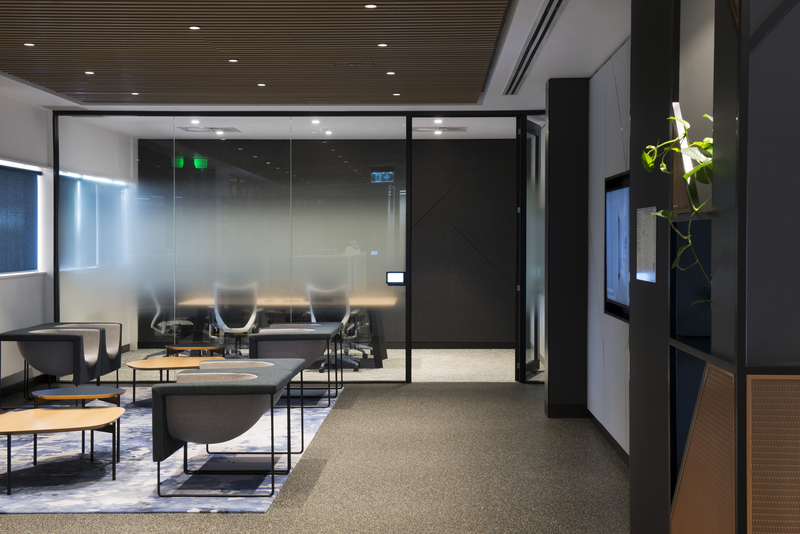 The site and client held three key criteria, design for flood immunity, design for ultimate privacy and design for openness and light. 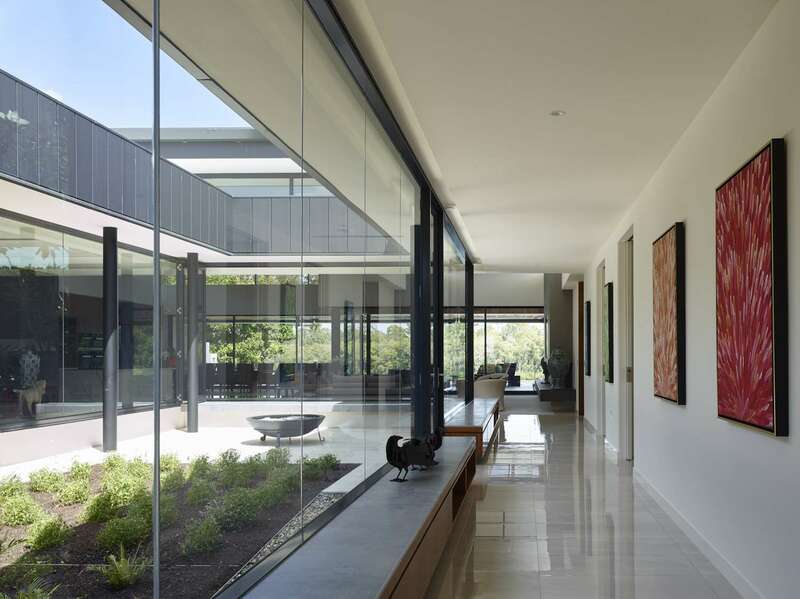 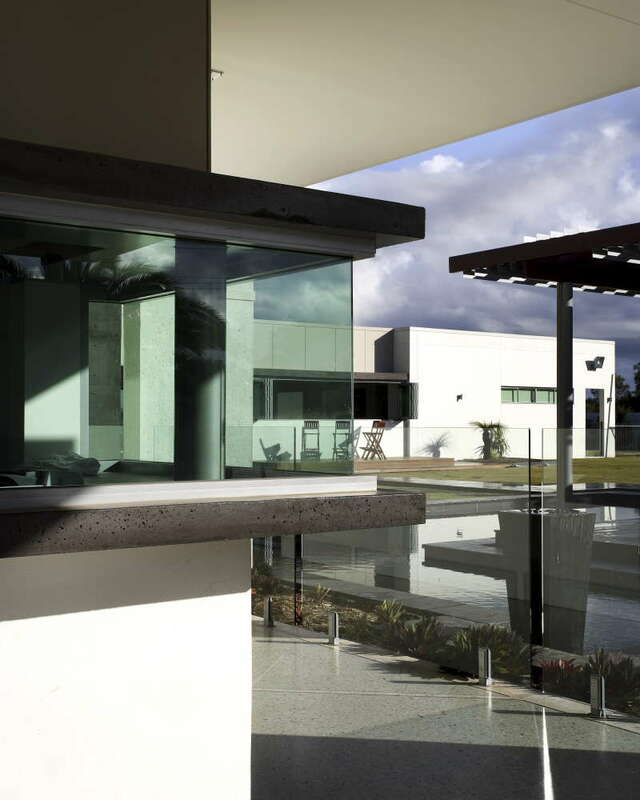 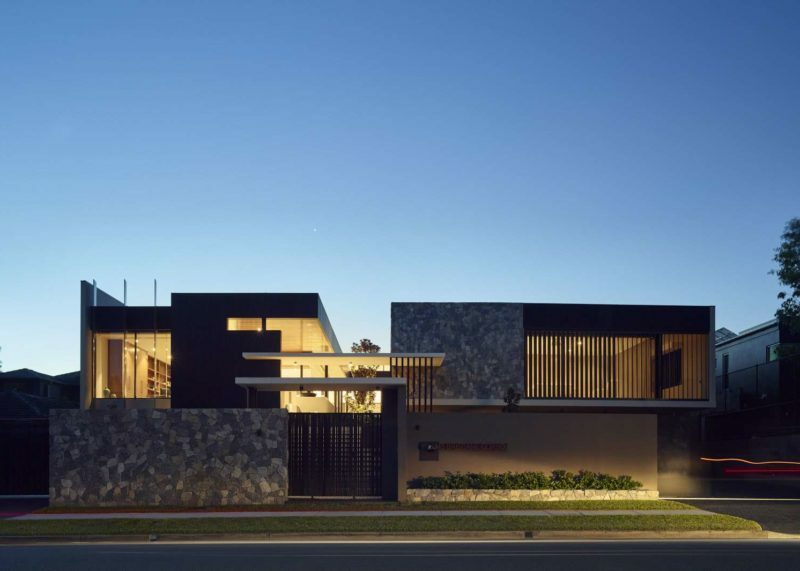 The contrasting requirements for achieving privacy in a light filled home formed the framework for the project. 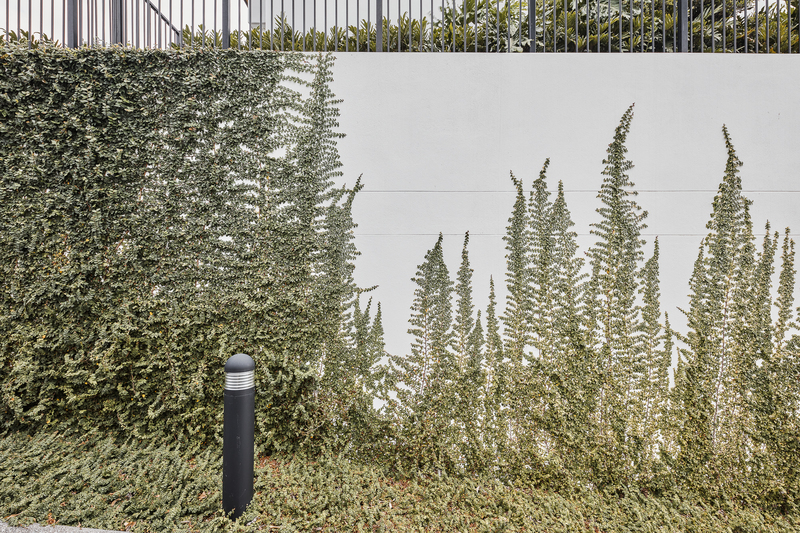 As each step up toward the house protects it from potential flood waters, the gardens that surround its entry step into the house. 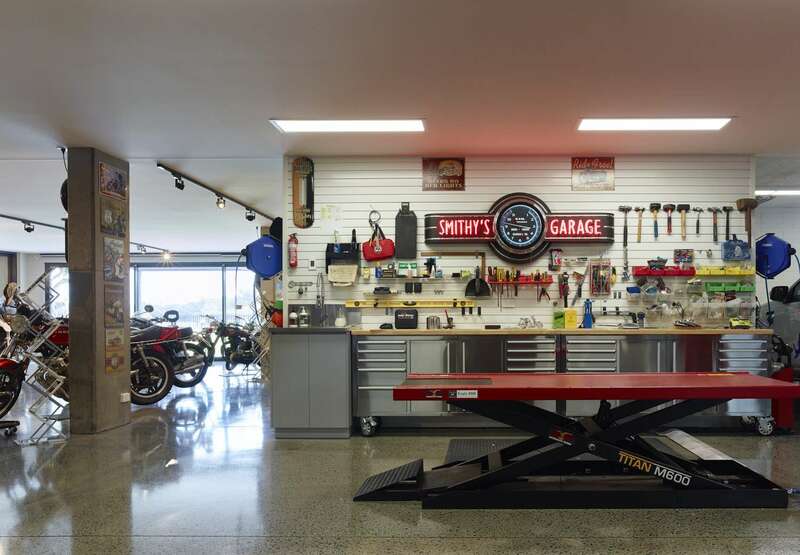 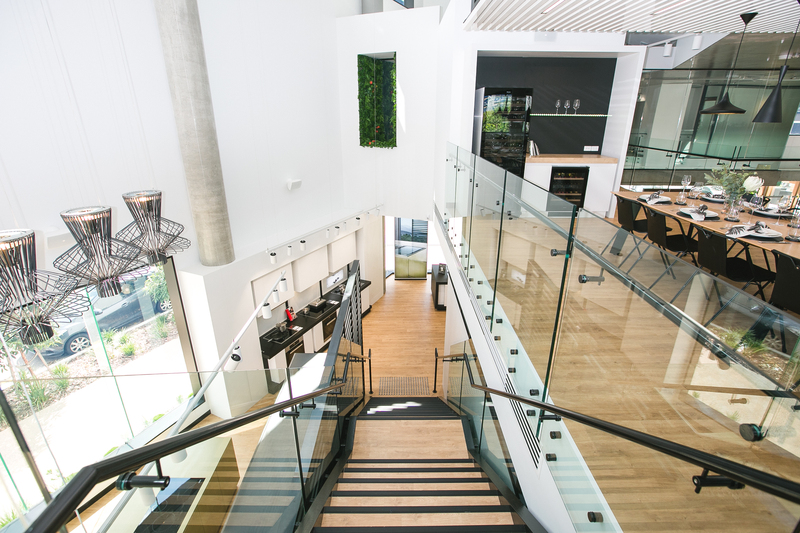 Our clients were our co-creators of this new home. 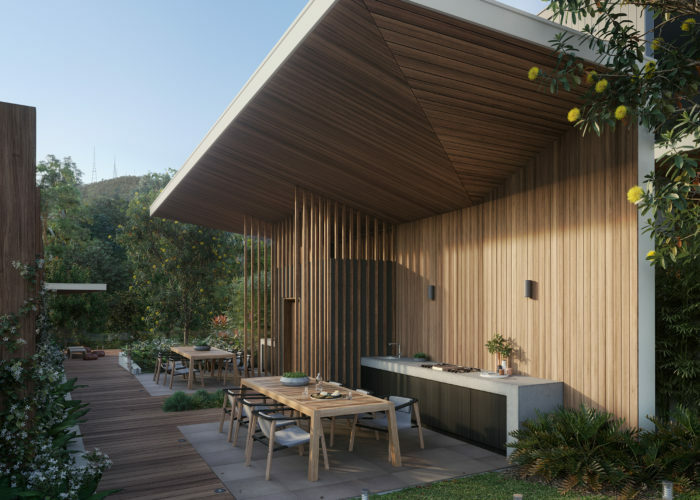 Being retired empty nesters, this was a place not only for them to call home, but a retreat for their extended family and friends. 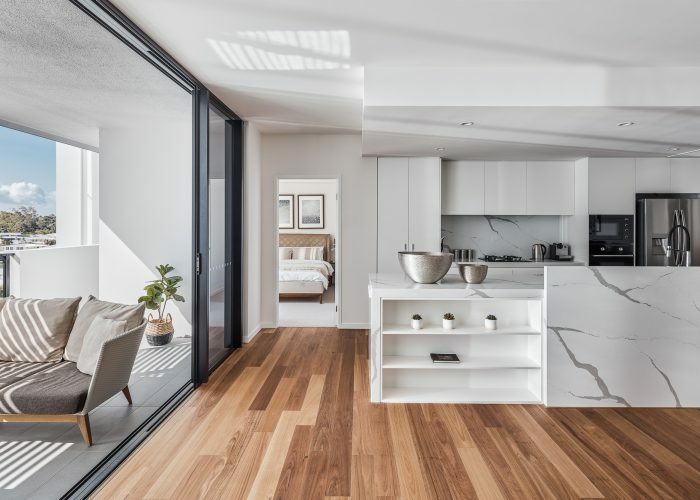 With this in mind we focused on provided flexible living spaces, which could accommodate activated living and entertaining as well as private play and sleep out guest rooms. 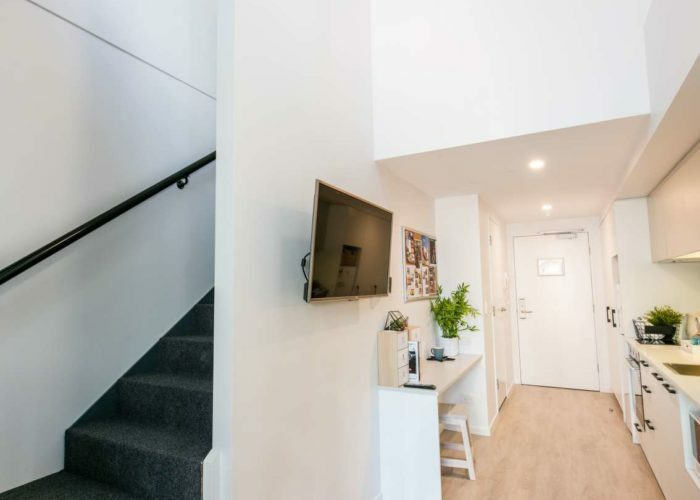 With character-filled wooden homes, leafy streets and a hilly aspect, The Gap is a convenient home for established professionals and active families. 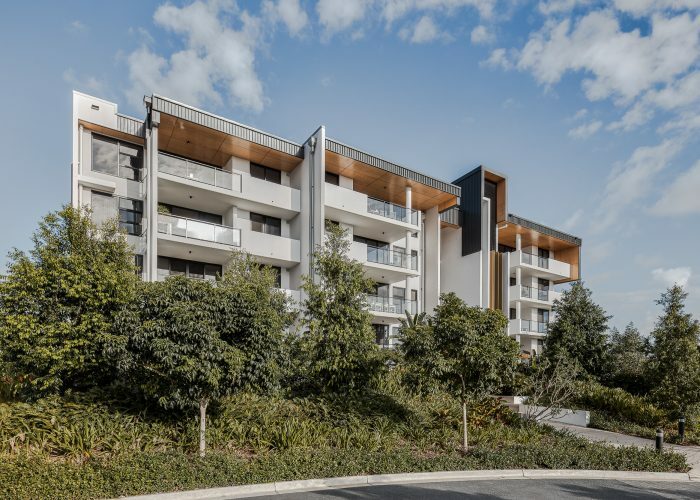 Drawing inspiration from nearby natural attractions such as Mt Cootha, and taking cues from the values and attitudes of the local community of residents within The Gap, we partnered with Lantona group to create a unique development in the heart of The Gap with a focus on community and the natural surrounds. 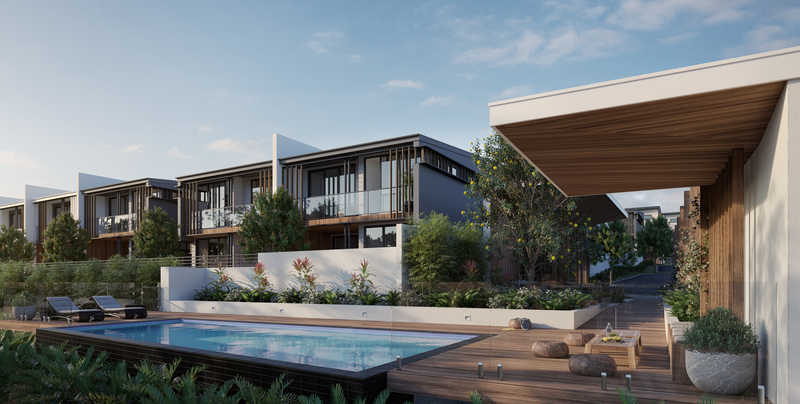 Hive aims to create an idyllic lifestyle providing refuge and a sense of belonging as a retreat from the pressures of modern life. 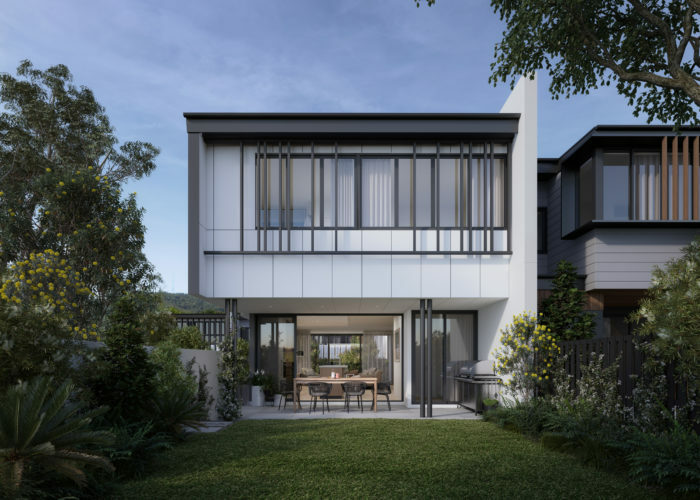 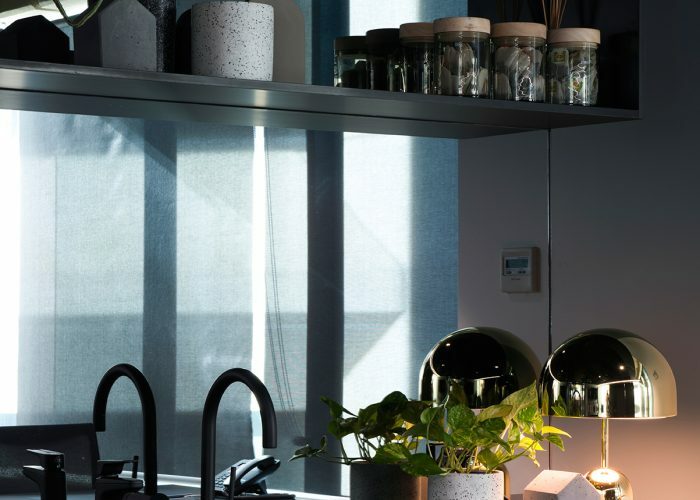 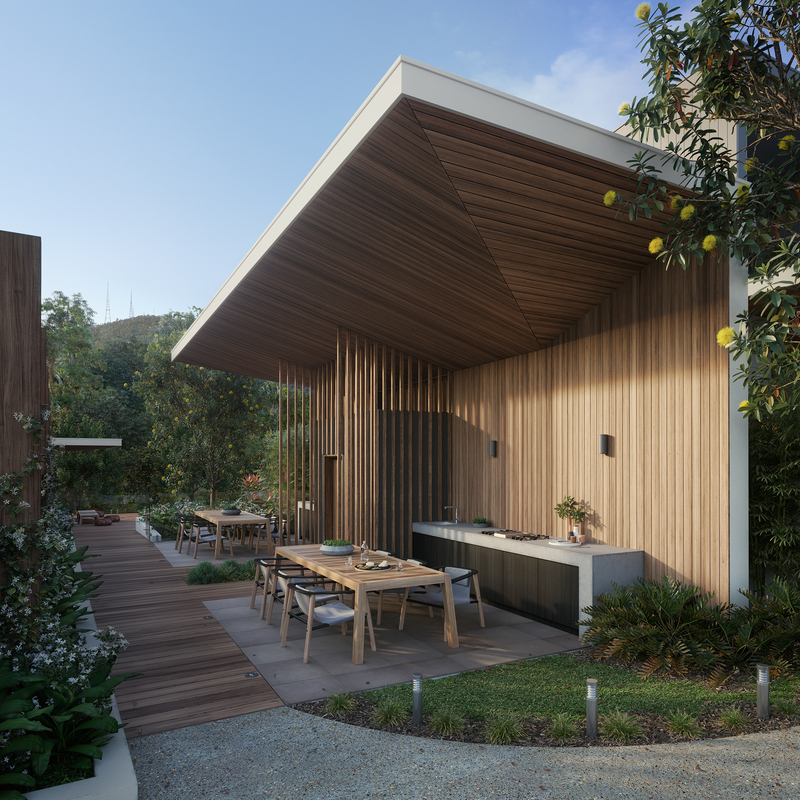 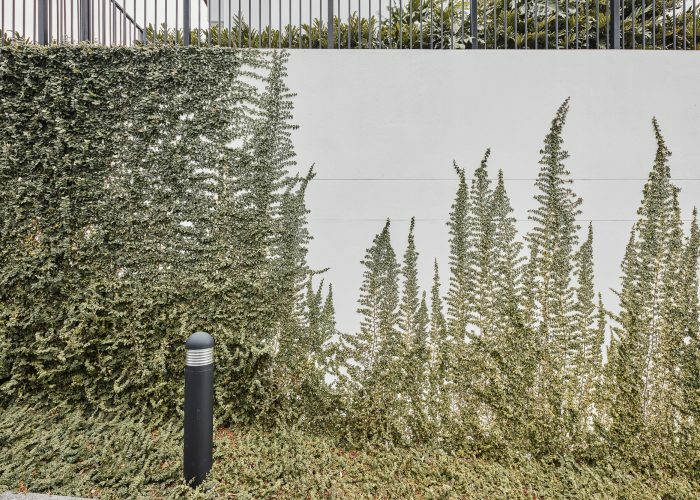 The homes seek to strike a balance between a sense of privacy and a sense of community, taking advantage of the leafy surrounds and native plant life. 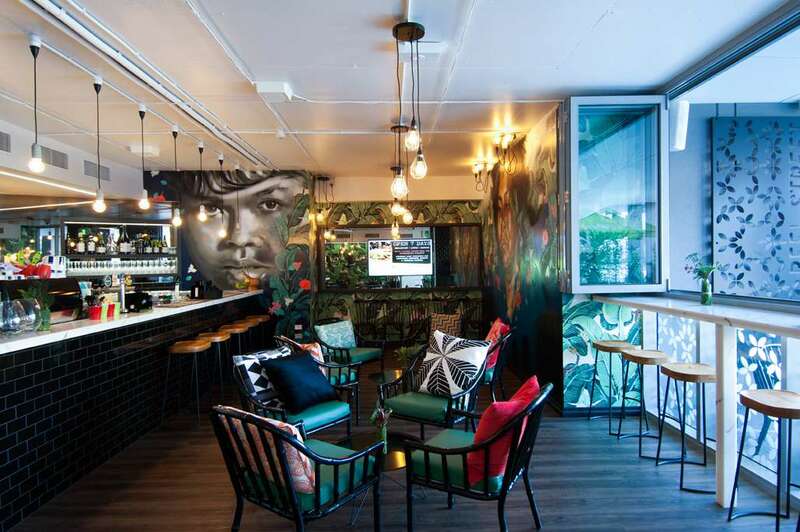 Fortitude Café embraces the ‘Valley’ vibe with pops of neon, colour and memorable graphics which pay tribute to the locality and history of the area. 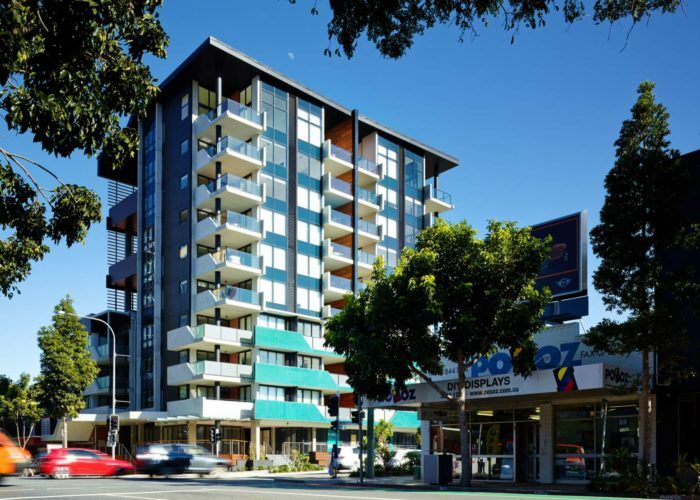 Fortitude Valley is located on the fringe of Brisbane’s CBD and showcases a mixture of heritage brick buildings, art and nightlife. 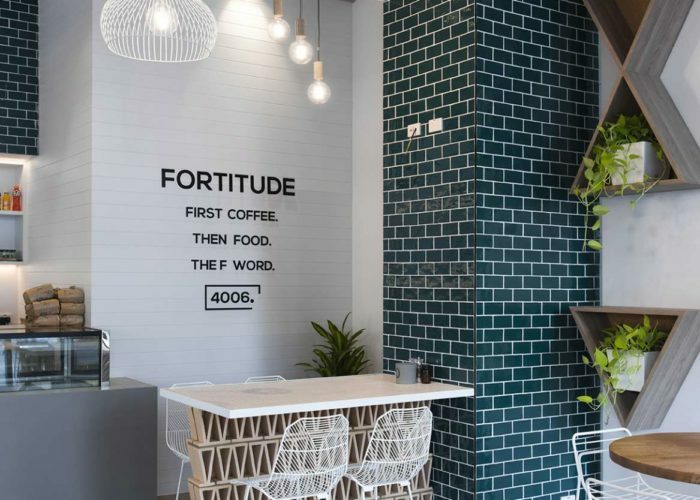 Fortitude Café embraces the ‘Valley’ vibe with pops of neon, colour and memorable graphics which pay tribute to the locality and history of the area. 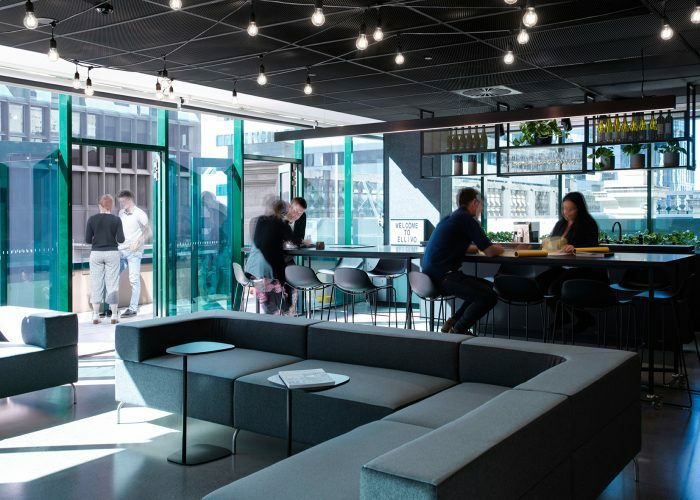 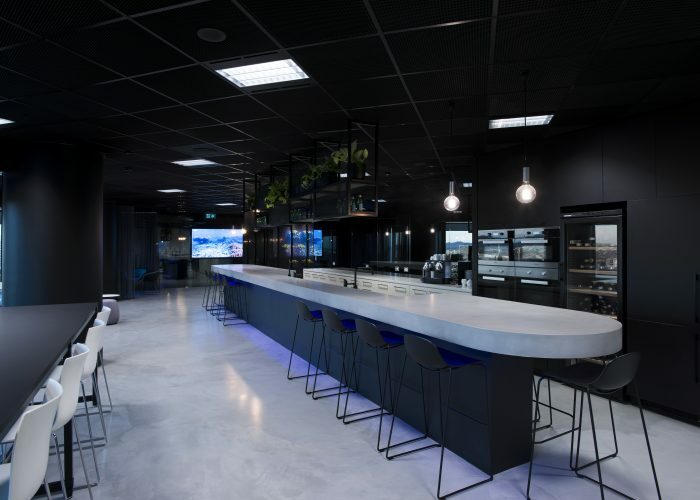 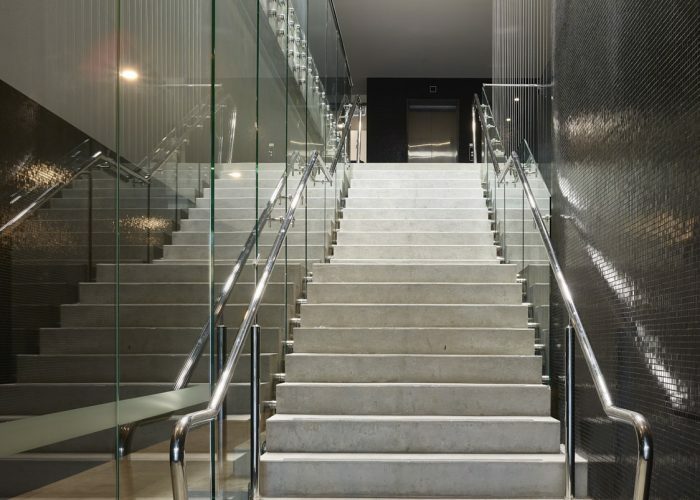 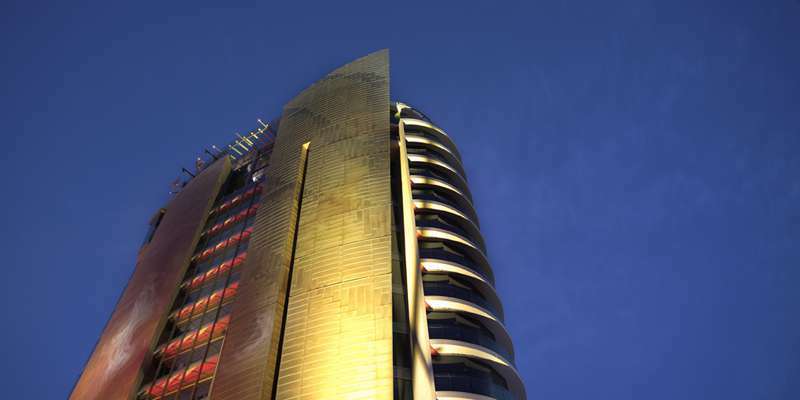 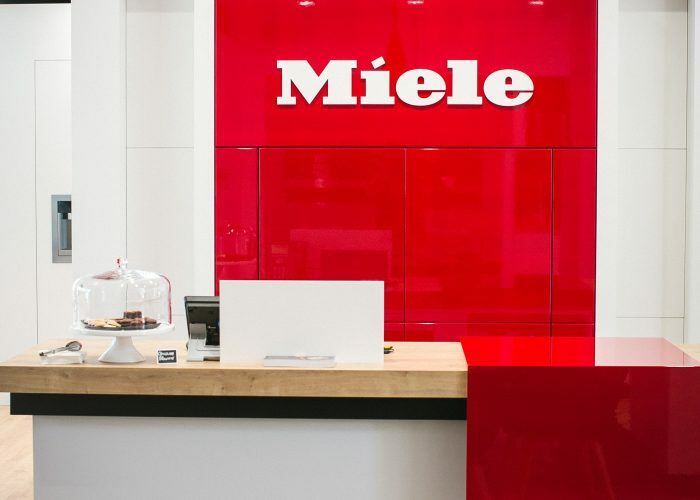 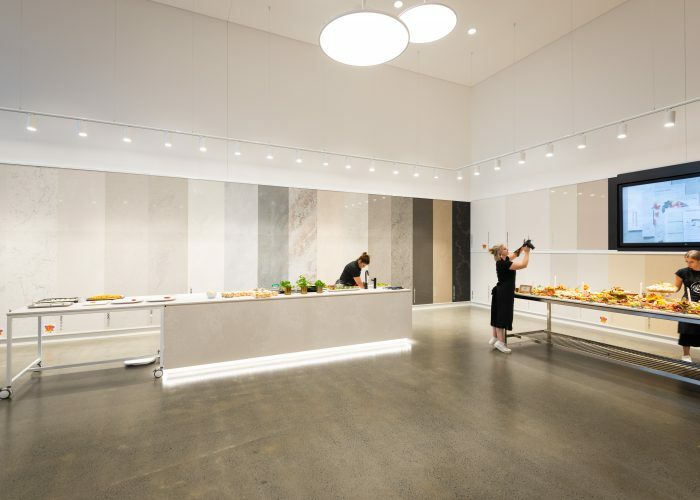 The café sits on the ground floor of a large office building, and is directly accessible to office workers, passing pedestrians, construction workers and nearby residents. 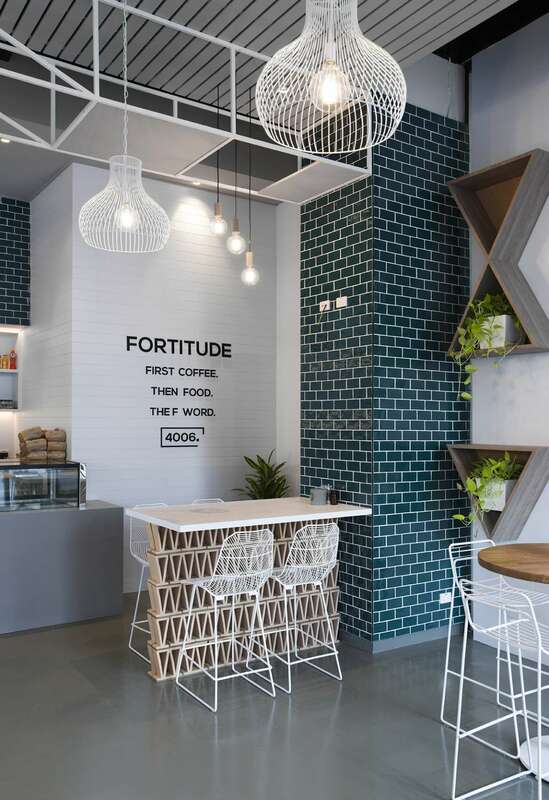 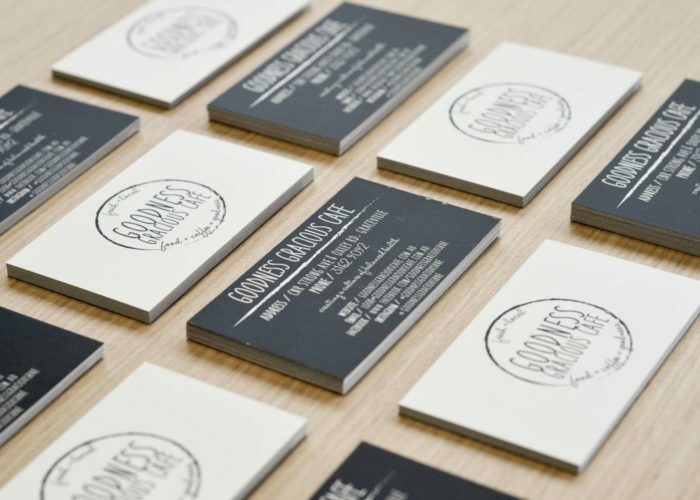 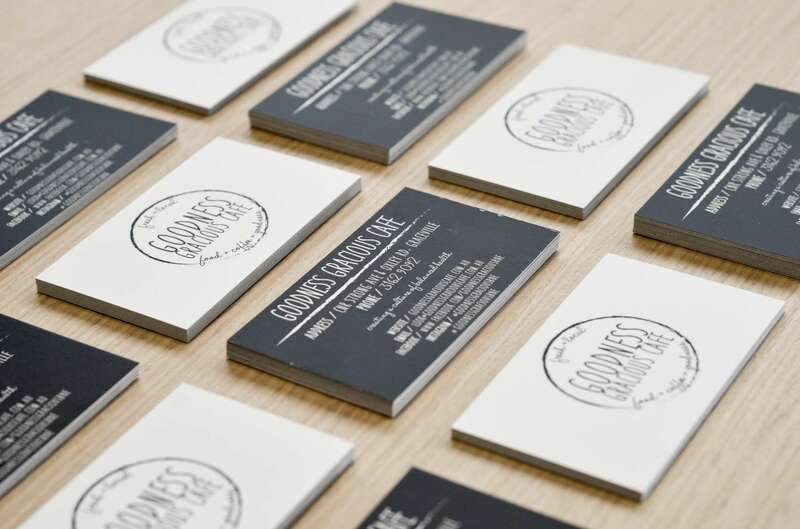 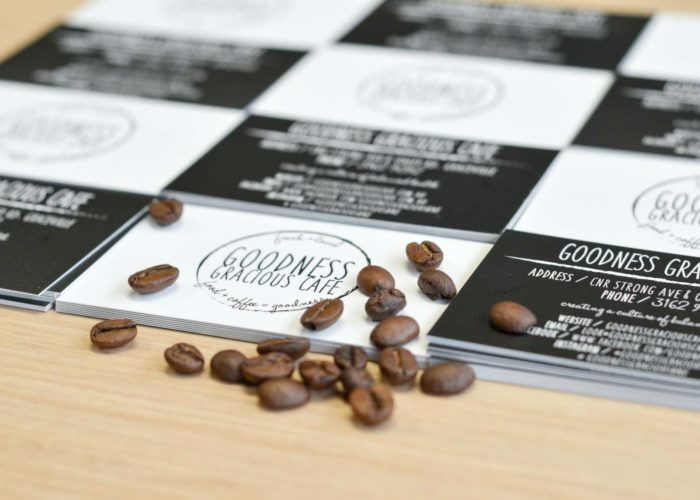 We took our clients on an identity and branding journey, working in partnership to create the logos, graphics and stationery, which has given Fortitude Café a truly unique identity. 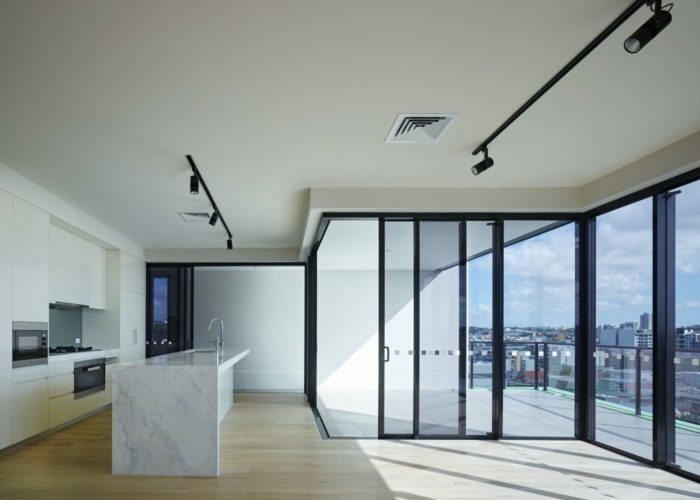 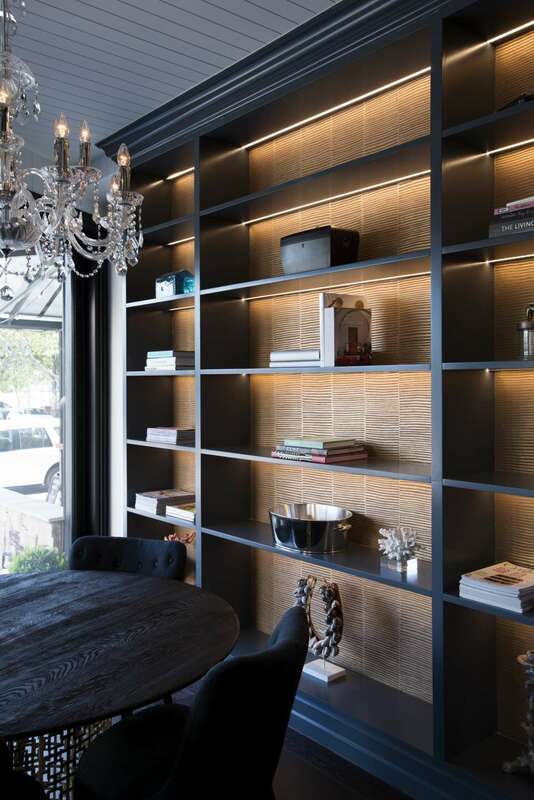 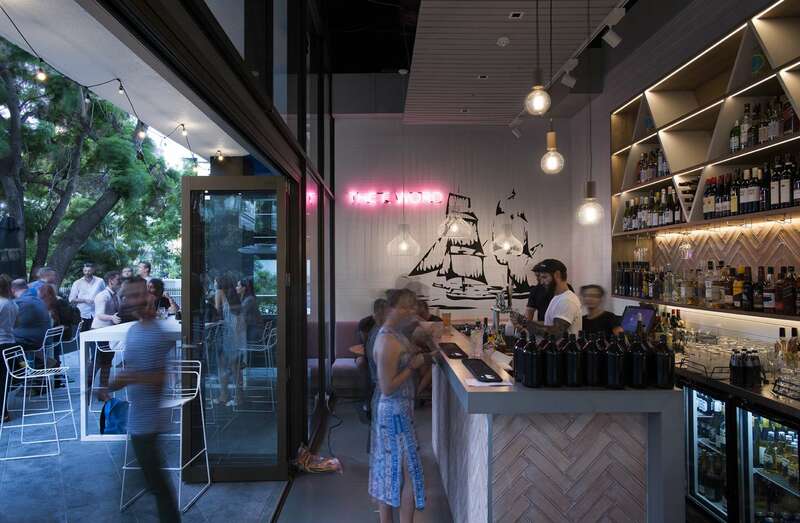 The fitout is light filled and open-aired, balancing a refined yet edgy personality. 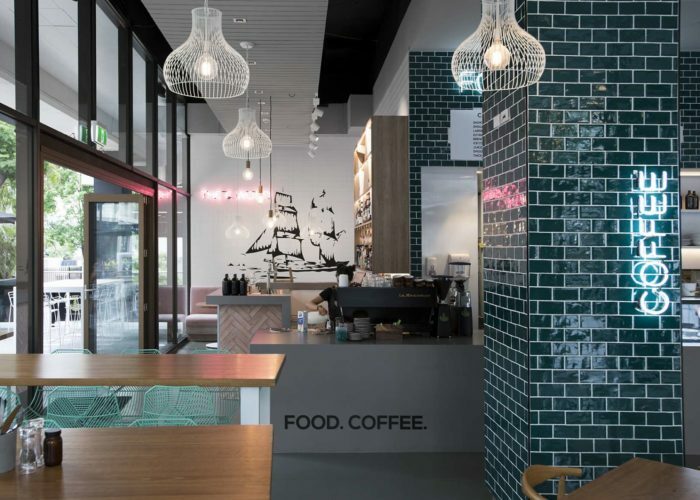 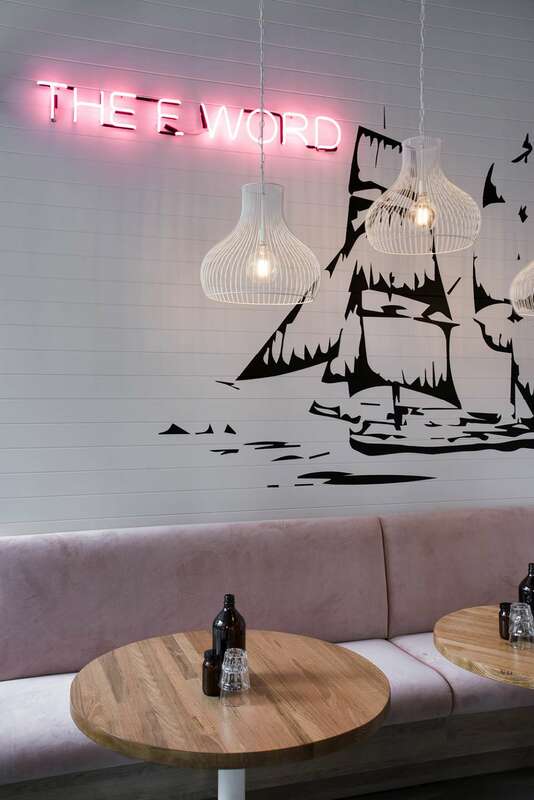 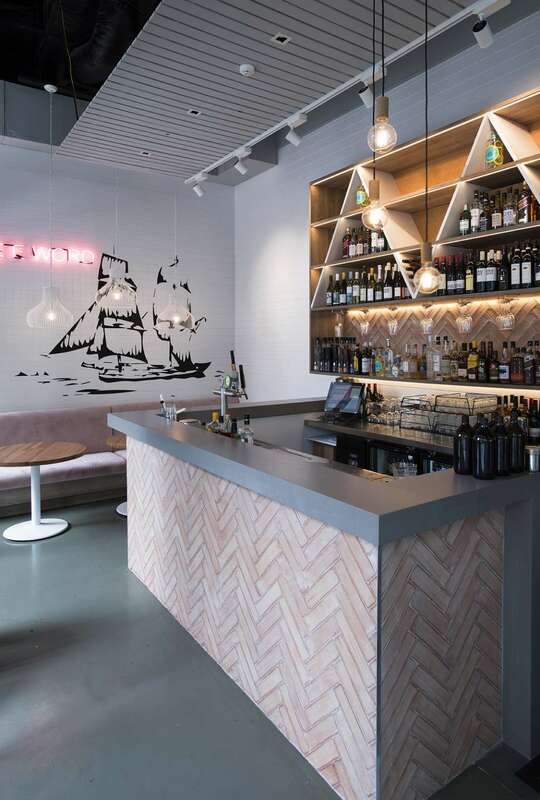 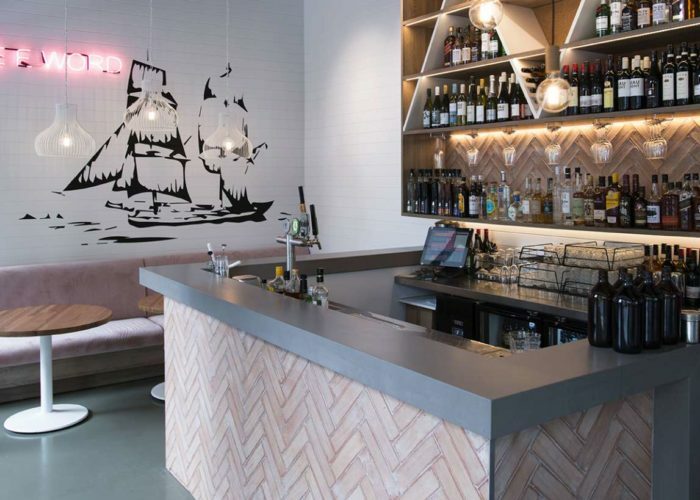 Featuring pops of pink neon lettering (‘The F. Word’) - sitting above a pink velvet banquette in the lounge, hand glazed emerald green tiles, distinctive Patricia Urquiola triangle breeze blocks, herringbone terracotta tiles, the design emphasises our client’s passion for their work and has created a distinctive living and dining area. 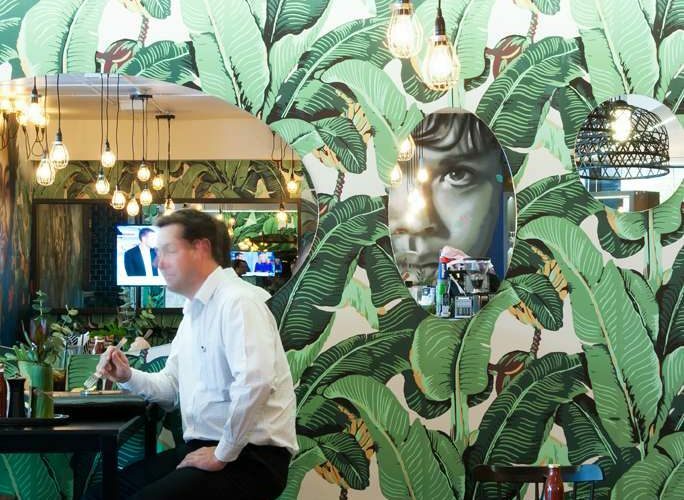 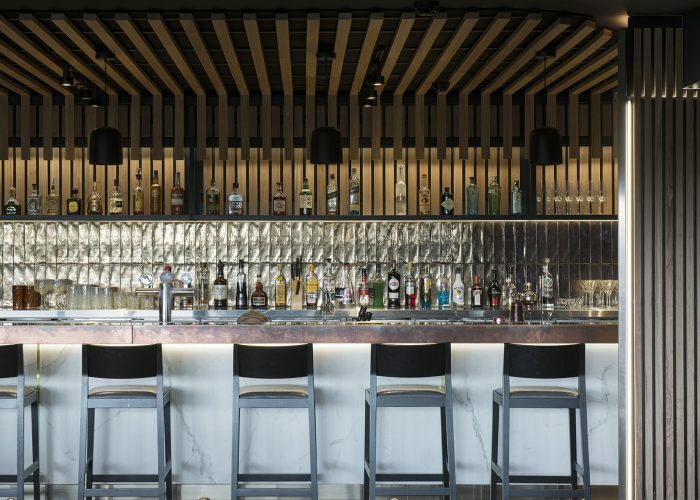 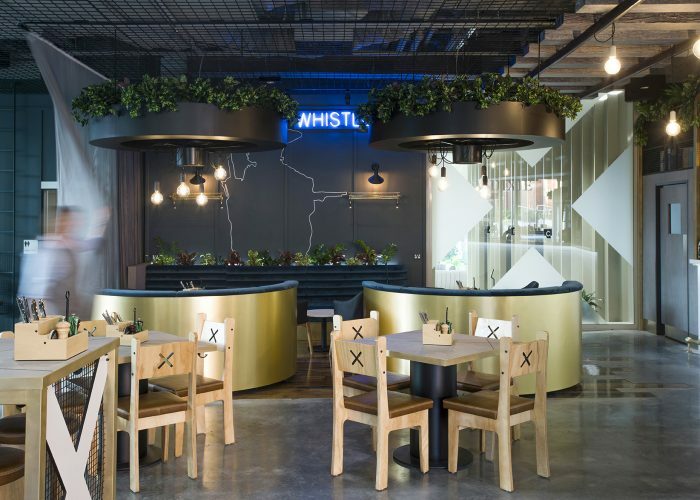 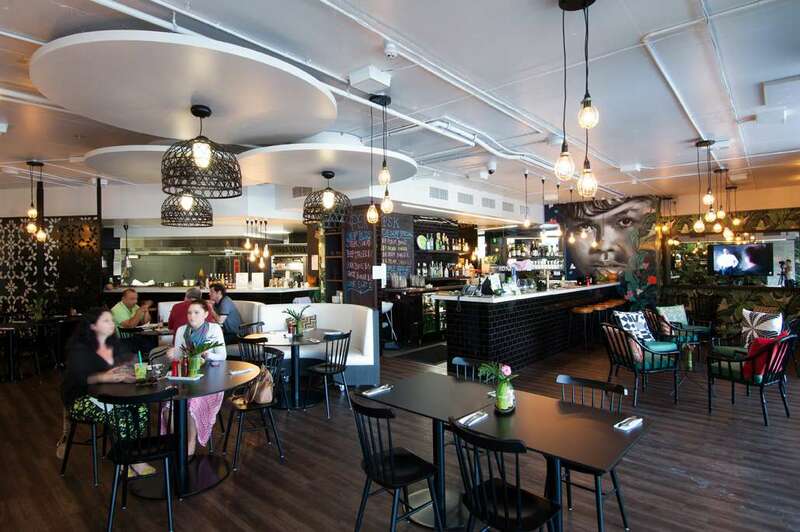 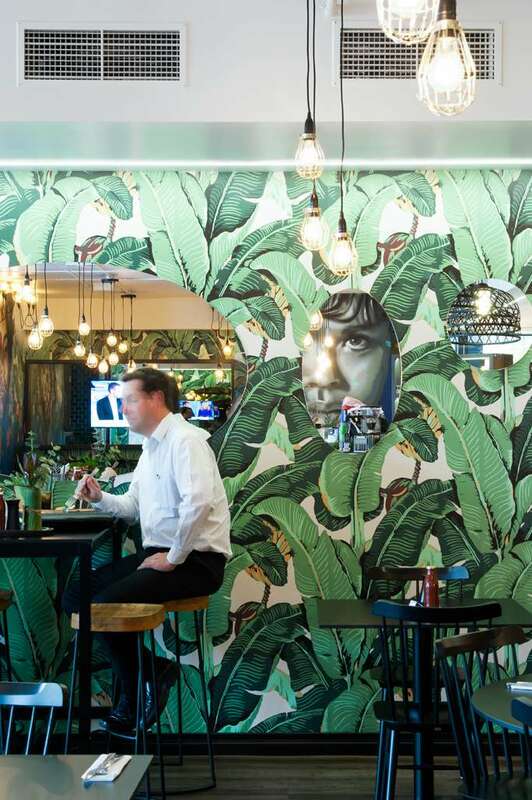 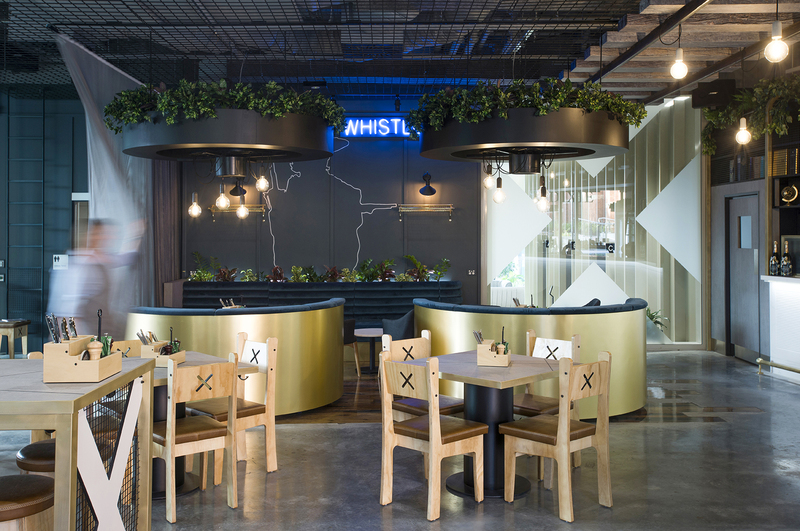 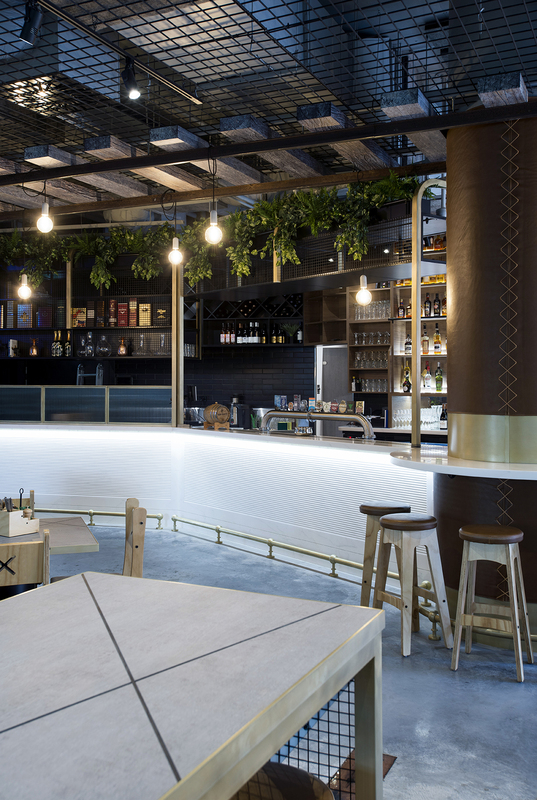 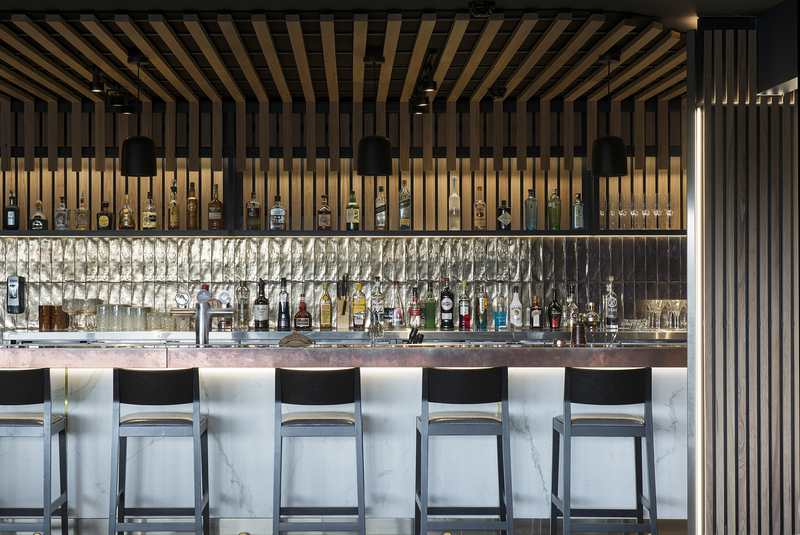 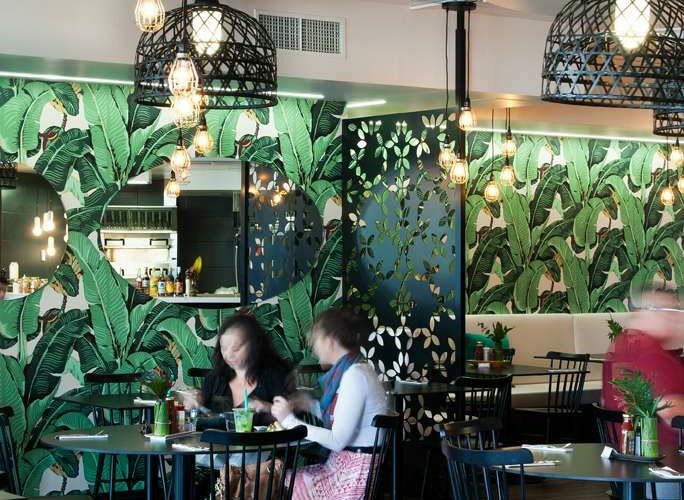 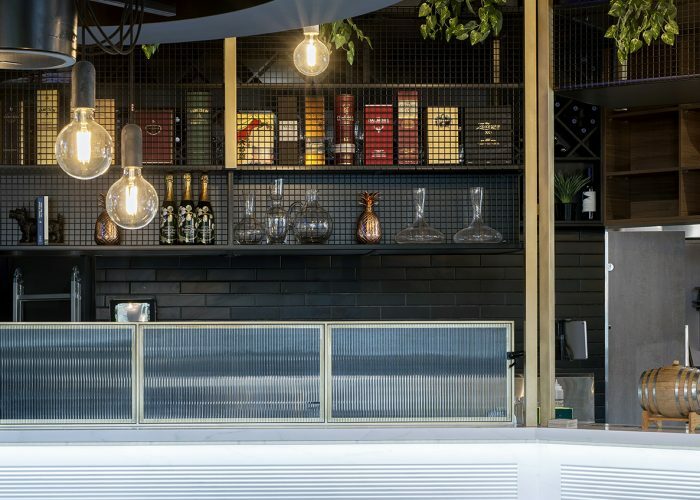 This vibrant, new restaurant and bar is located in the heart of South Brisbane’s trendy and emerging arts district. 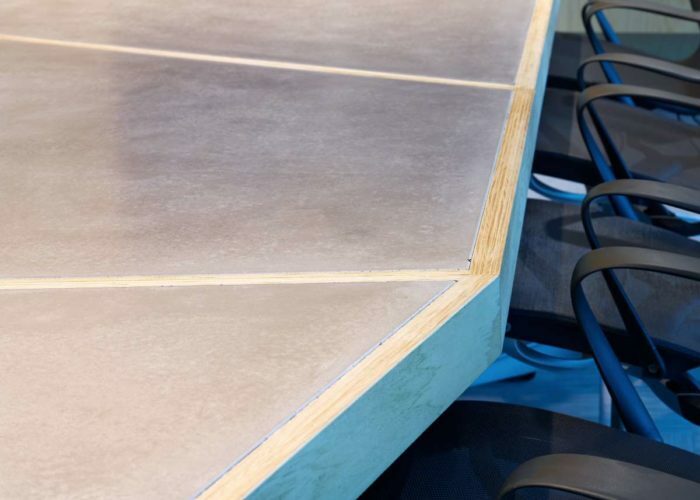 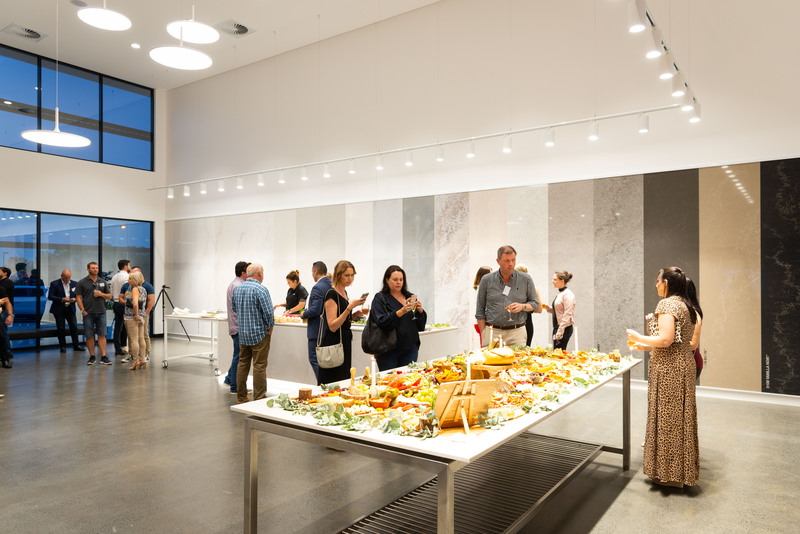 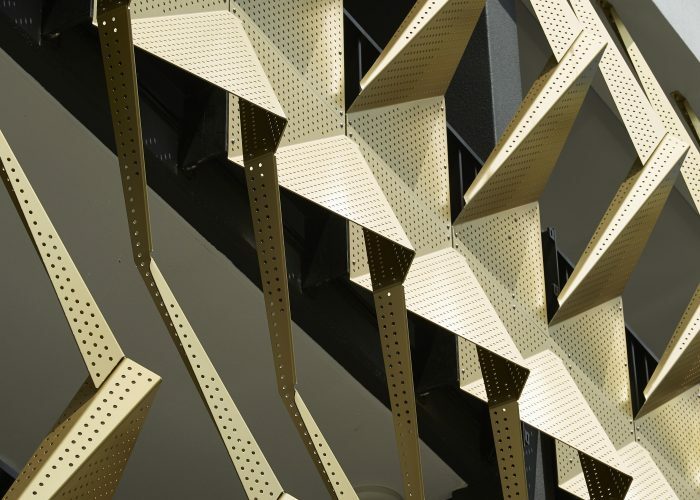 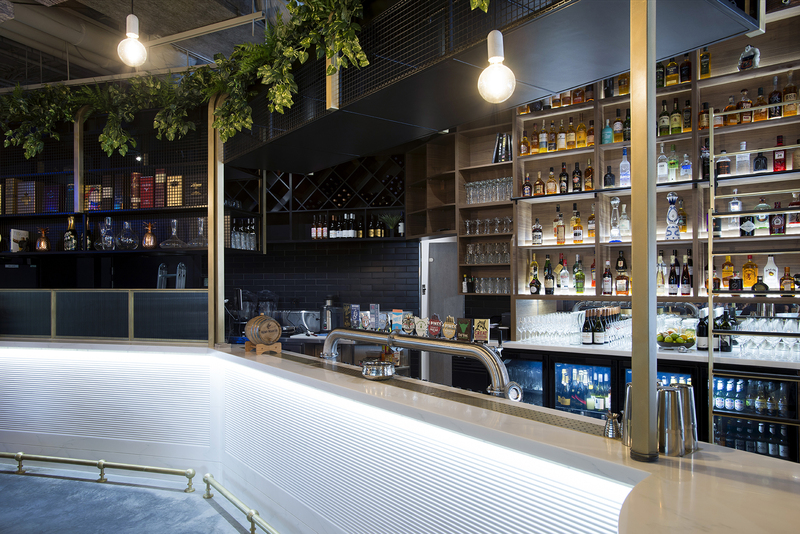 We were tasked with designing a flexible yet welcoming and engaging venue. 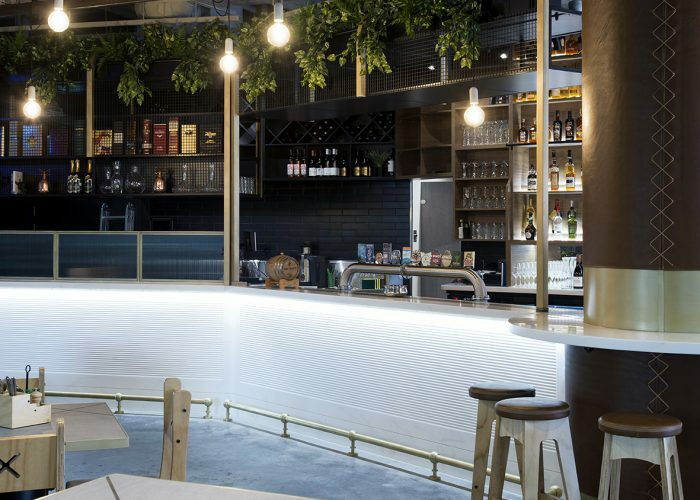 This vibrant, new restaurant and bar is located in the heart of South Brisbane’s trendy and emerging arts district. 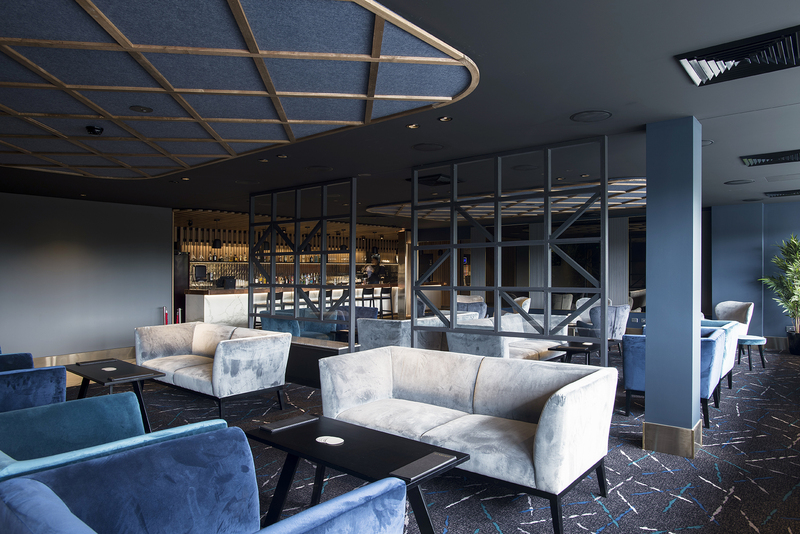 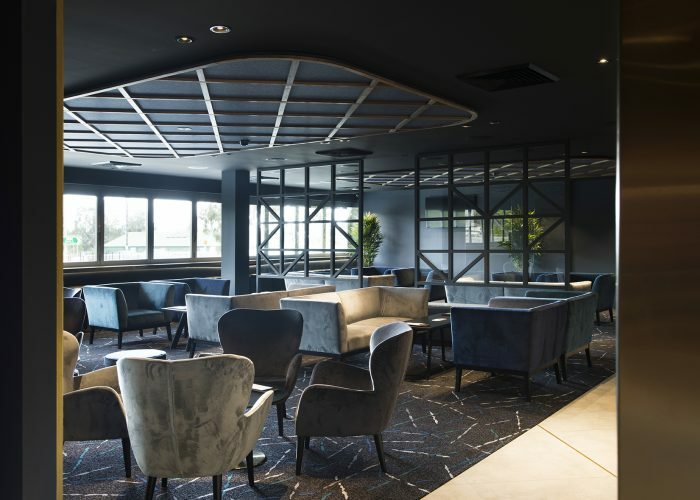 We were was tasked with designing a flexible yet welcoming and engaging venue that would accommodate breakfast, lunch and dinner as well as casual cocktails and privately hosted events. 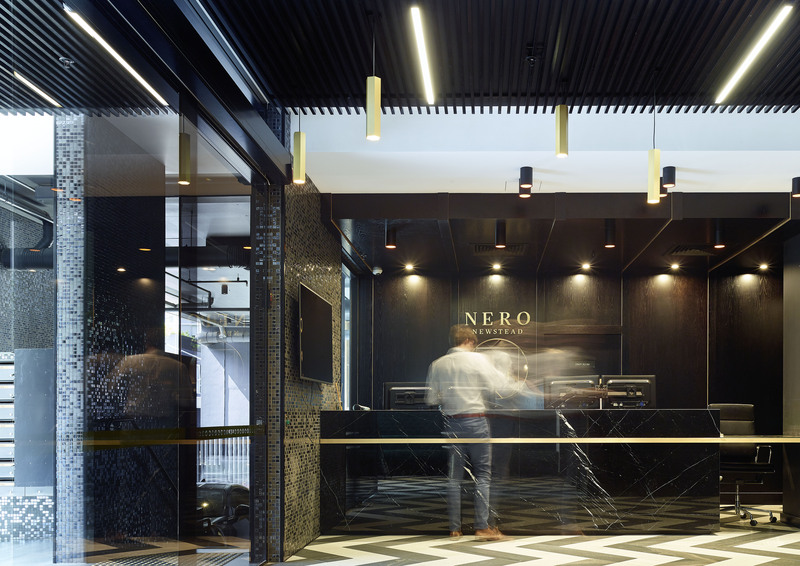 In such a pedestrian-oriented area, it was necessary for the design to draw people in to compete in an already bustling area. 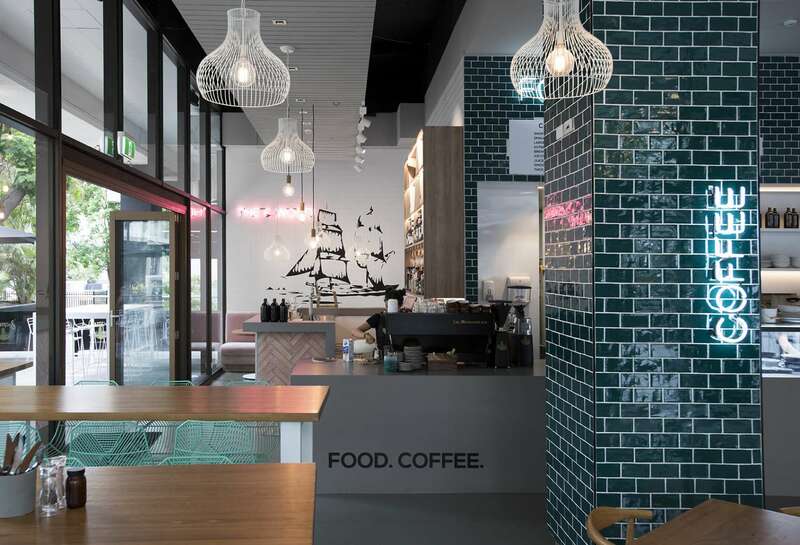 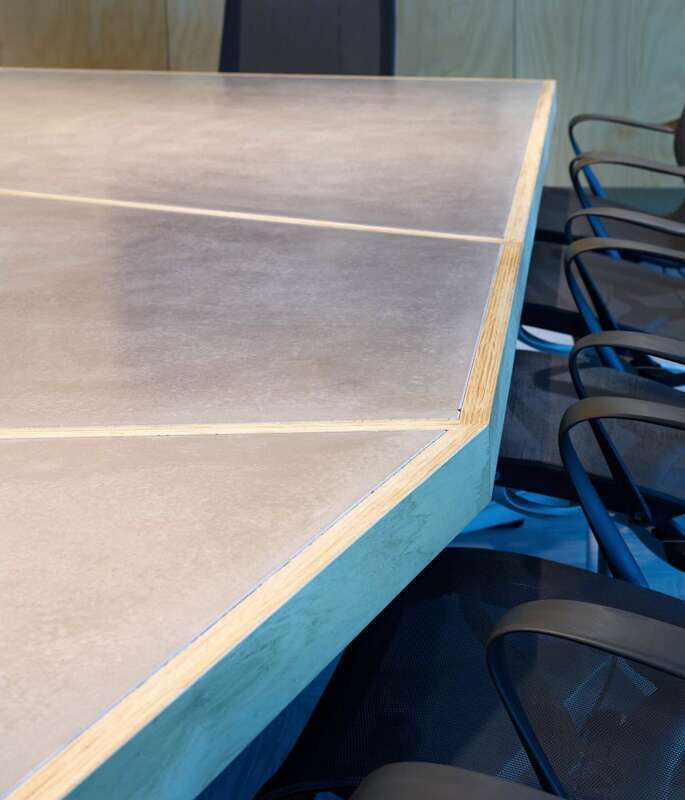 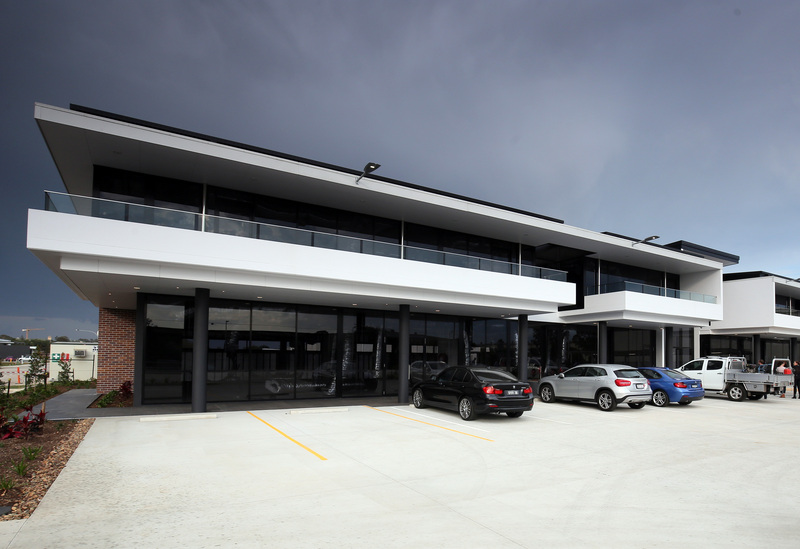 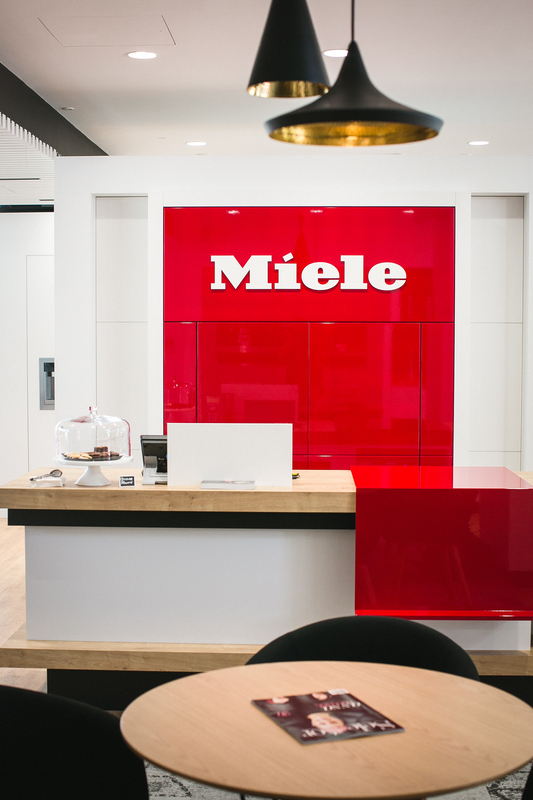 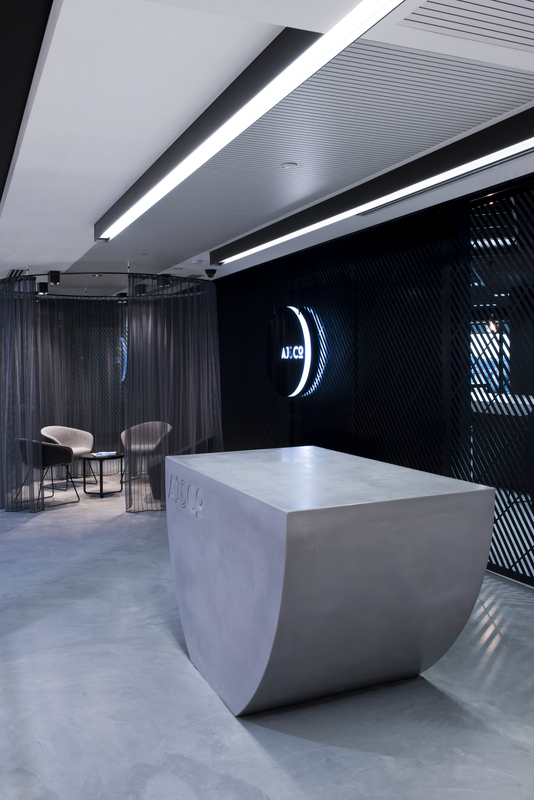 The fit-out includes approximately 400sqm of interior space as well as a small exterior seating area. 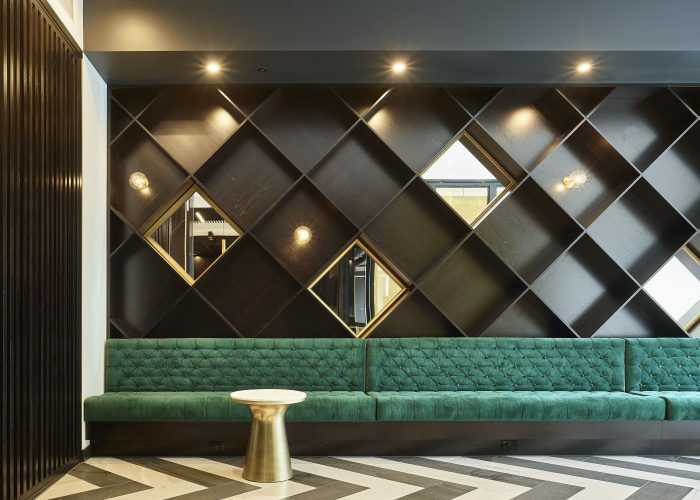 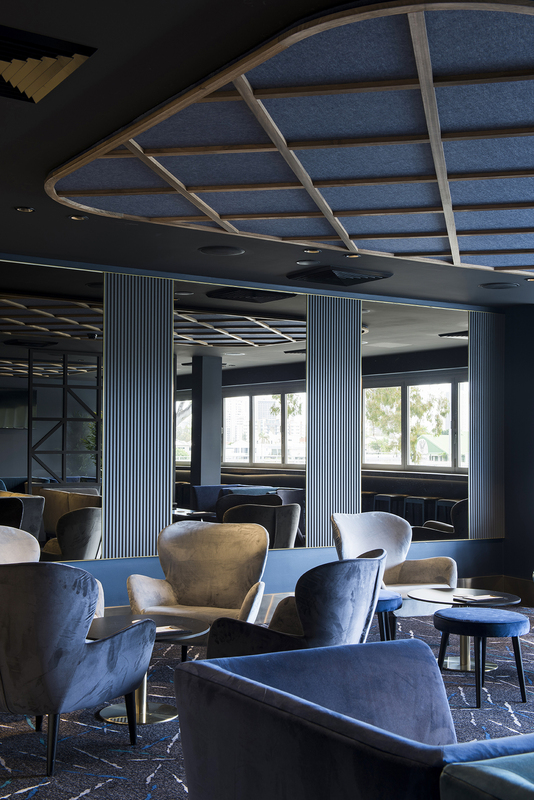 Inside, the designers created a dazzling new bar and lounge, full-service dining area, private event space, back of house kitchen, and all required amenities. 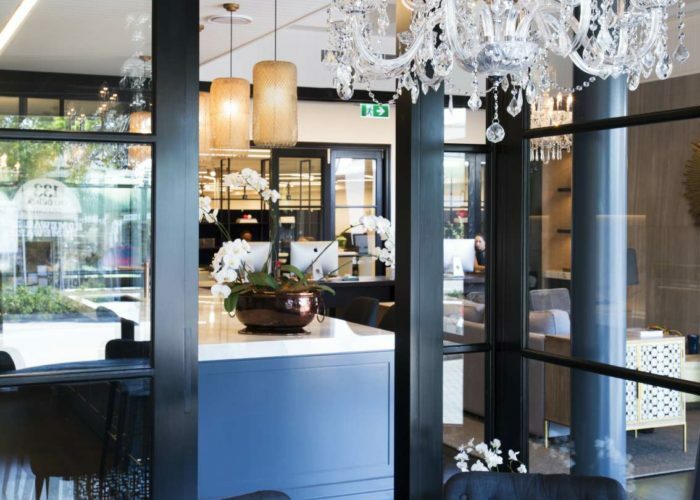 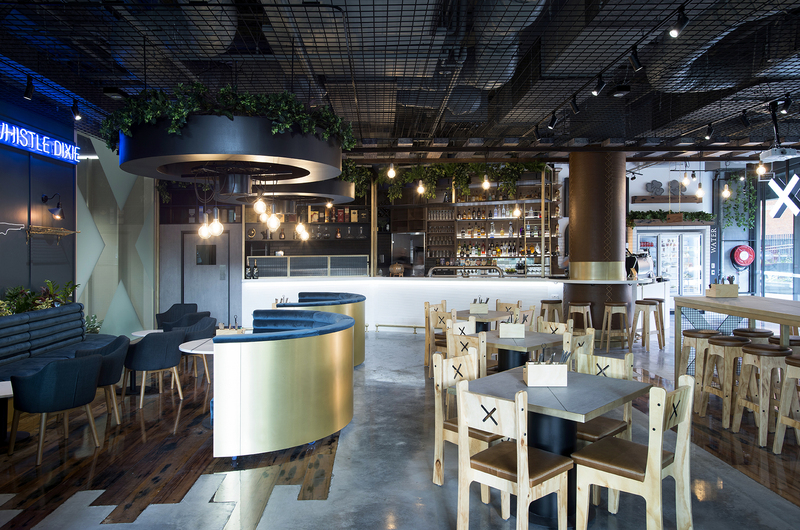 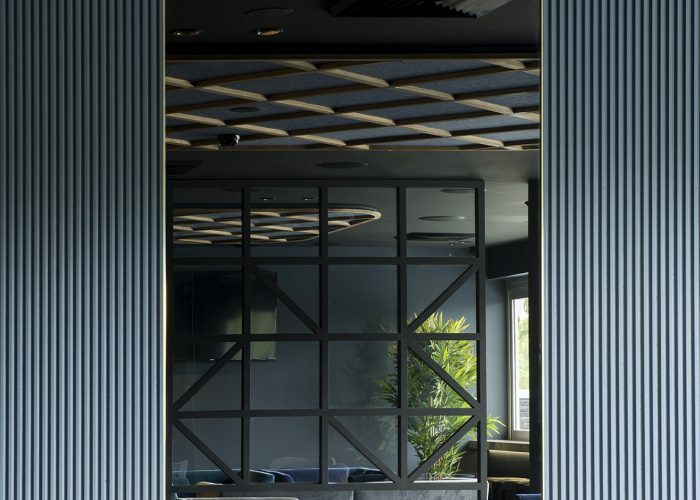 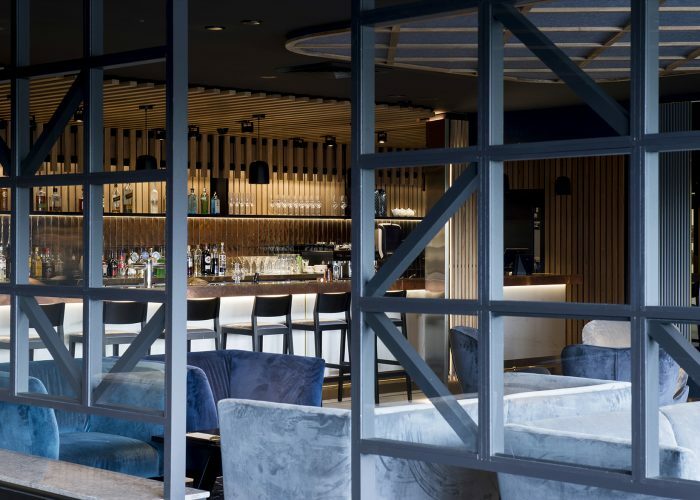 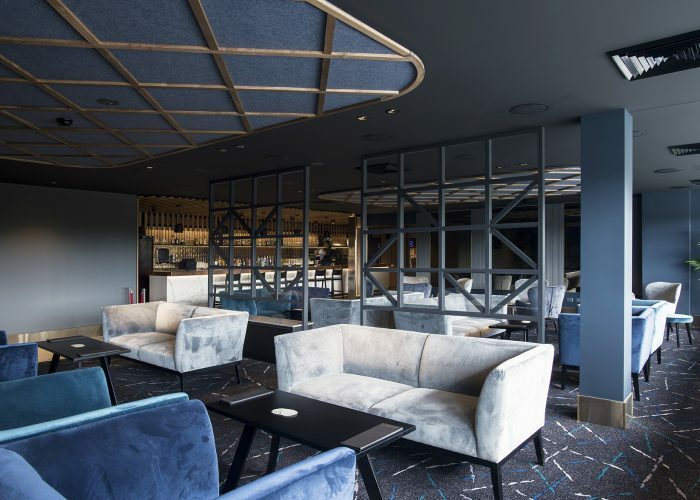 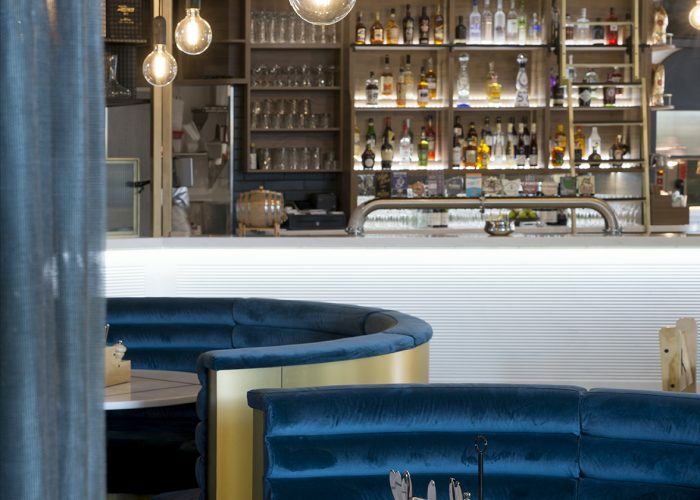 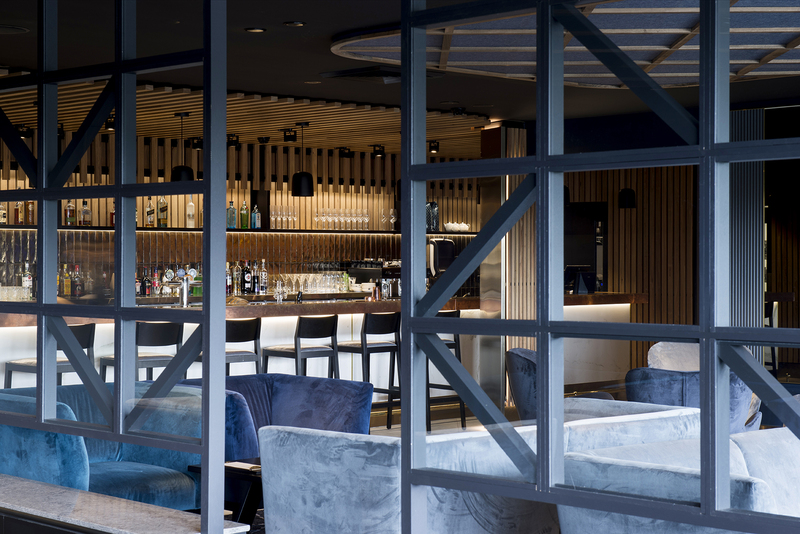 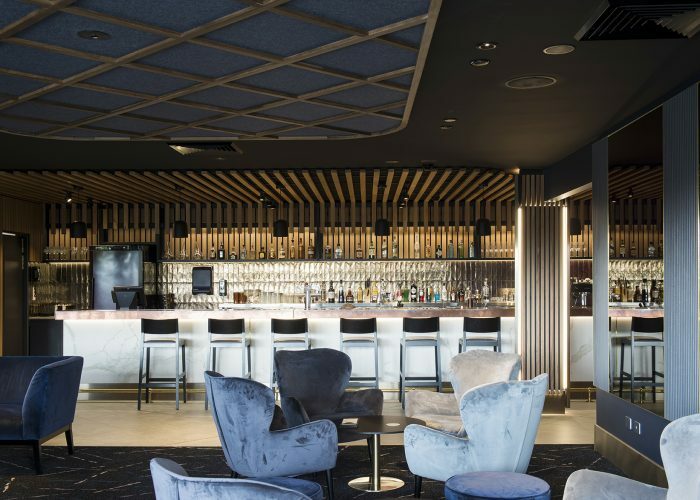 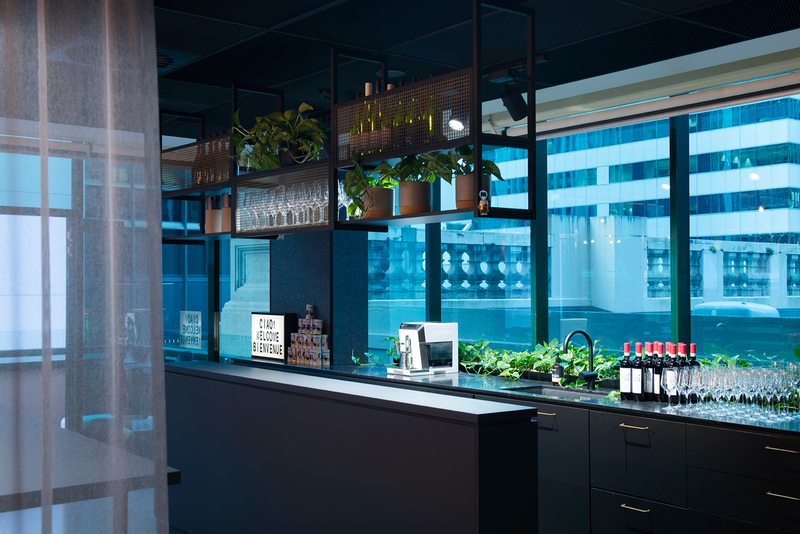 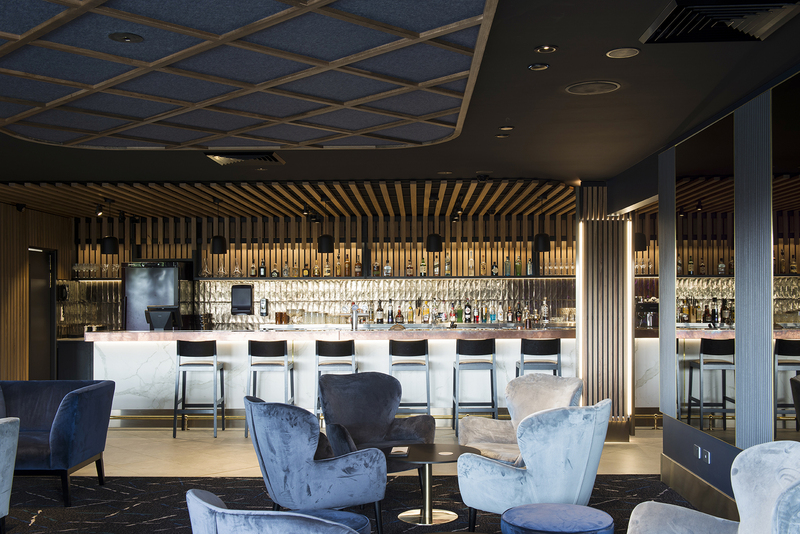 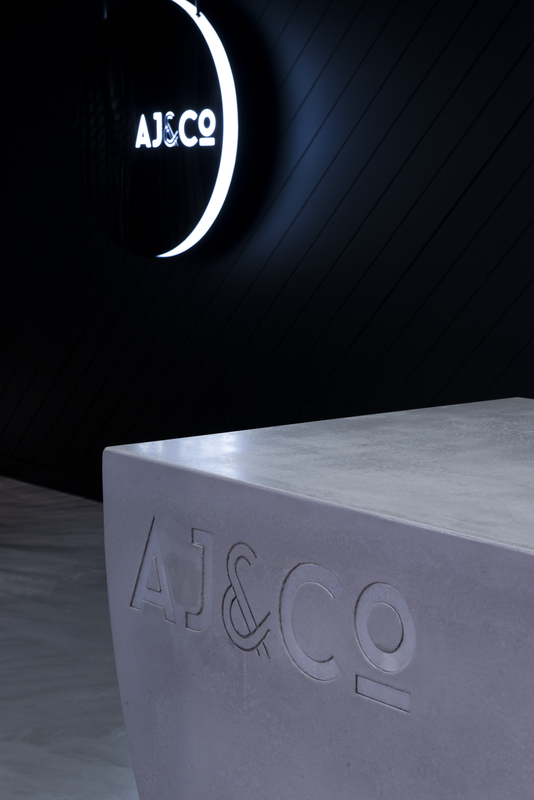 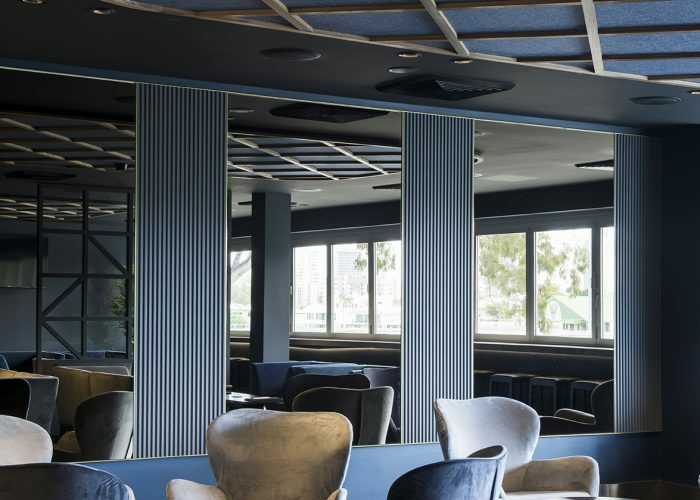 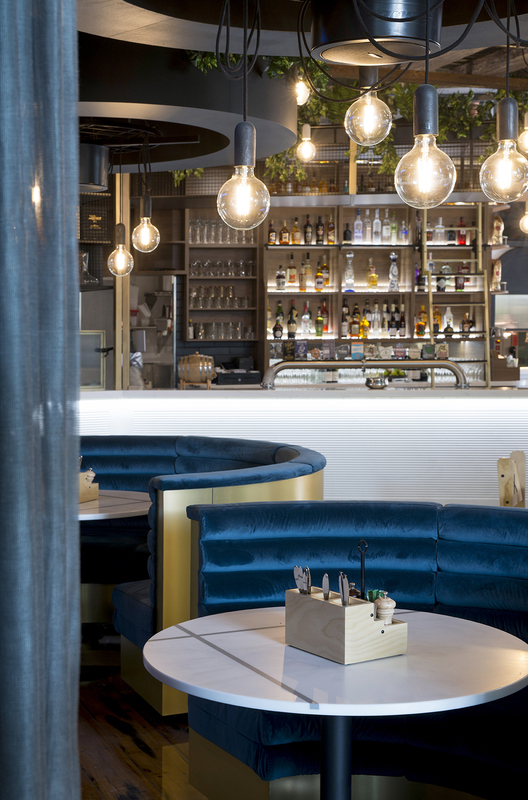 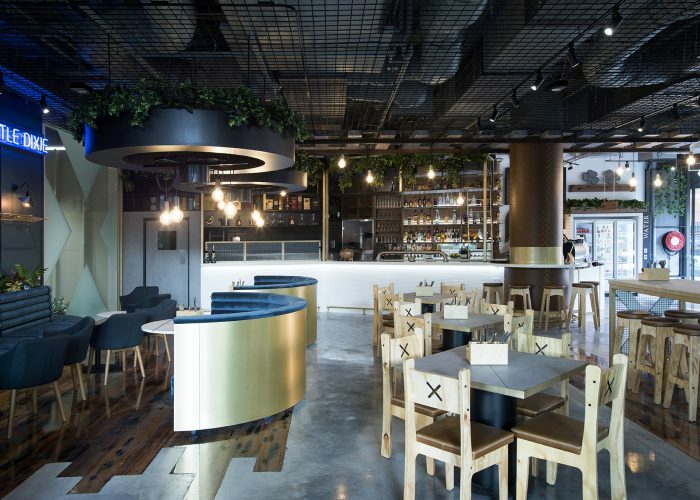 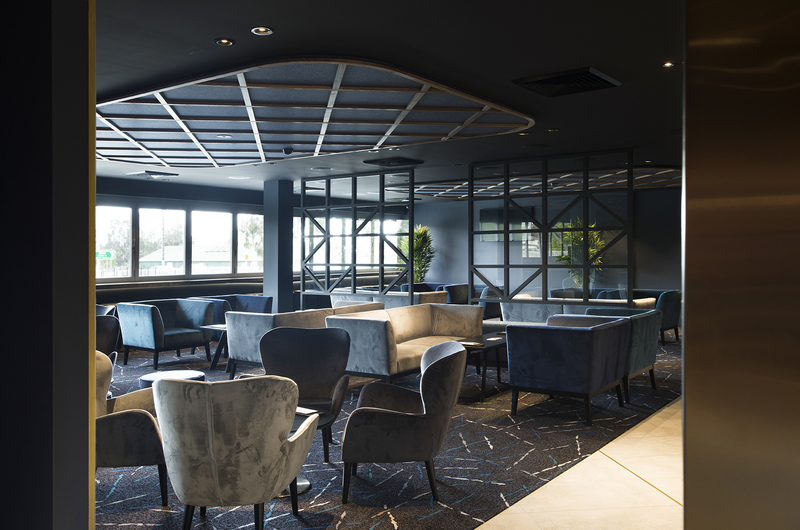 The interiors aim to create an engaging and non-pretentious venue to enjoy the modern Australian cuisine and unique cocktails while also encouraging visitors to admire and enjoy their surroundings, creating a truly unique and dynamic dining experience. 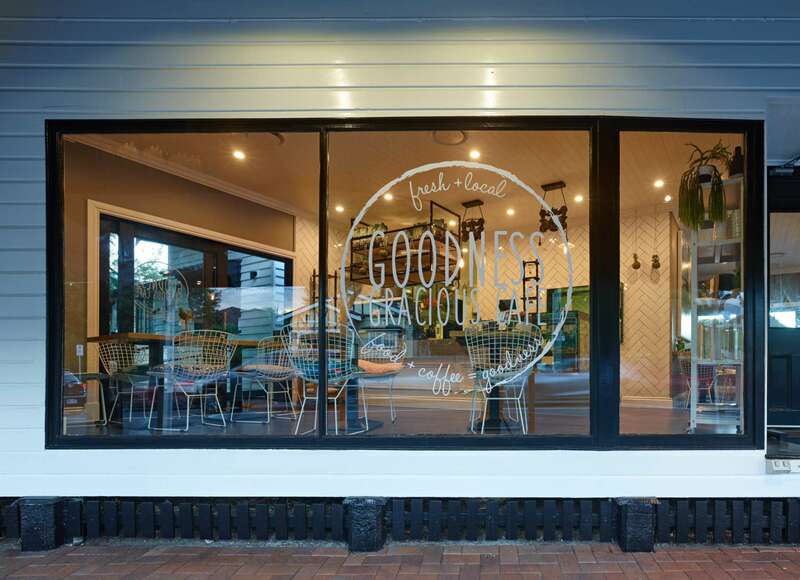 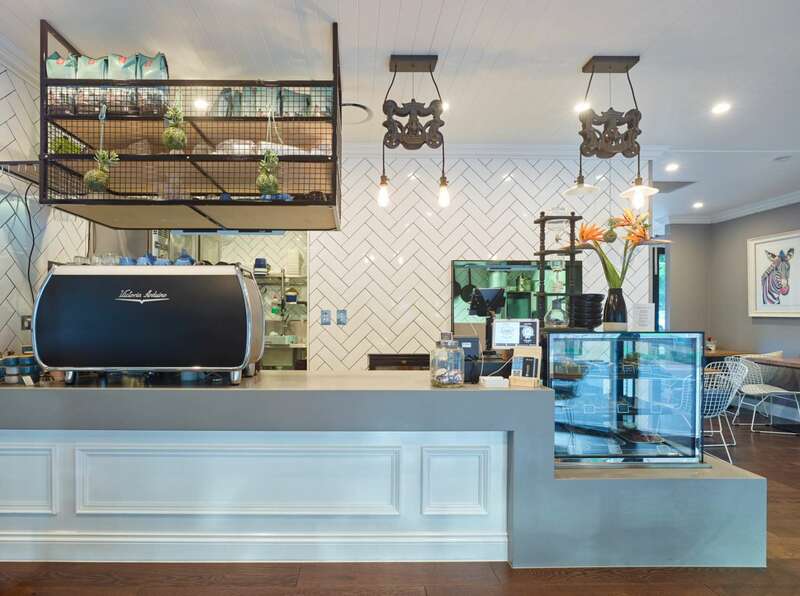 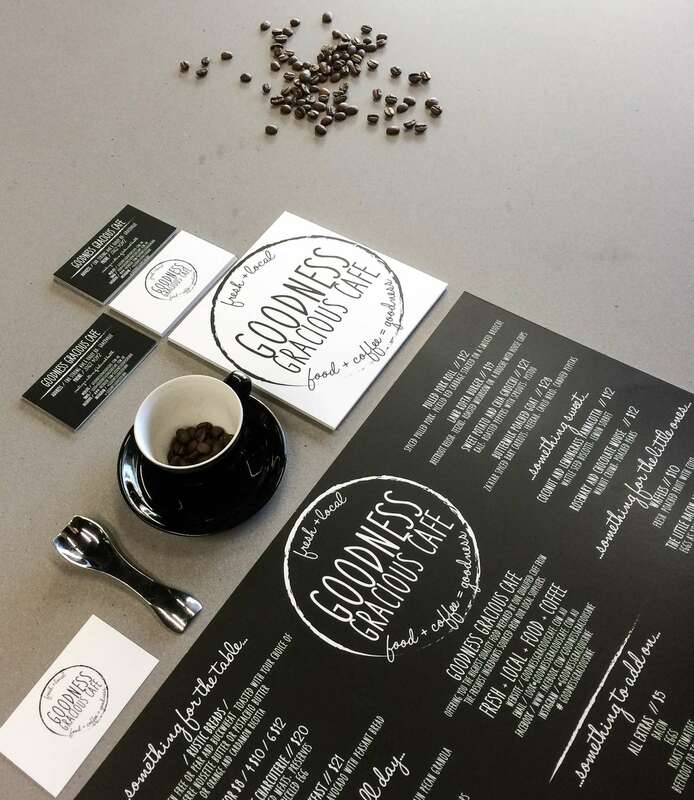 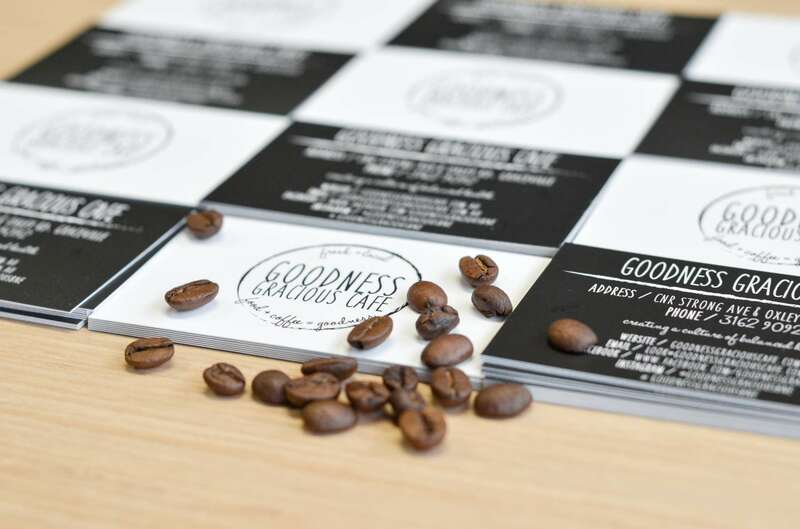 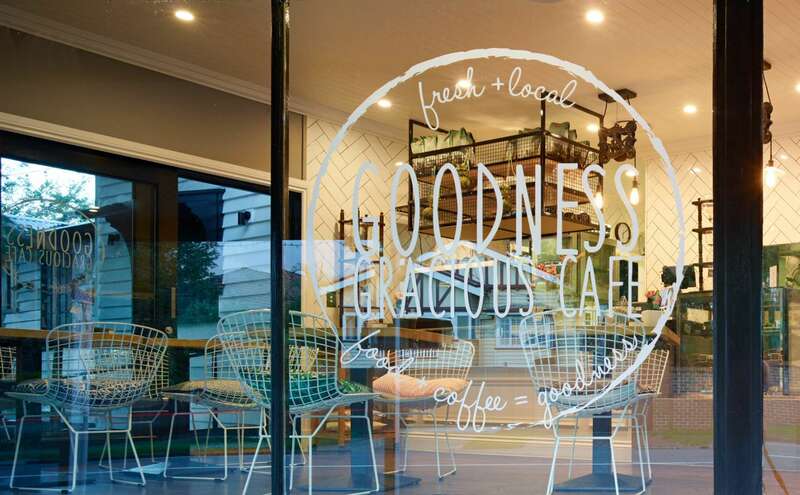 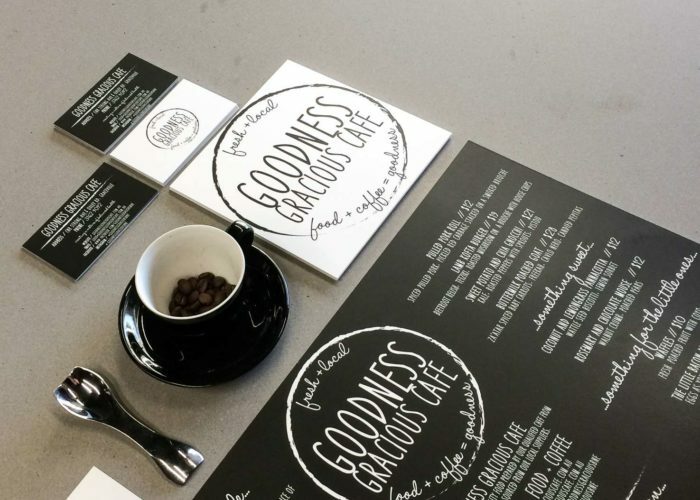 Goodness Gracious Café is a beautiful boutique café in the quiet and leafy suburban setting of Graceville. 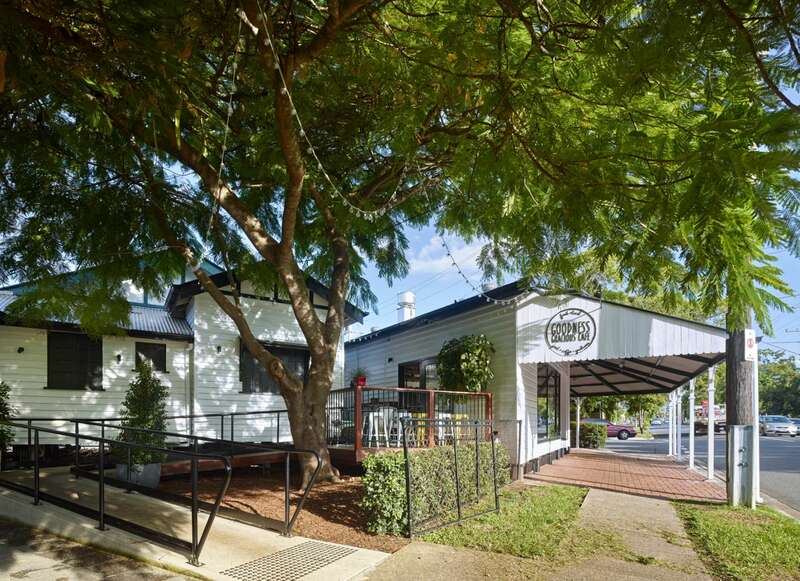 The existing building was originally an old Queenslander style home and then a corner store before being converted into a café. 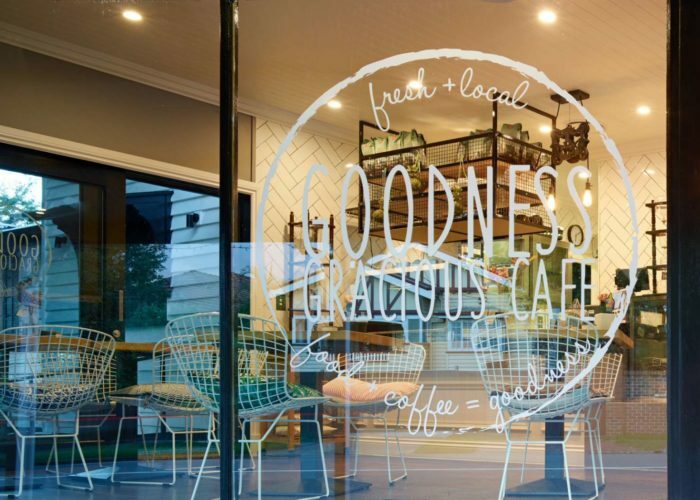 Goodness Gracious Café is a beautiful boutique café in the quiet and leafy suburban setting of Graceville. The existing building was originally an old Queenslander style home and then a corner store before being converted into a café. 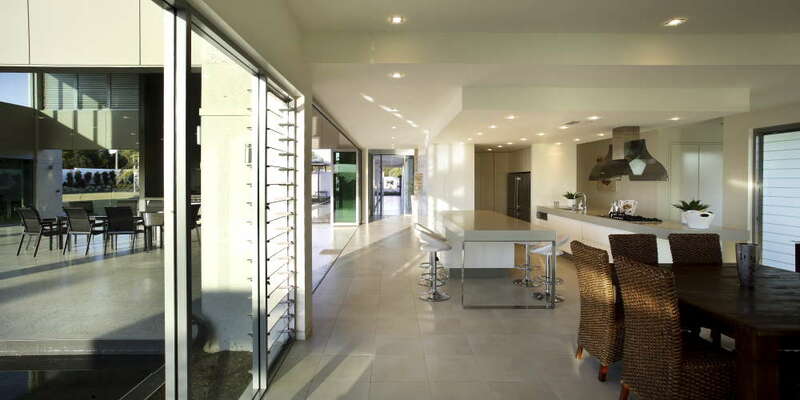 Our clients wanted to create a homely café with the possibly of extending into the neighbouring house in years to come. 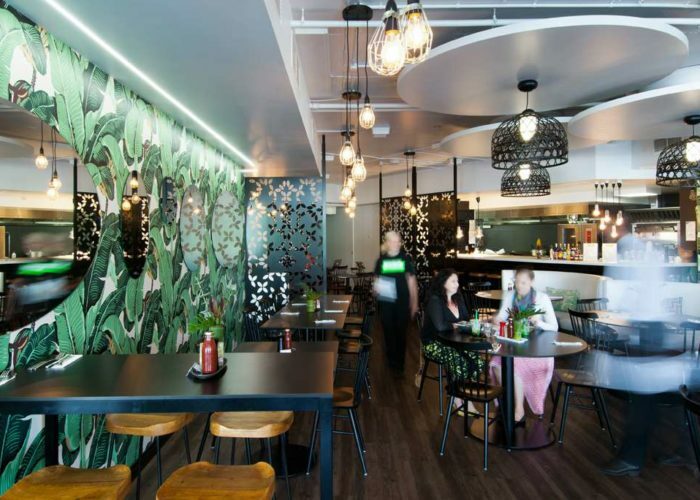 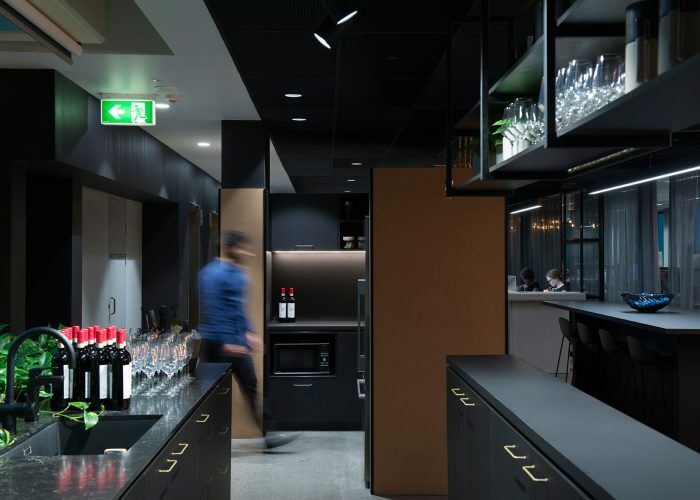 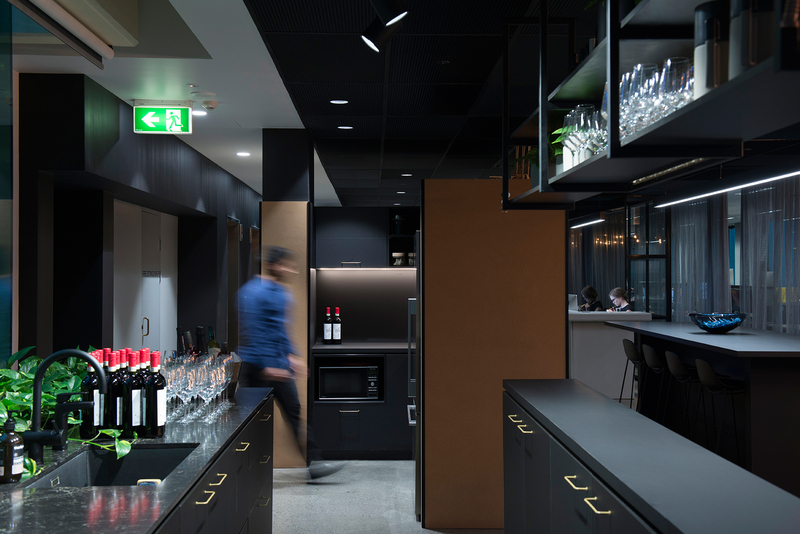 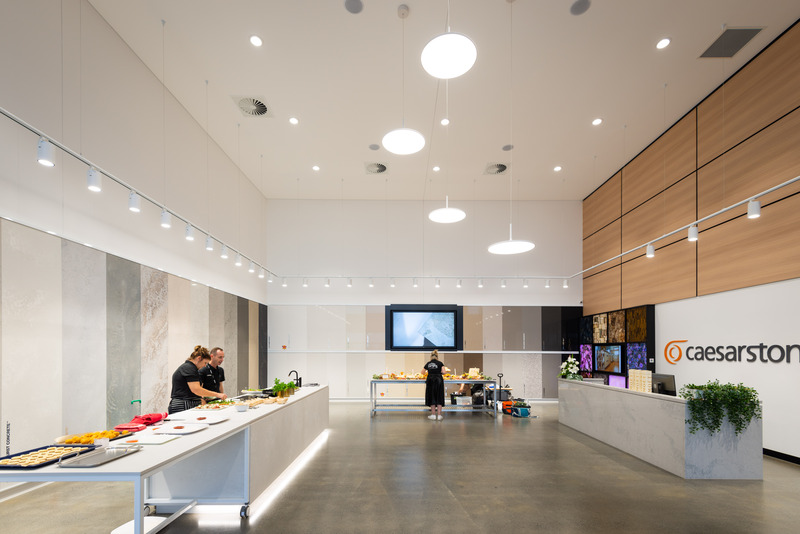 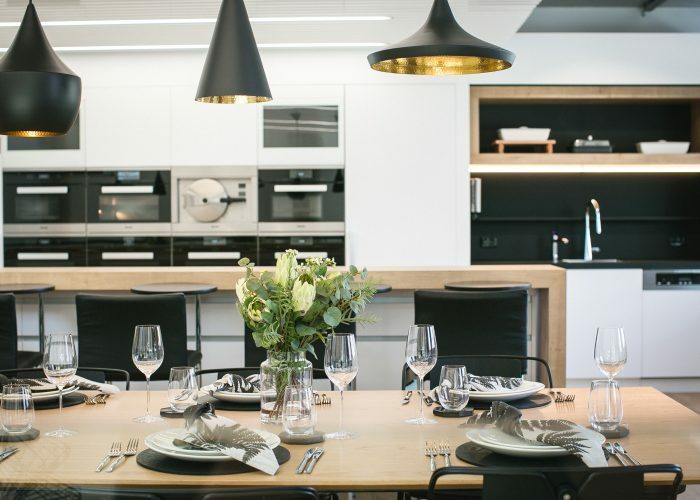 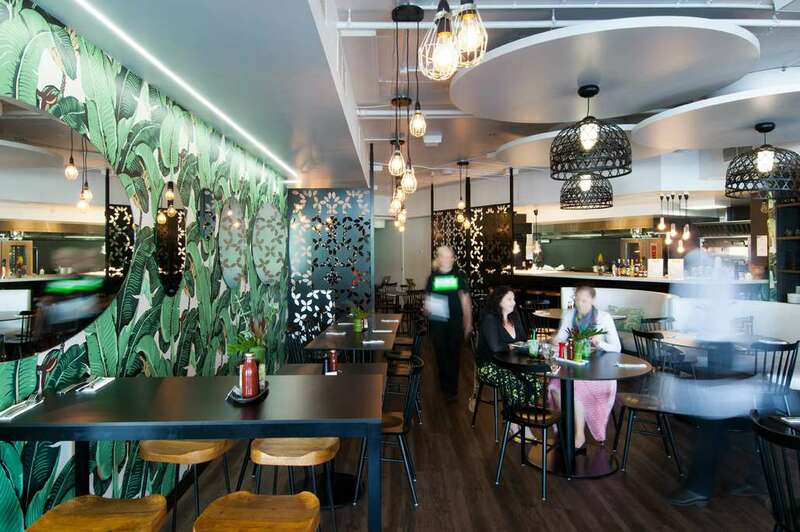 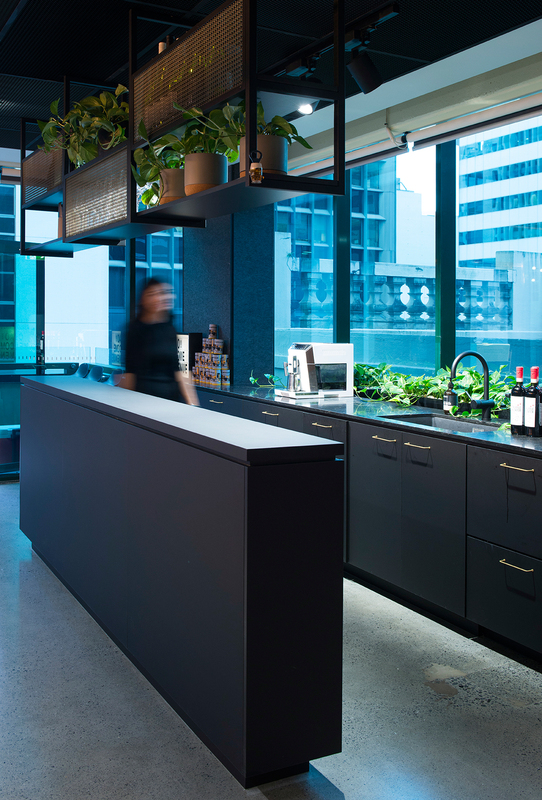 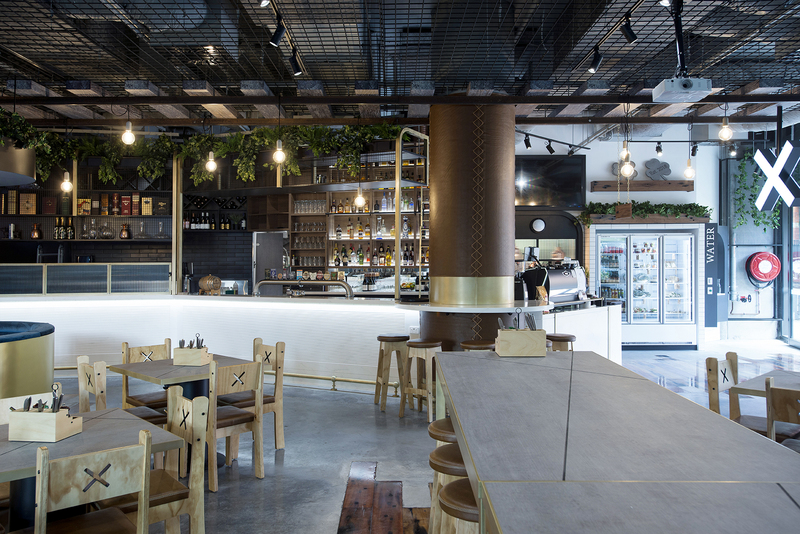 We worked closed with our client and also Brisbane Commercial Kitchens to achieve the most efficient layout possible in a small space, as the menu and food produced in this kitchen was very important. 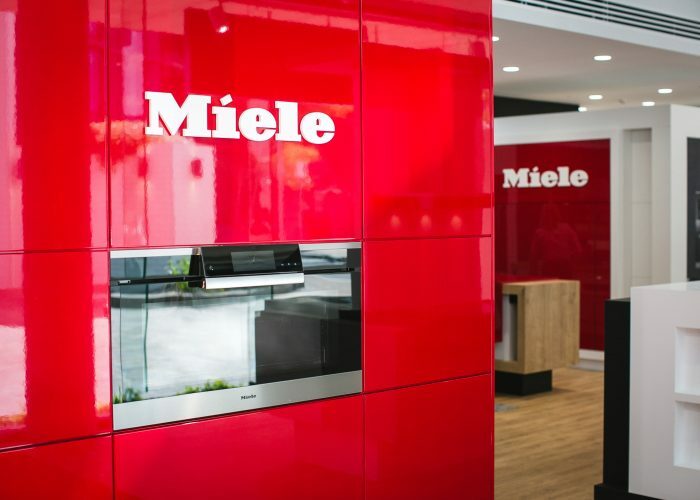 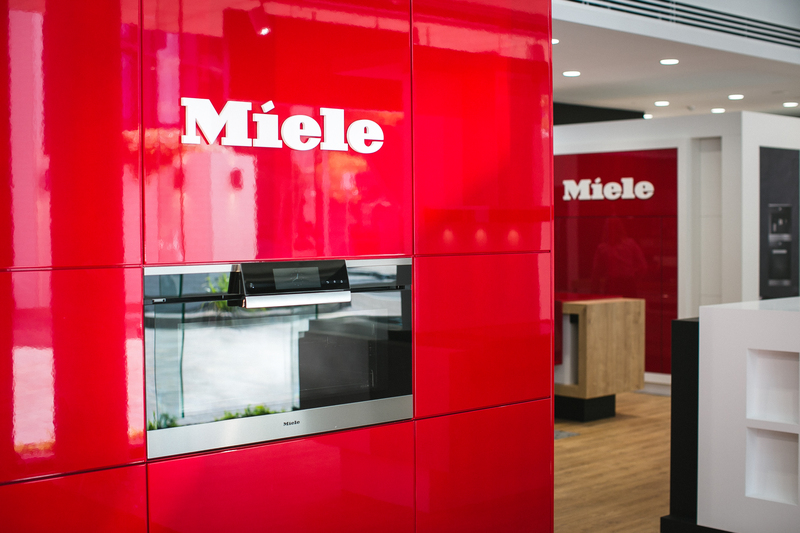 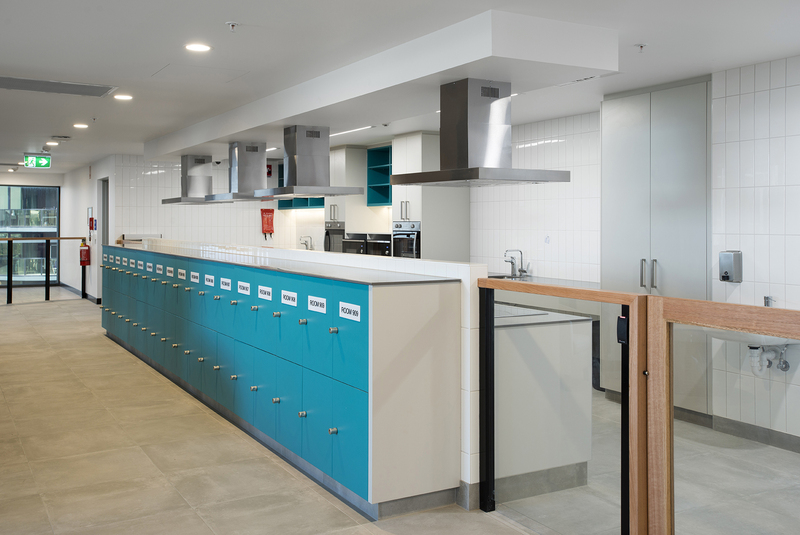 The design and layout of the kitchen was very important to not only cater for the patrons now, however with the possibility of catering for a larger space with the future extension in mind. 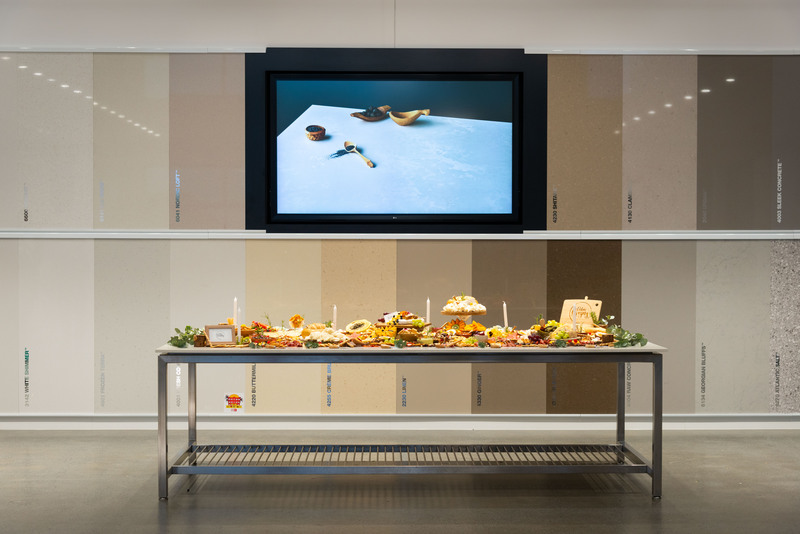 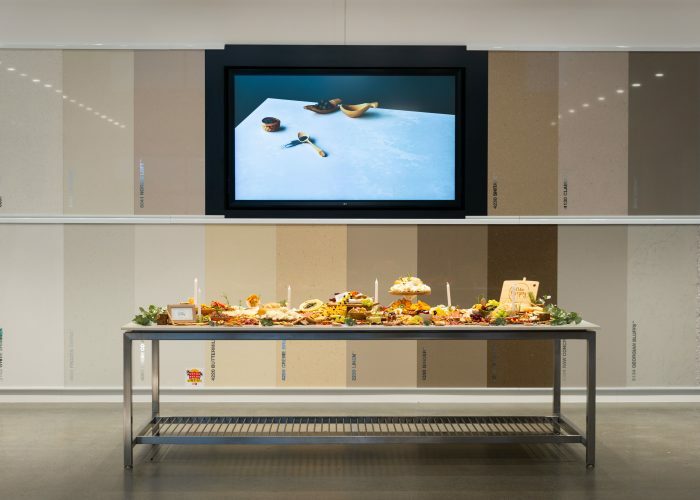 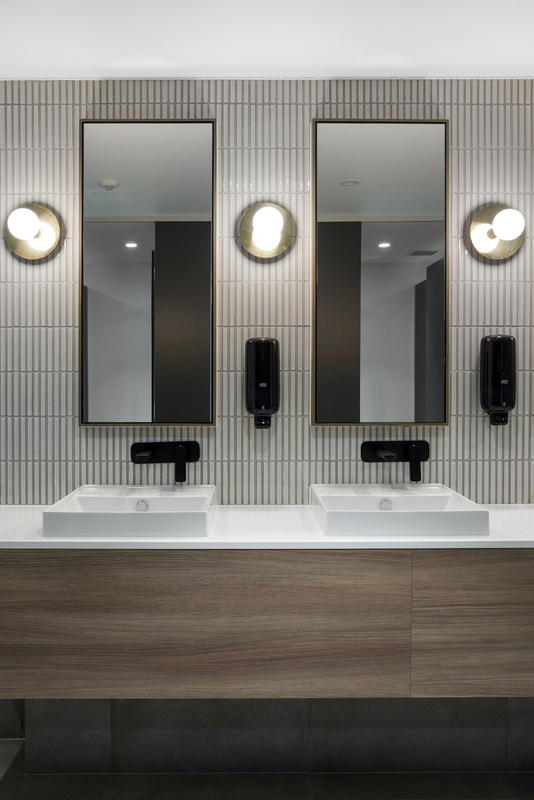 The palette was clean and simple with feature materials and finishes. 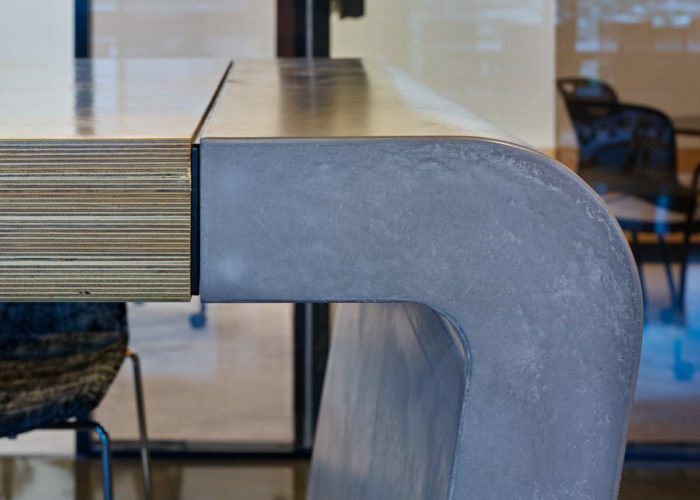 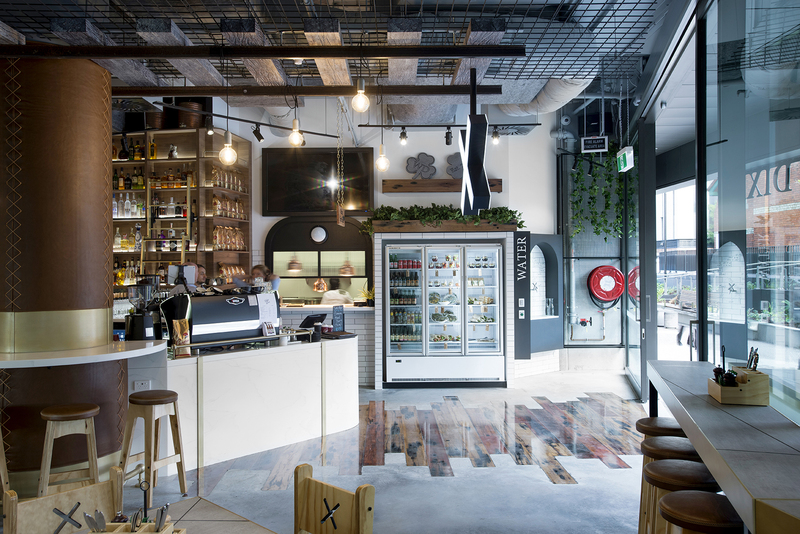 Rustic finishes including warm timber floorboards and a concrete look counter benchtop provide texture and provide a sense of familiarity. 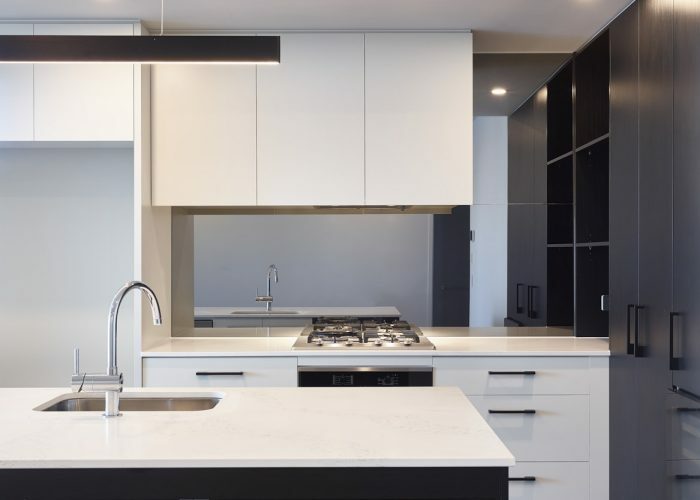 A simple white gloss subway tile was laid on a 45-degree angle to create an elegant look. 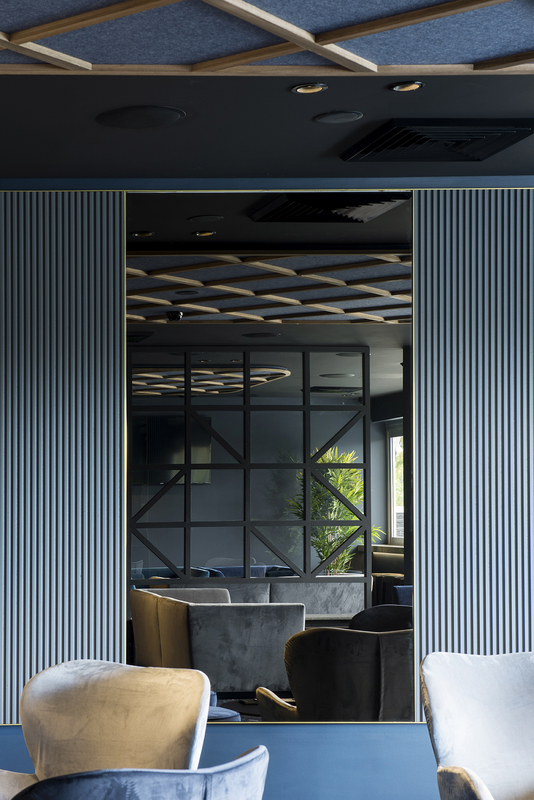 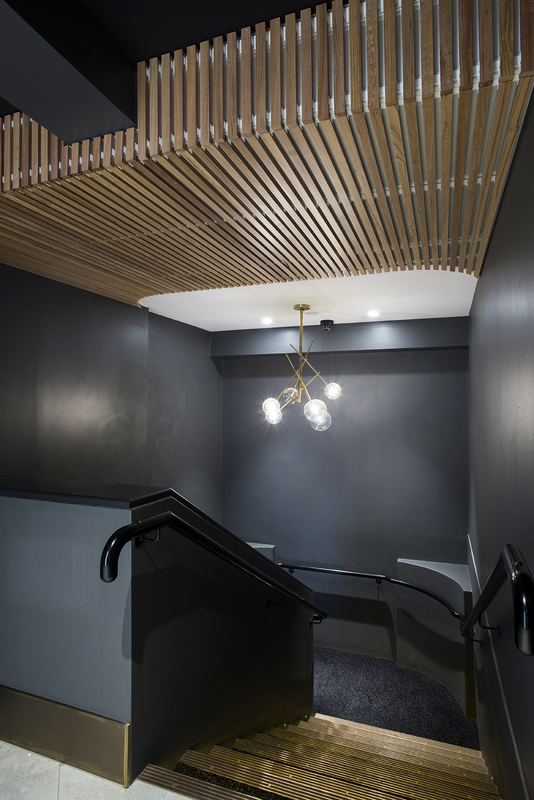 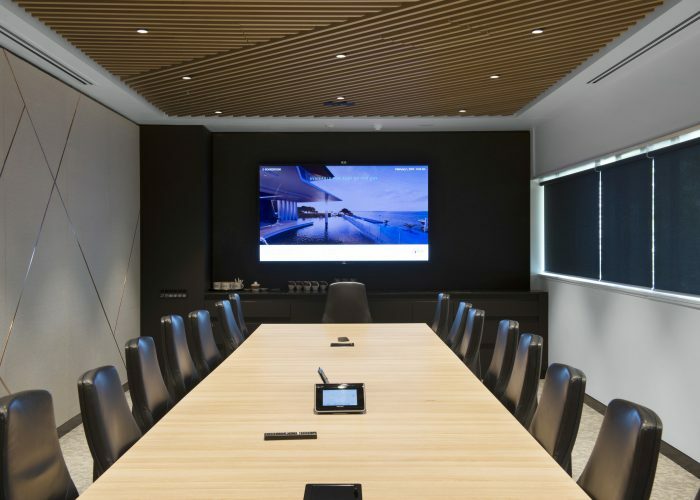 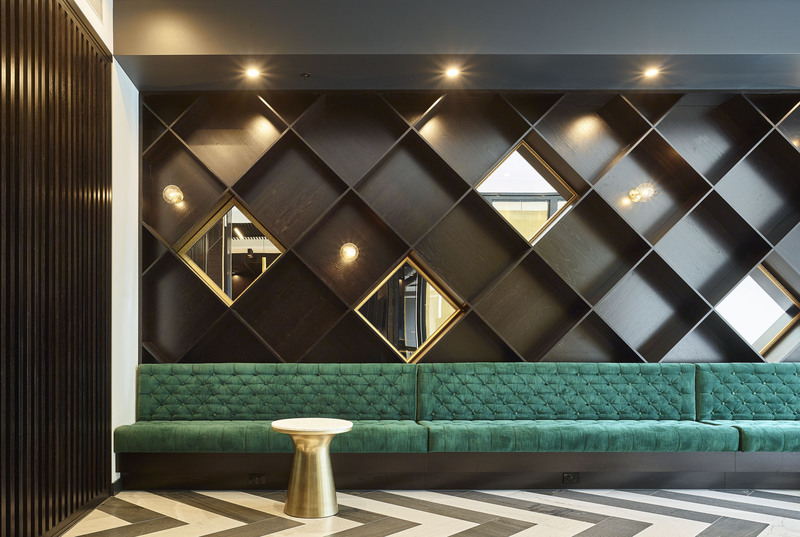 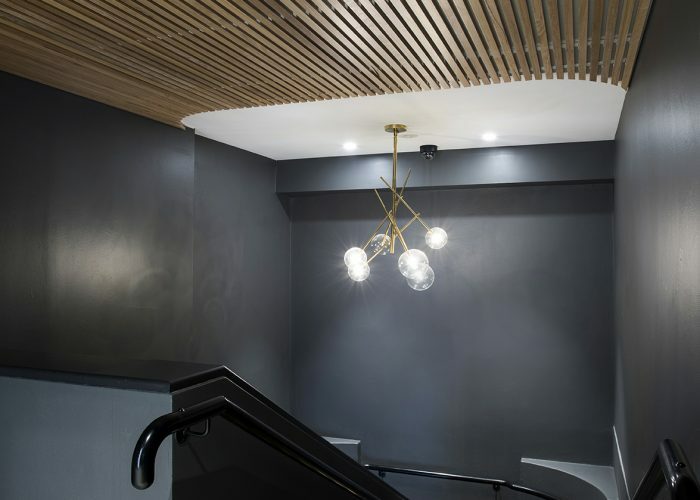 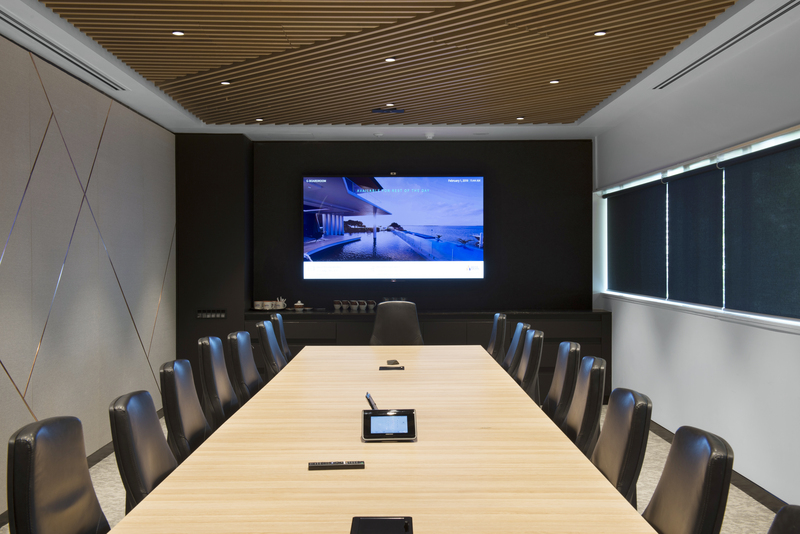 The white tongue and groove ceiling through-out and feature profile panelling used helped to pay tribute to the style of the original building. 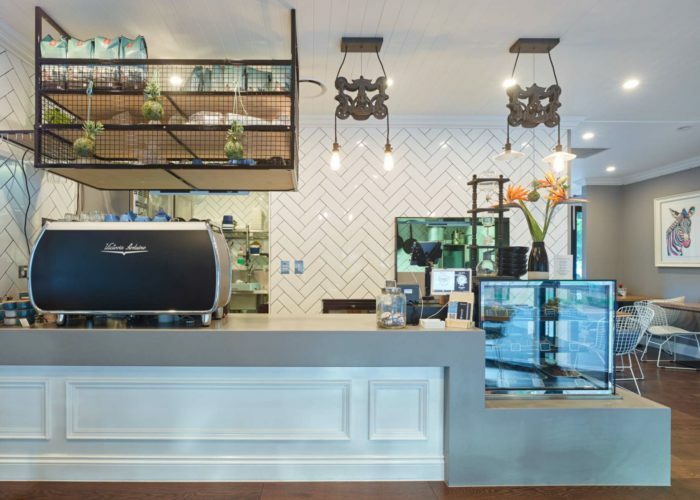 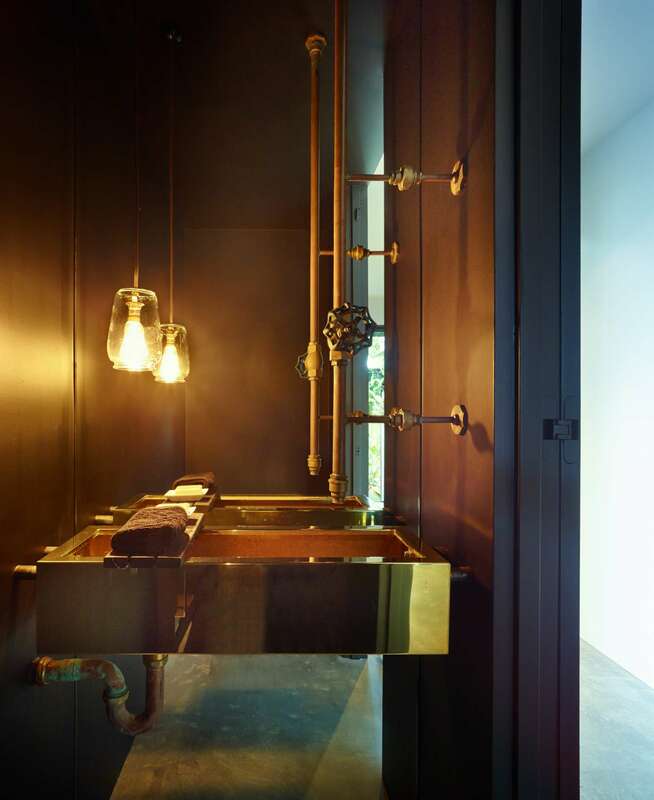 This palette was set off with industrial features like the feature pendant over the counter, coffee machine, and open black ceiling hung shelves. 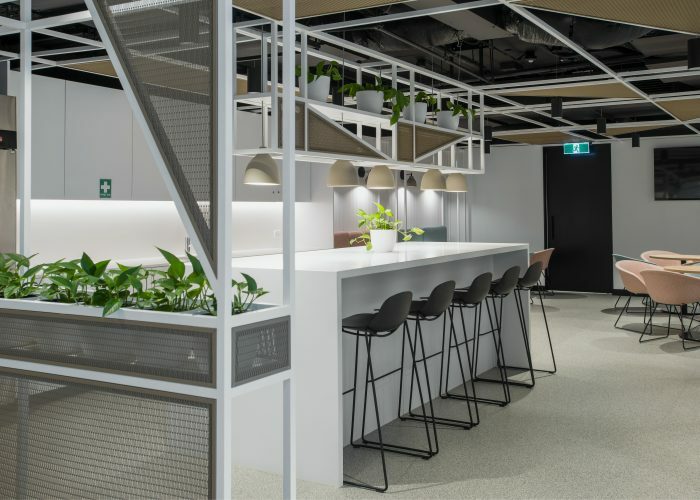 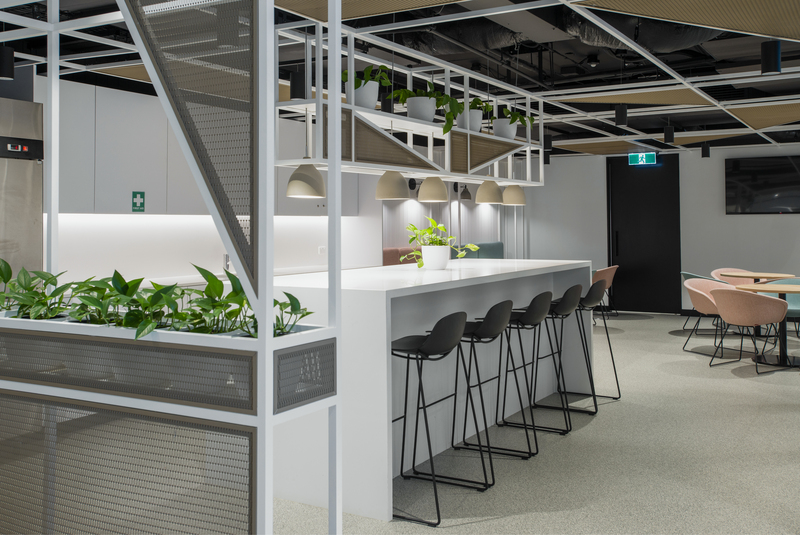 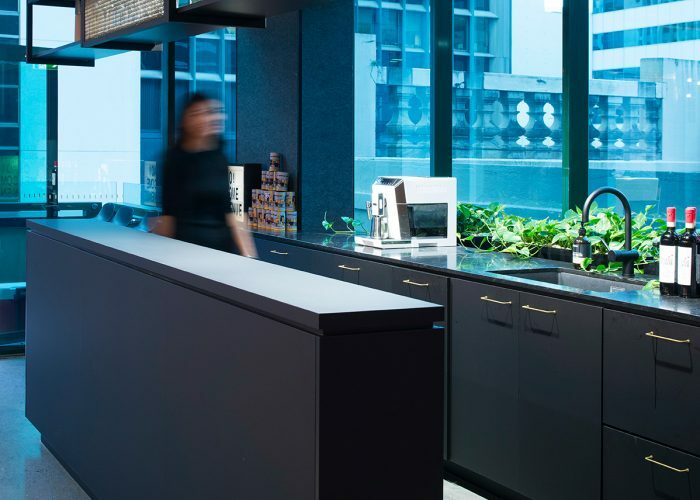 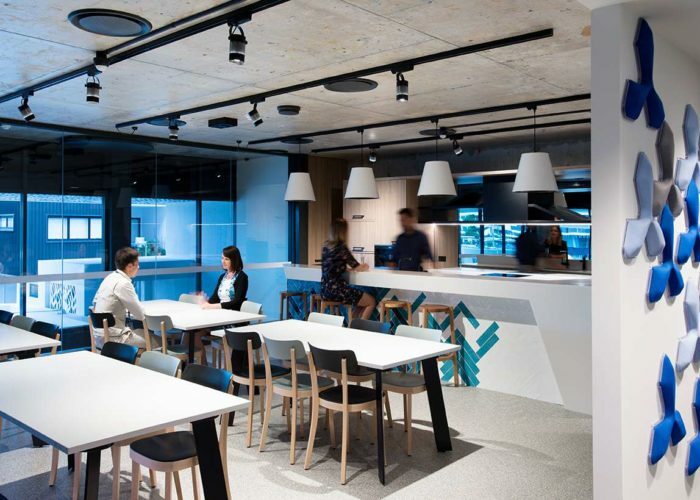 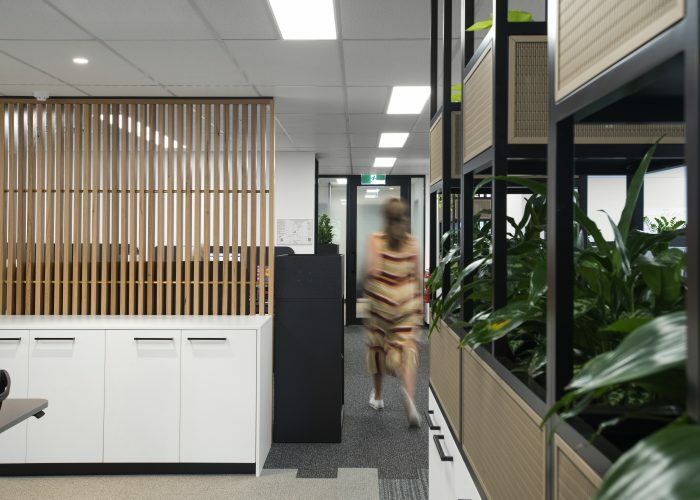 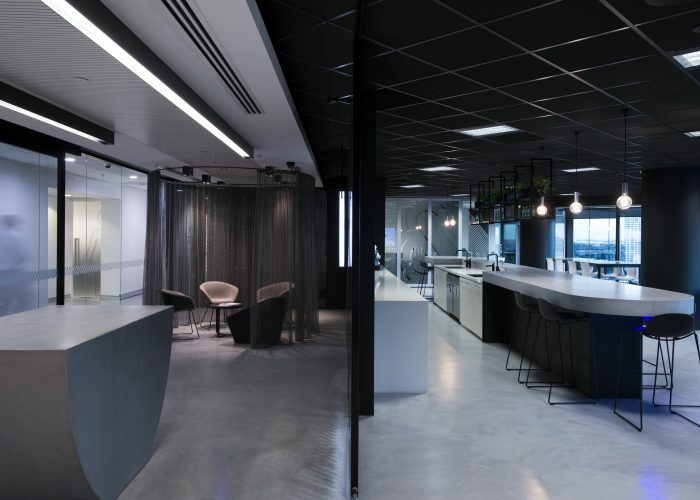 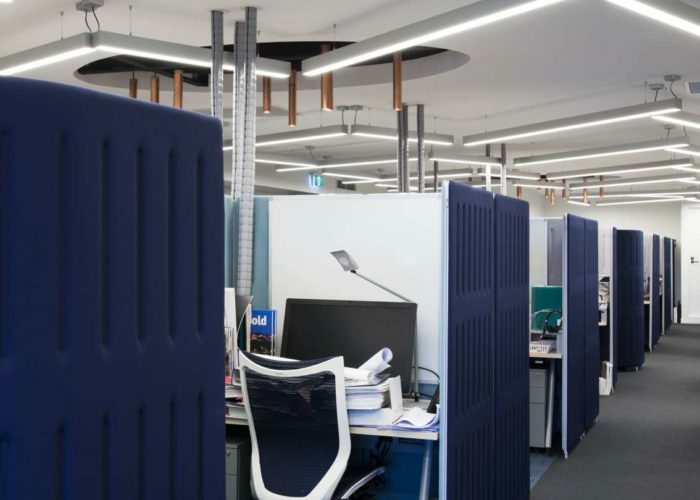 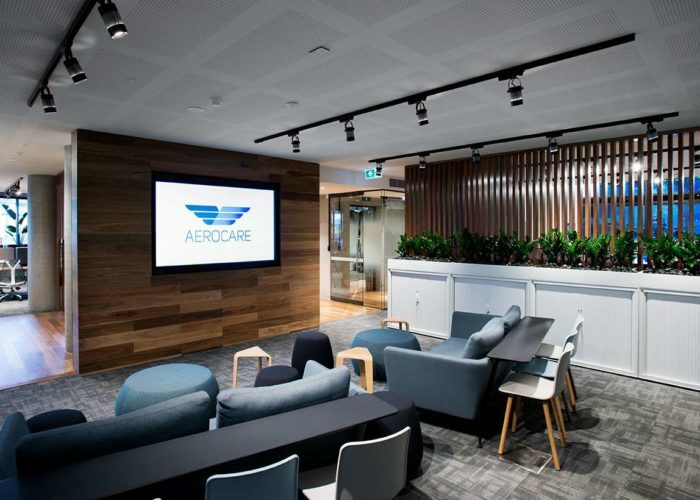 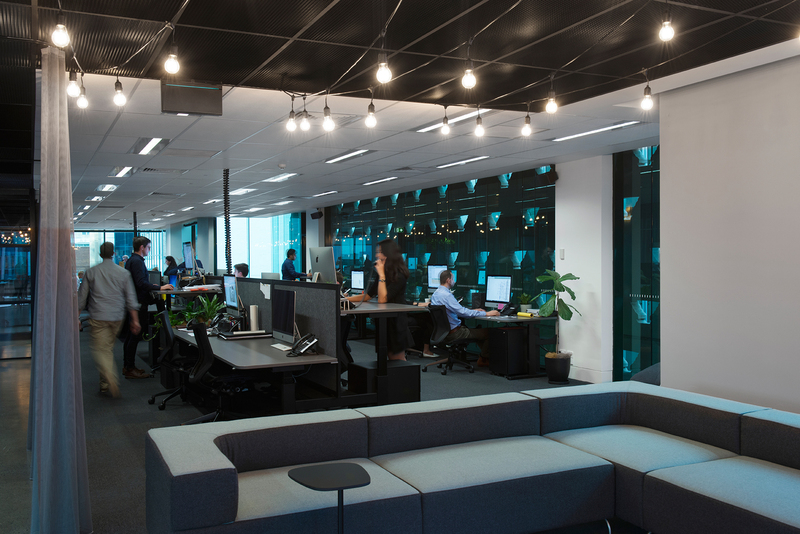 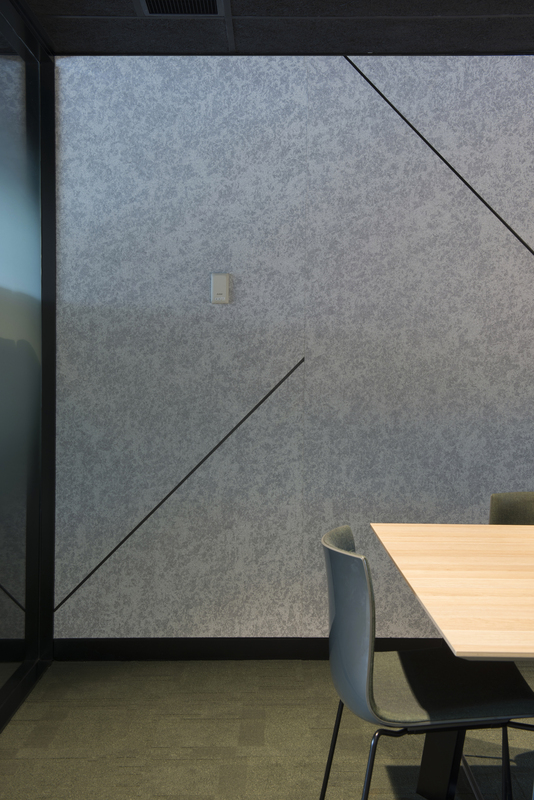 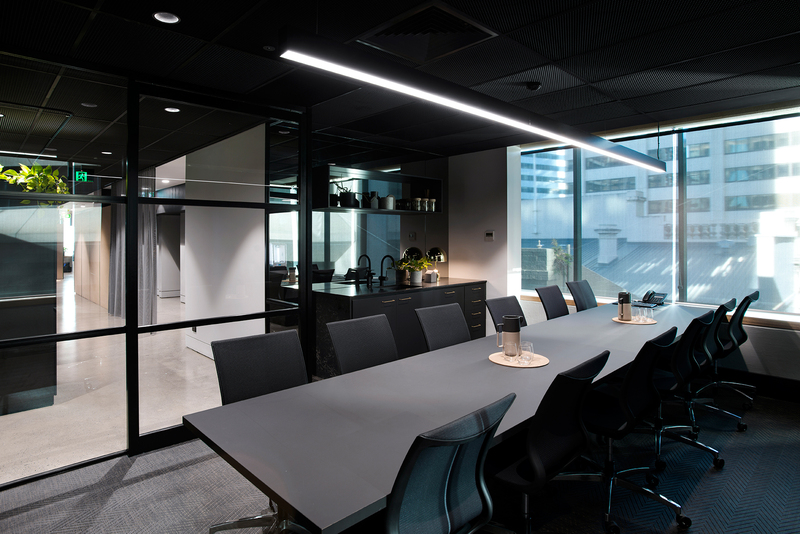 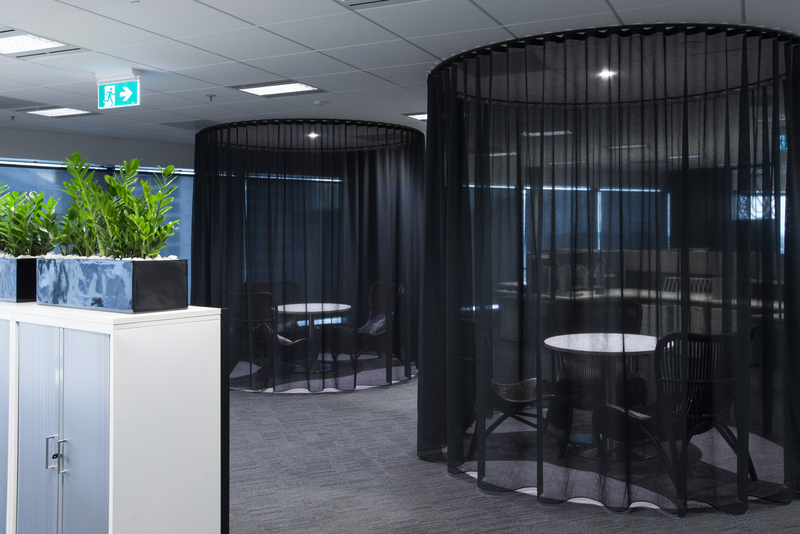 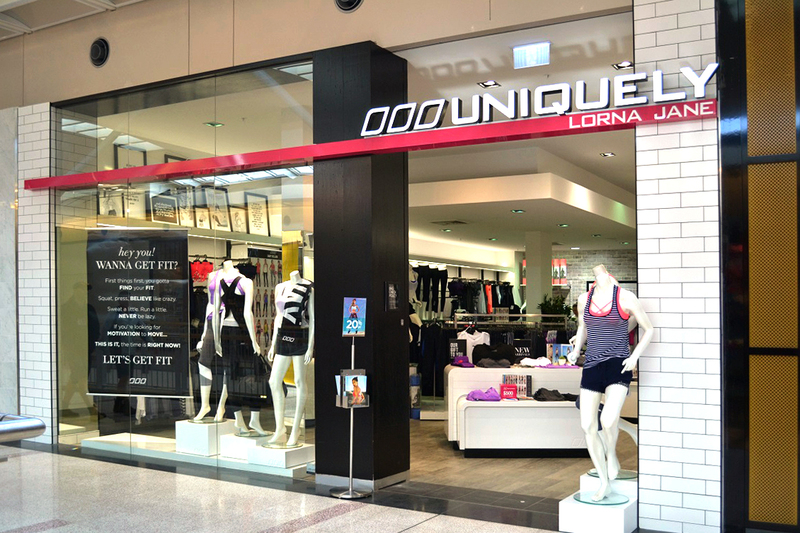 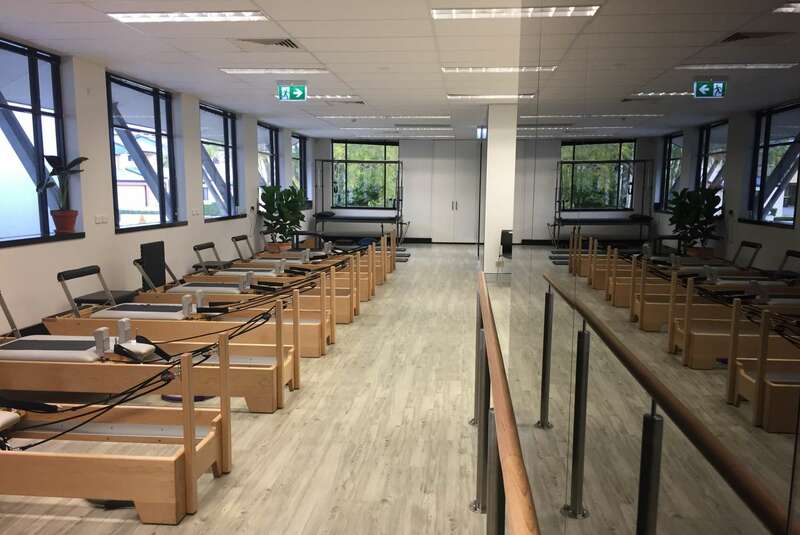 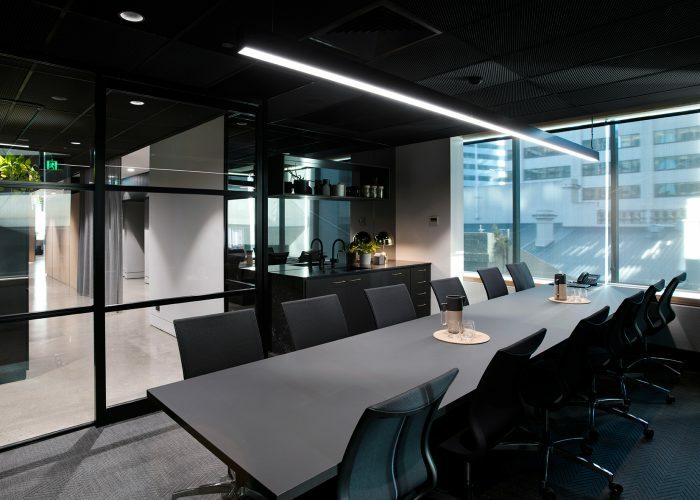 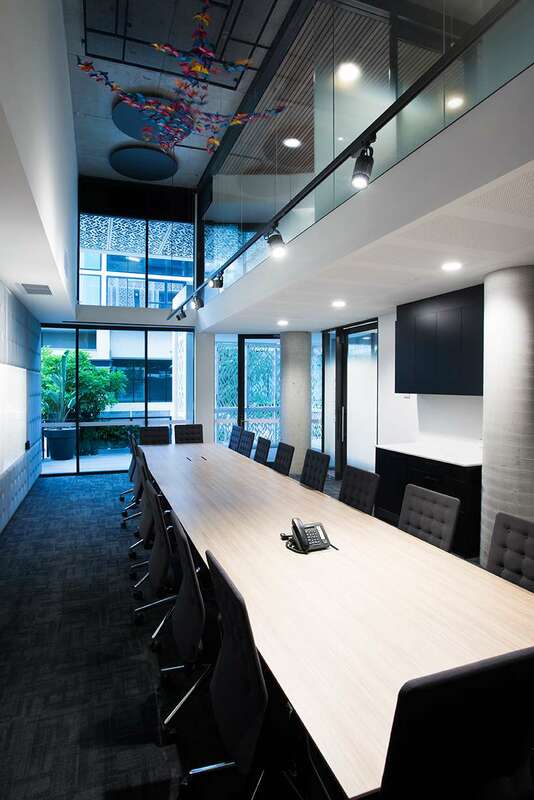 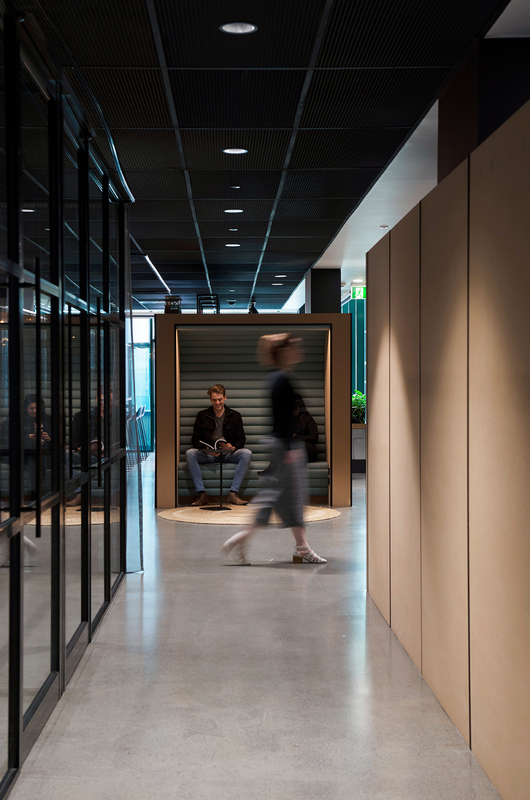 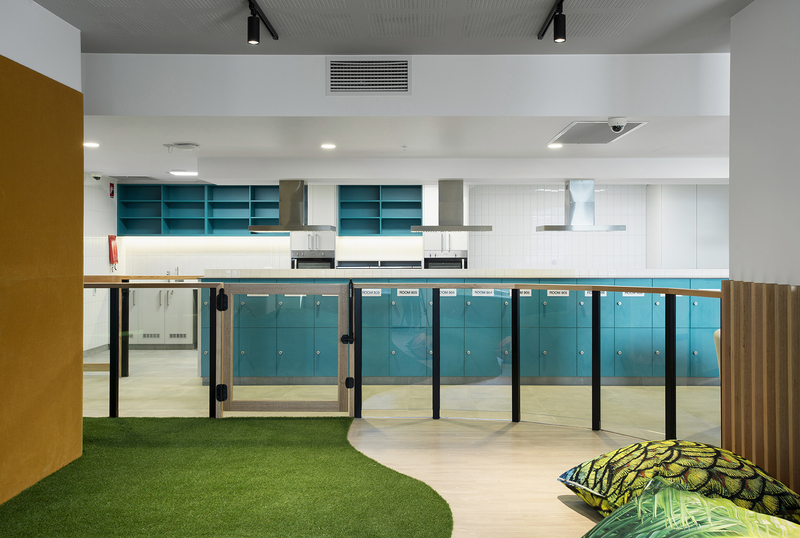 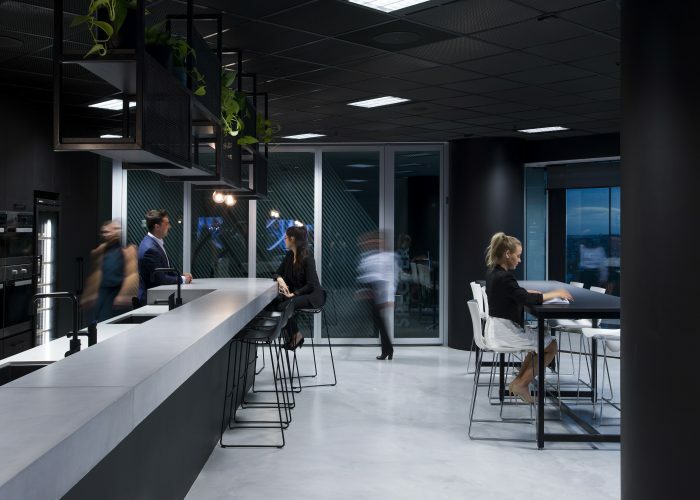 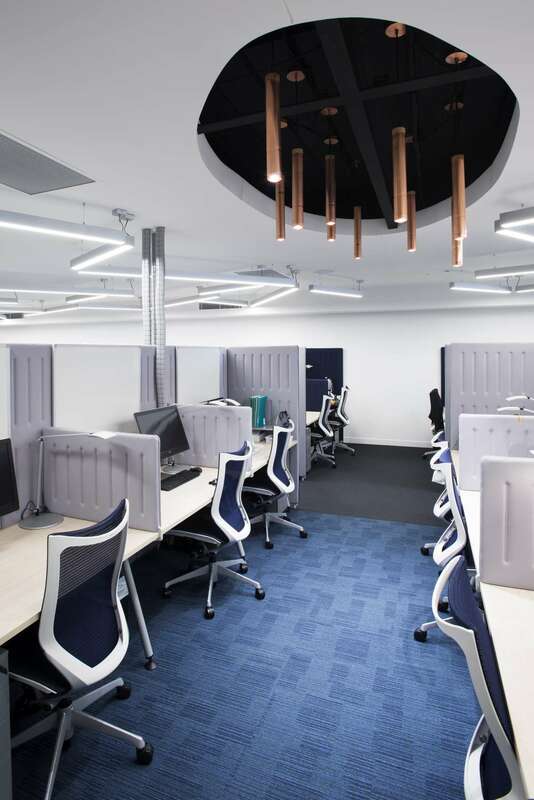 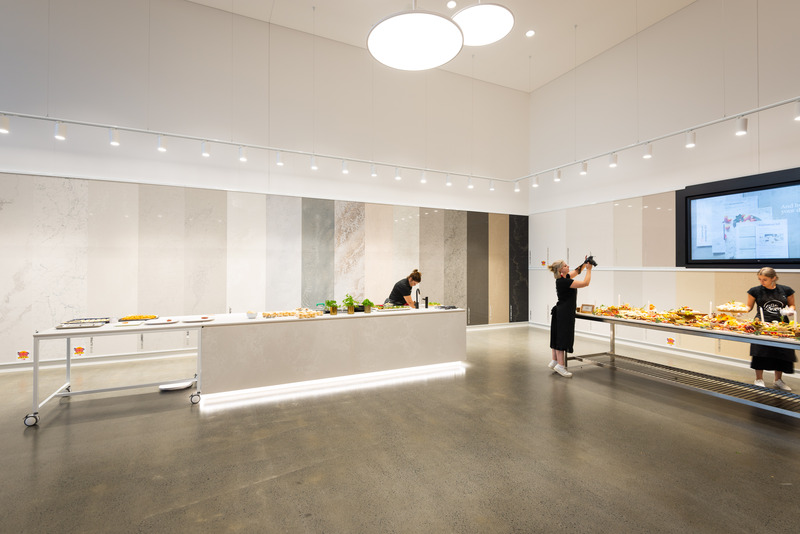 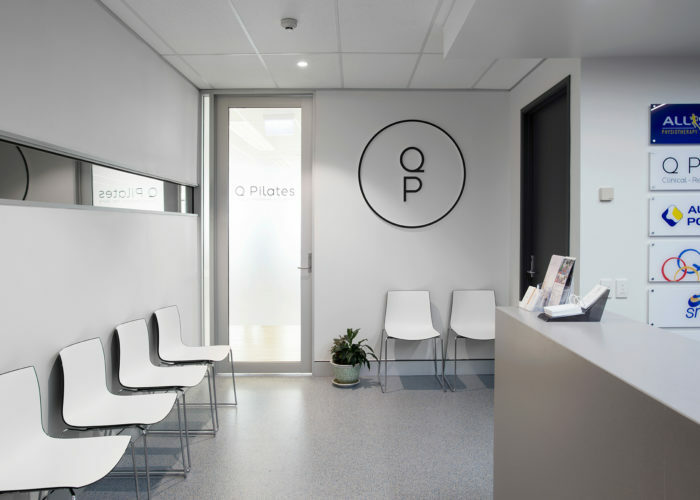 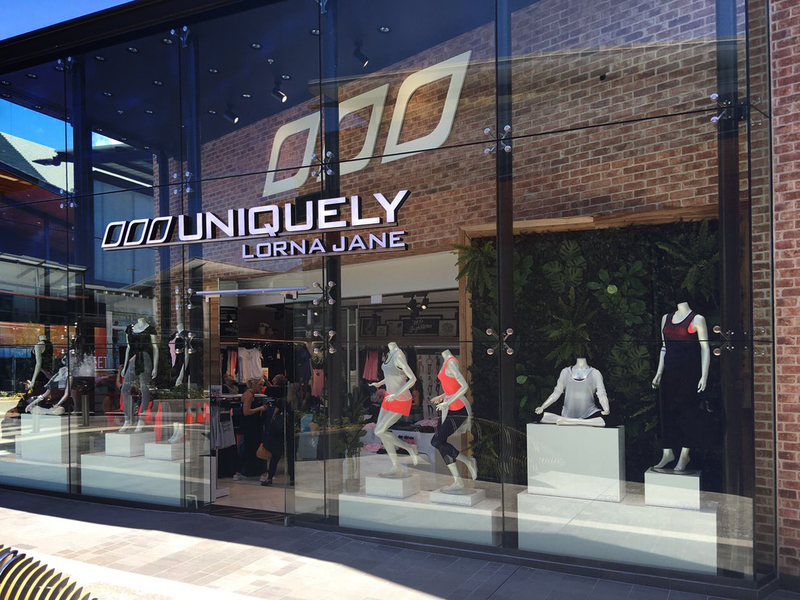 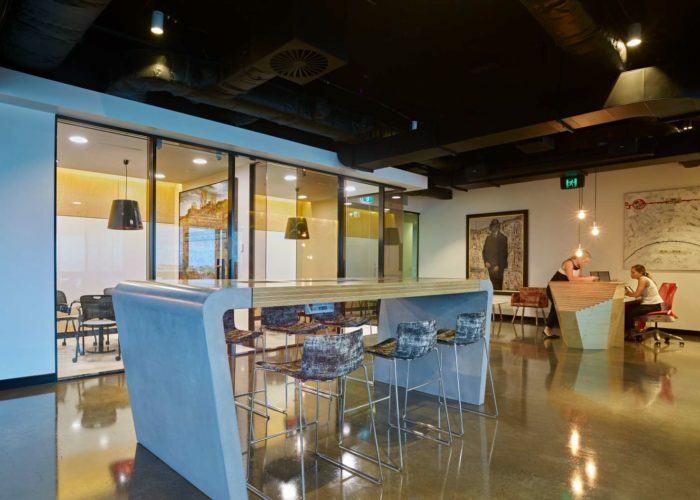 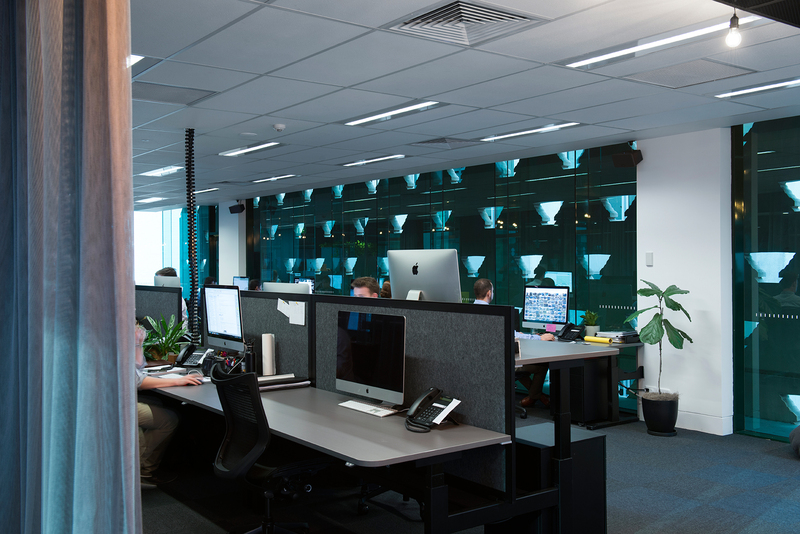 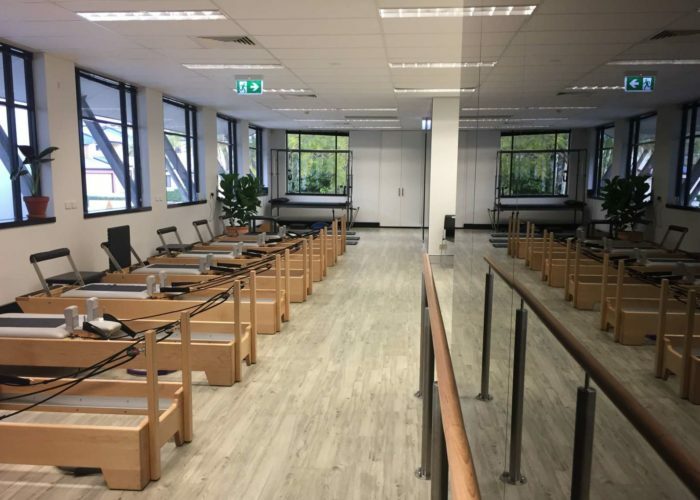 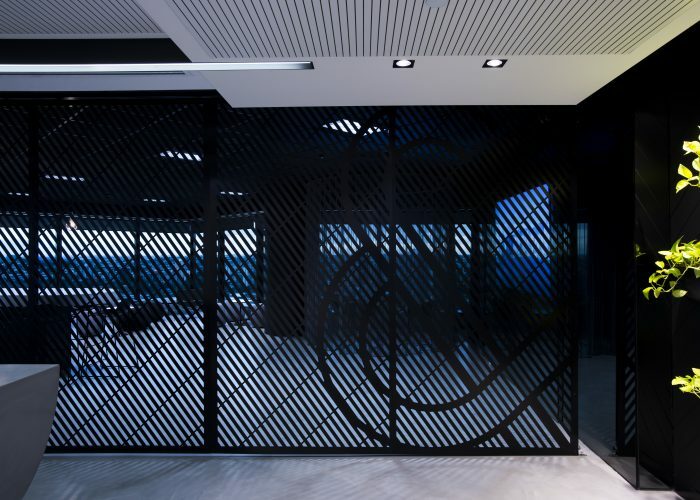 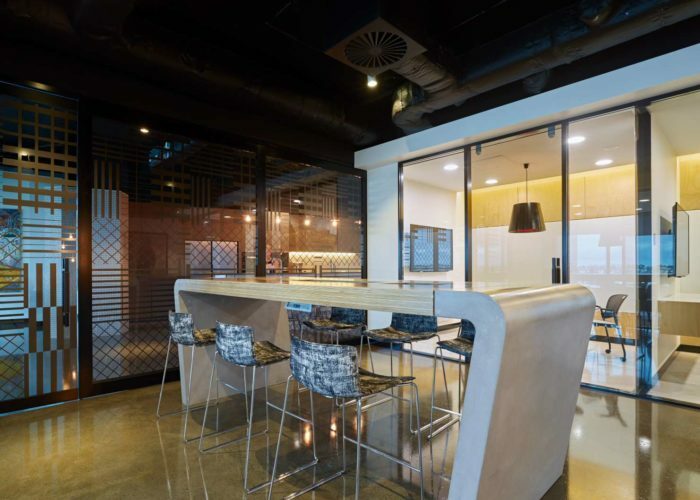 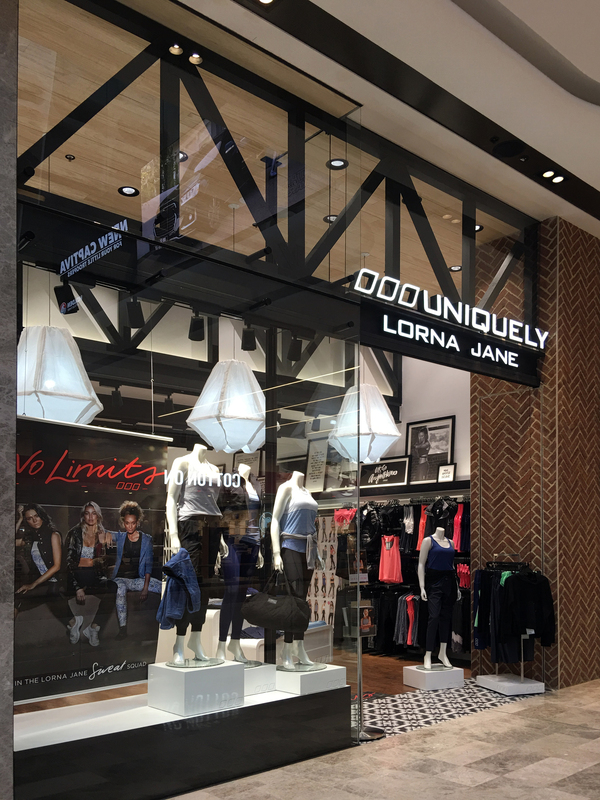 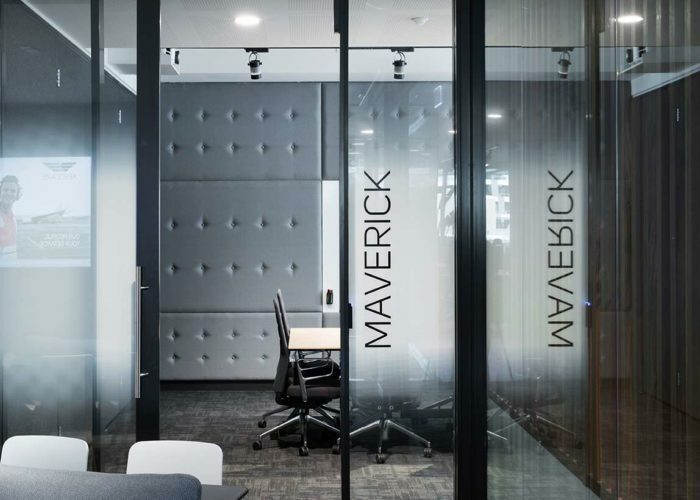 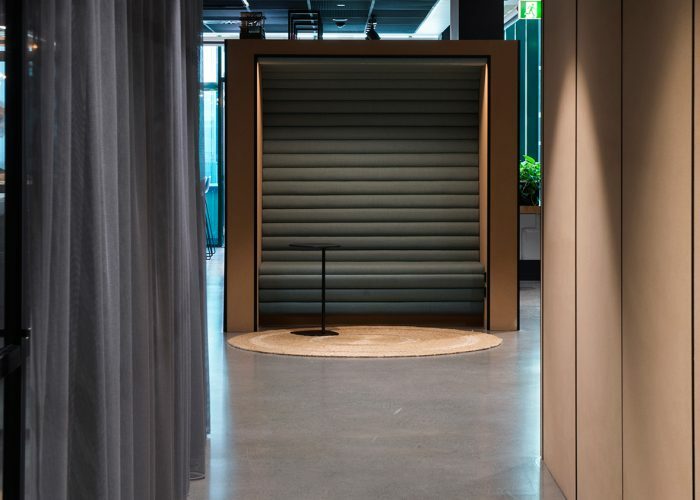 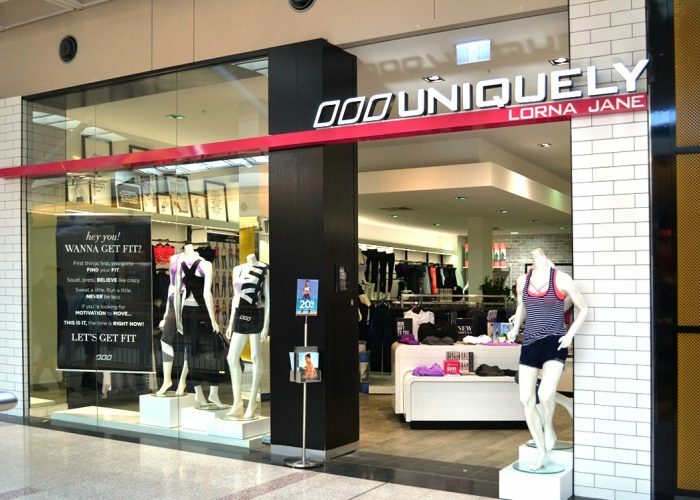 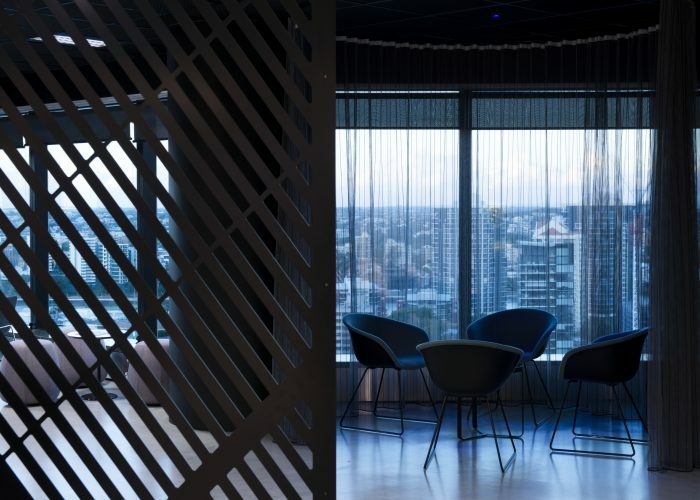 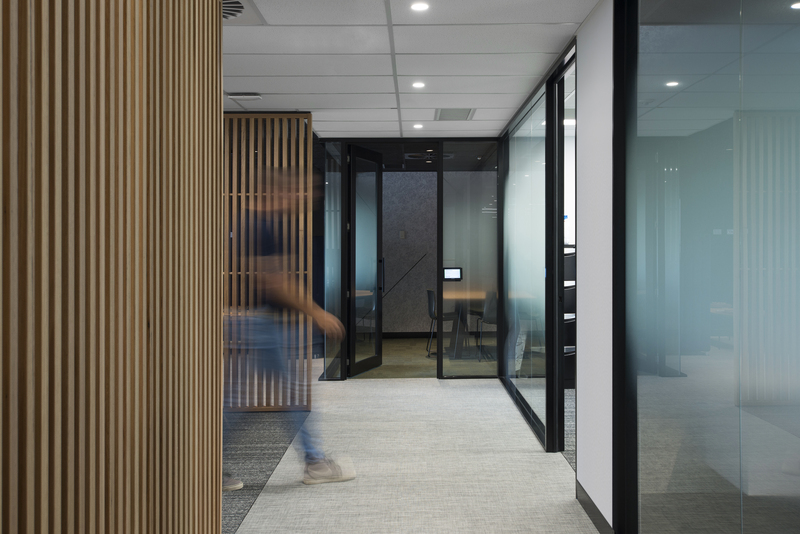 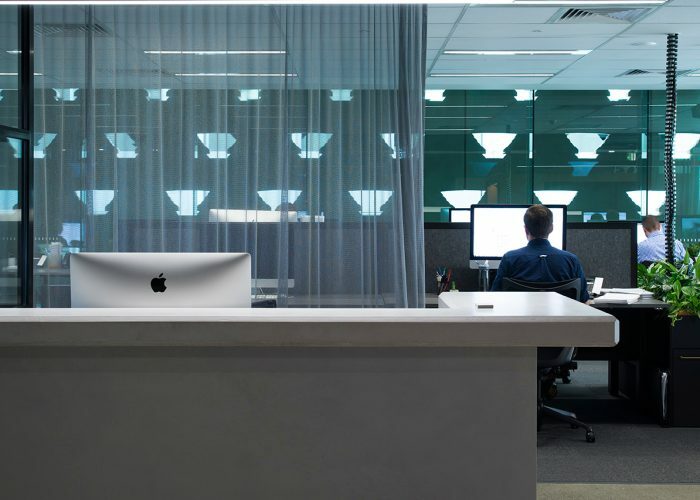 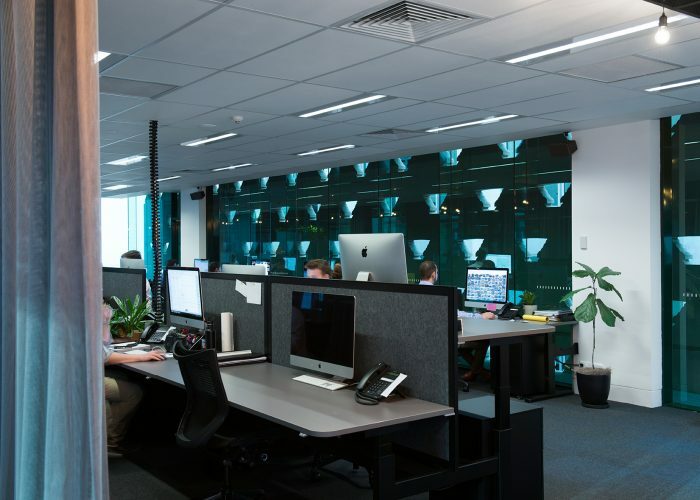 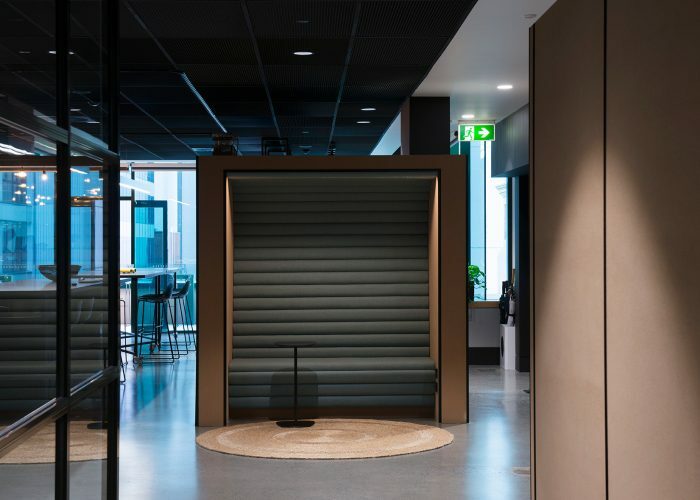 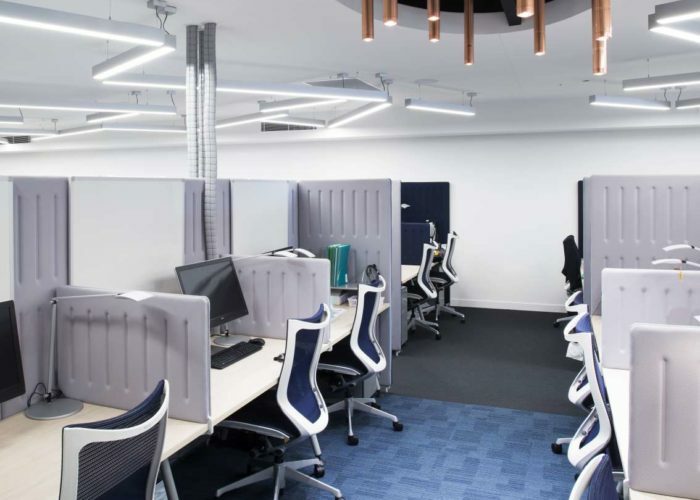 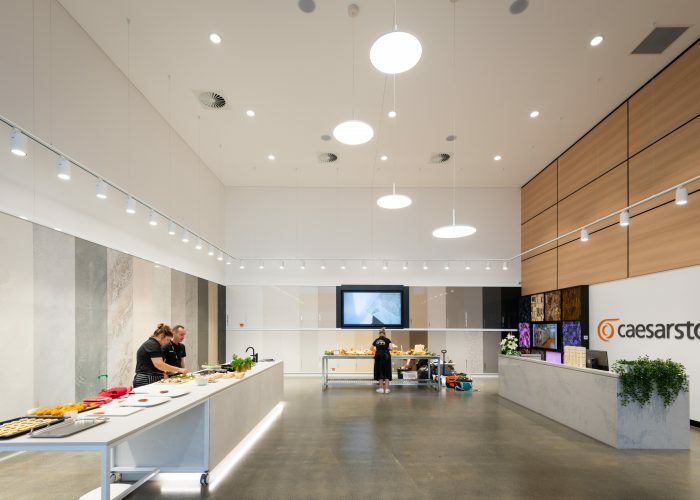 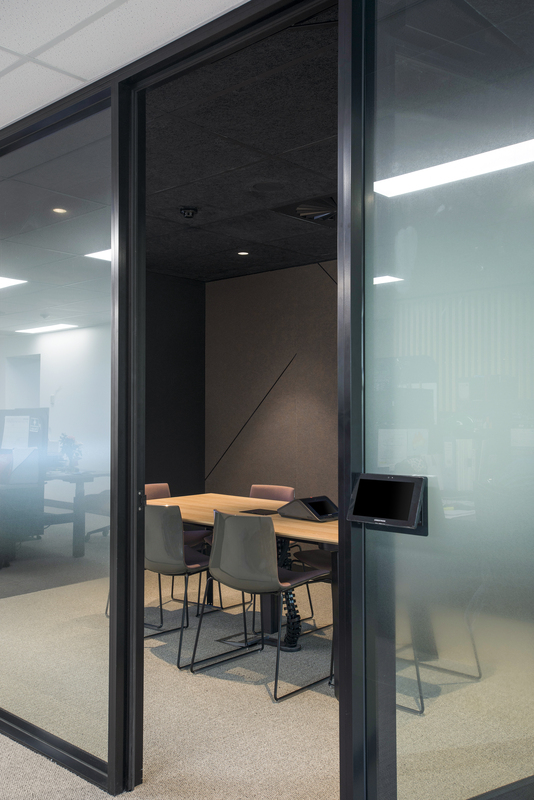 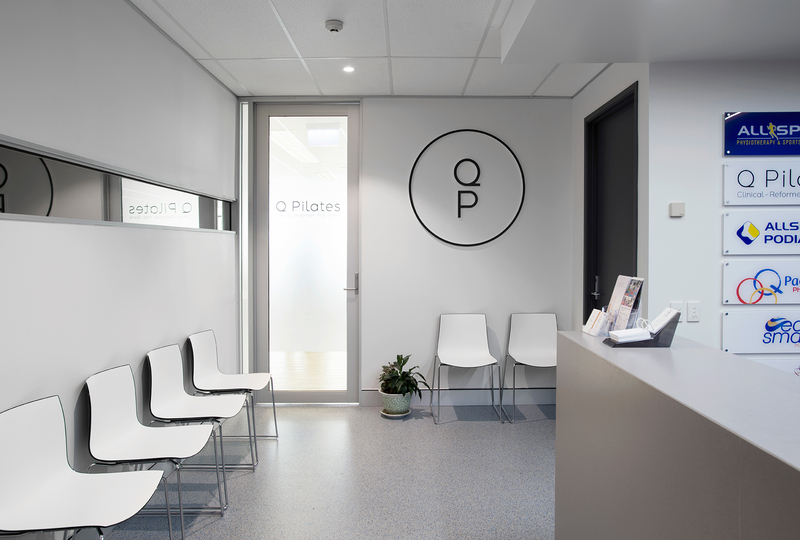 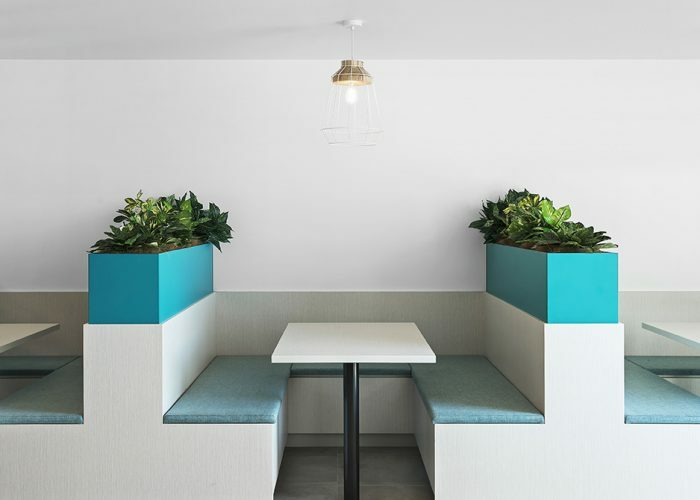 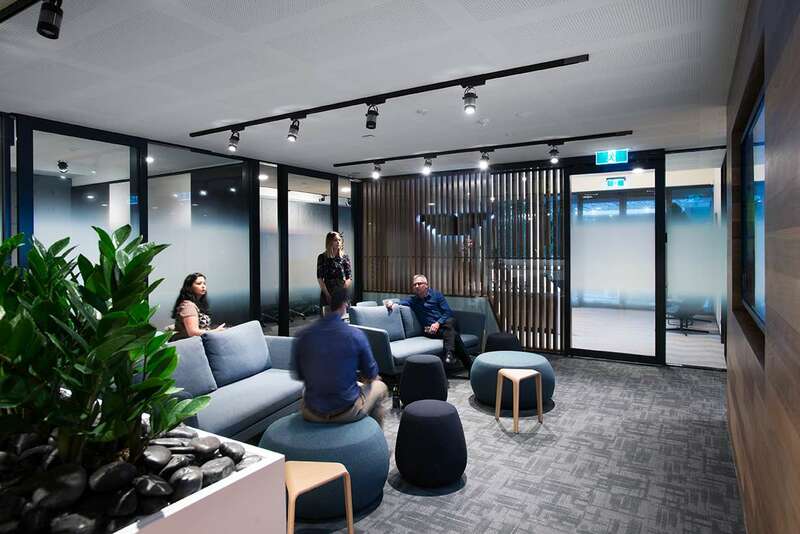 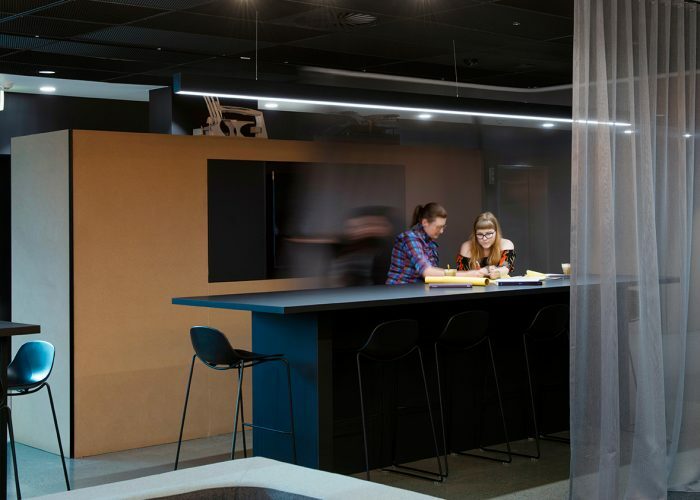 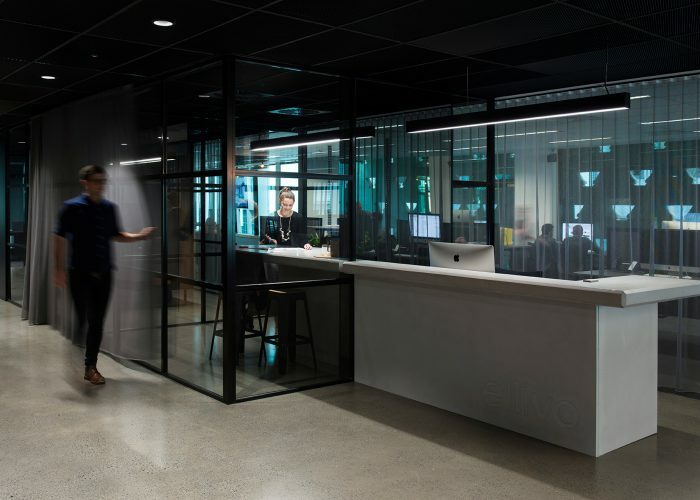 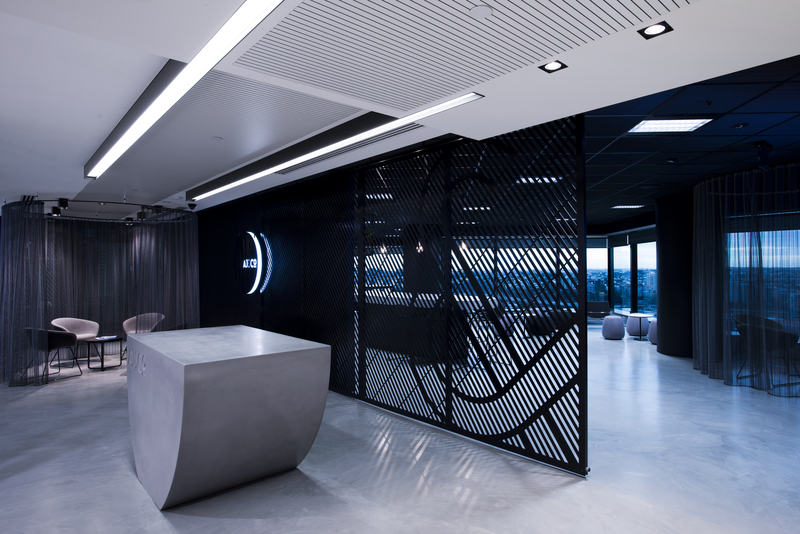 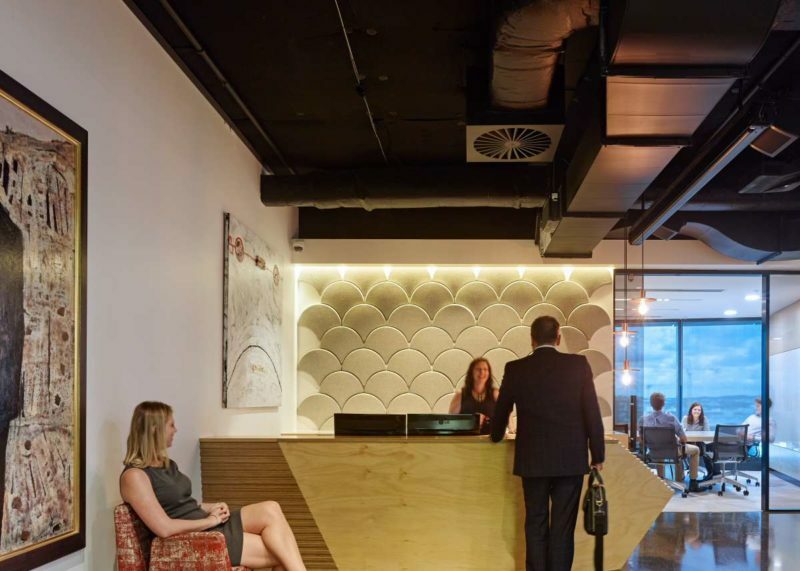 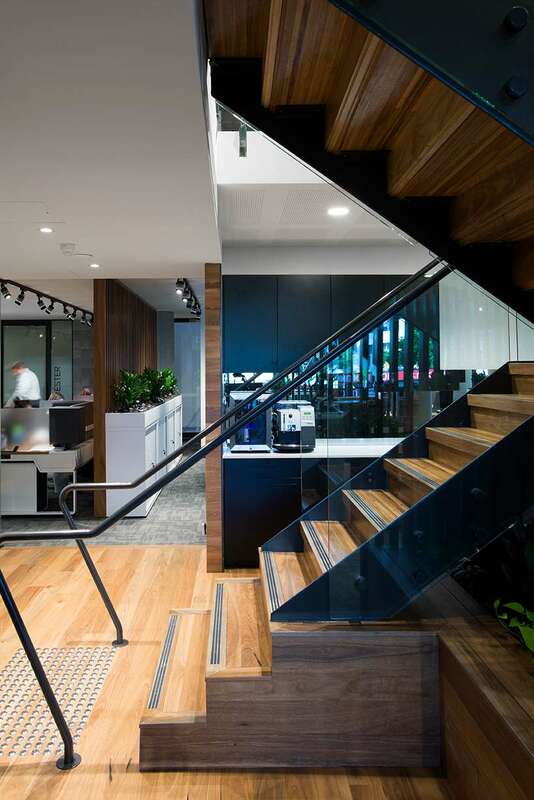 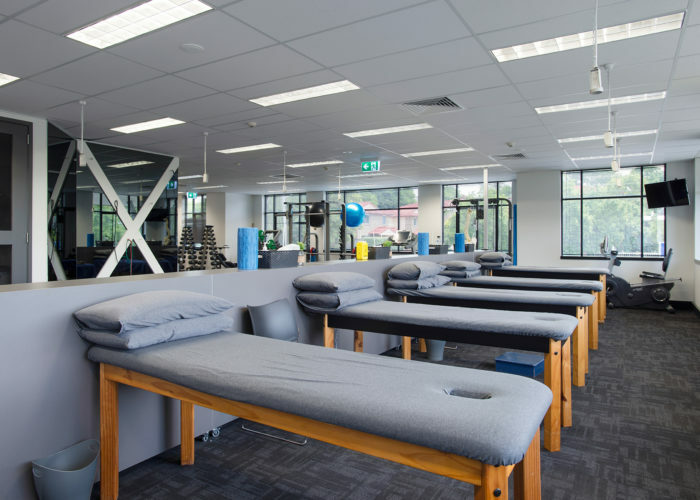 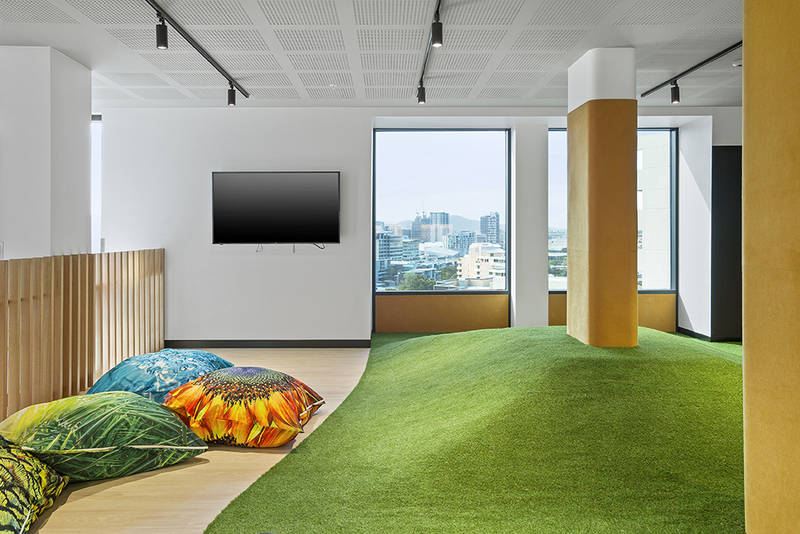 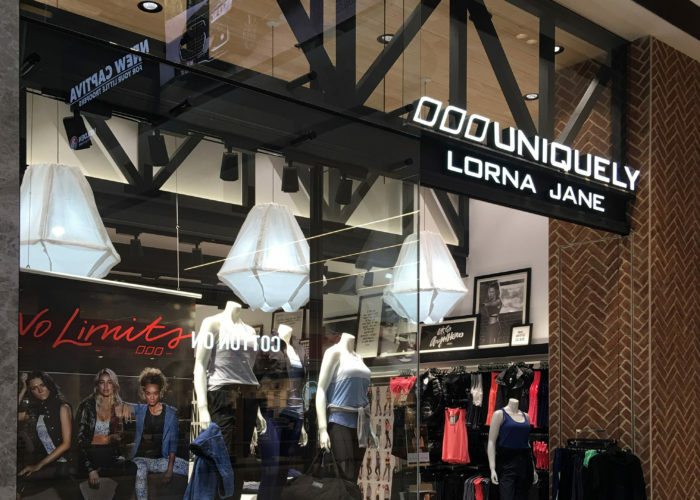 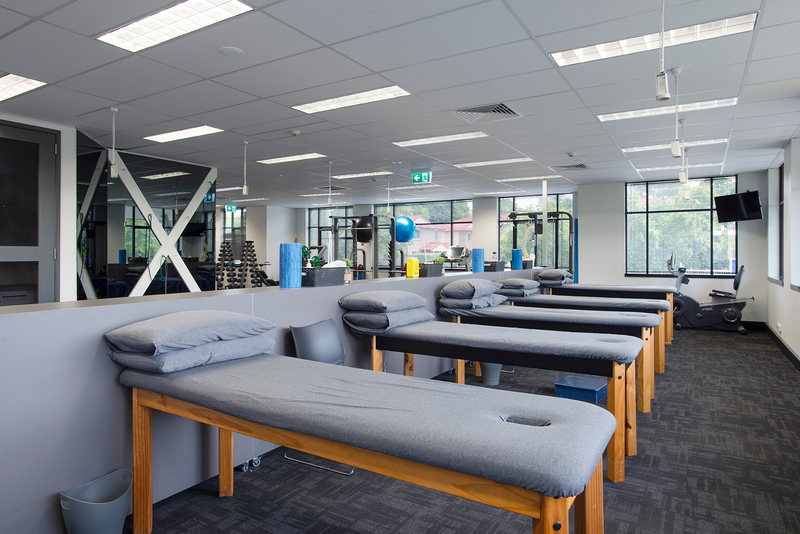 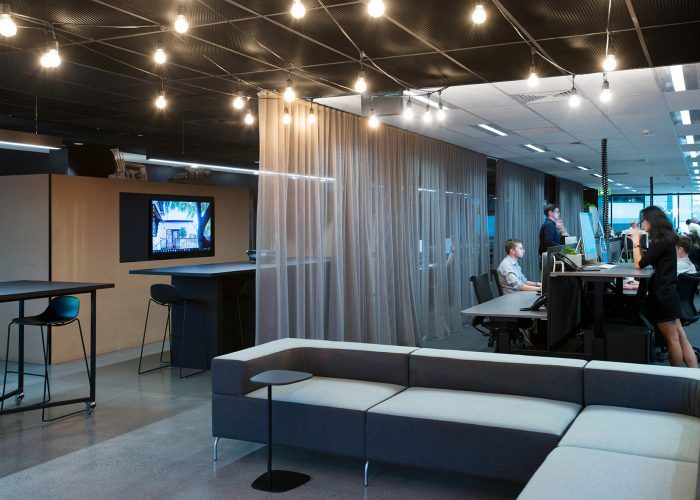 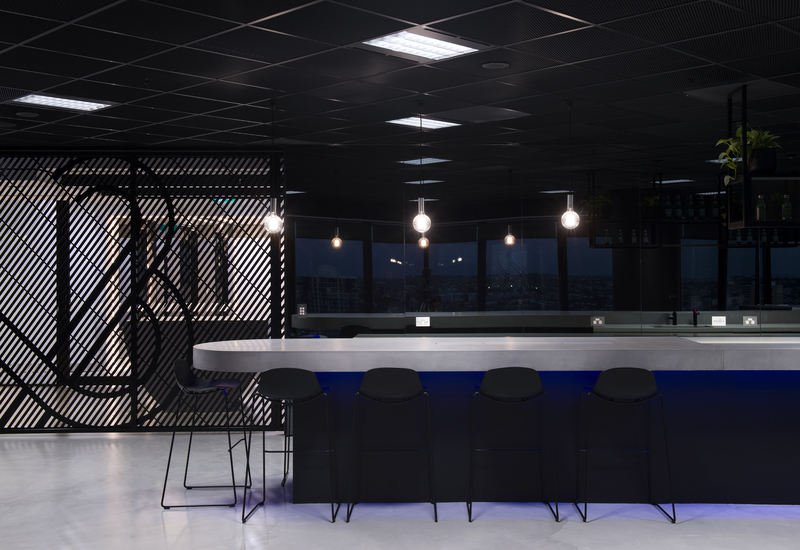 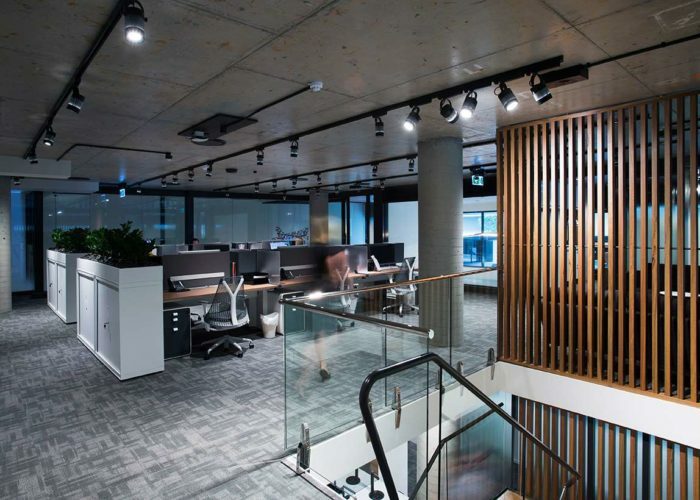 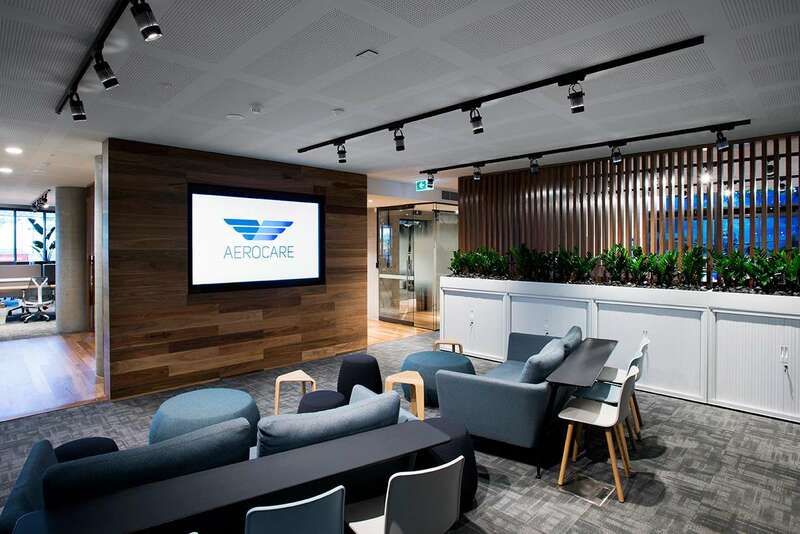 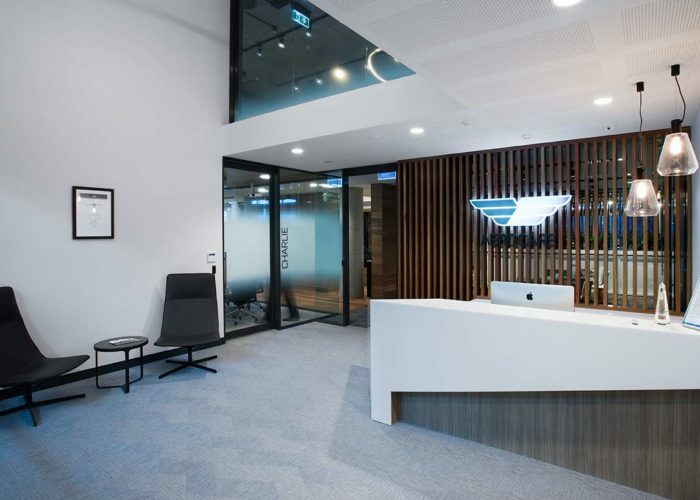 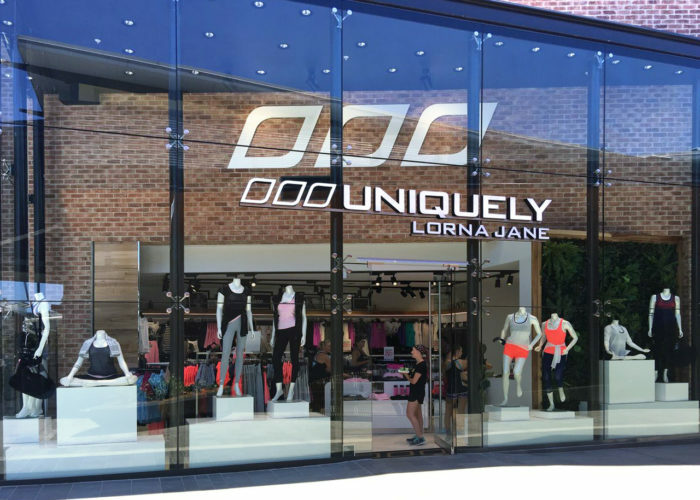 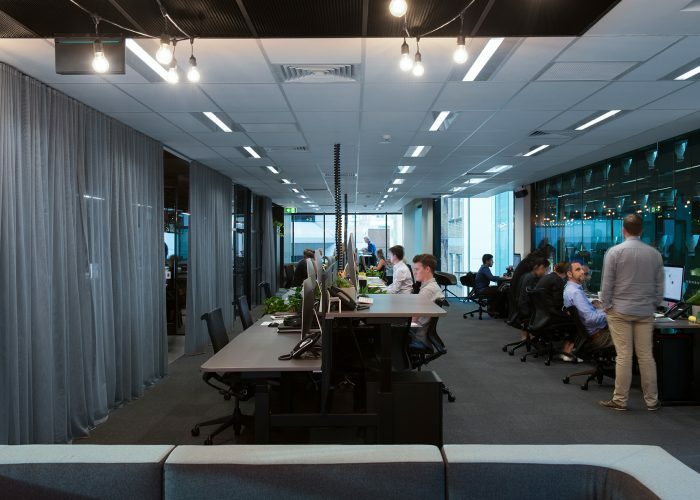 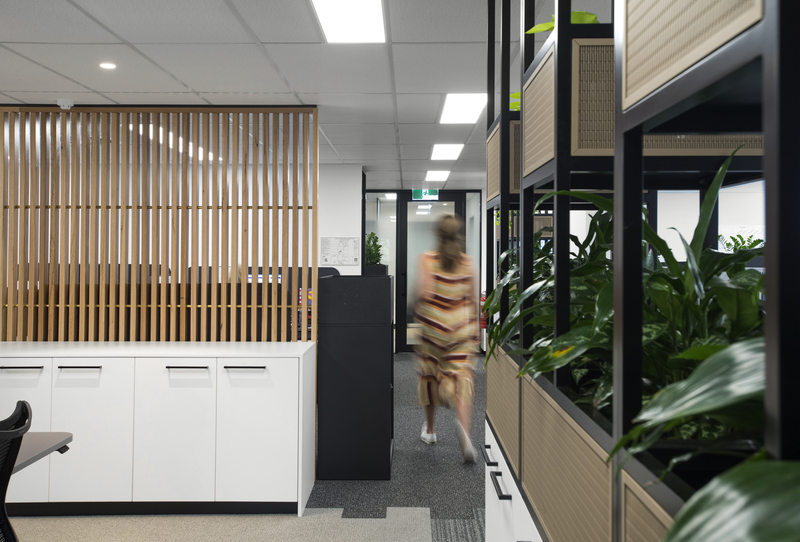 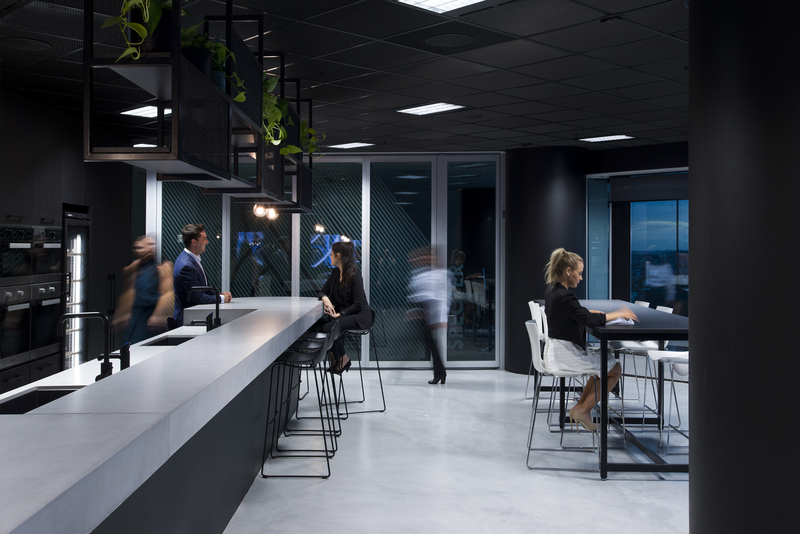 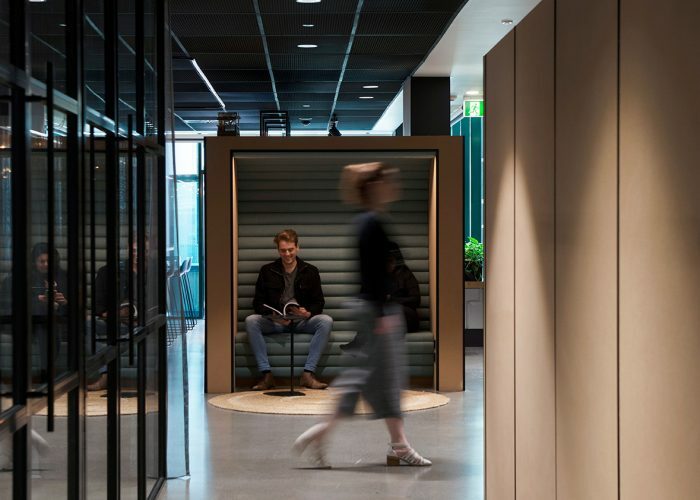 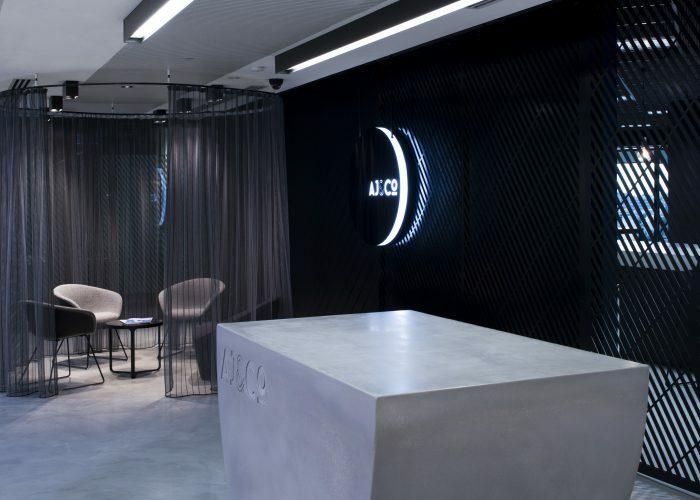 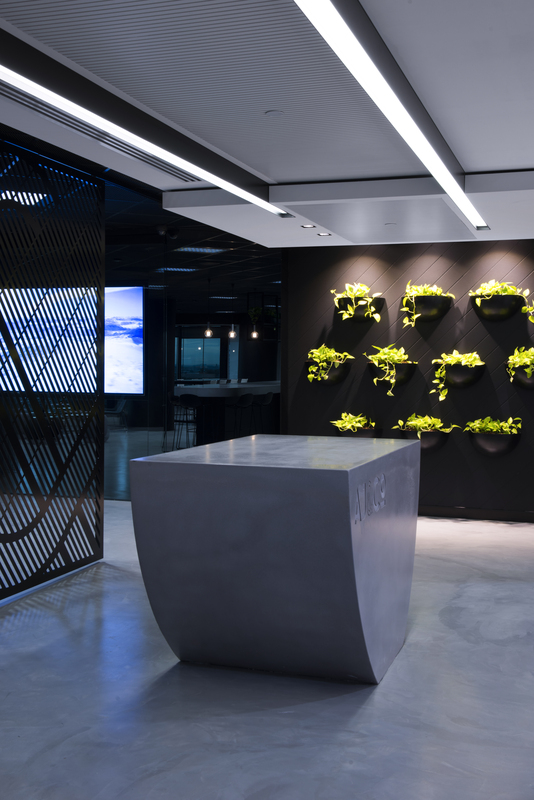 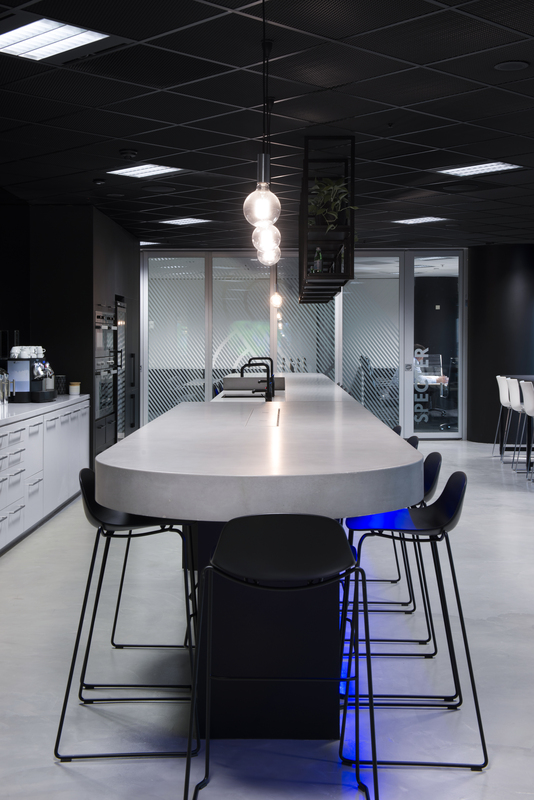 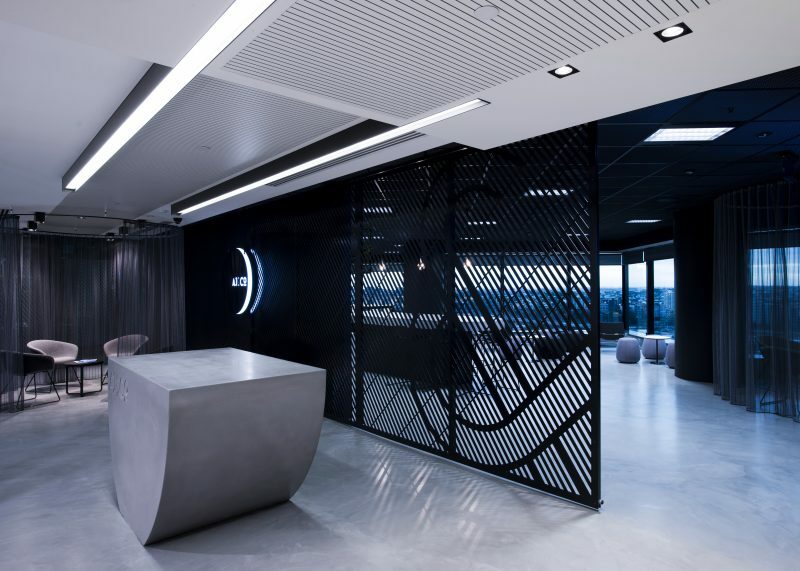 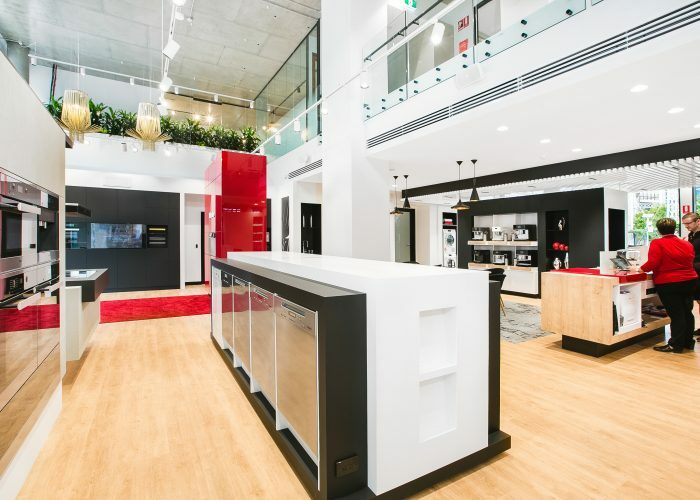 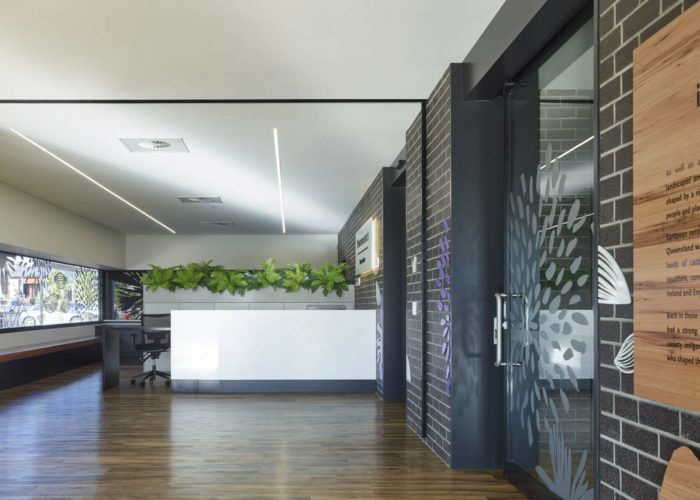 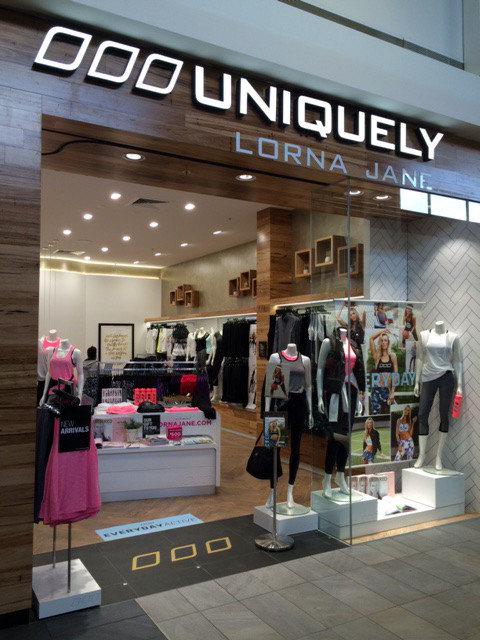 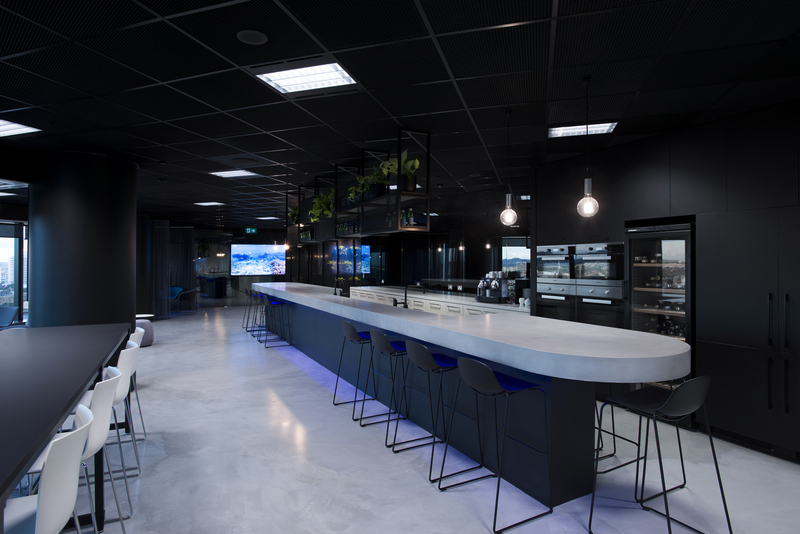 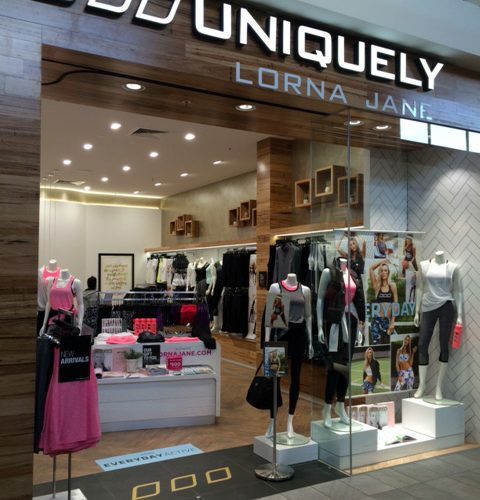 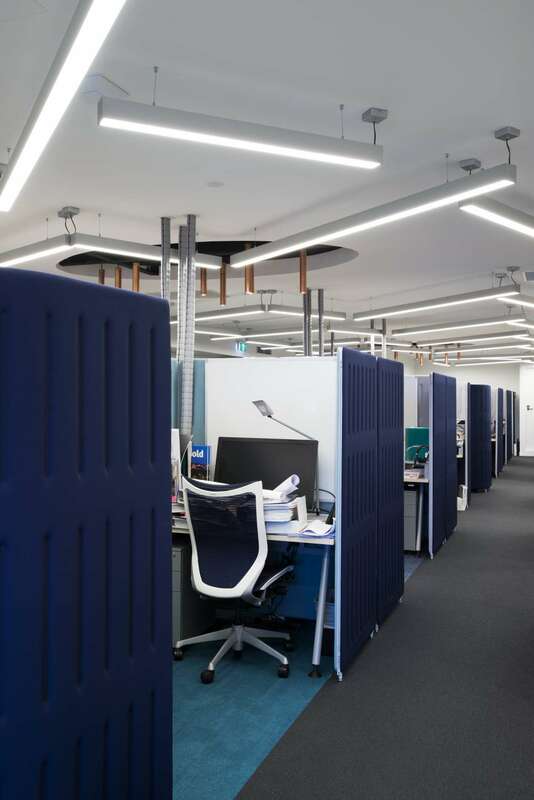 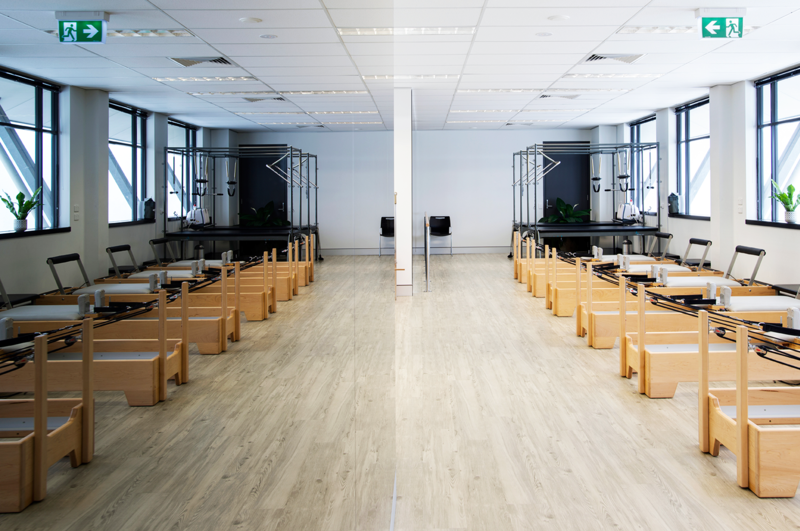 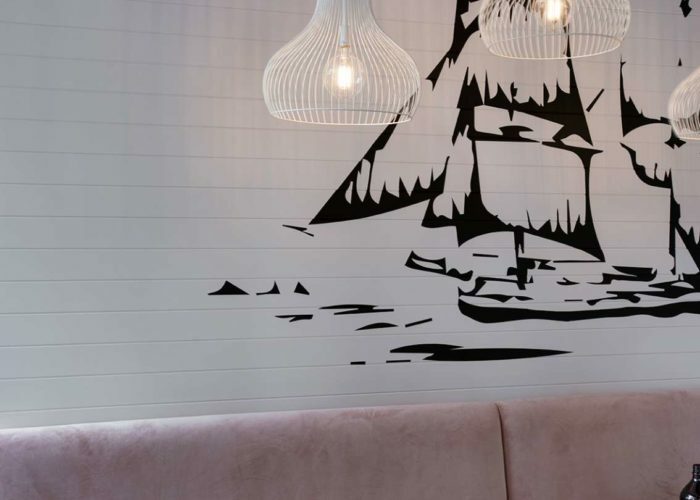 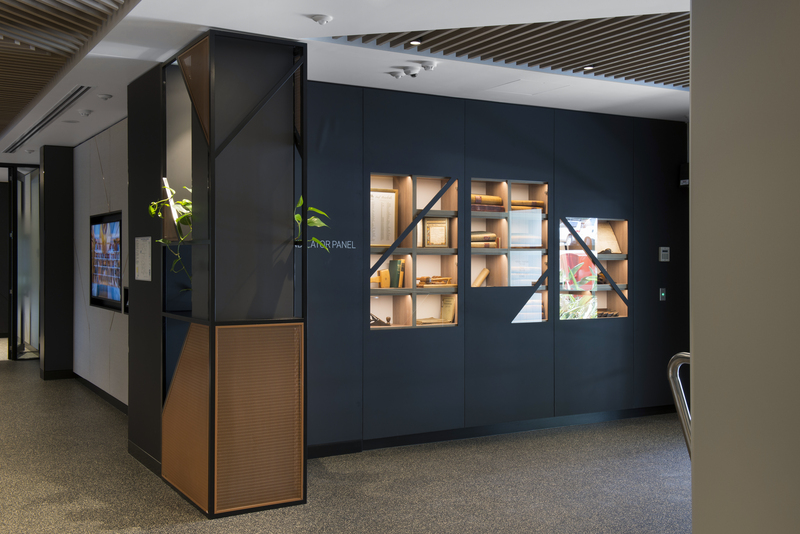 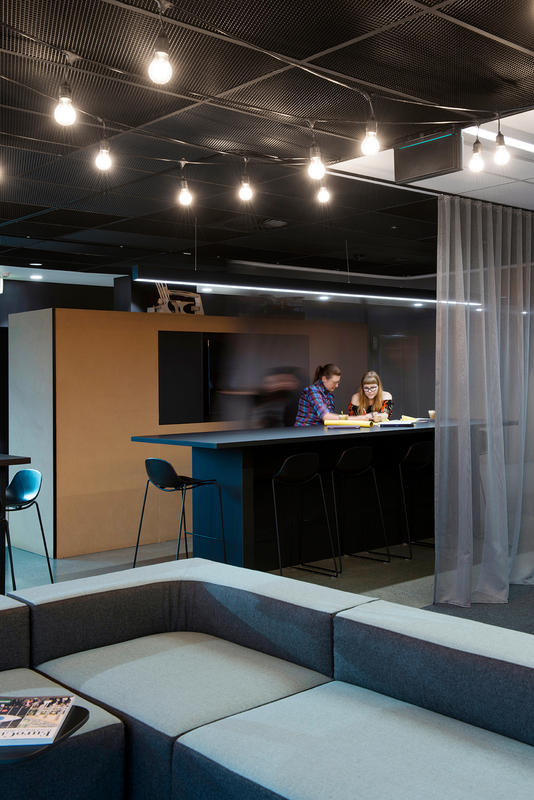 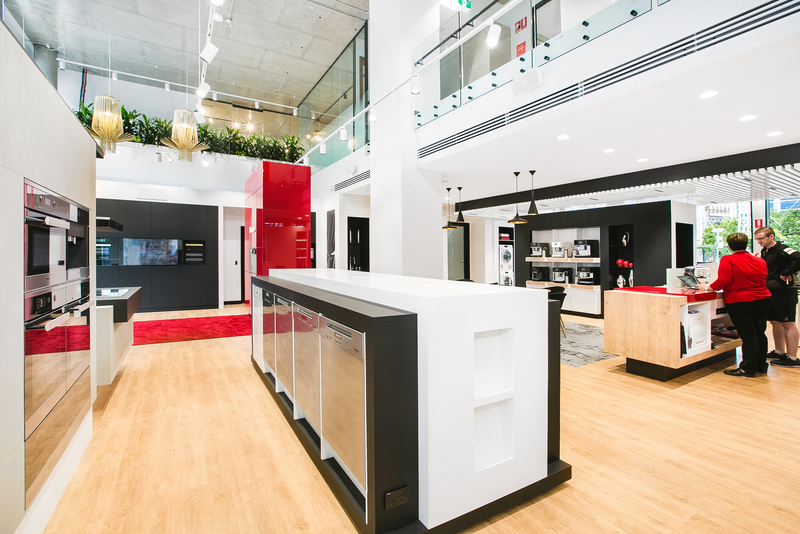 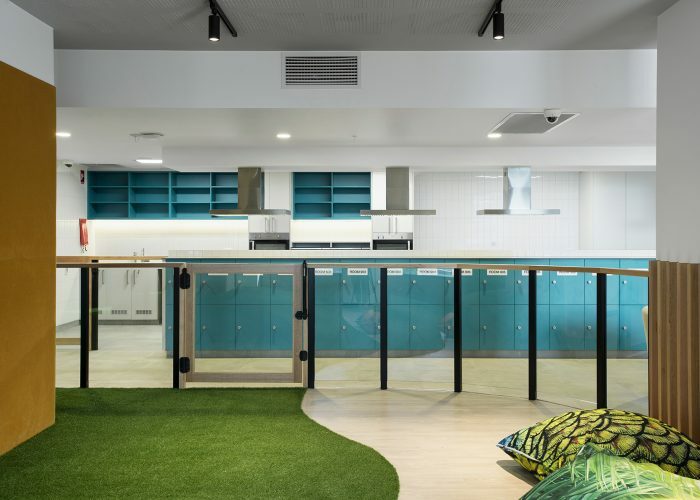 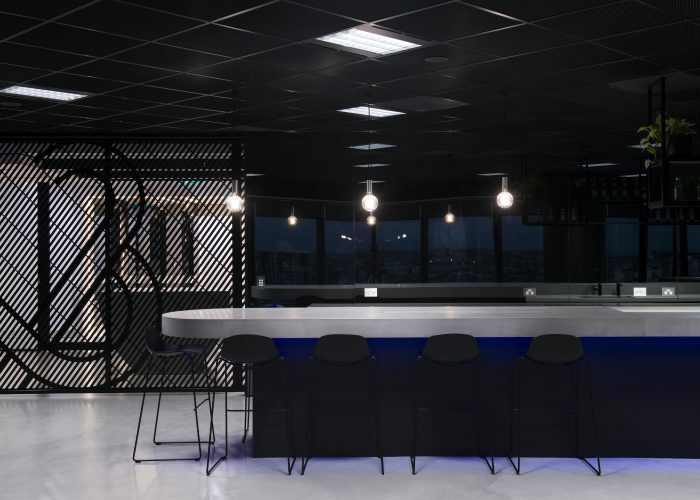 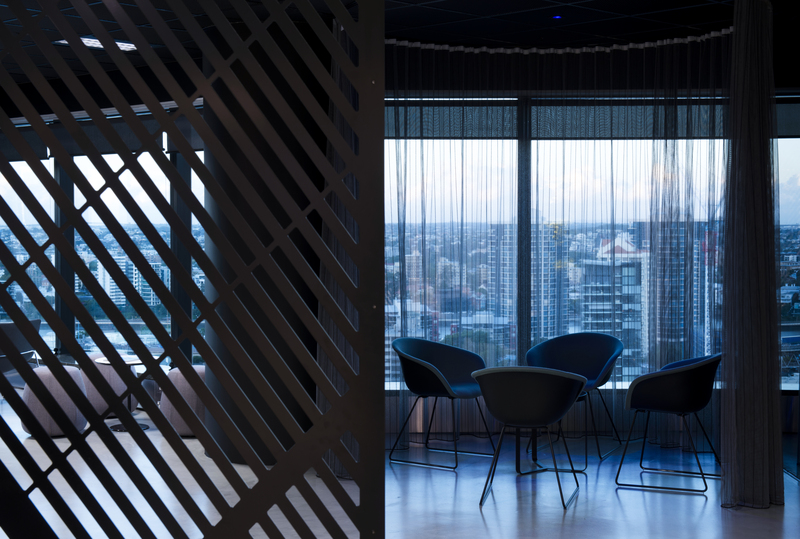 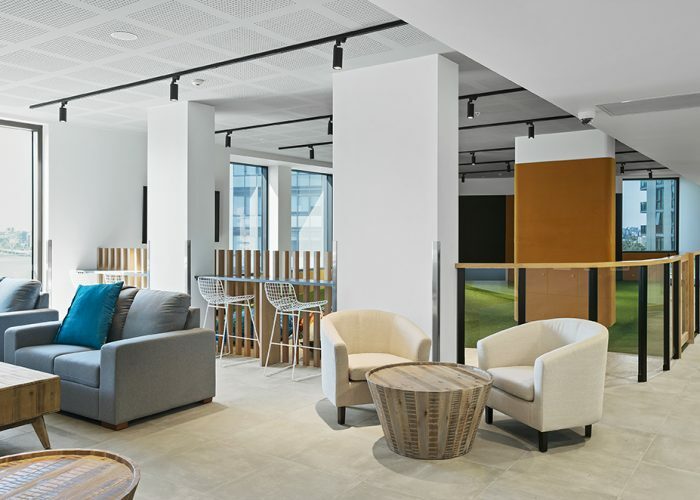 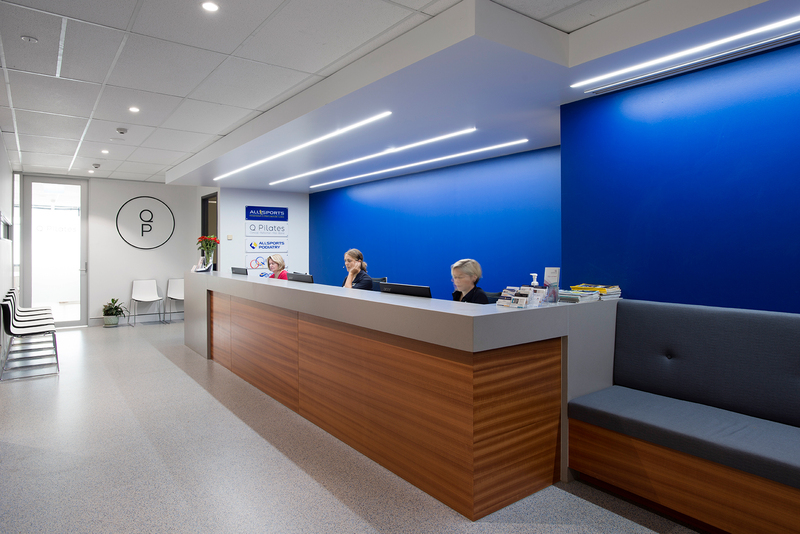 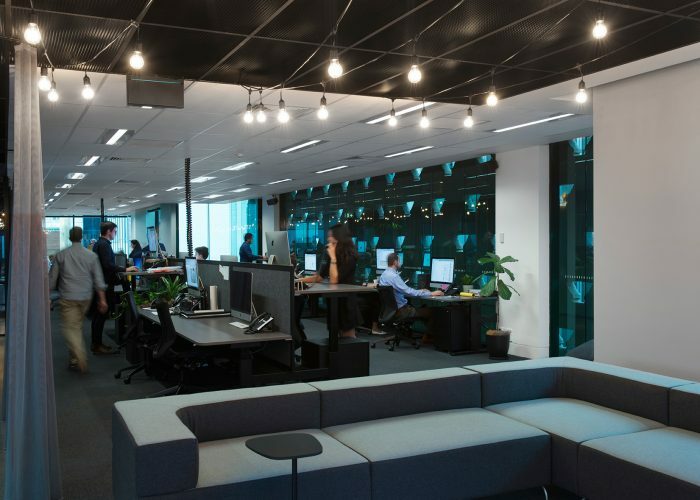 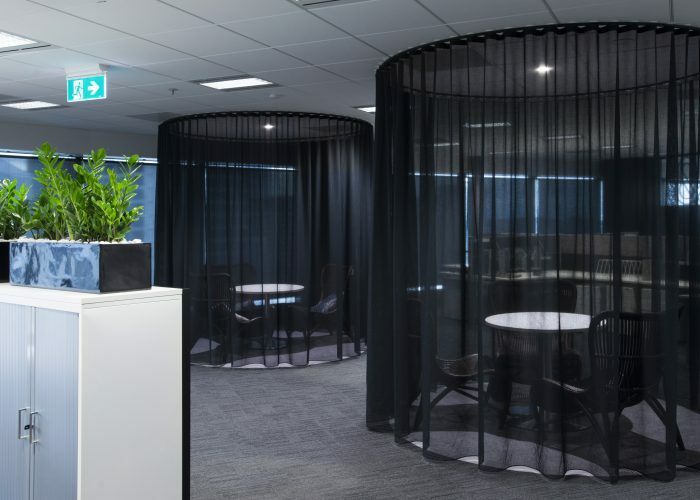 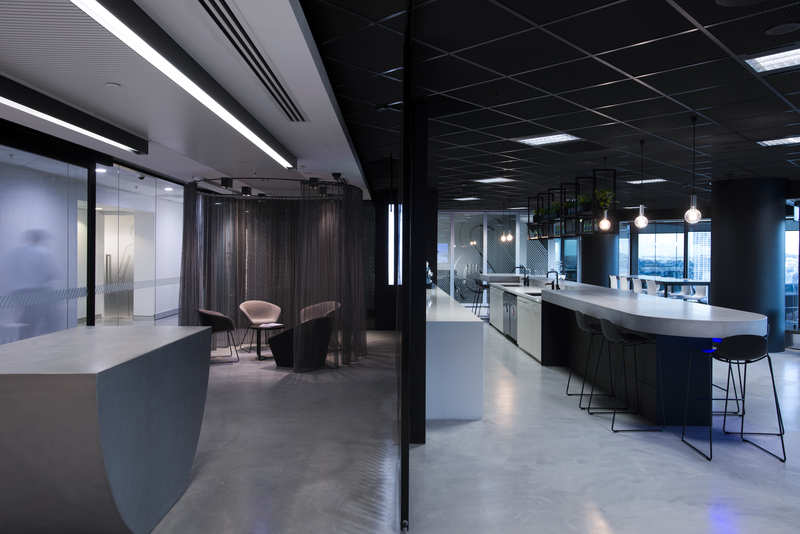 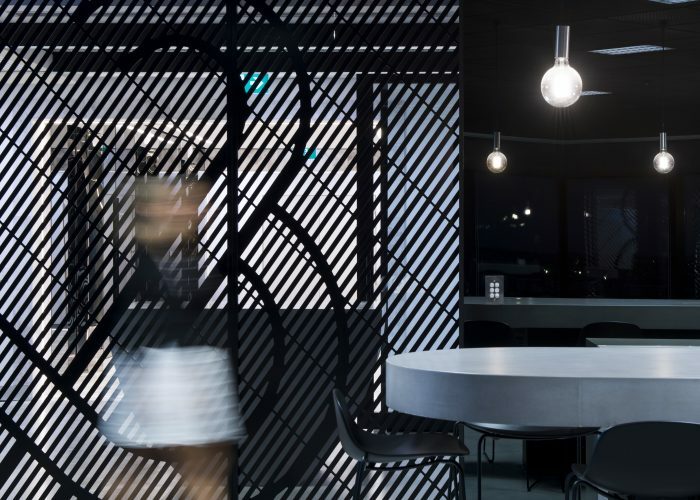 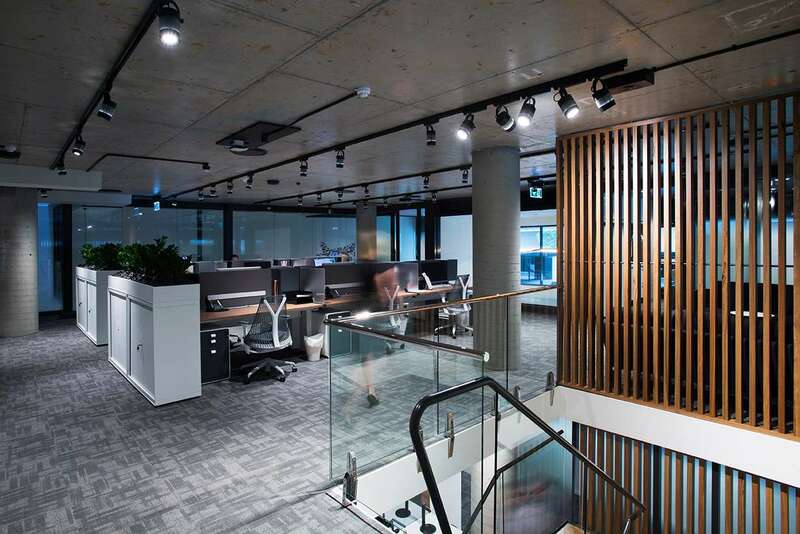 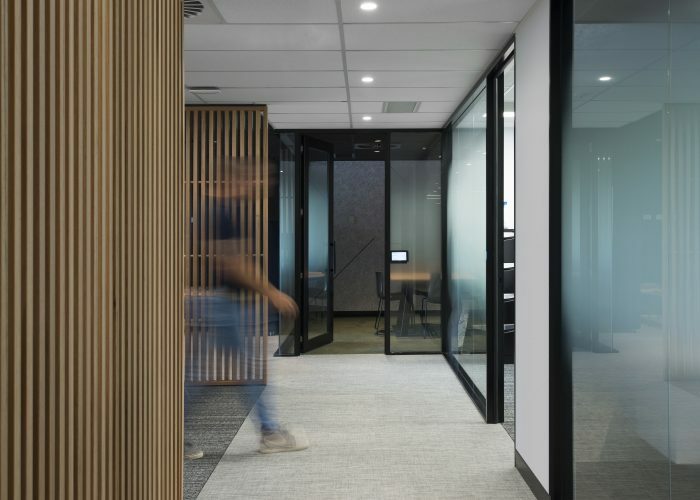 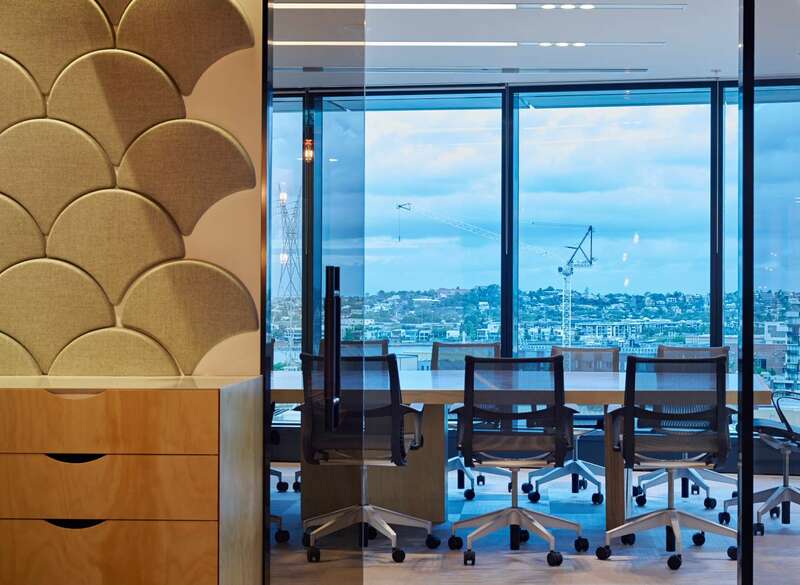 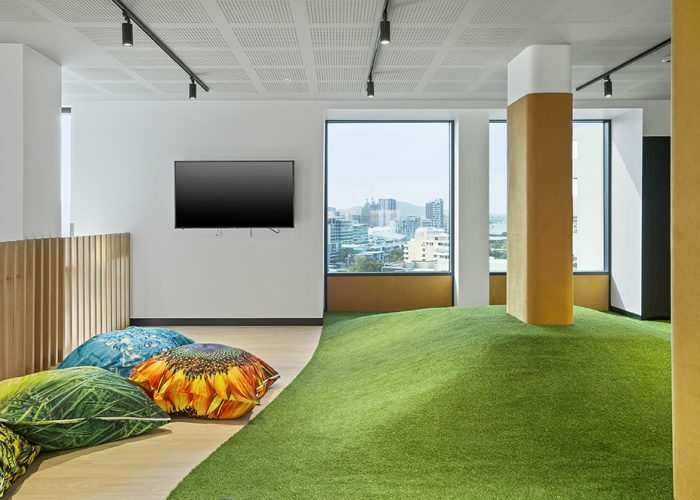 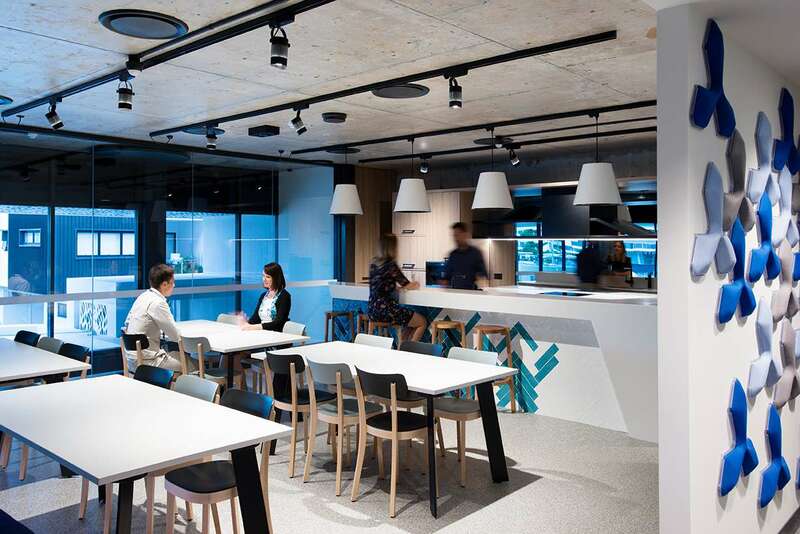 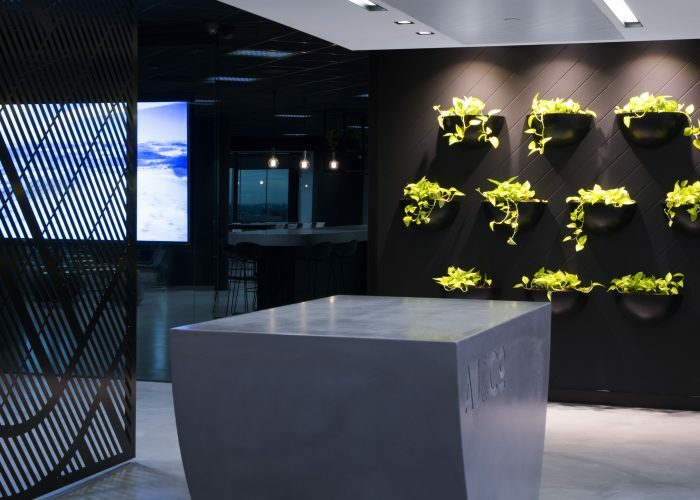 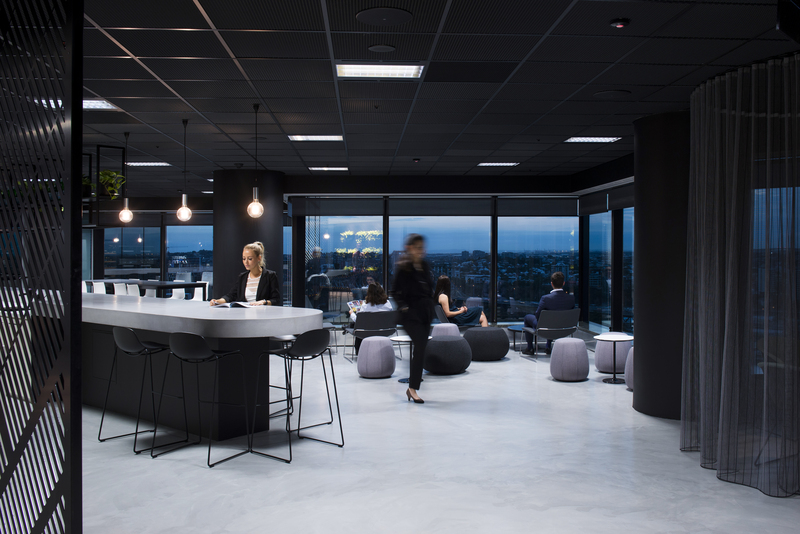 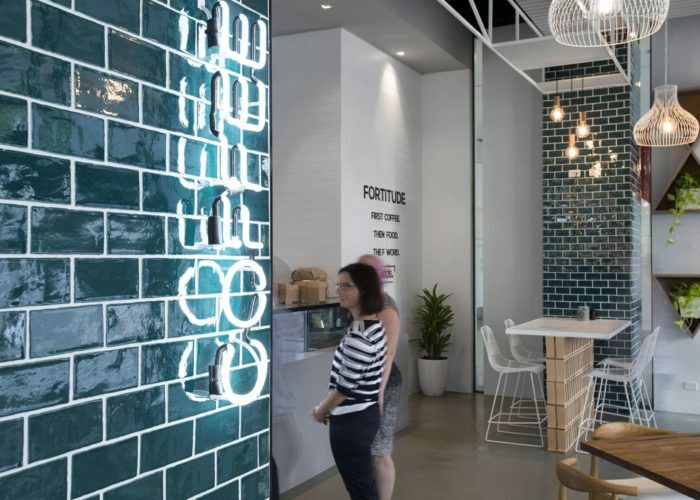 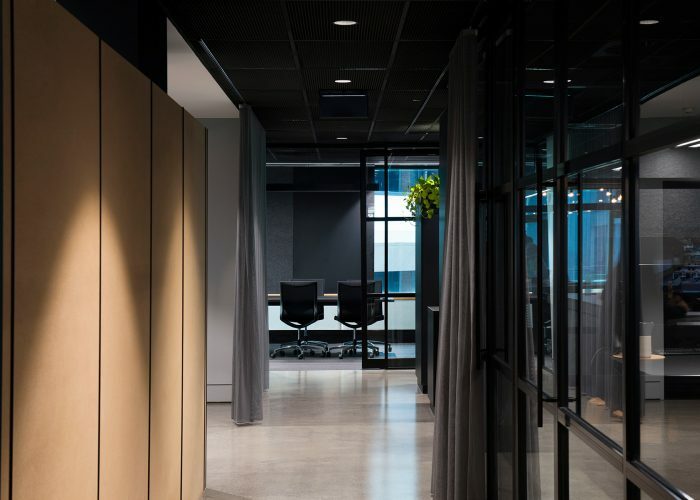 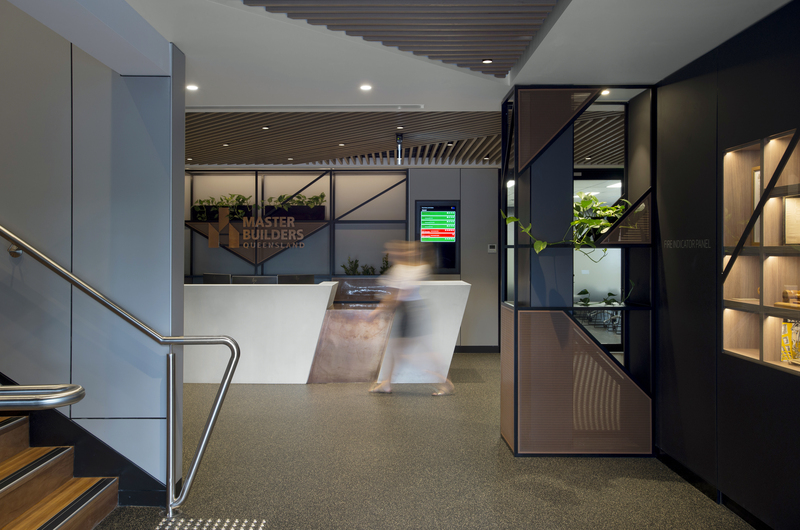 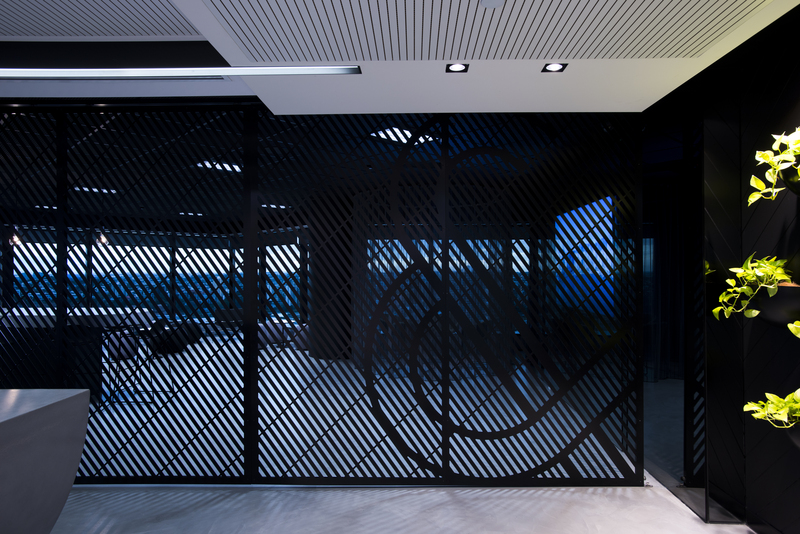 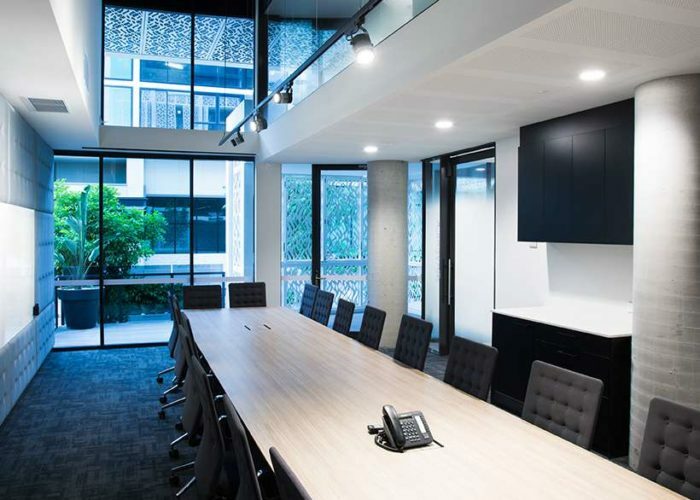 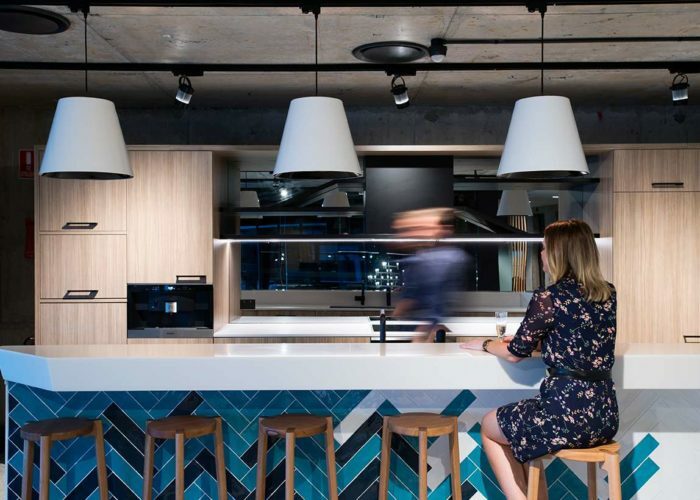 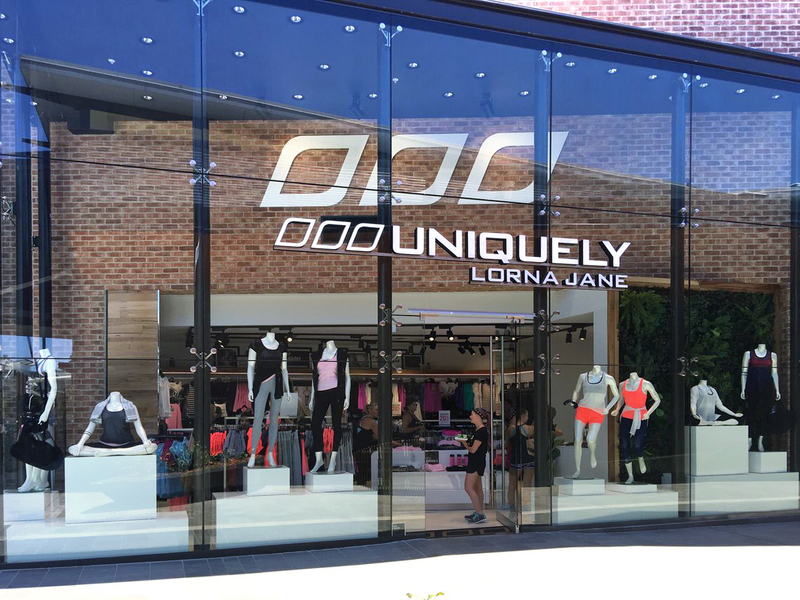 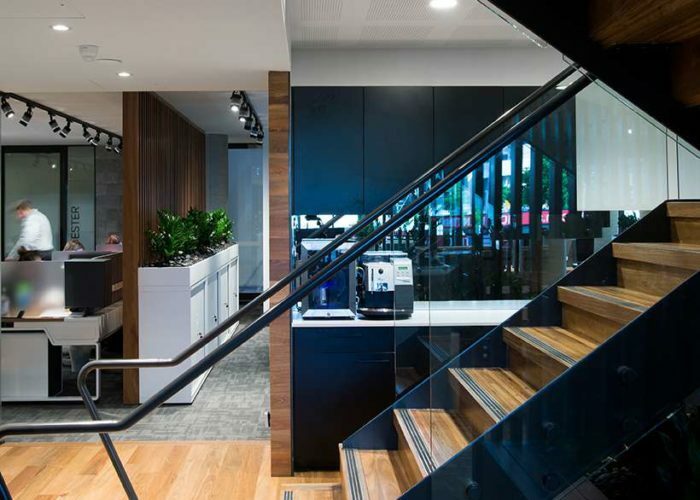 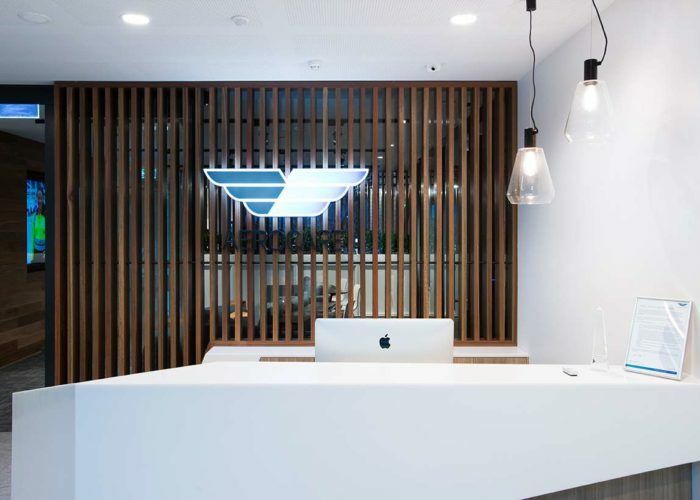 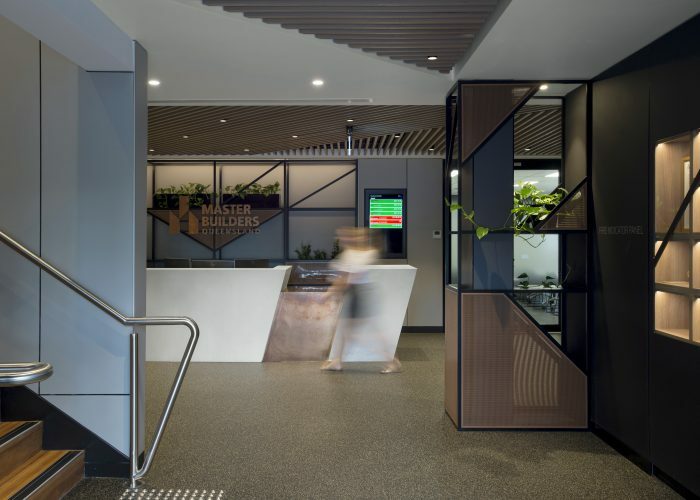 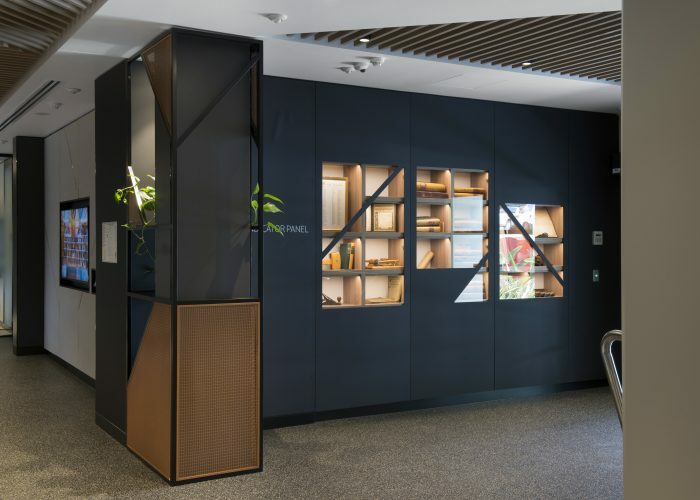 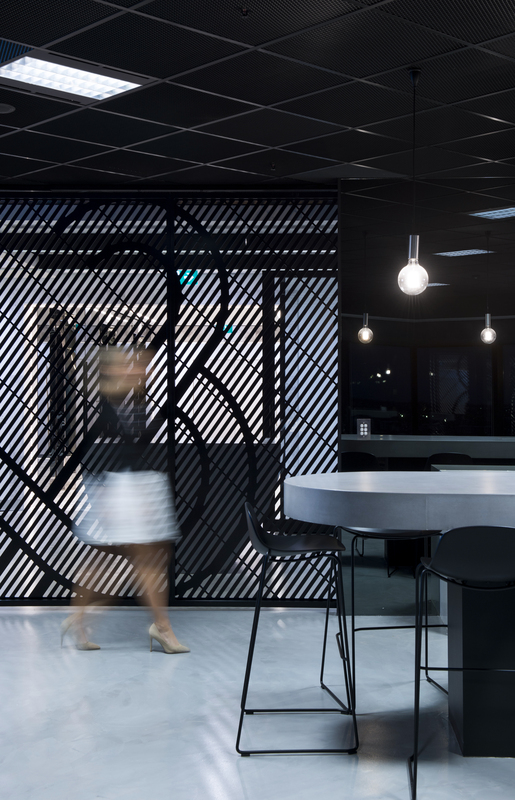 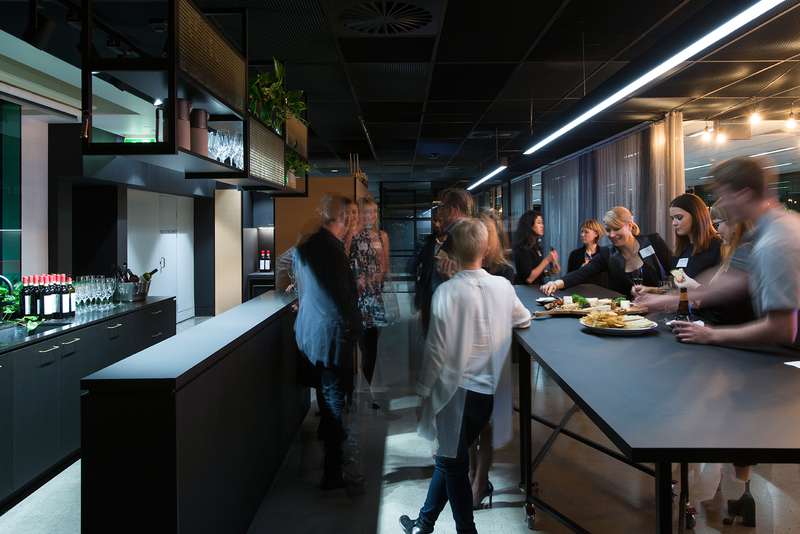 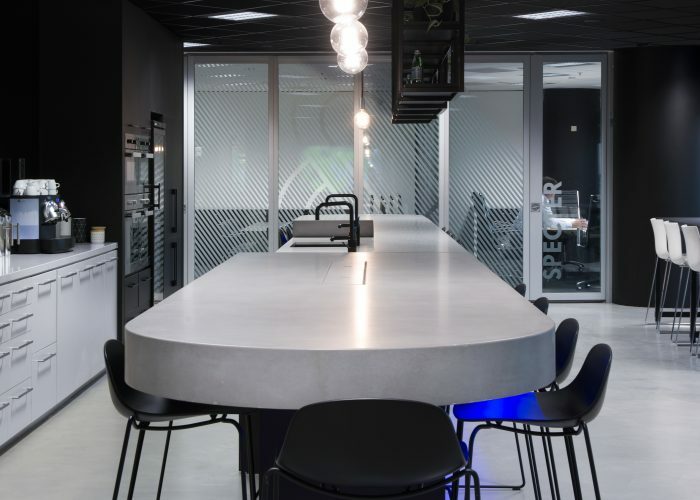 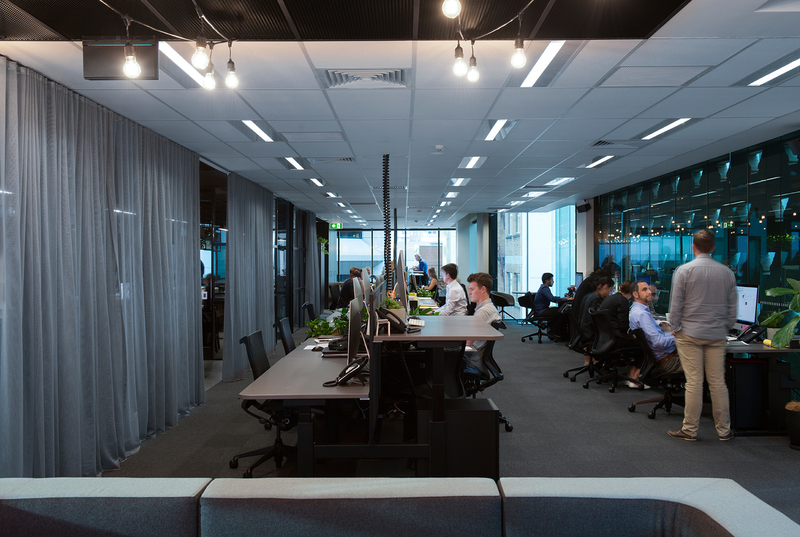 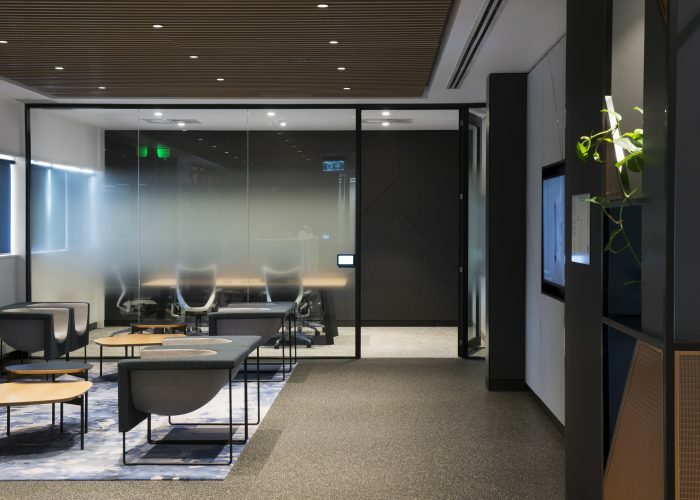 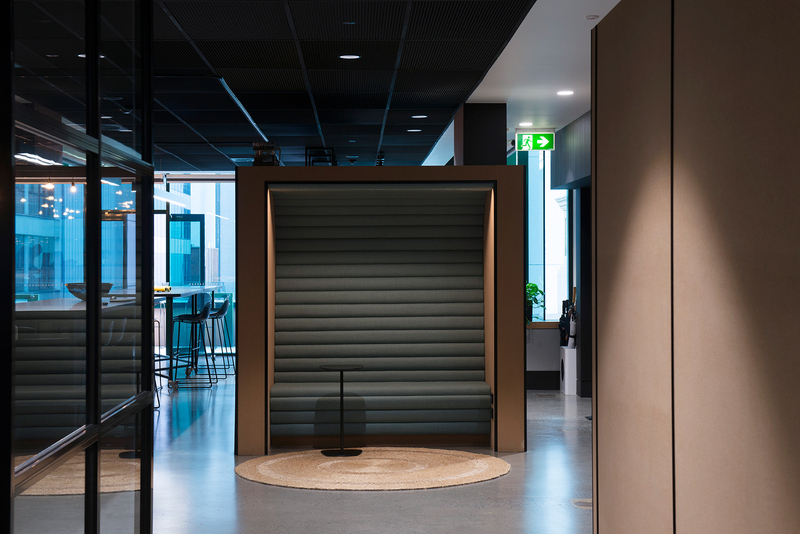 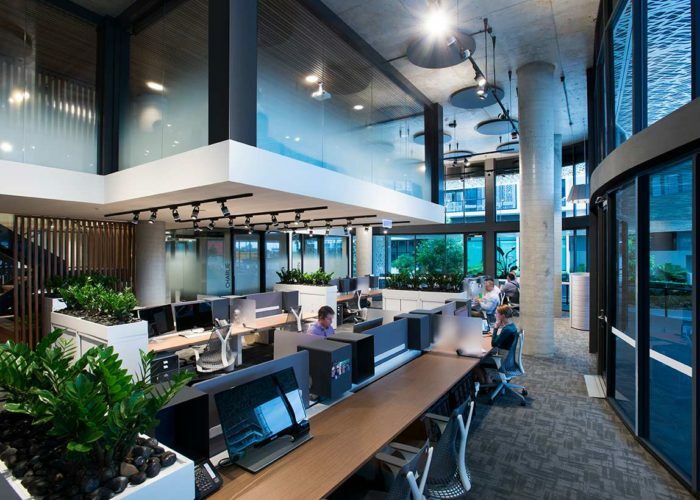 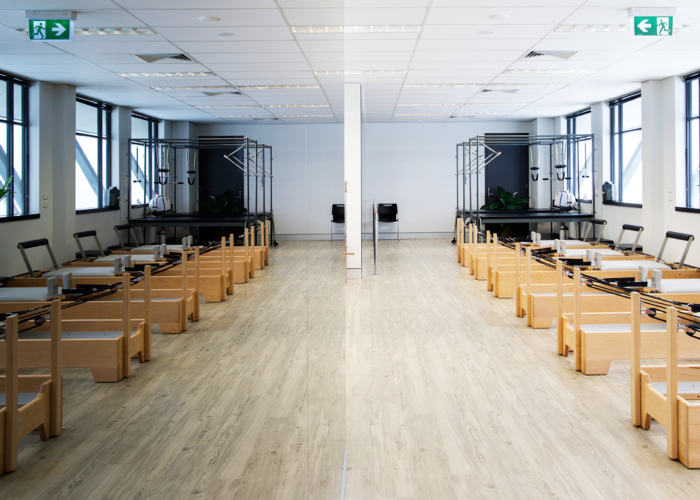 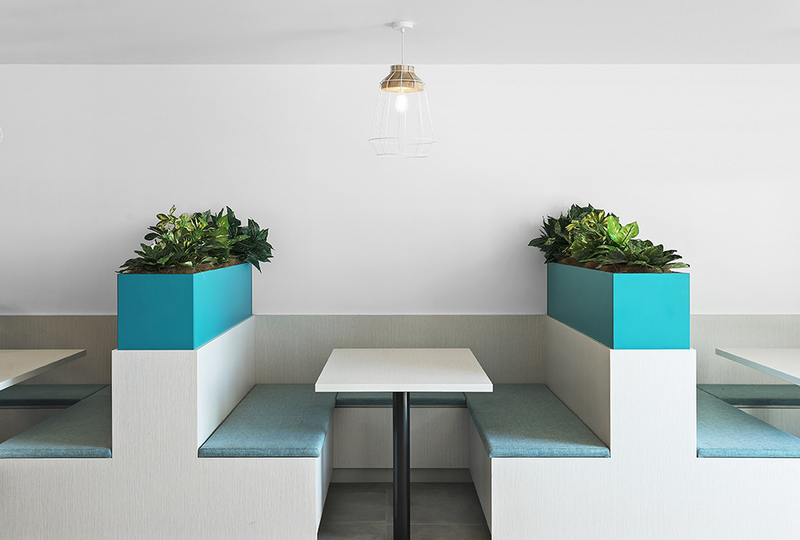 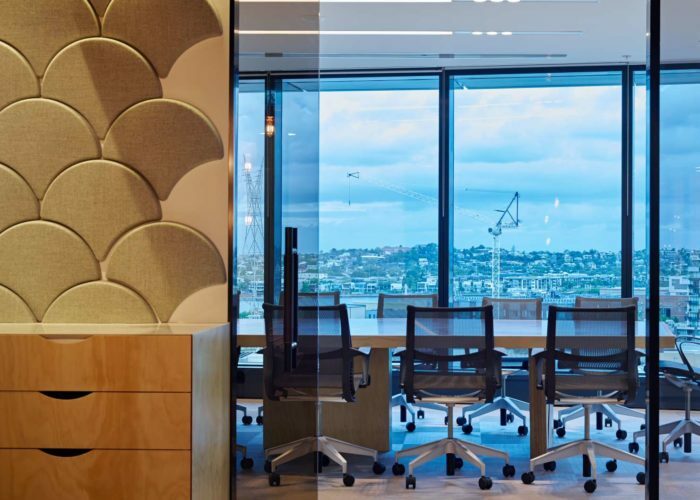 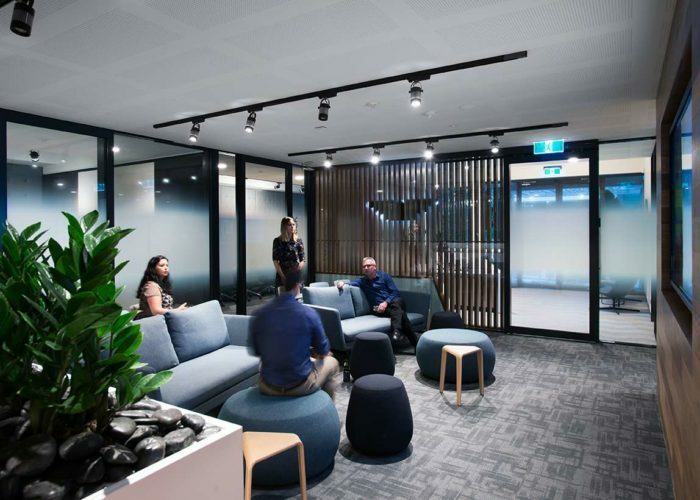 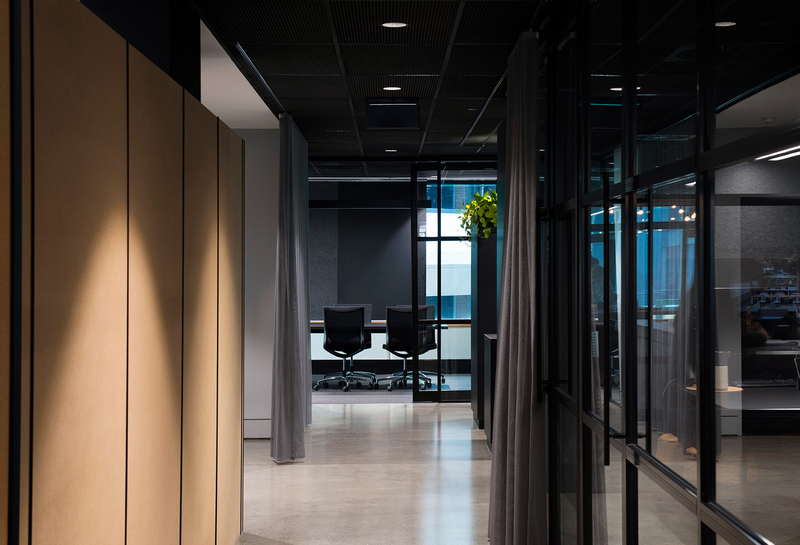 Lorna Jane sought our guidance to update, professionalise and re-energise their brand through a number of fitouts Austalia wide. 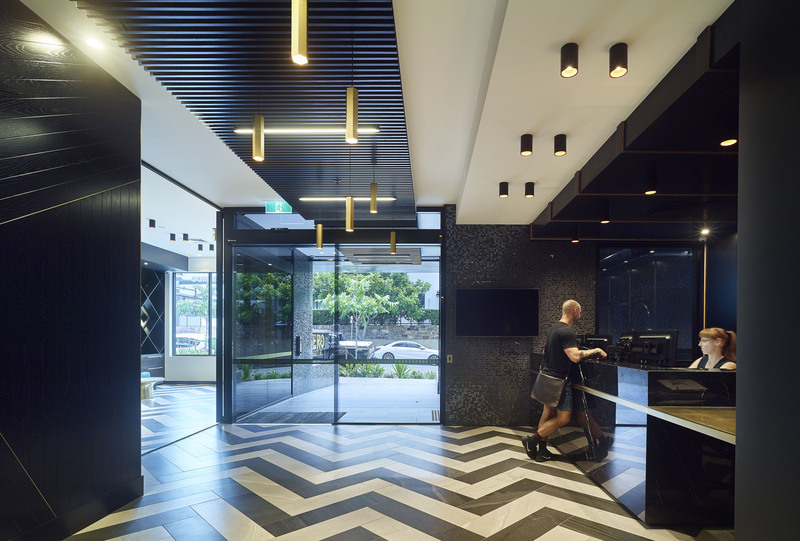 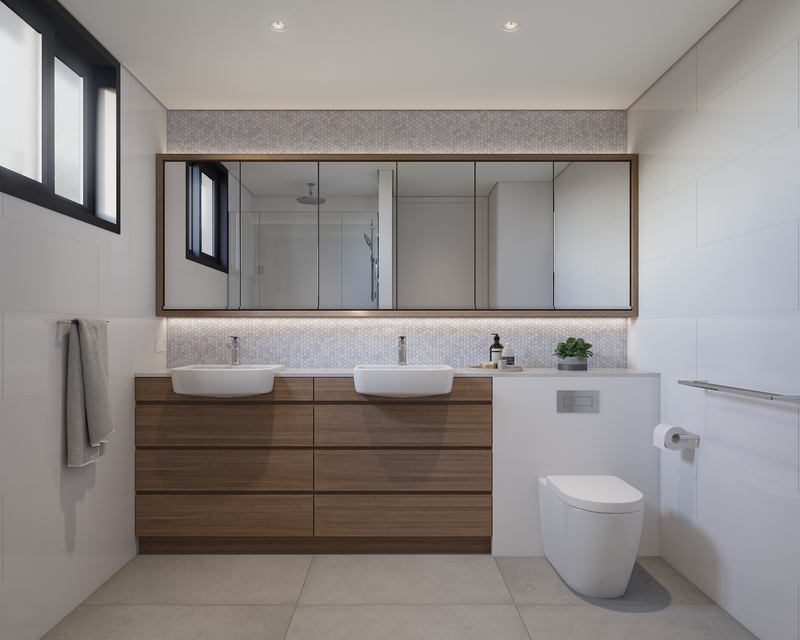 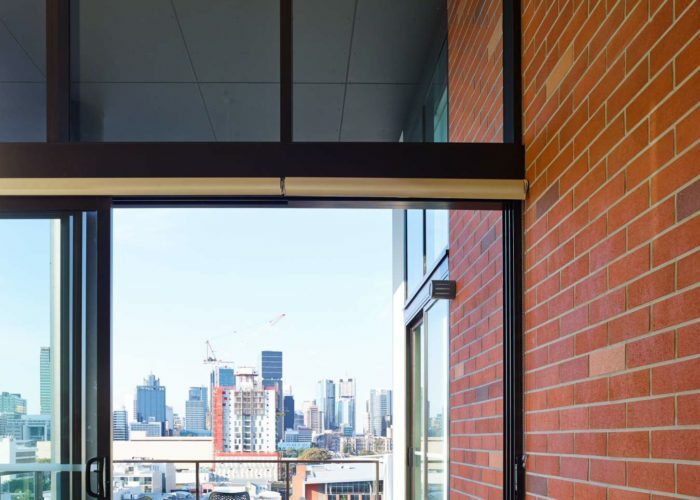 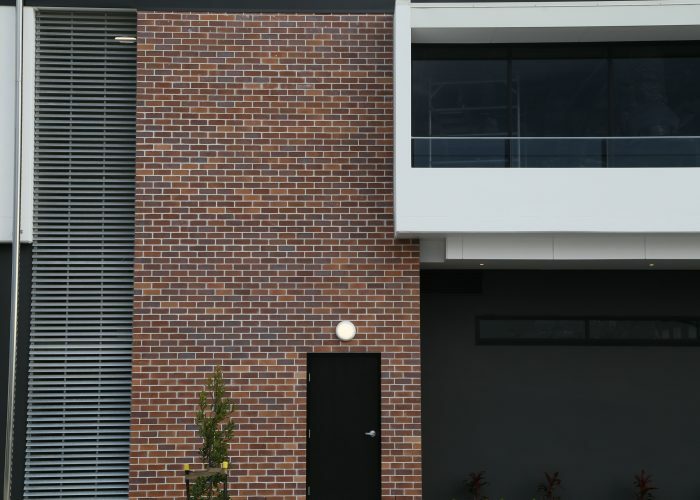 The articulated building form and selection of materials including white tiled archways and classic red brick, nod at Petrie Terrace’s industrial past and highlights the elegance of the surrounding heritage brick and stone buildings. 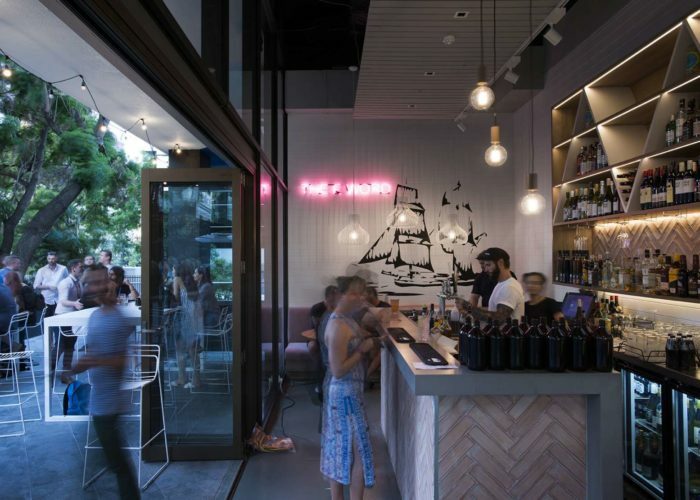 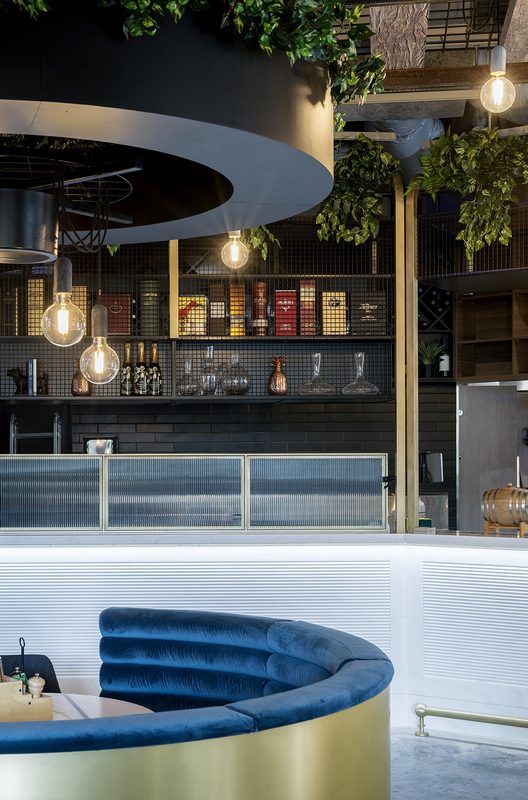 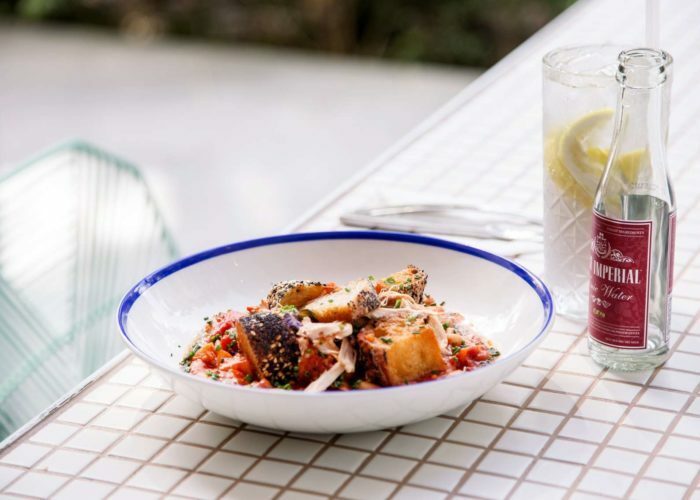 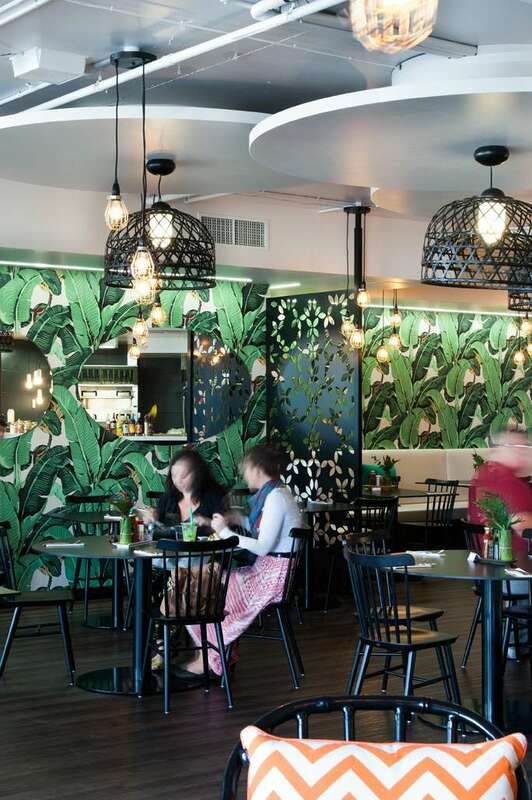 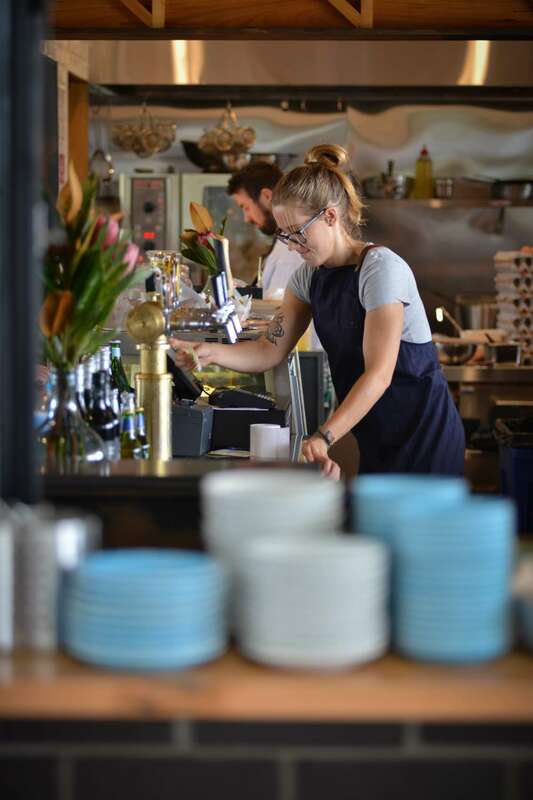 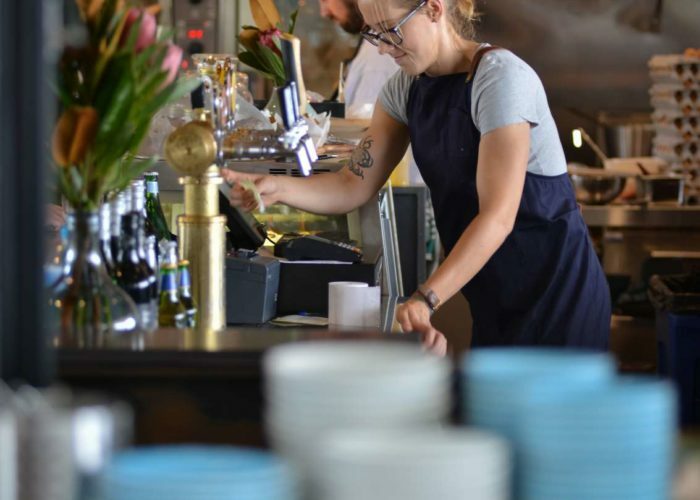 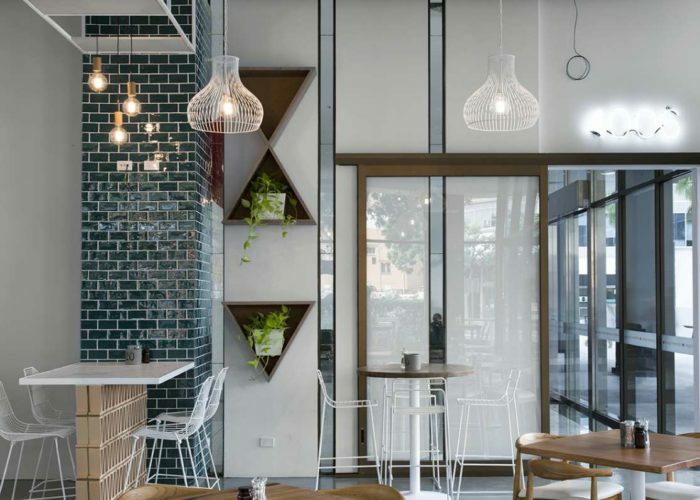 Petrie Terrace, wedged between the CBD, Milton and Paddington, is rapidly becoming a hot spot for after-work drinks, evening dining and weekend catch-ups from young professionals to inner-city workers. 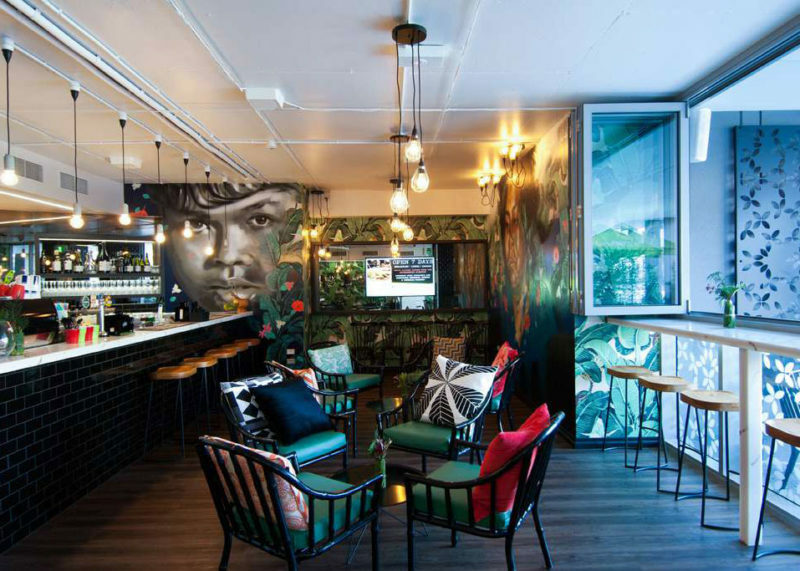 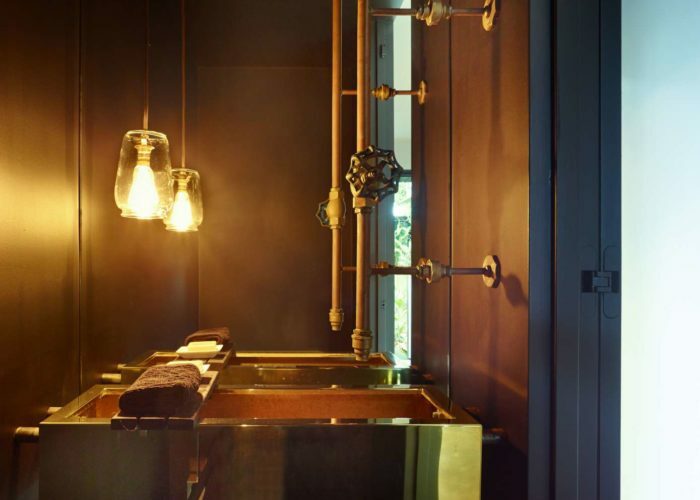 Growing tired of the existing ordinary hotel offerings, visitors seek a dynamic, elegant yet acquainted answer to their short-stay accommodation. 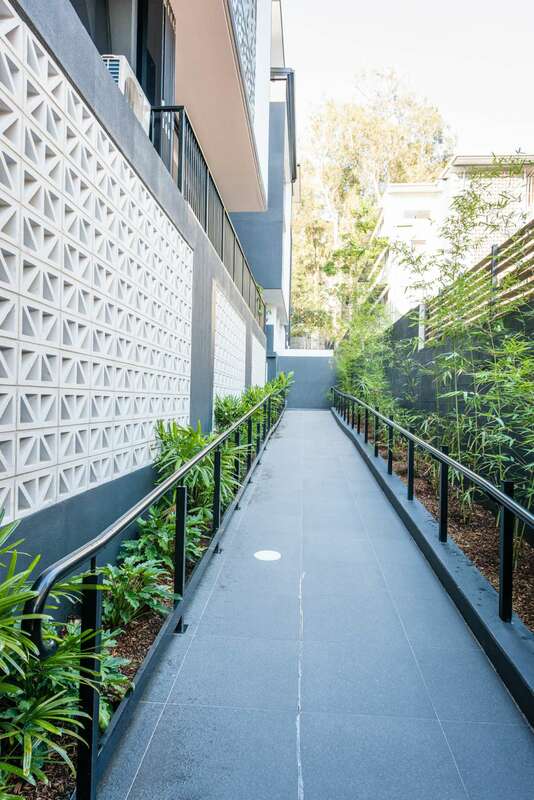 We felt it only fitting to pay homage to the cultural background of Petrie Terrace. 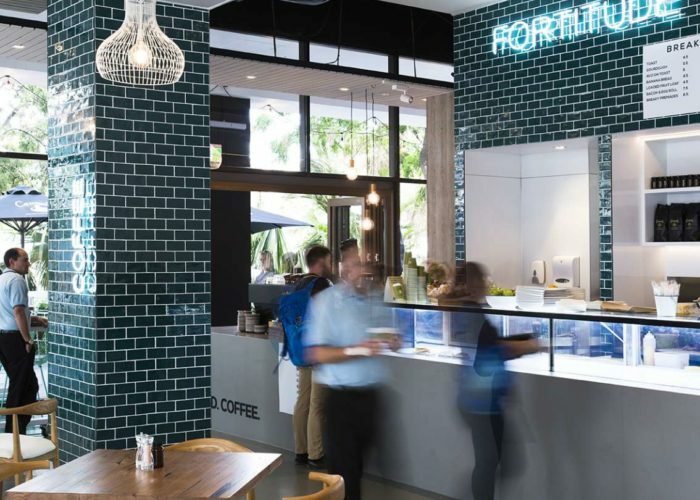 The articulated building form and selection of materials including white tiled archways and classic red brick, nod at Petrie Terrace’s industrial past and highlights the elegance of the surrounding heritage brick and stone buildings. 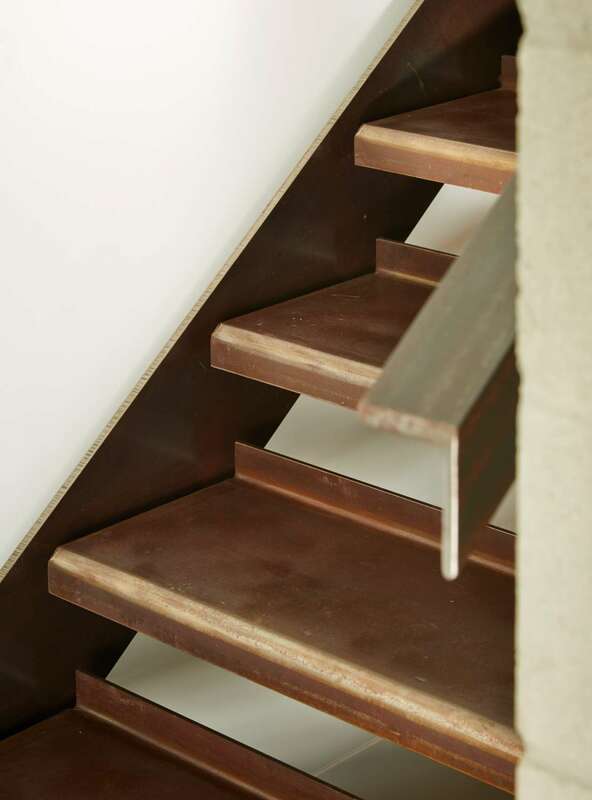 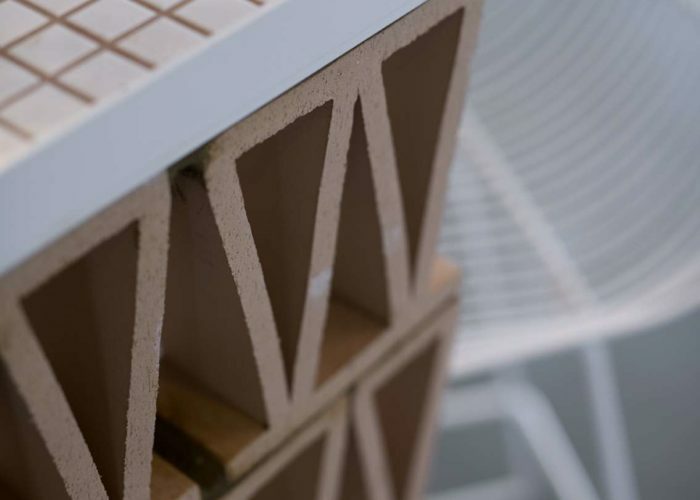 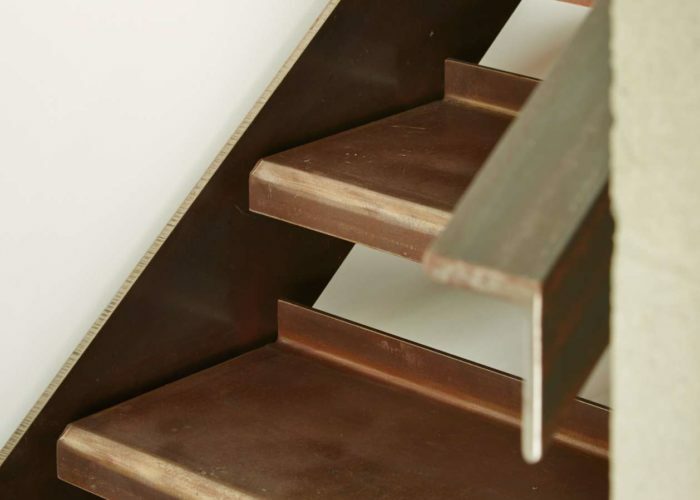 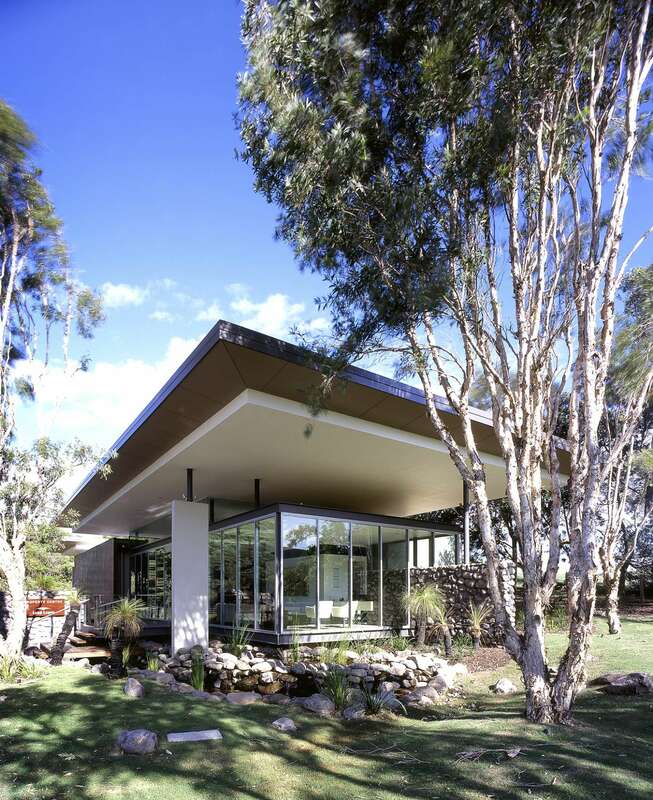 What material do you use to build a home with for a guy in the concreting business? Concrete of course. 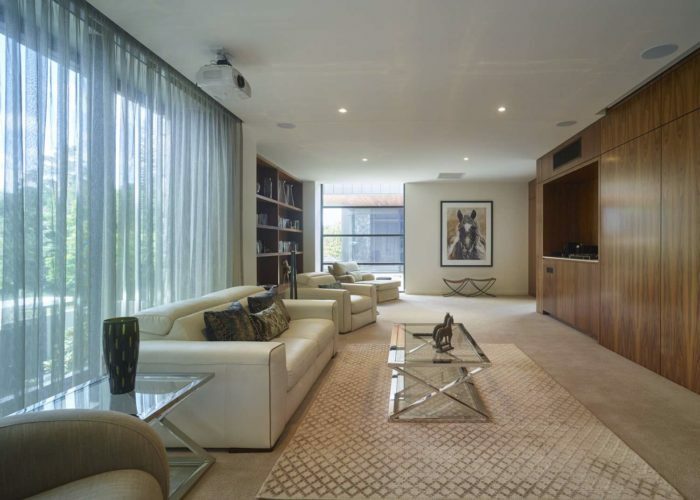 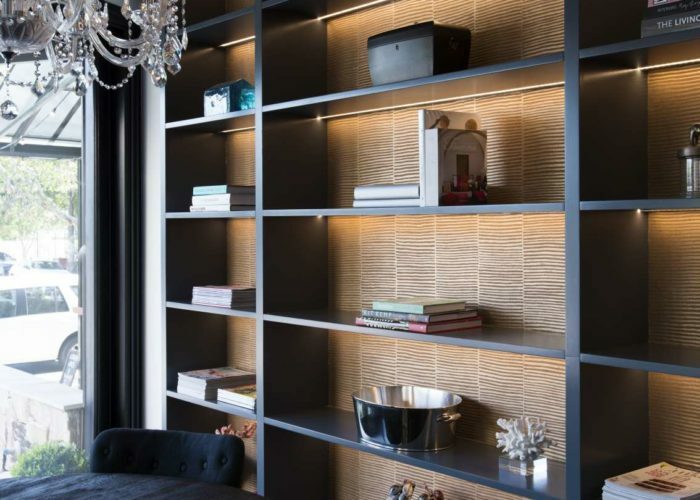 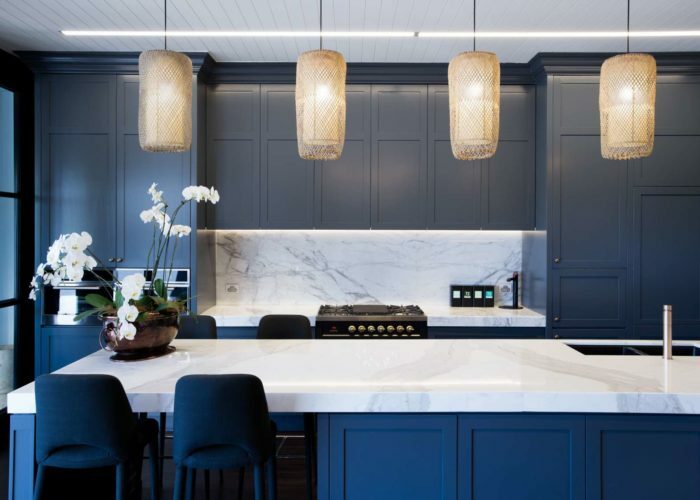 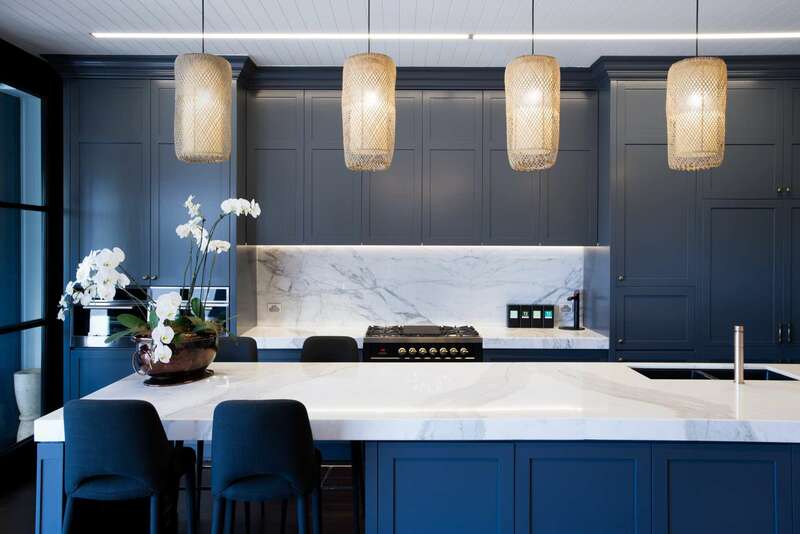 In this generous family home, we were able to celebrate our client’s connection with this eternal material but also making sure that the other needs of the family were catered for. 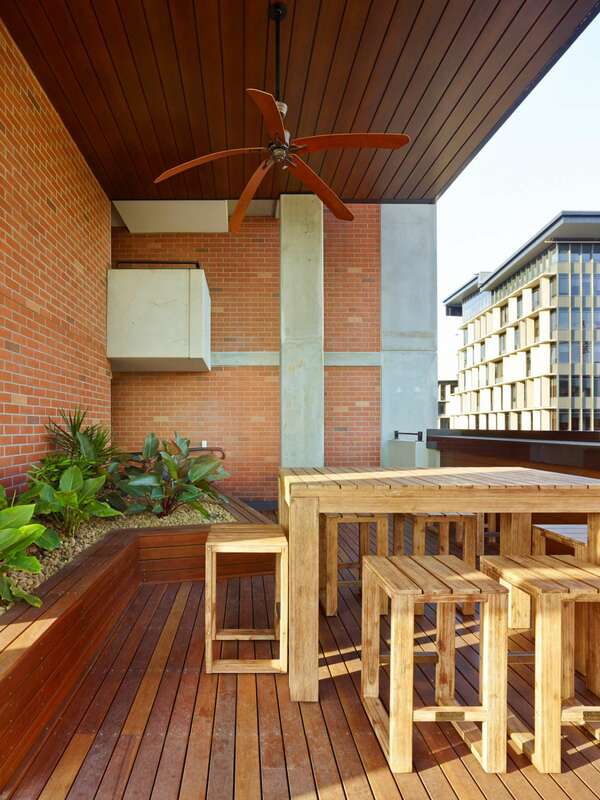 A simple crucifix form created four courtyards for different outdoor activities. 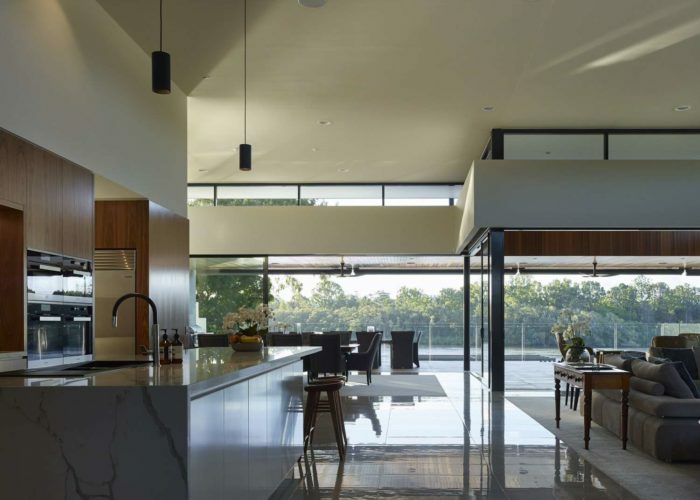 In the centre of the cross is the kitchen-the “command centre” of the modern family unit. 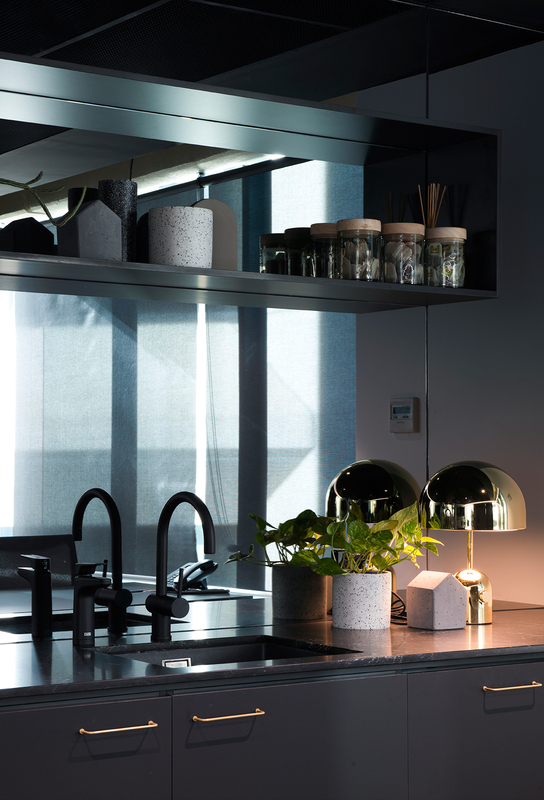 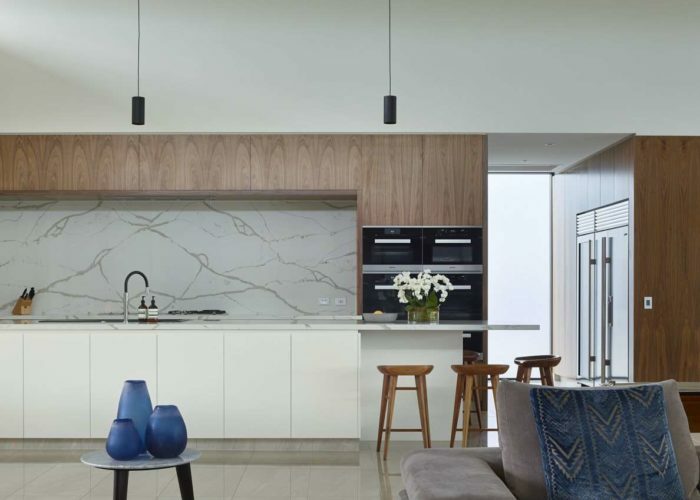 Everything radiates out from the kitchen hub to the more private spaces within the home. 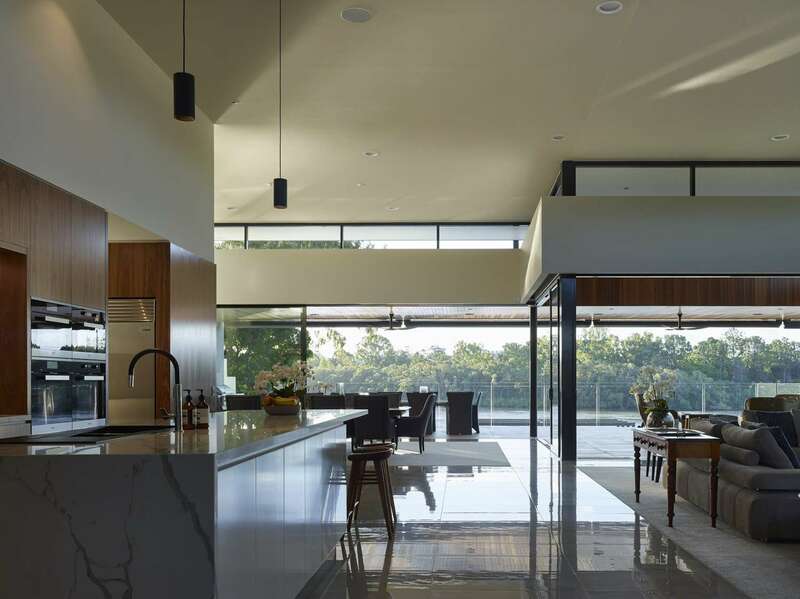 Kids have their own wing to run wild in, but are never too far from the kitchen for mum to keep an eye on things. 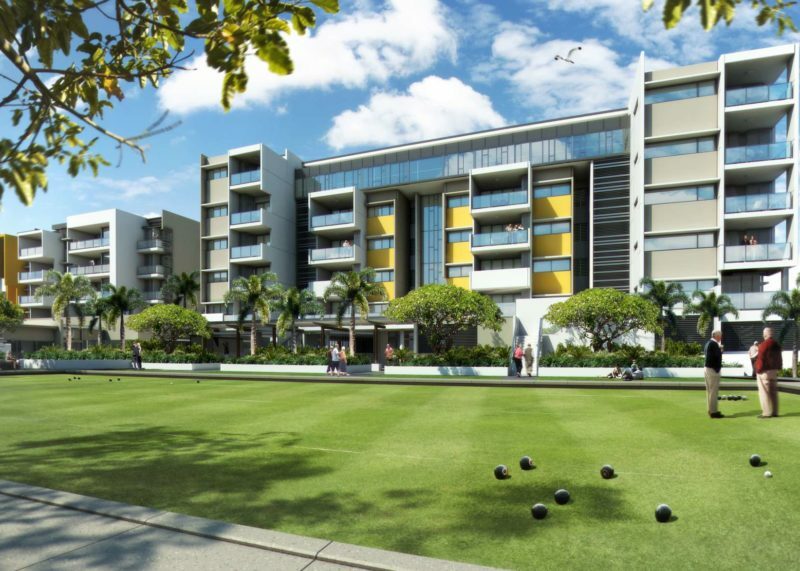 The four courtyards defined by the plan created different activity zones- a car court, pool zone, tennis court and a green space for the kids and dogs. 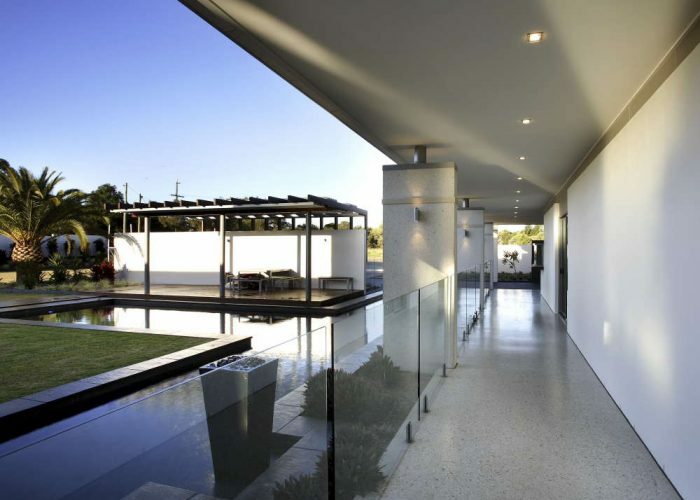 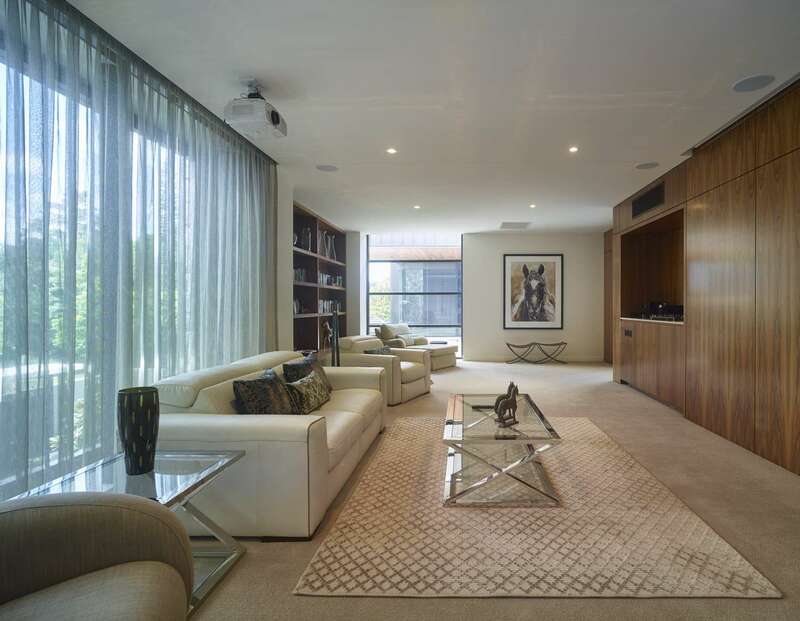 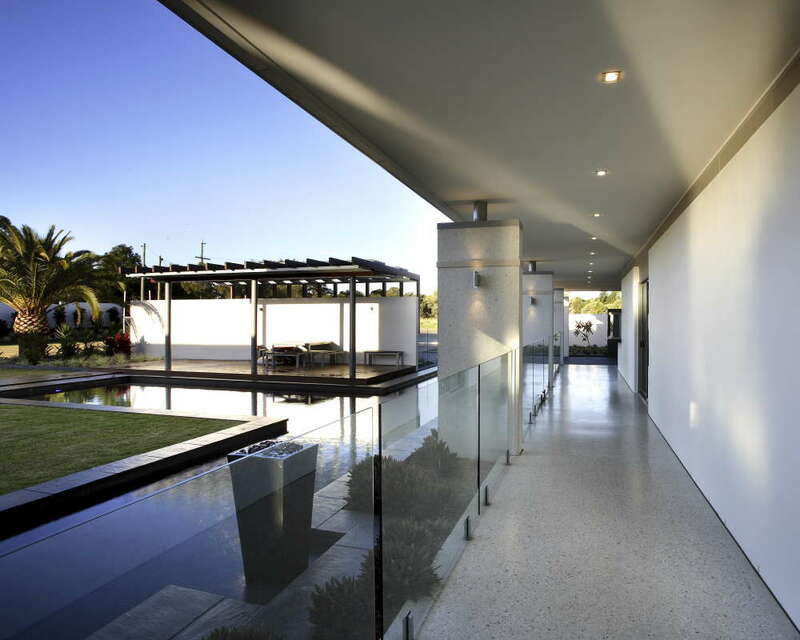 The home flows out through a generous double height terrace that is the summertime focus for outdoor living. 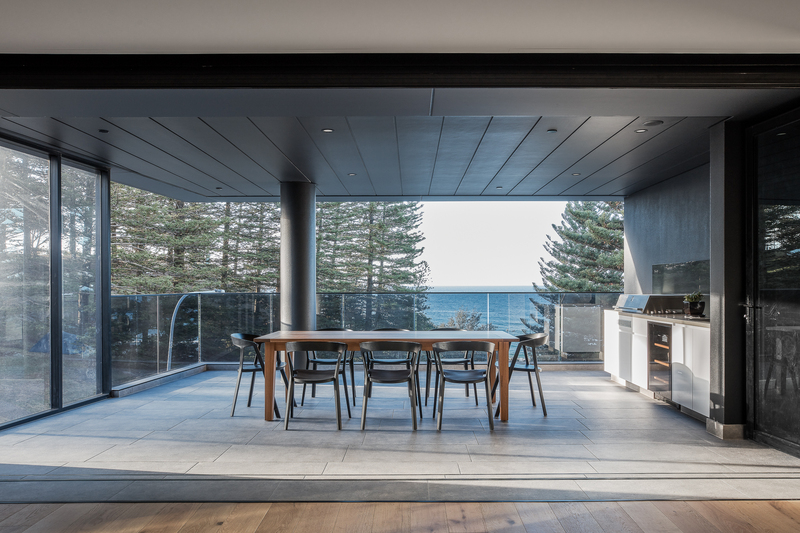 Like all our projects for individual clients, the real pleasure is seeing how the family makes the spaces their own and really engage with the architecture. 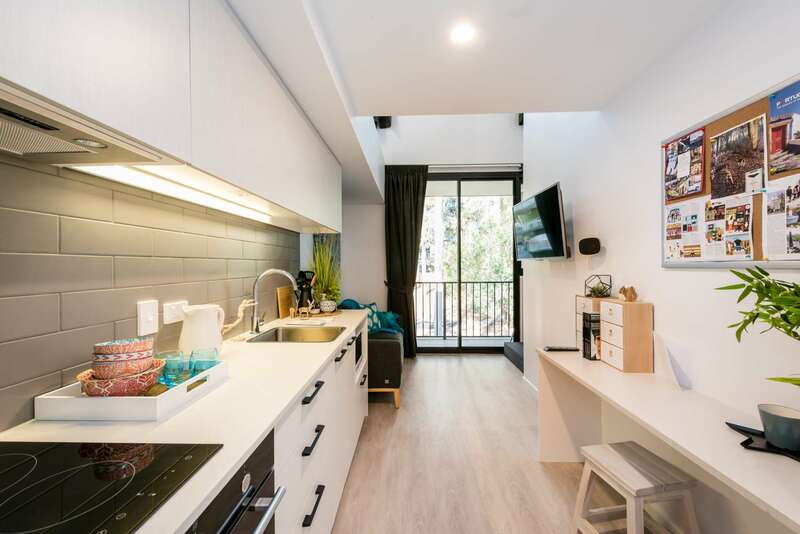 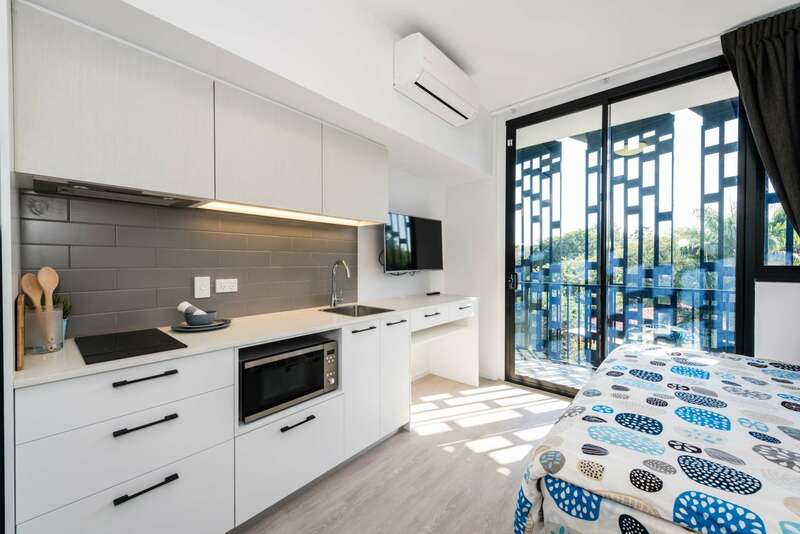 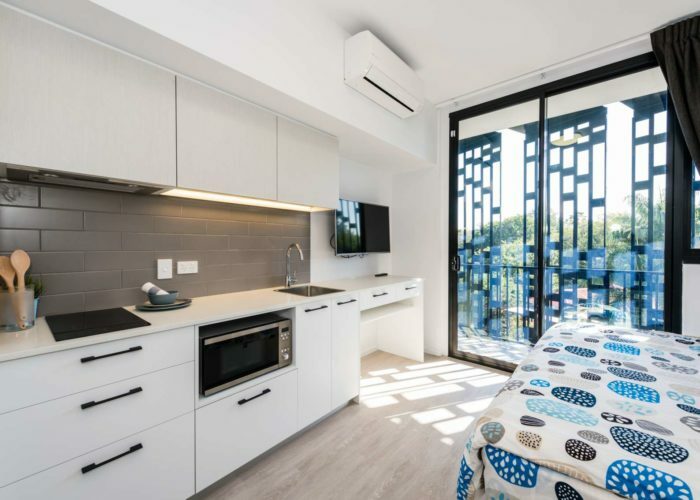 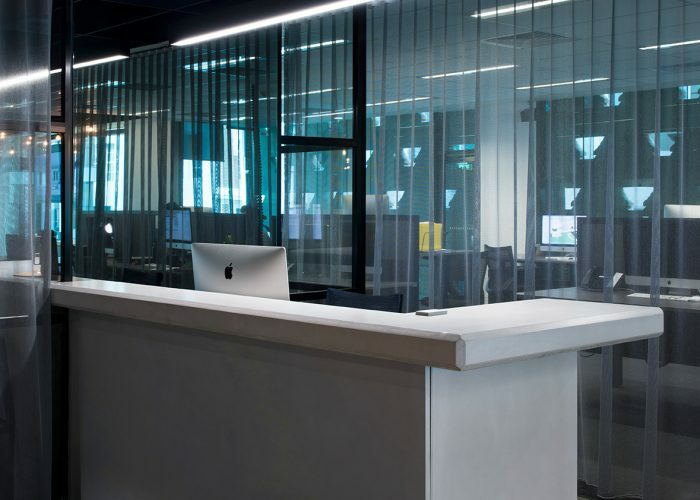 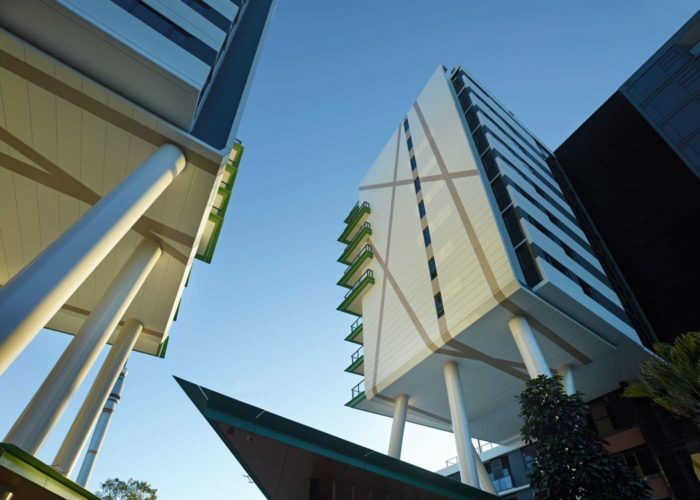 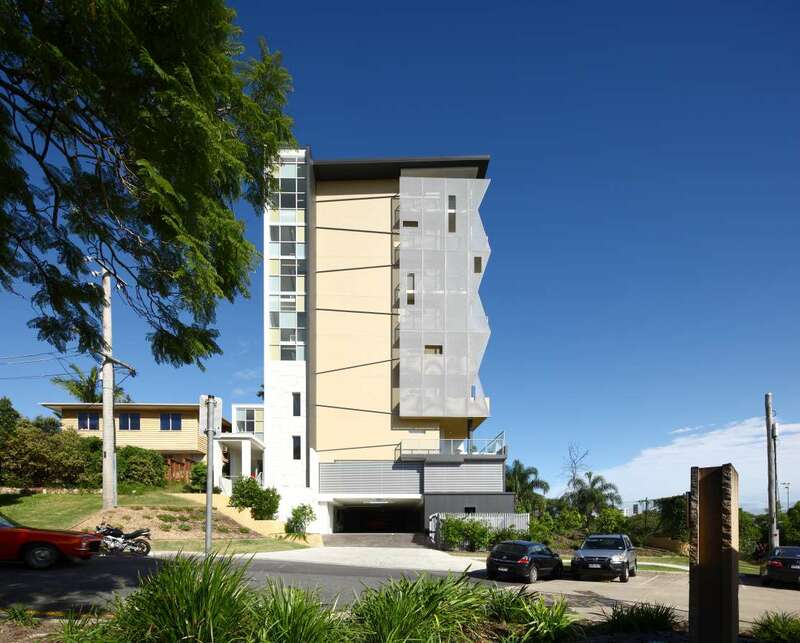 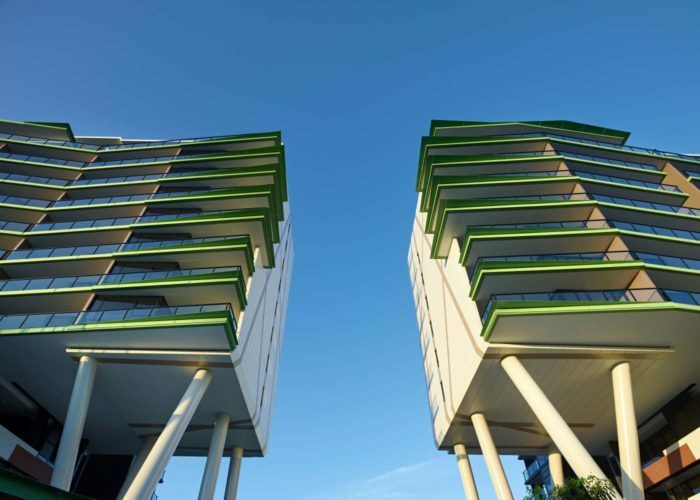 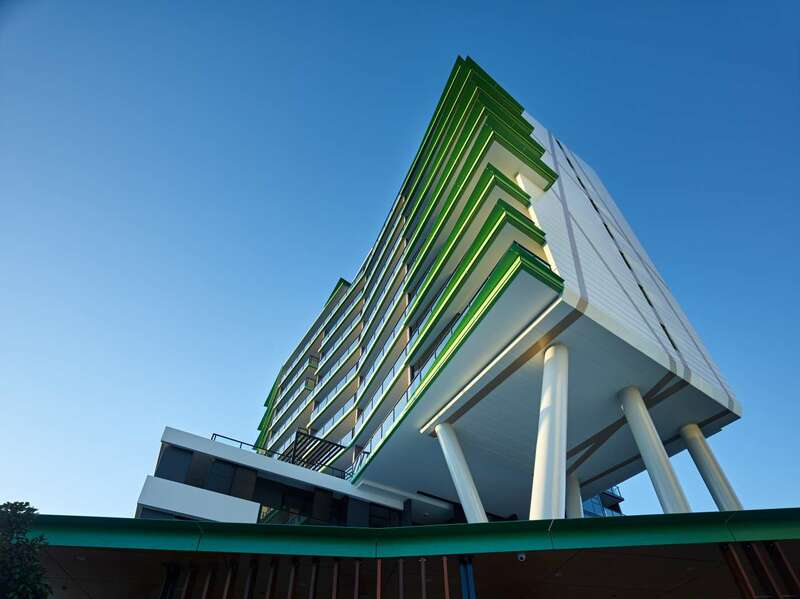 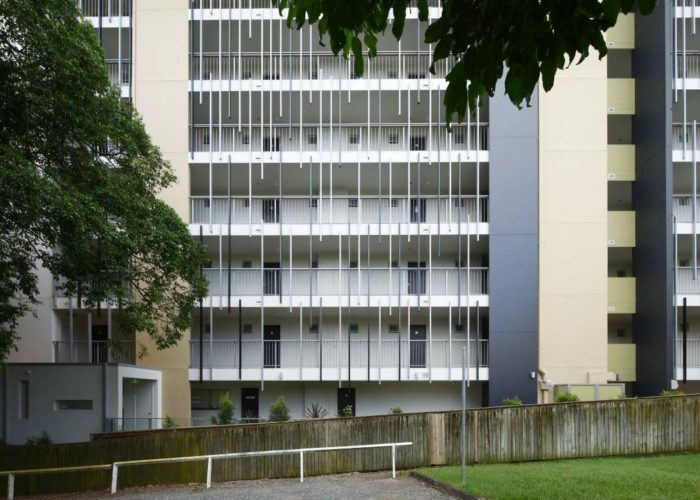 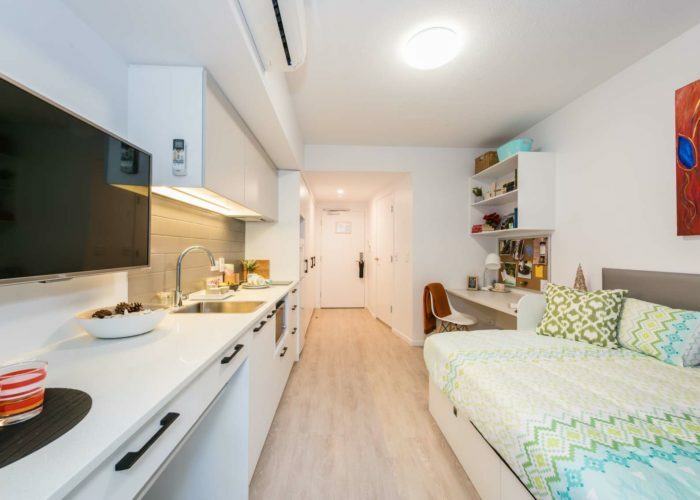 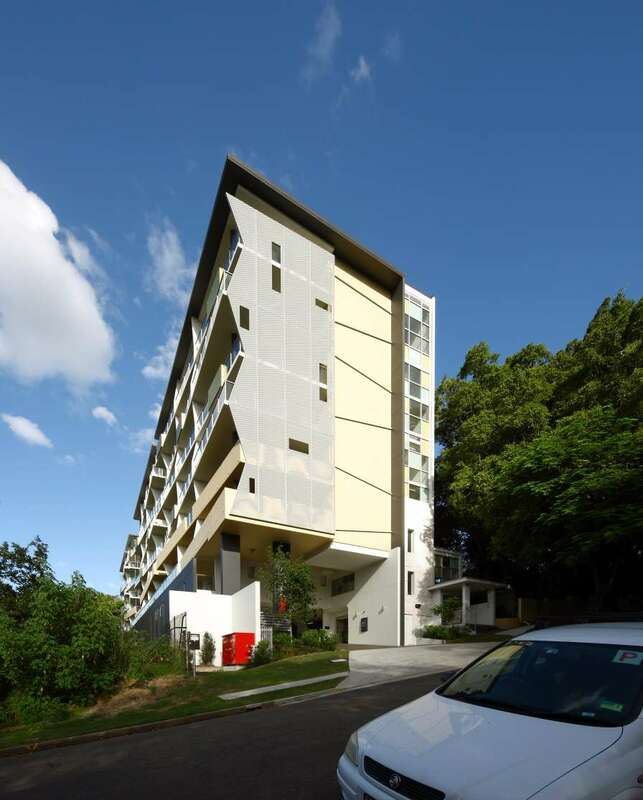 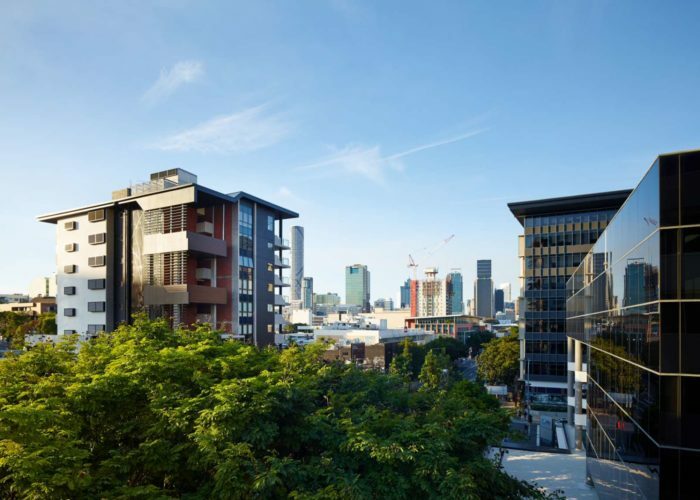 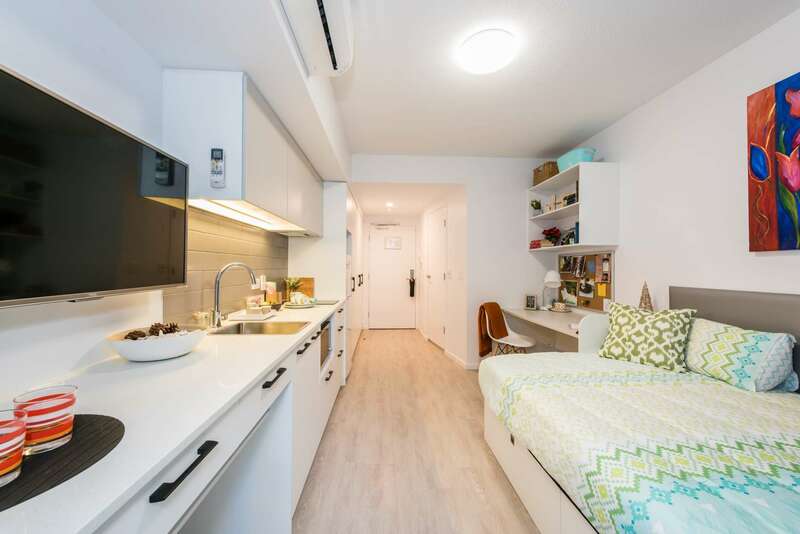 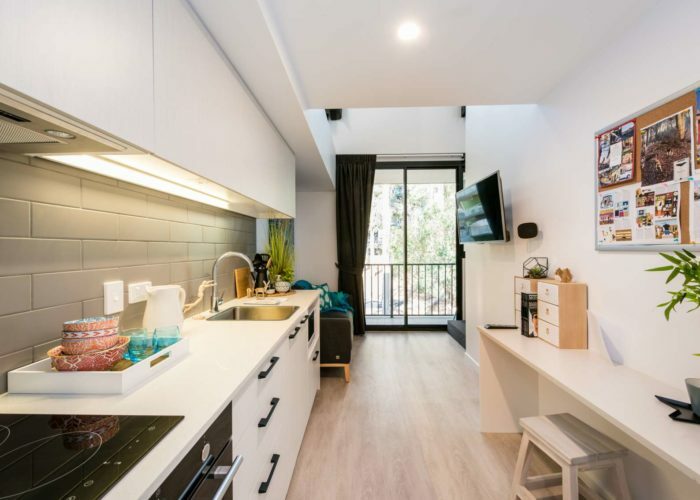 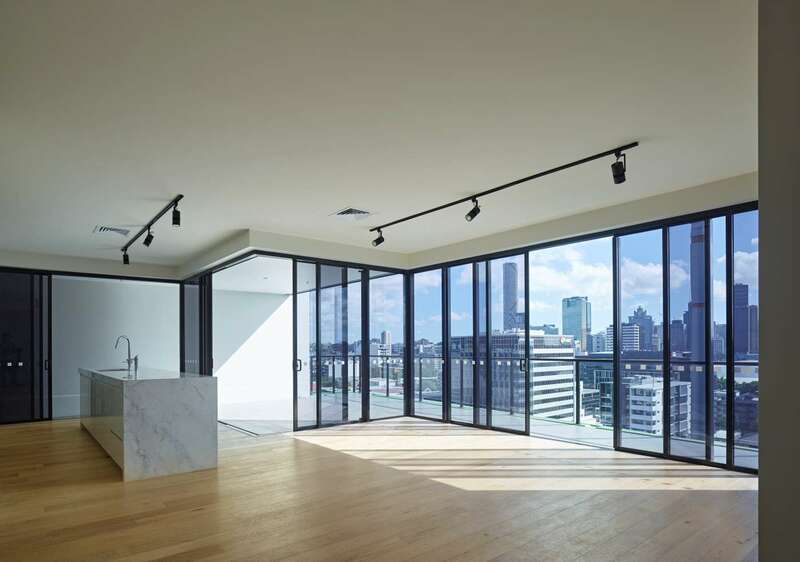 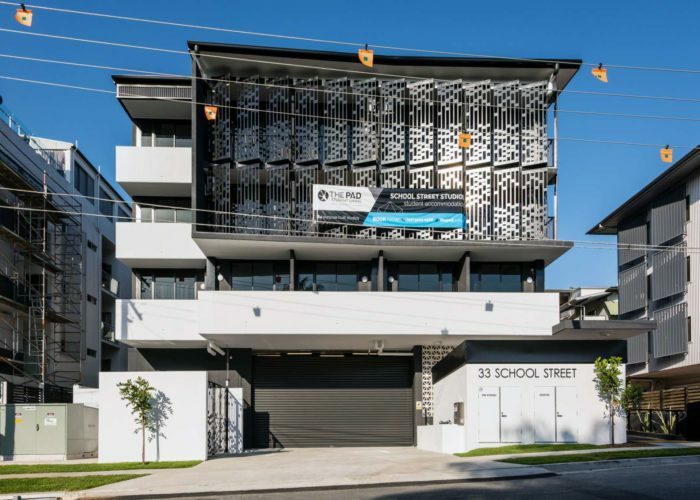 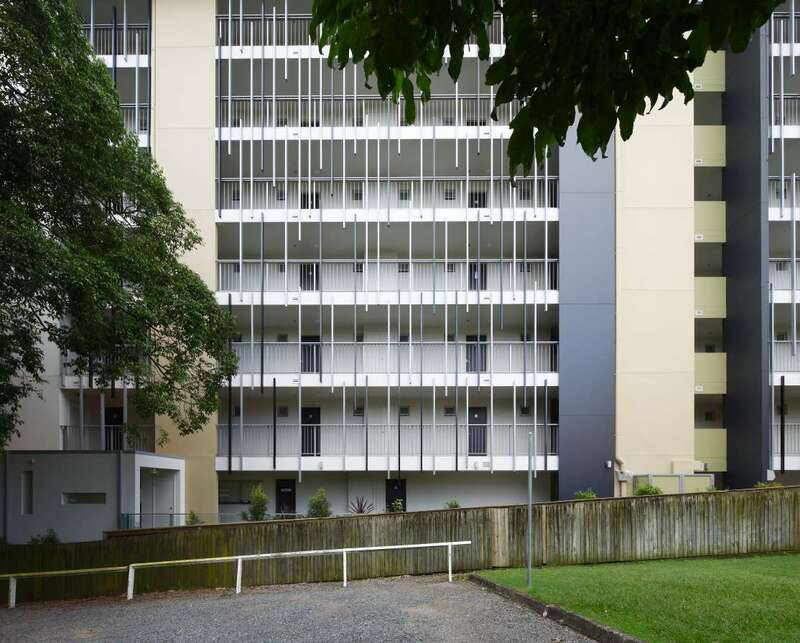 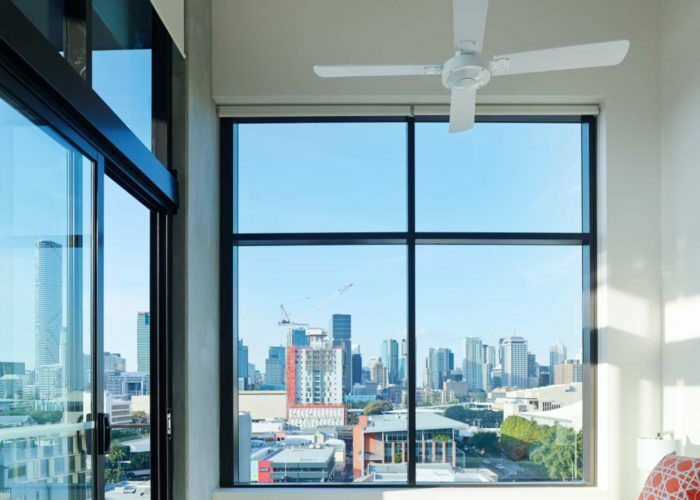 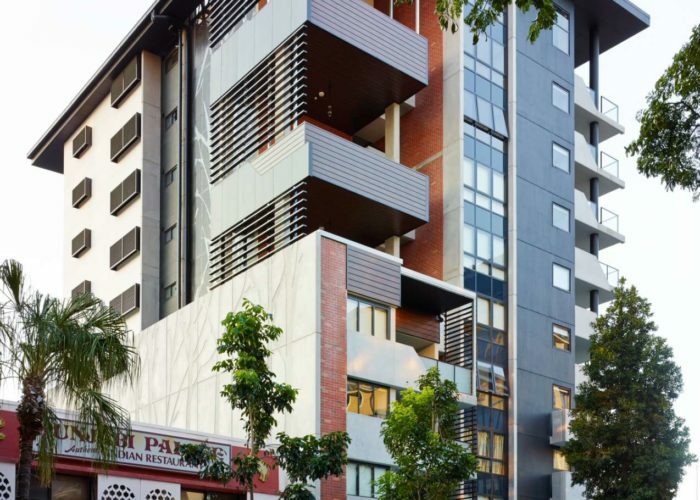 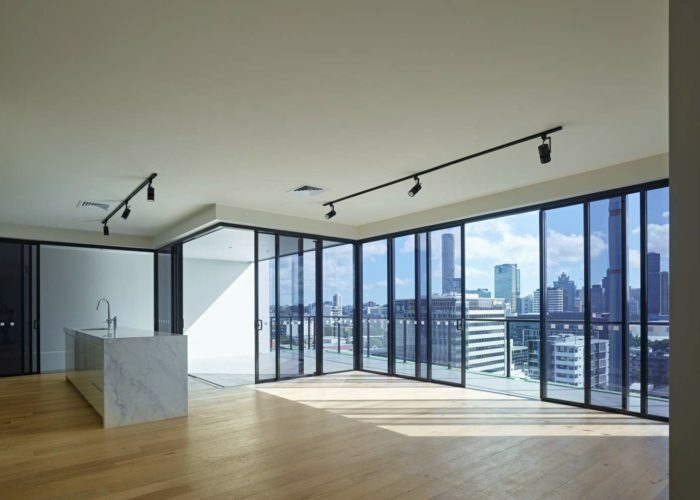 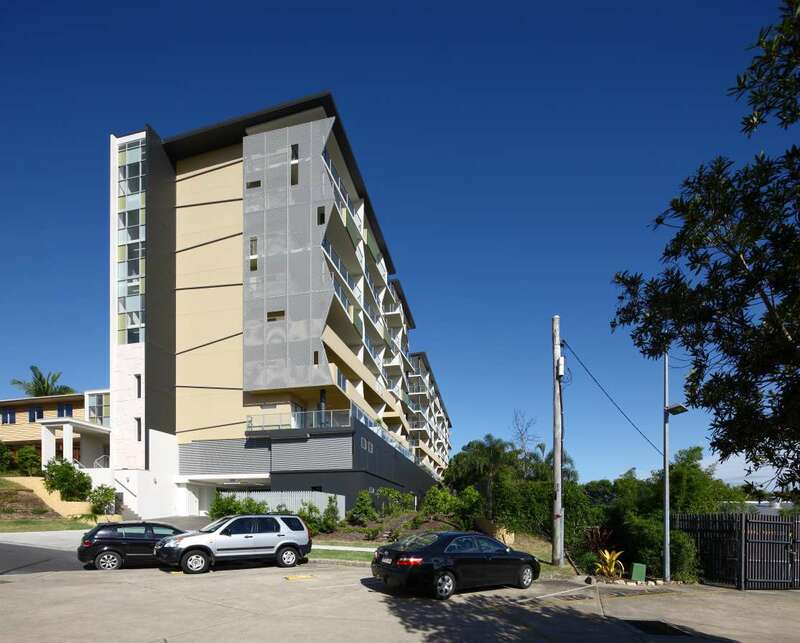 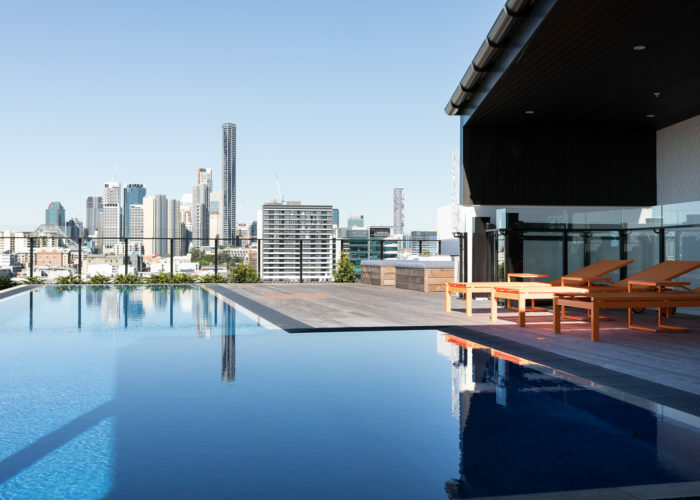 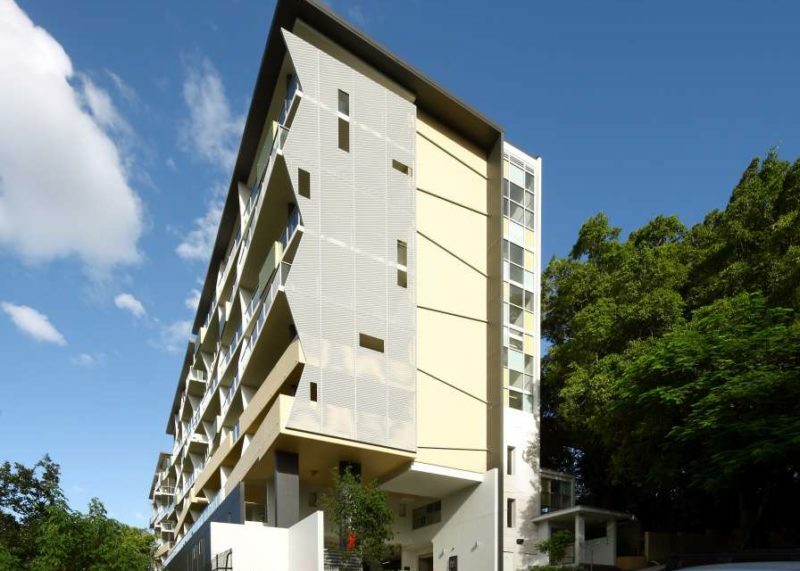 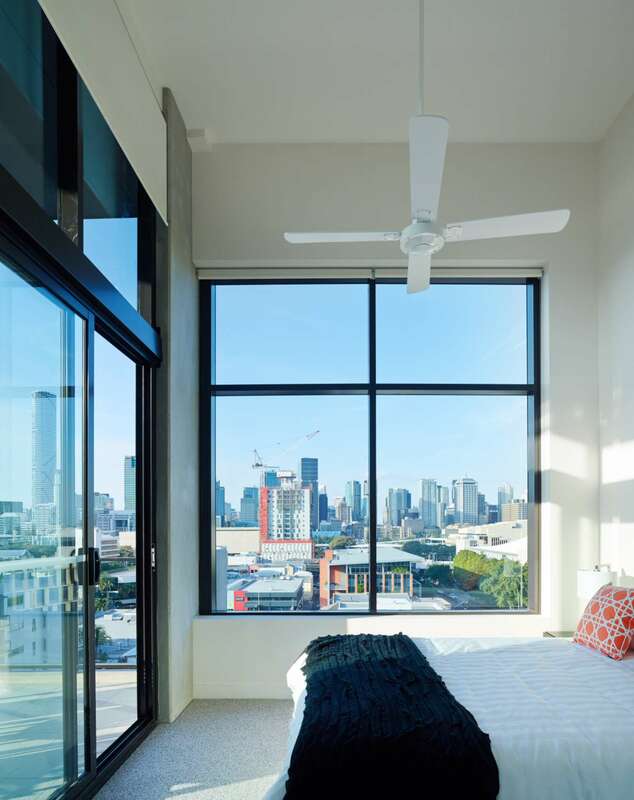 The demand for student accommodation has boomed on the back of Councils drive to make Brisbane one of the most desirable higher education centres in South East Asia. 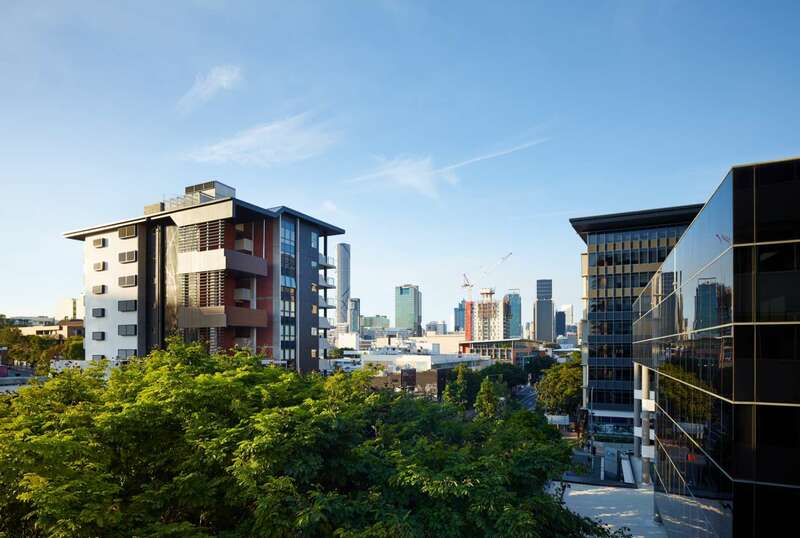 As the demand has grown, a wide range of developers have answered the call to house a diverse demographic into facilities near our educational hubs. 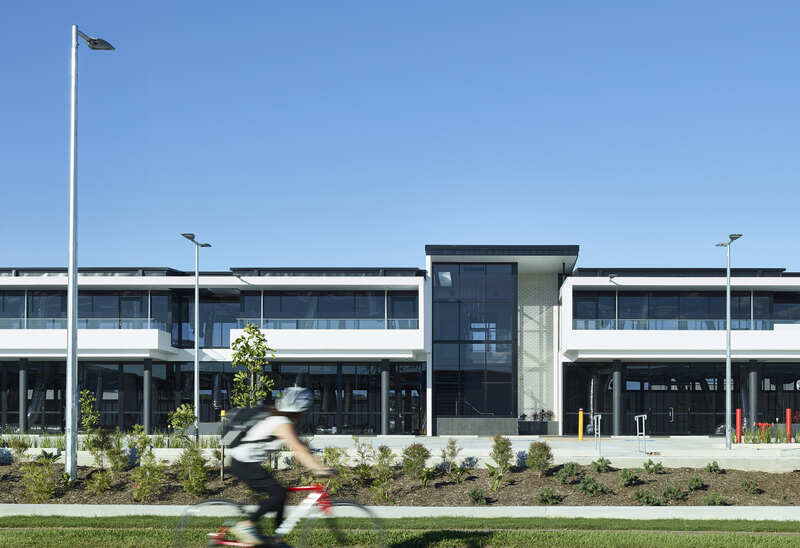 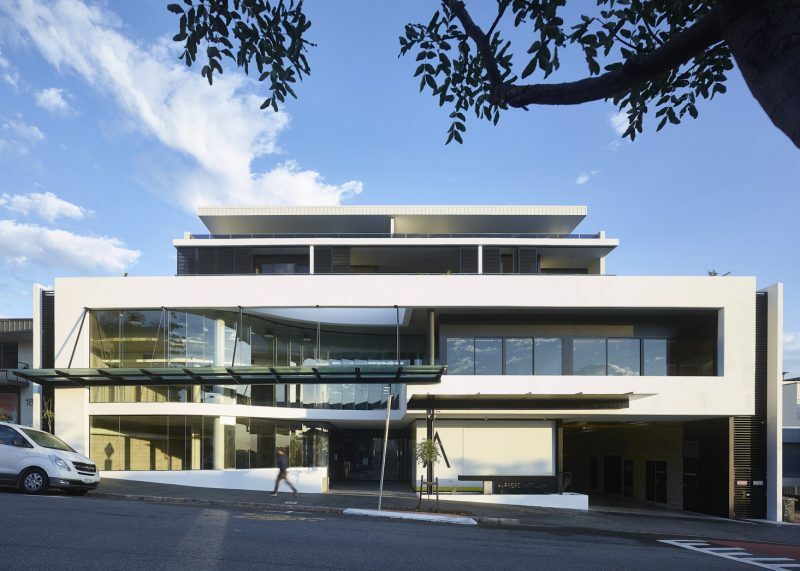 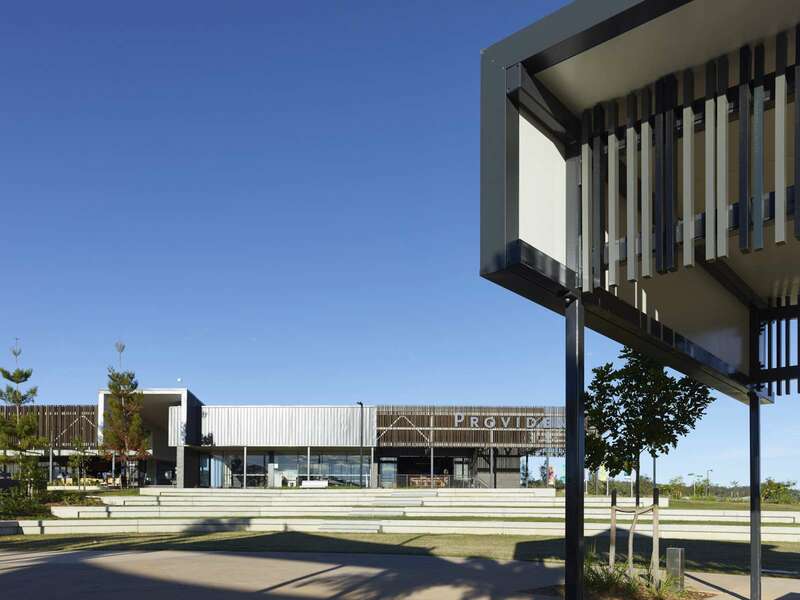 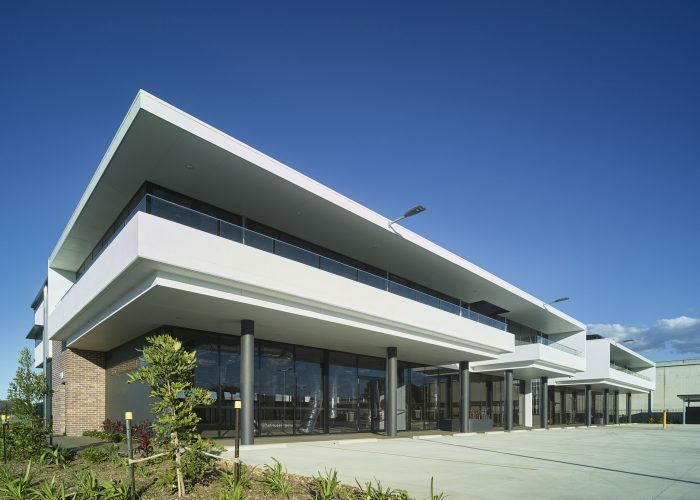 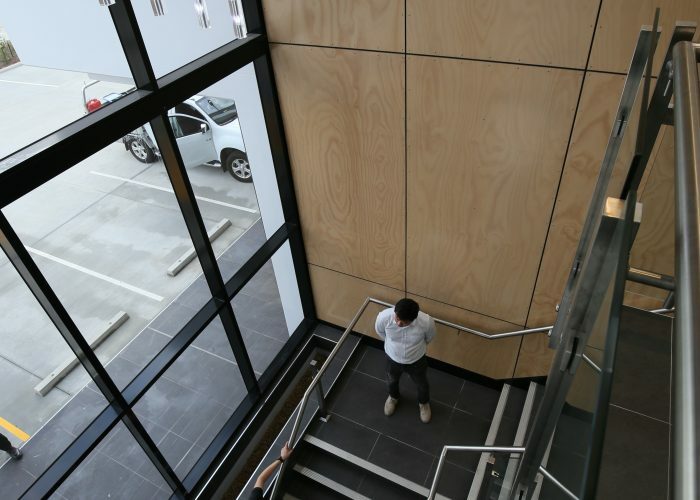 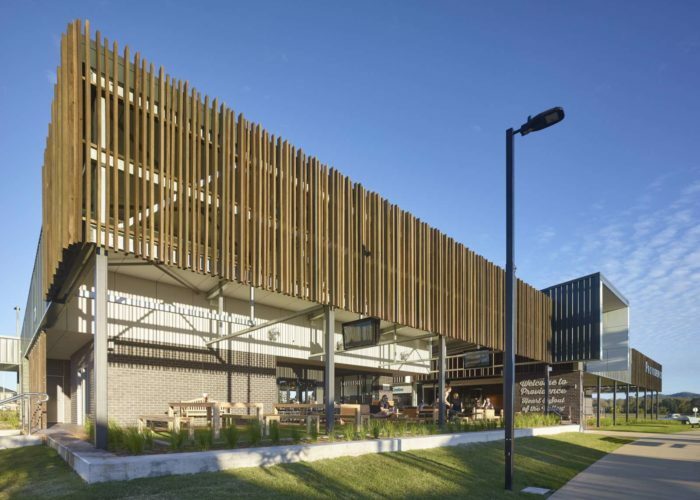 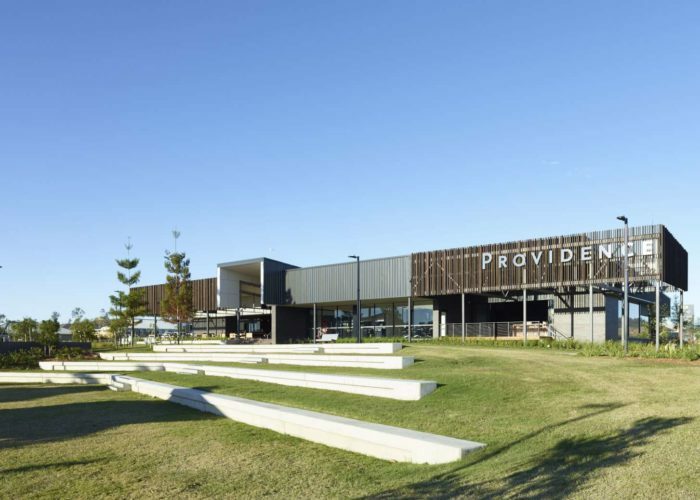 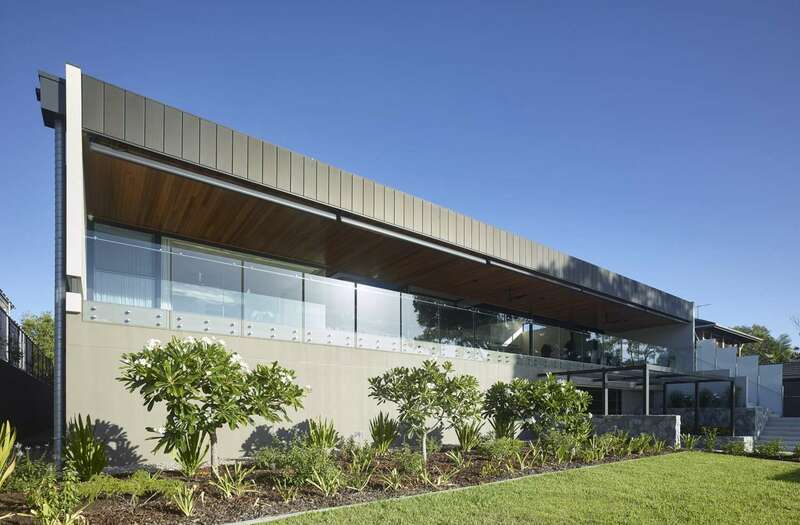 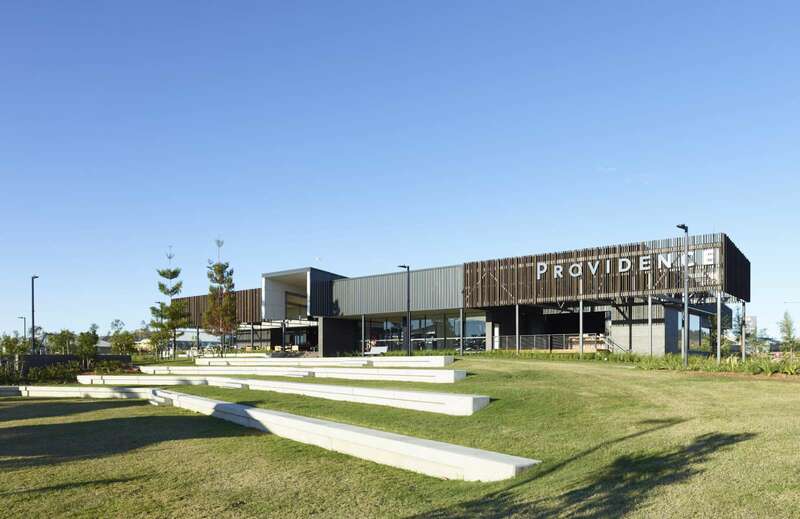 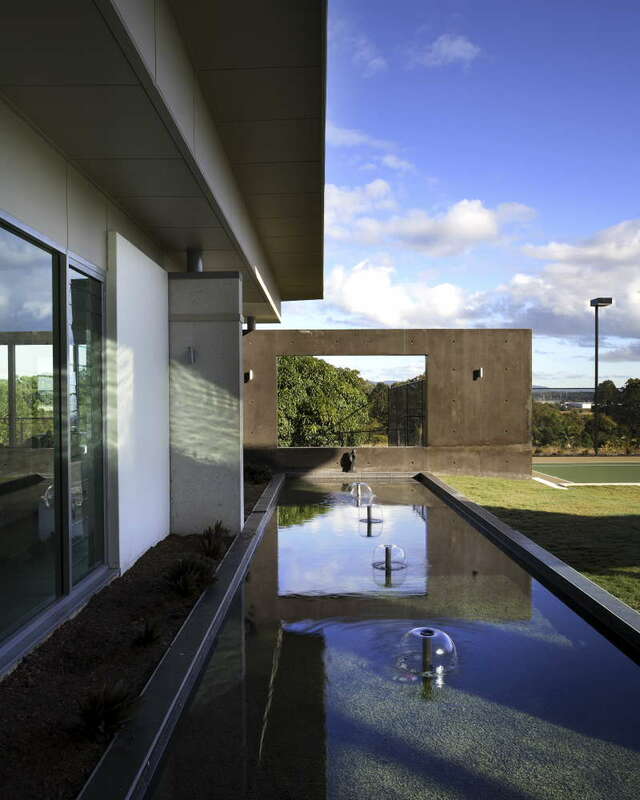 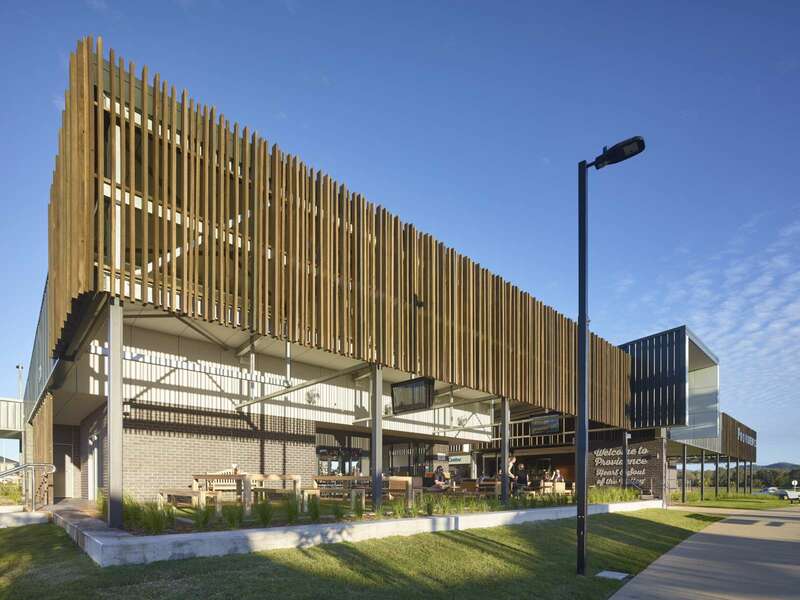 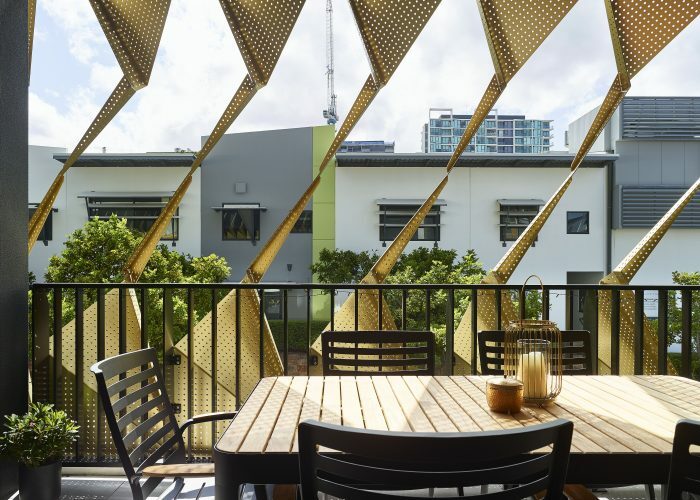 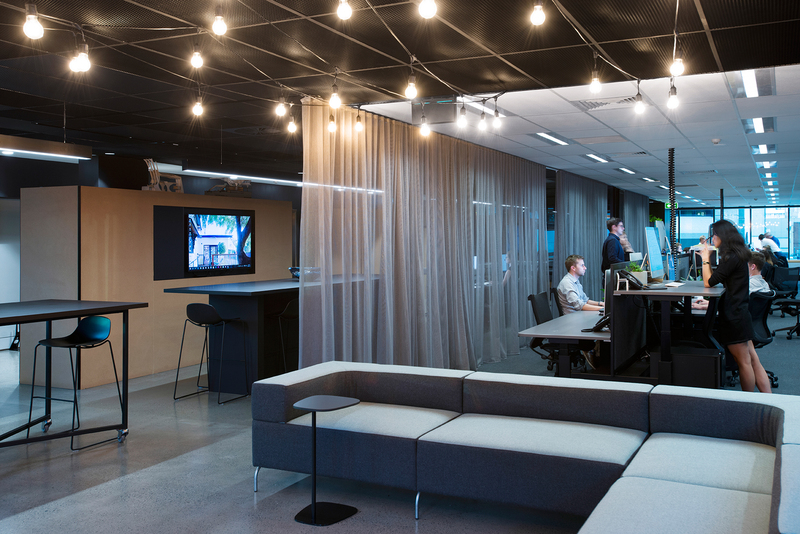 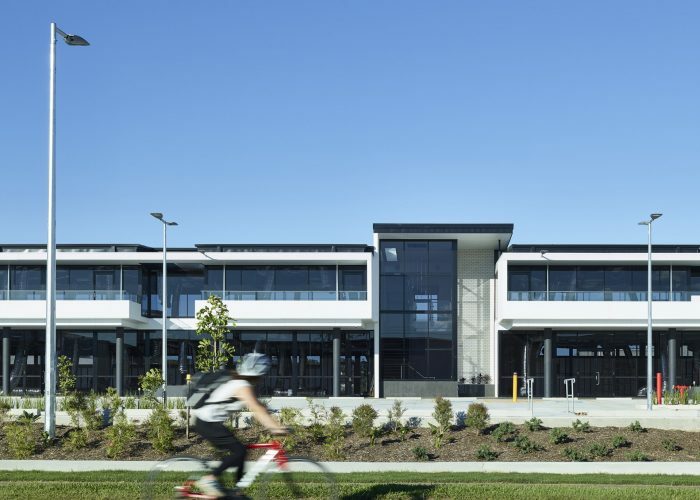 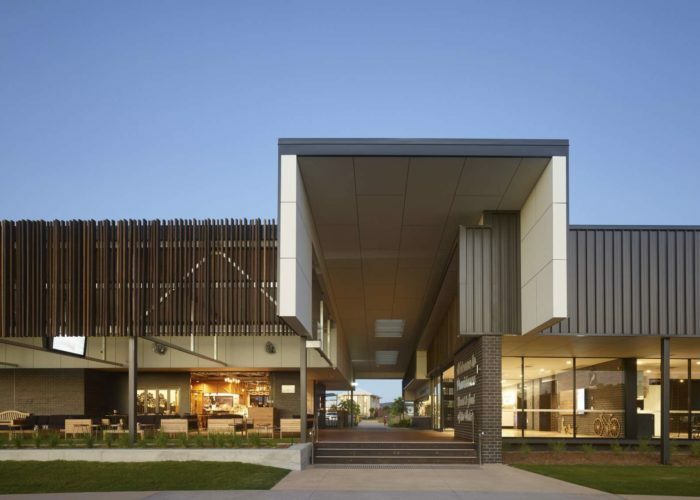 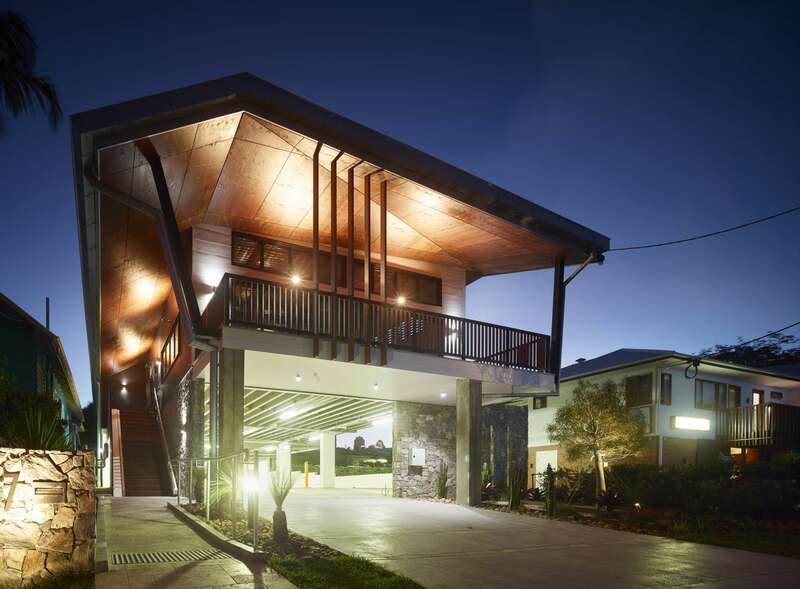 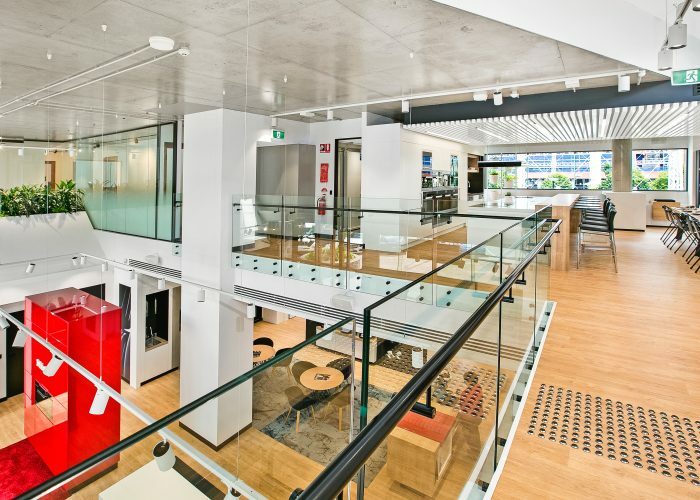 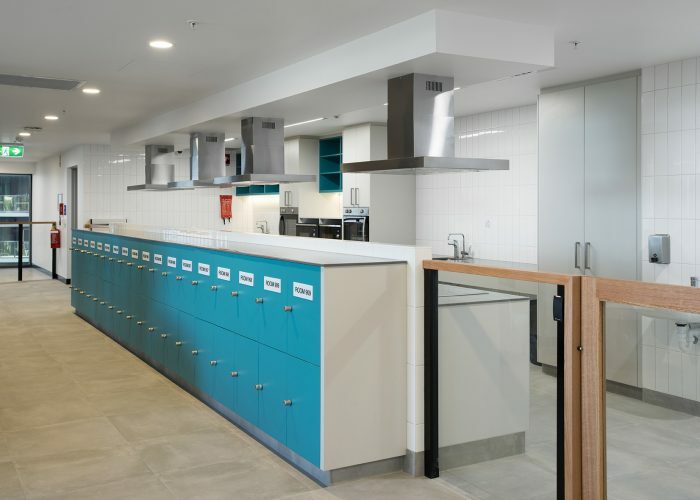 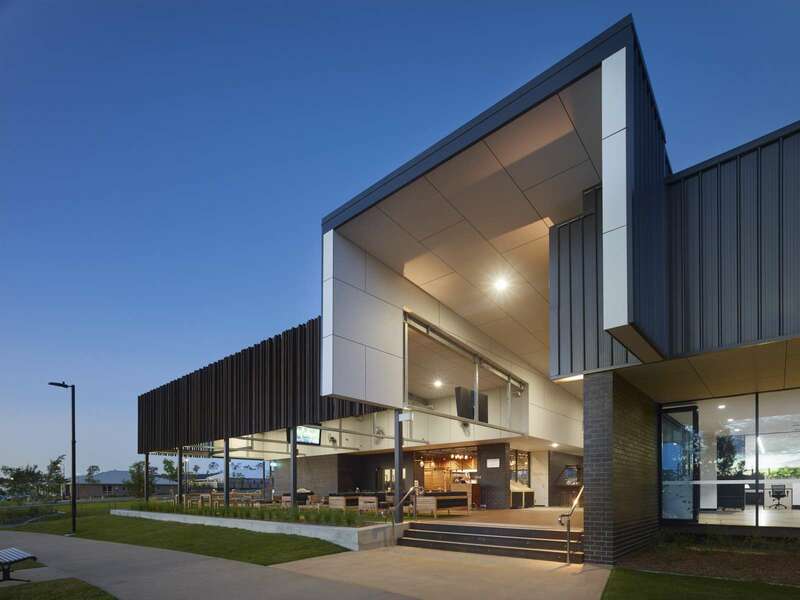 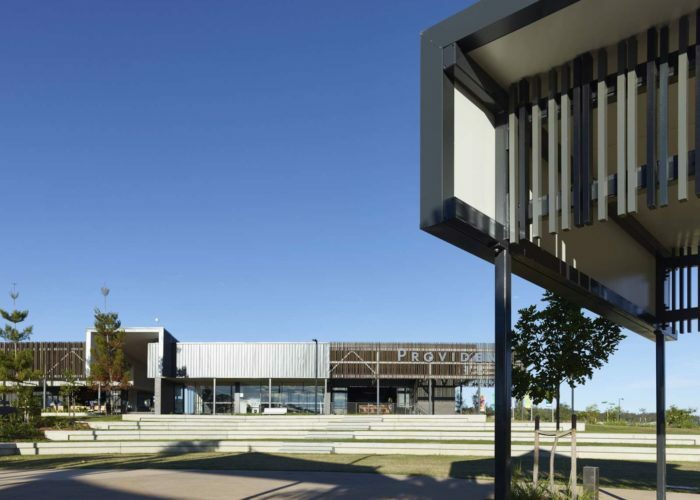 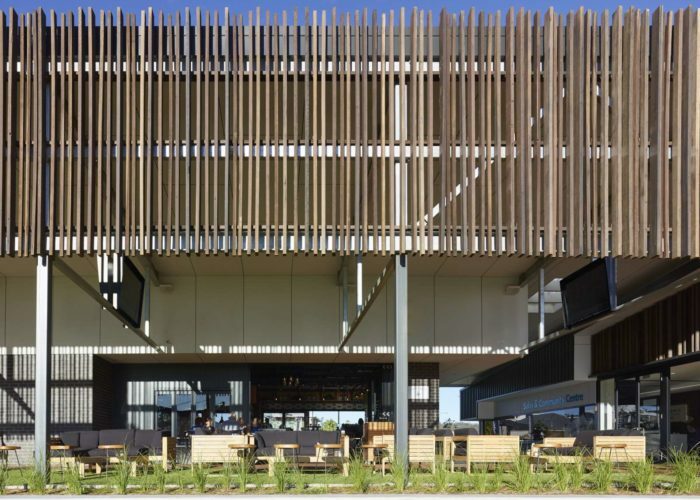 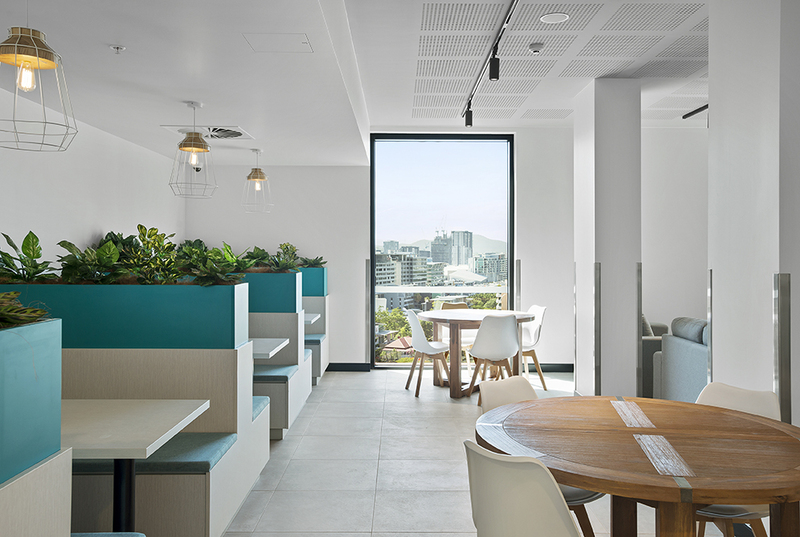 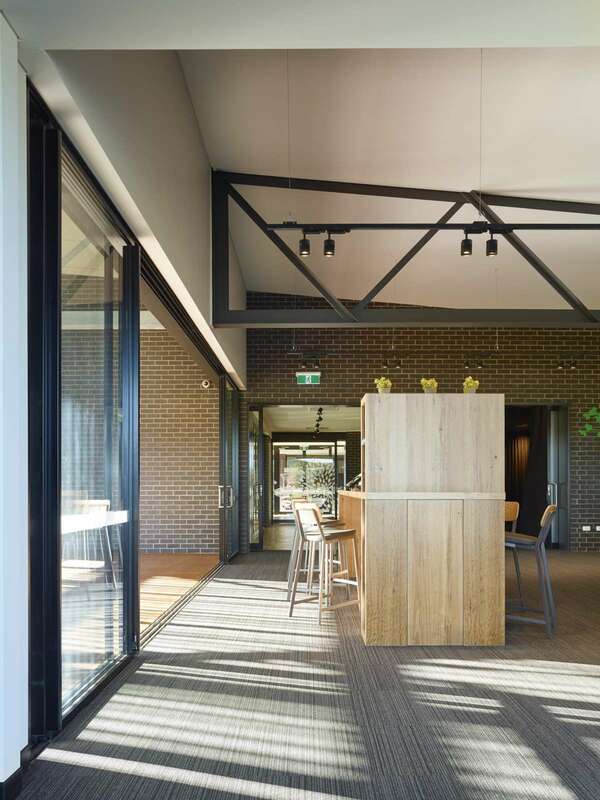 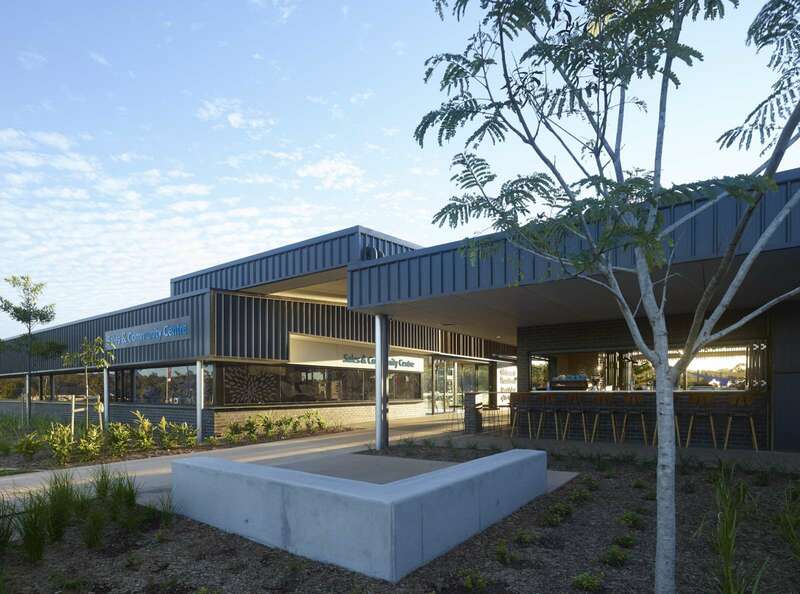 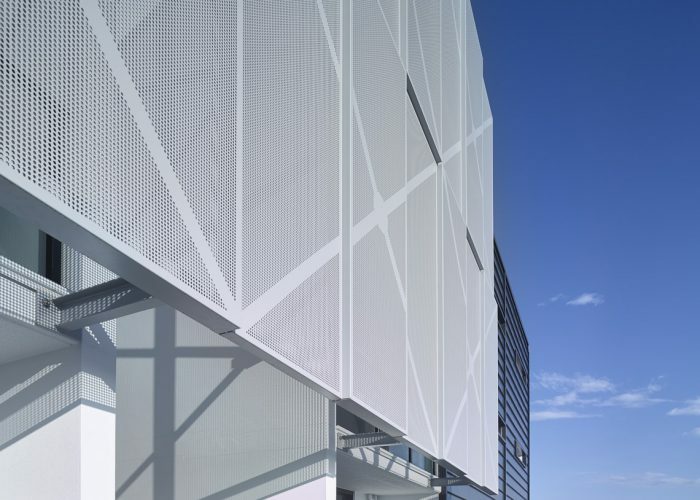 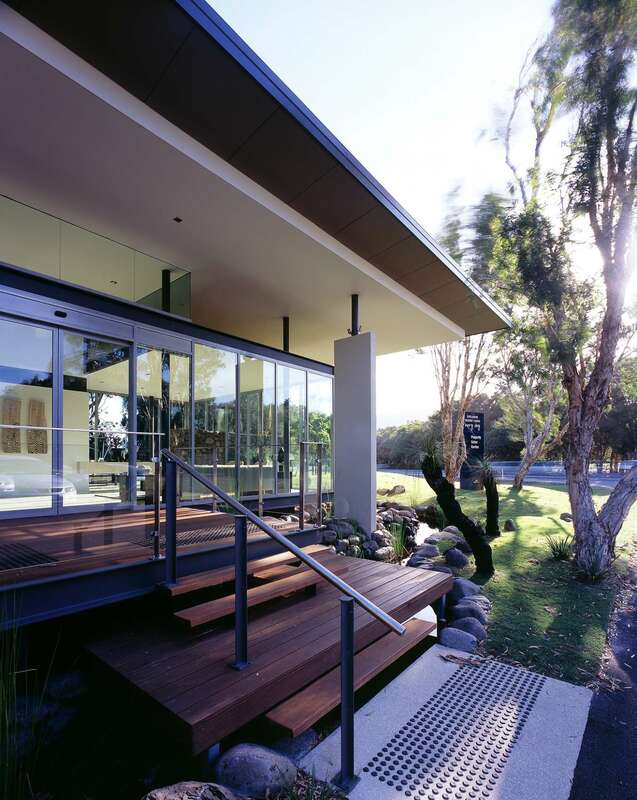 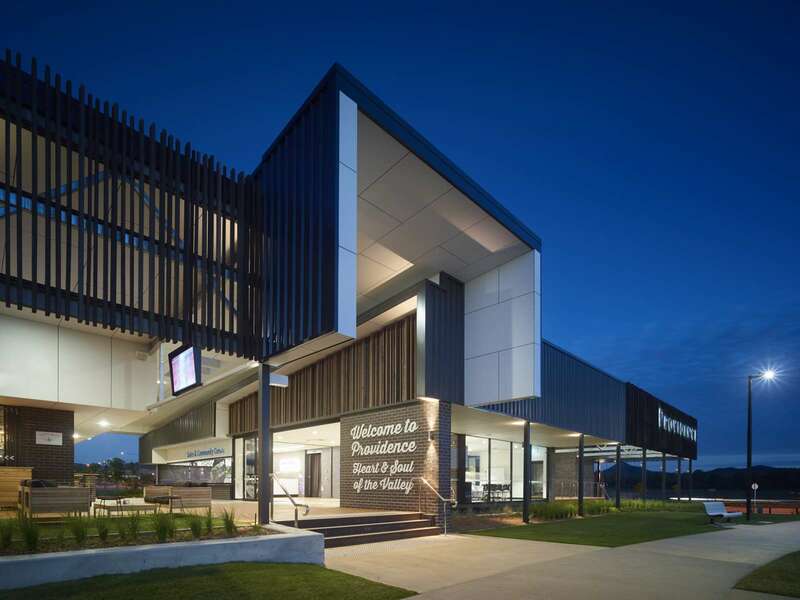 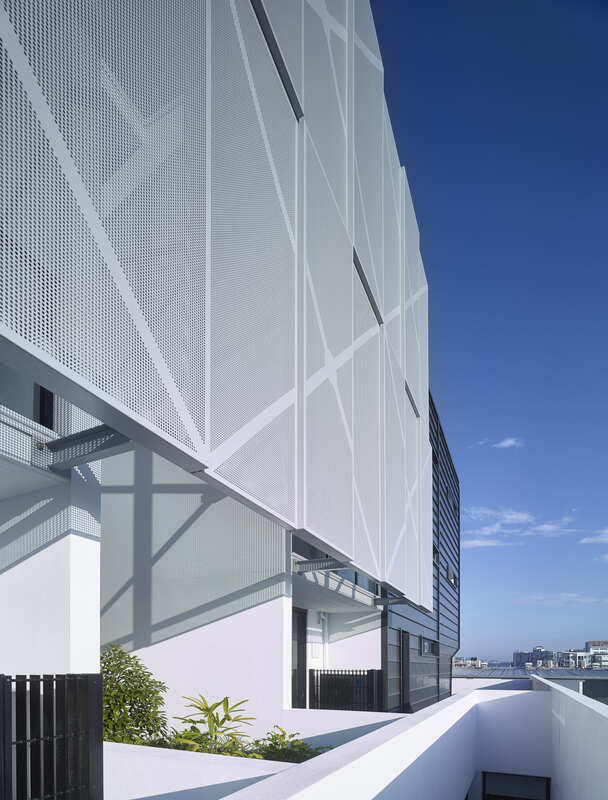 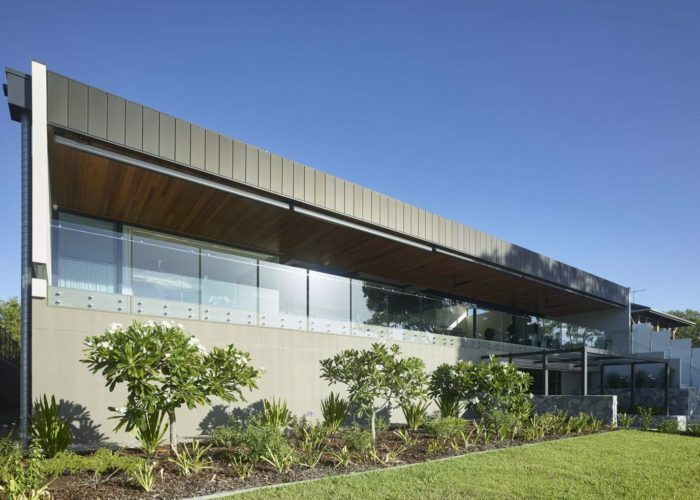 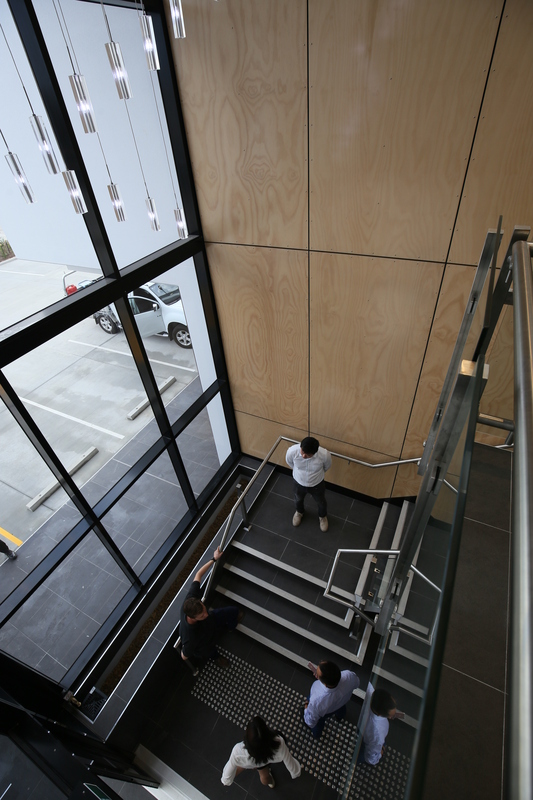 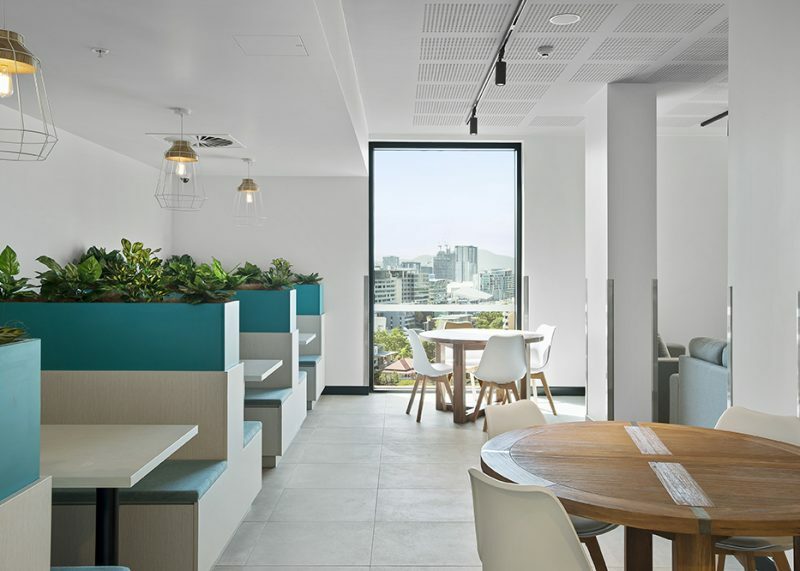 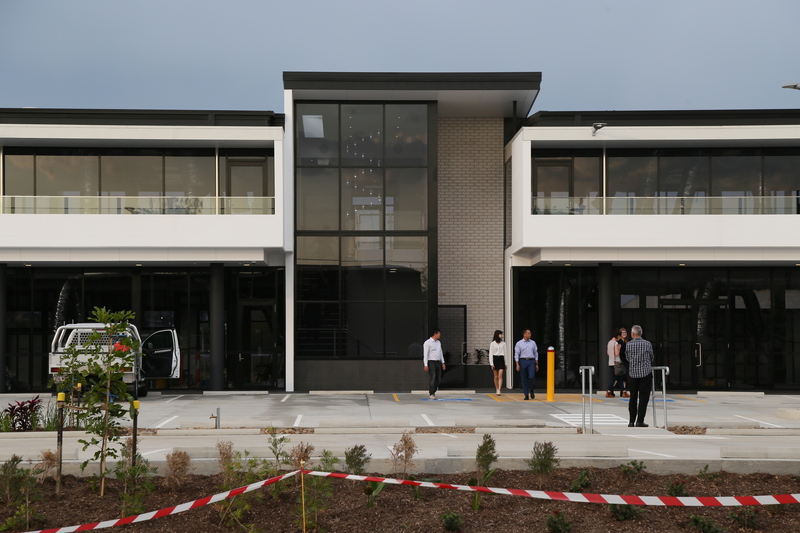 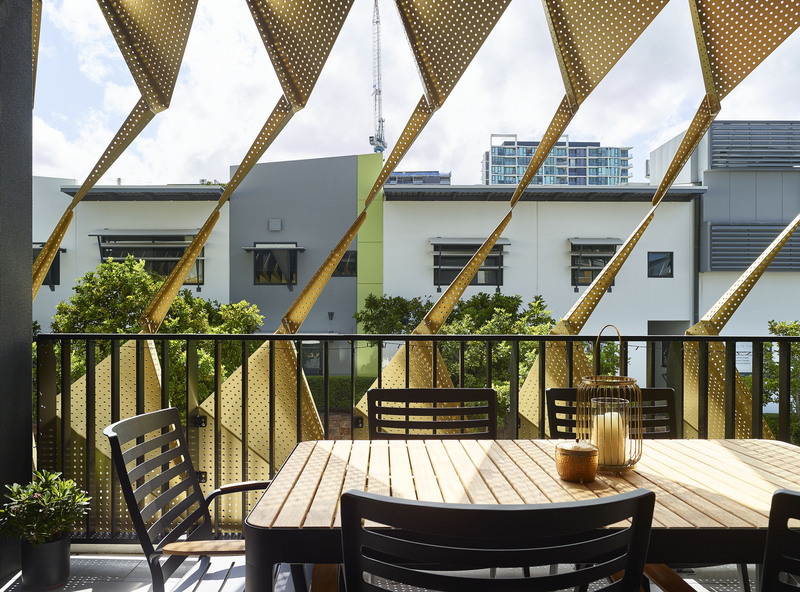 The Pad in the Kelvin Grove Campus precincts is one such facility, catering primarily to the post-graduate market. 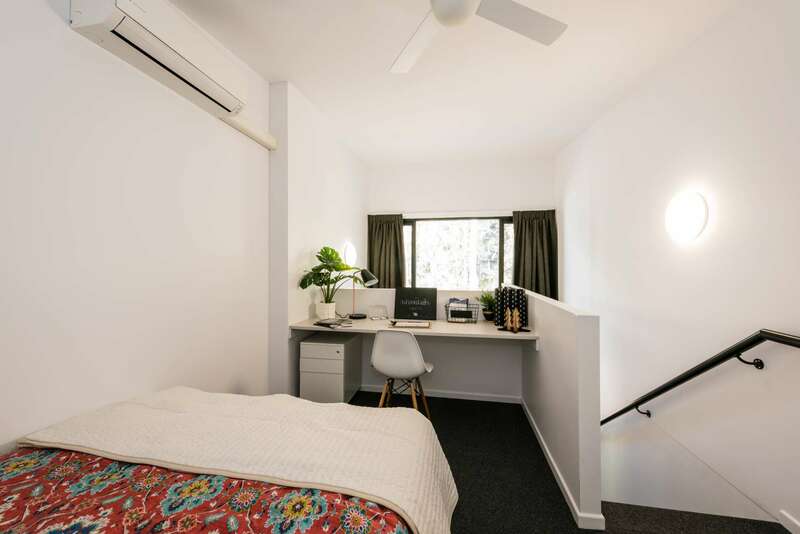 It has “walk-in / walk-out” convenience - bring your suitcase and basically everything else is provided. 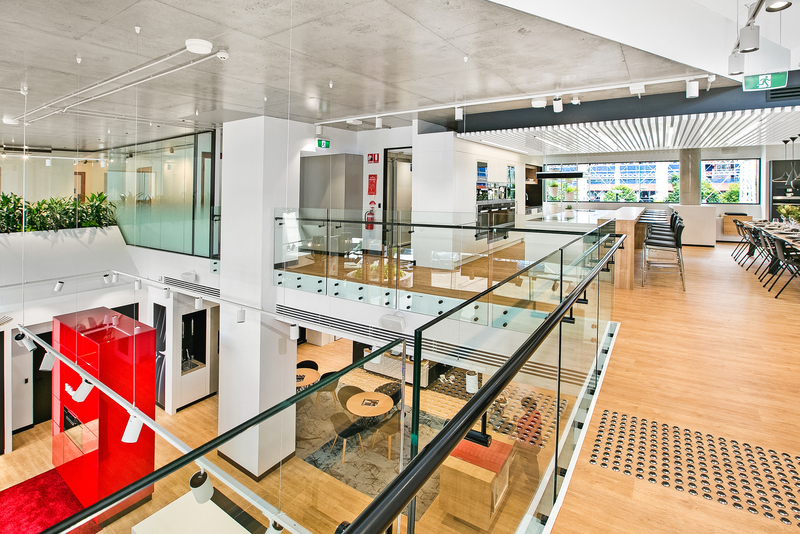 You can have WIFI access almost instantly and a comfortable, quite place to study and socialize. 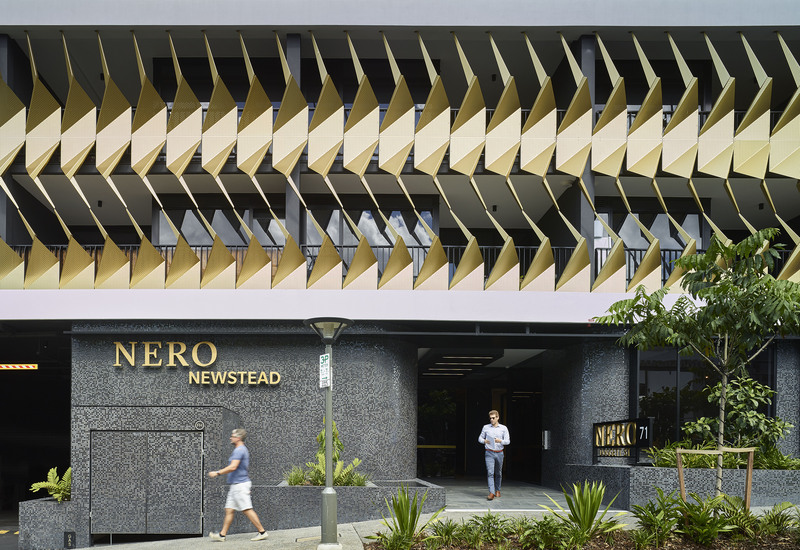 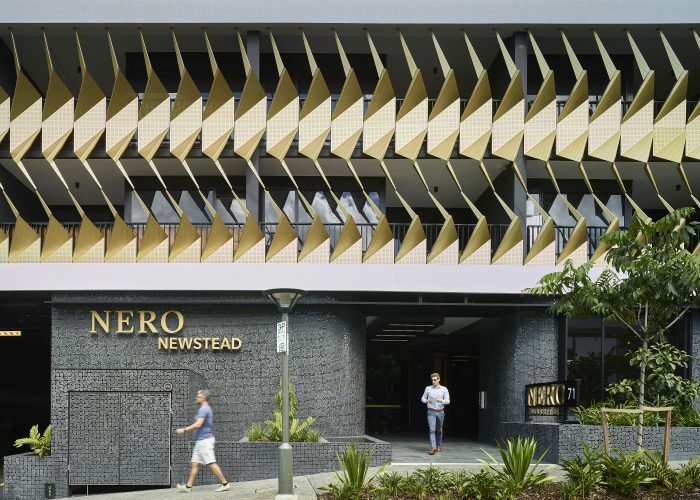 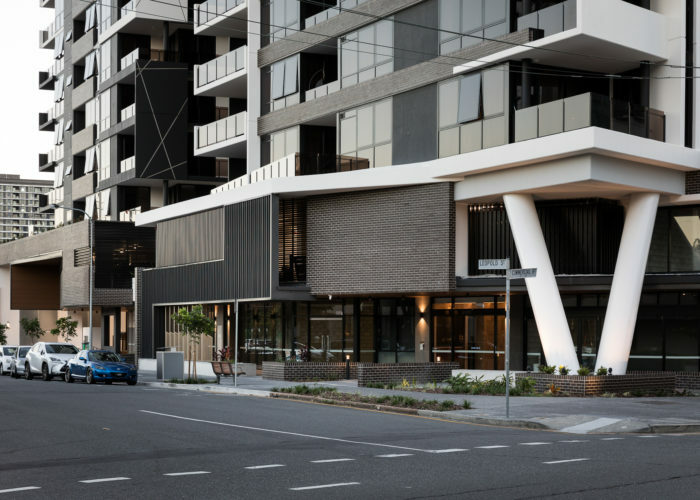 Newstead a suburb in transformation – converting from a warehouse district into a hip, inner city hub with no shortage of shopping, dining and nightlife options. 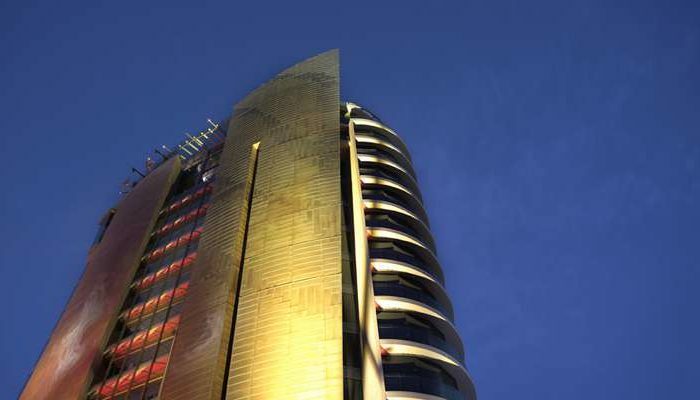 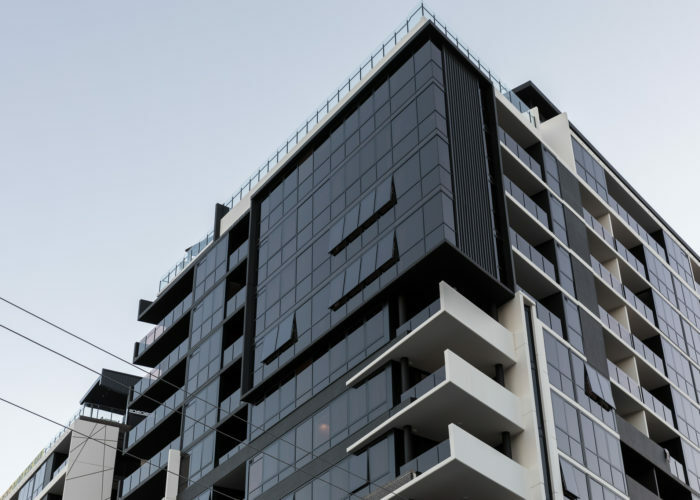 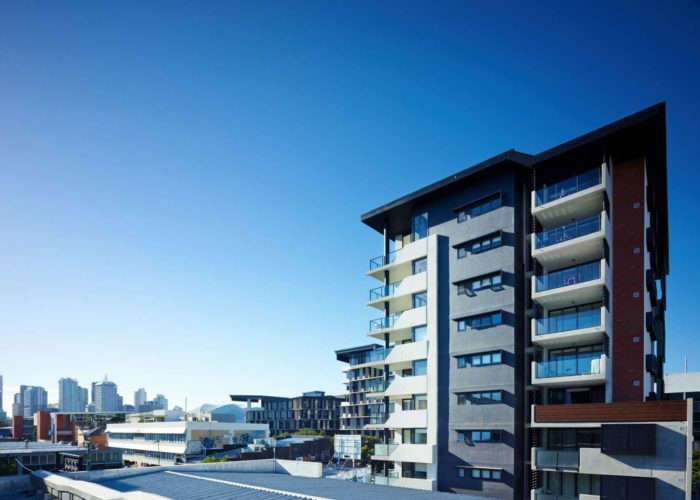 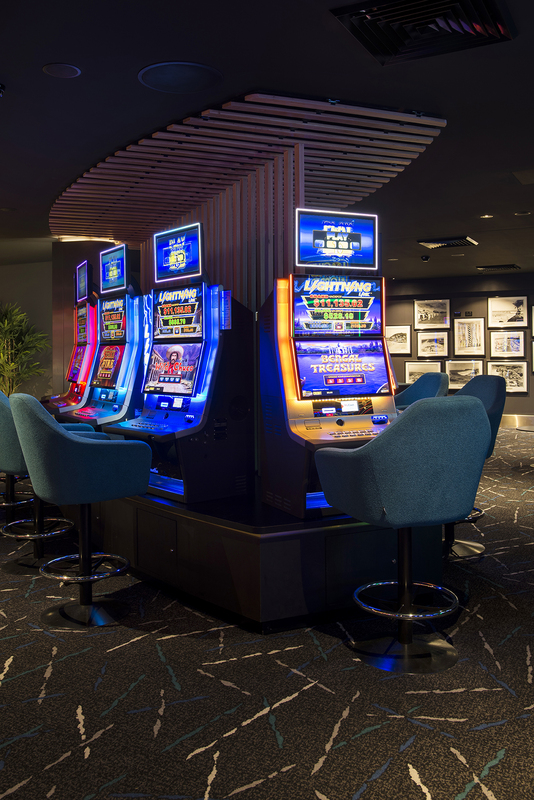 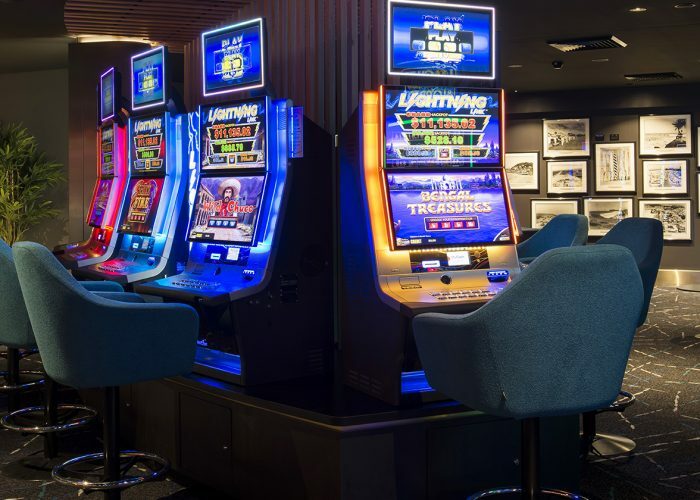 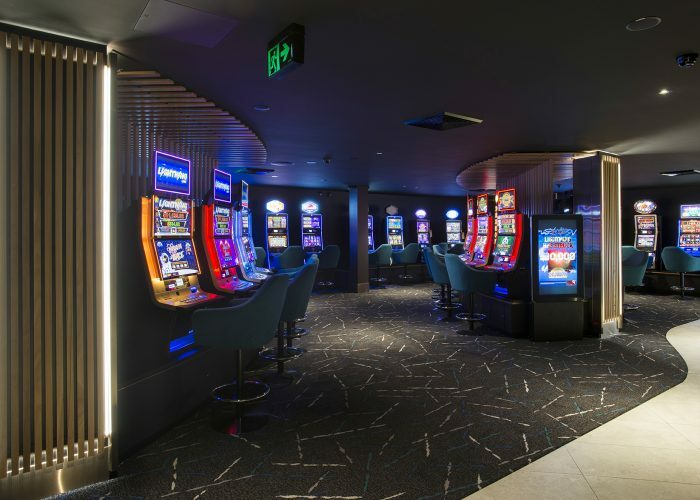 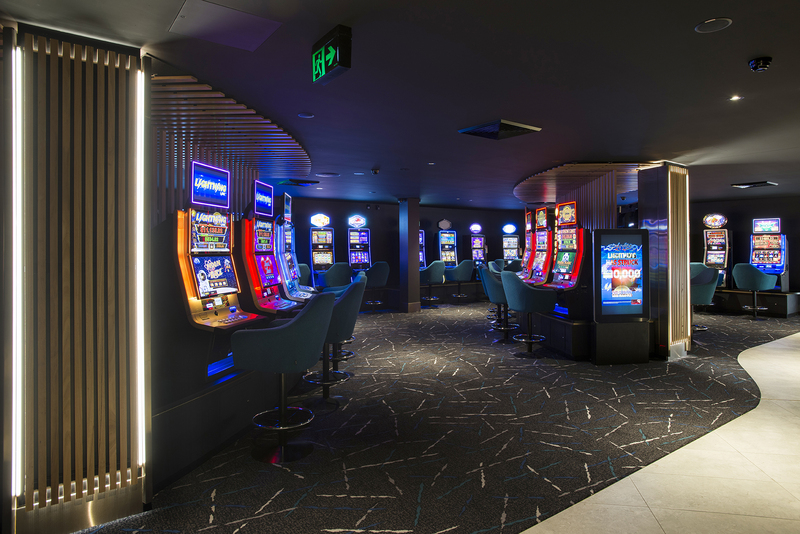 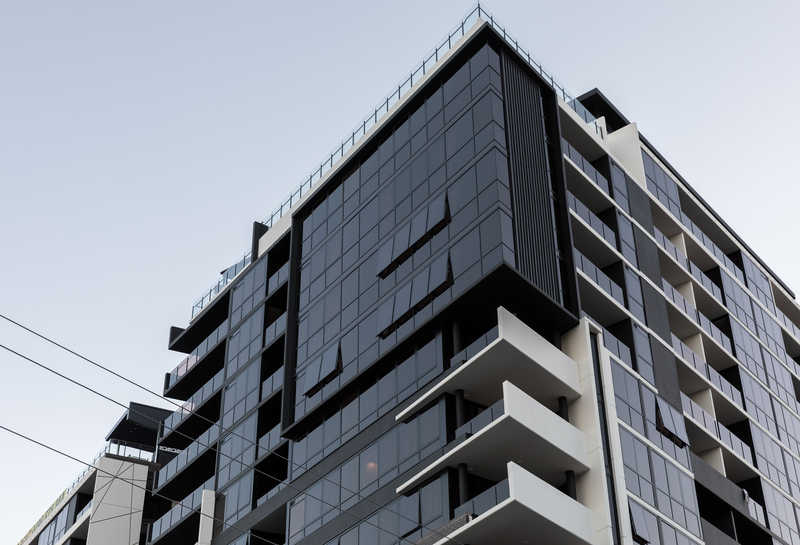 With Brisbane CBD, New Farm’s James Street and Fortitude Valley just a short stroll away, the site is at the heart of the entertainment and lifestyle precinct. 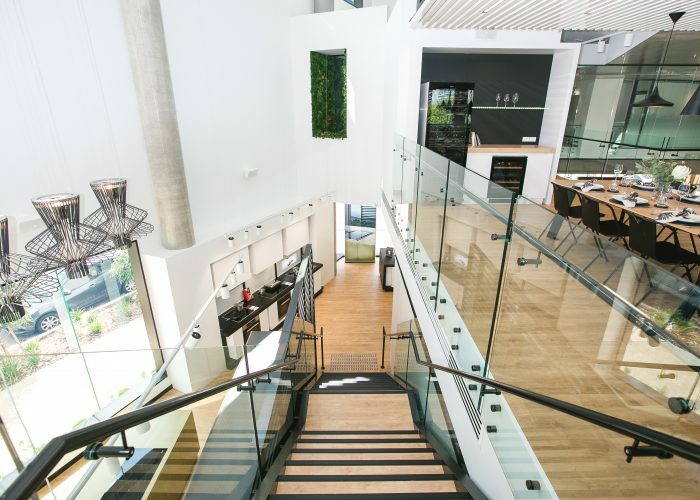 La Vida is an extension to this energetic community. 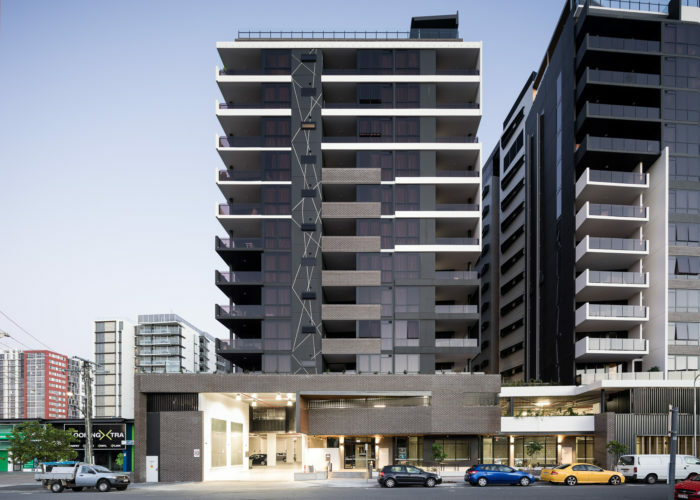 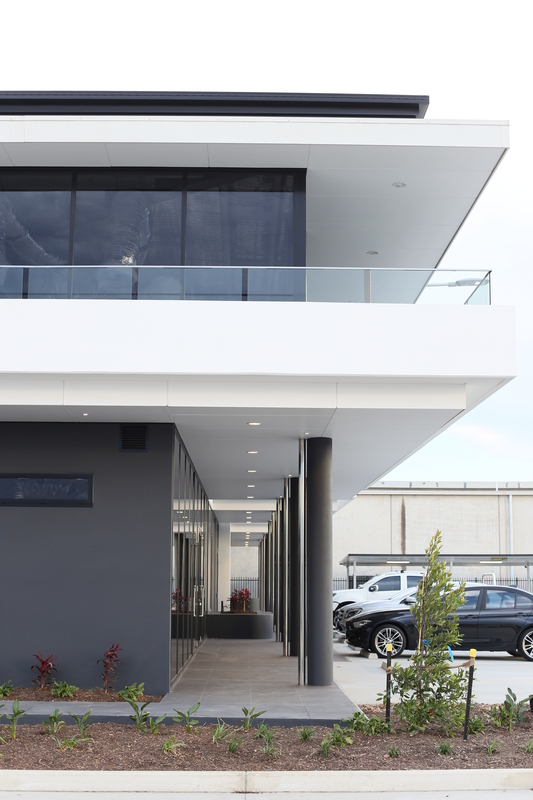 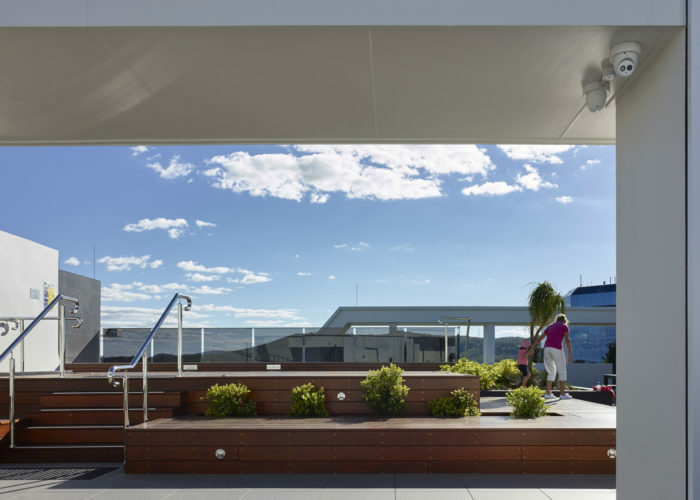 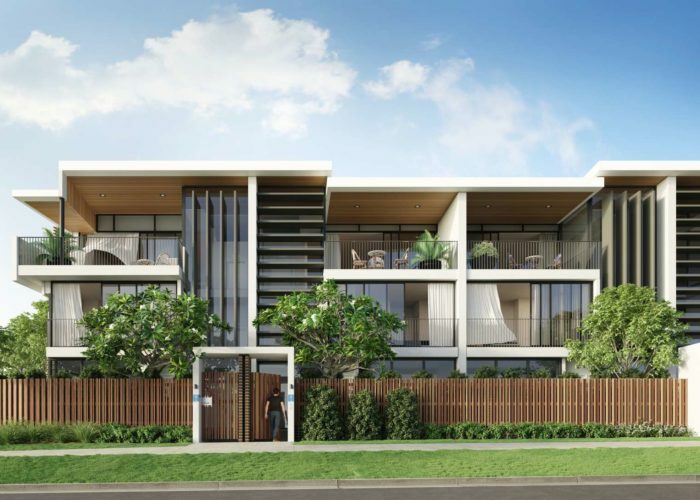 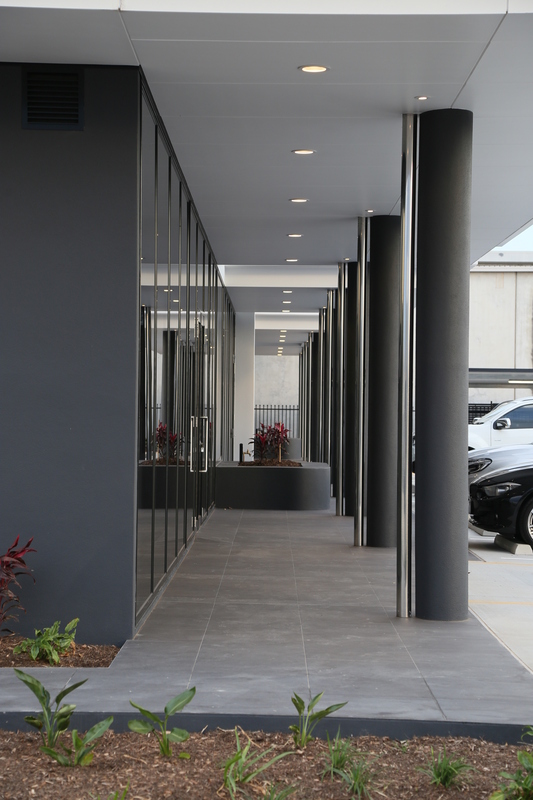 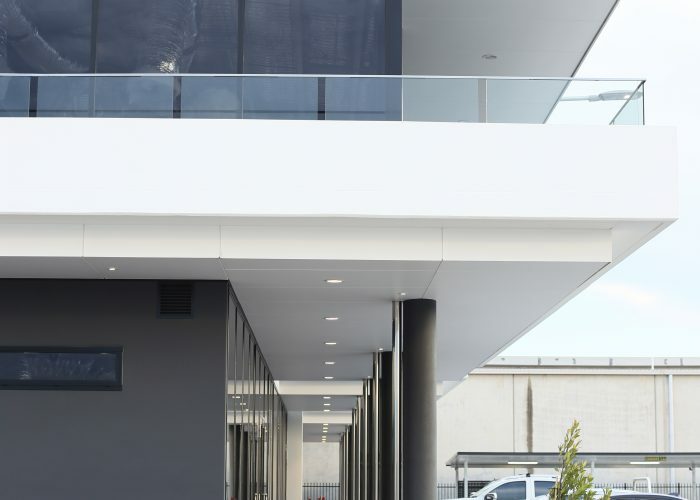 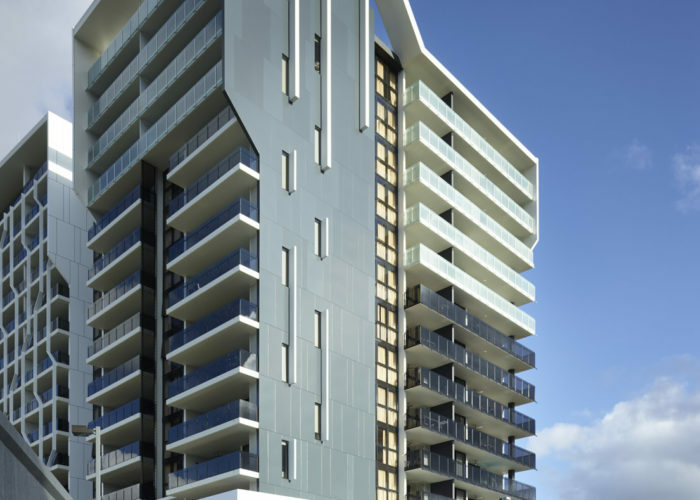 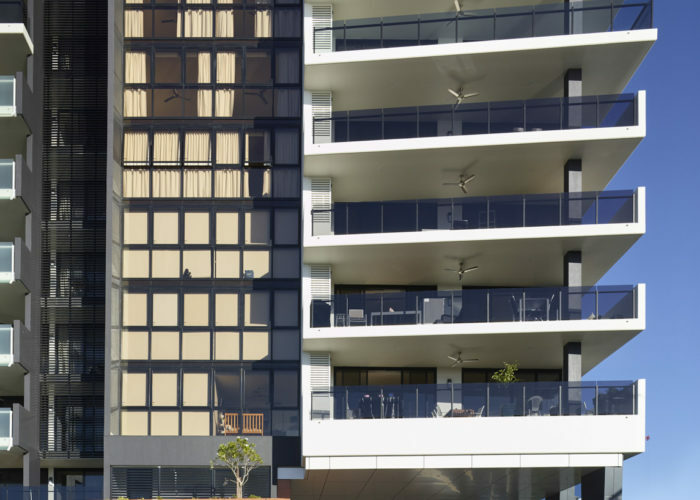 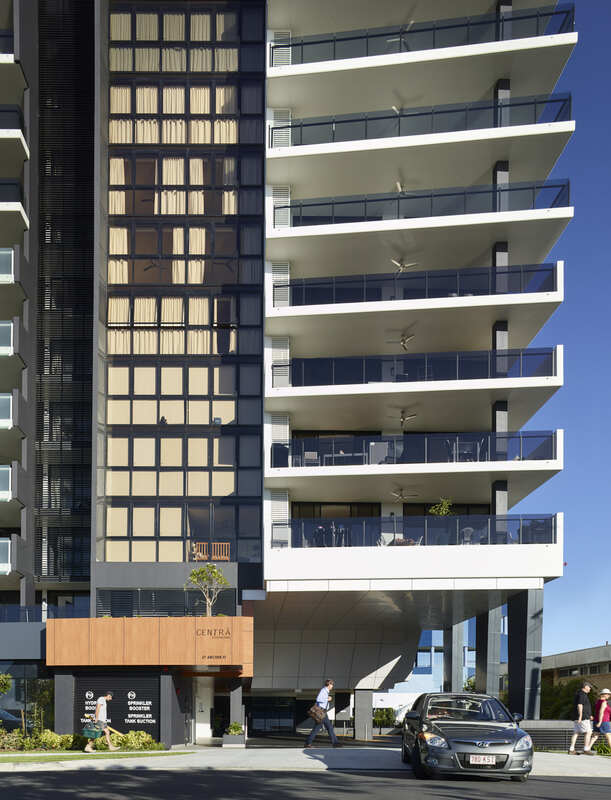 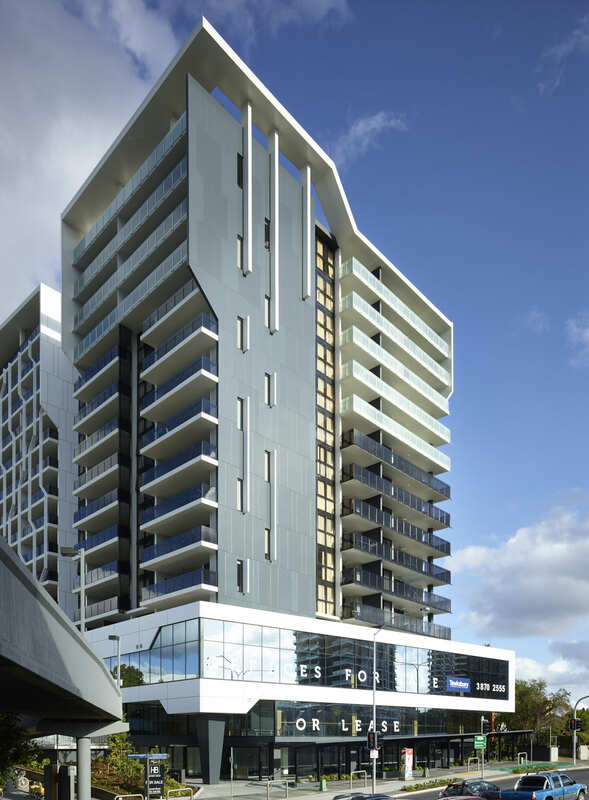 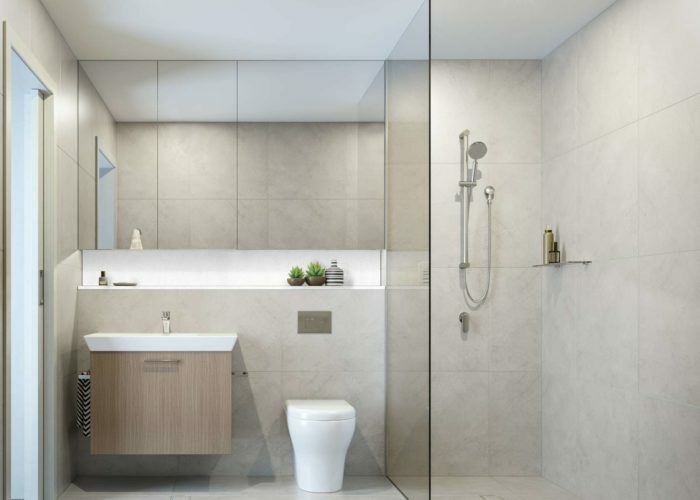 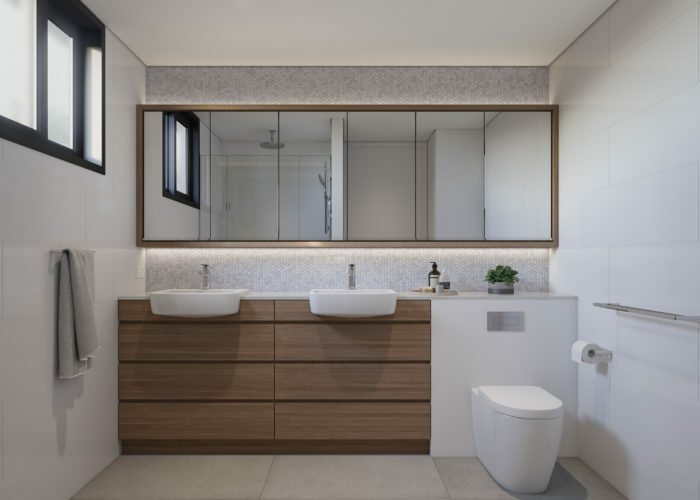 Together with Bekaa group, we sought to deliver a sleek and contemporary expression of the suburb, providing residents with resort living amenities with a luxury touch with views to the edges of Brisbane. 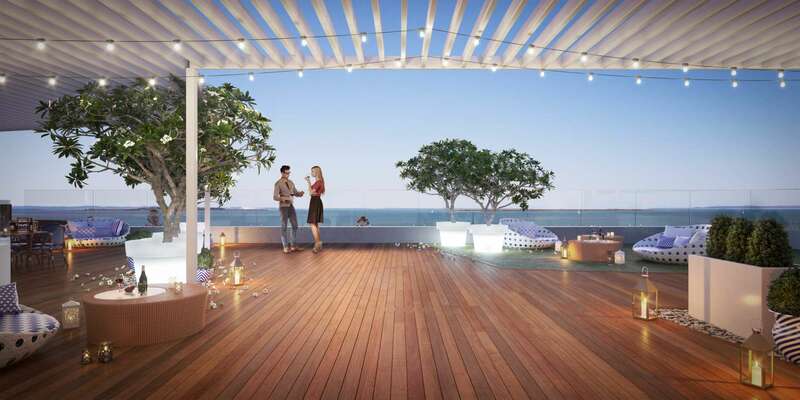 These large, open, spacious apartments are designed with luxury in mind while still being an entertainer’s dream. 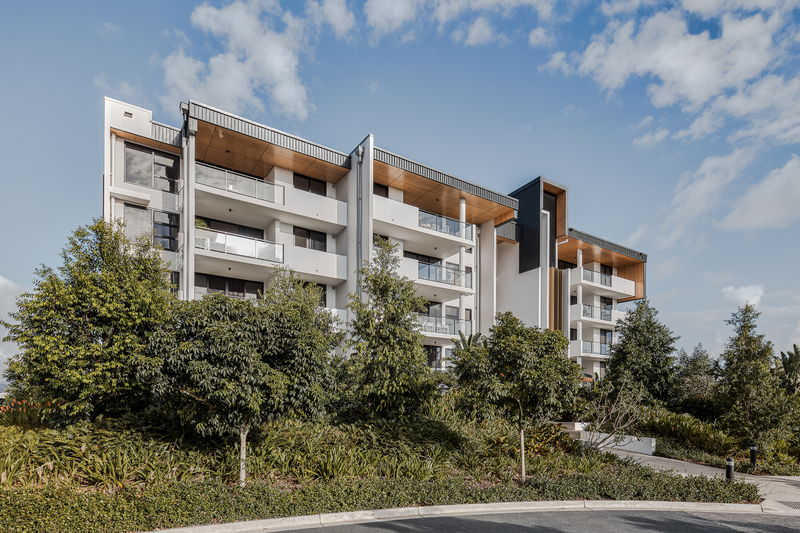 Rochedale is located within the middle ring of Brisbane and is known for its friendly community, rich farming history, relatively low density and abundant nature reserves. 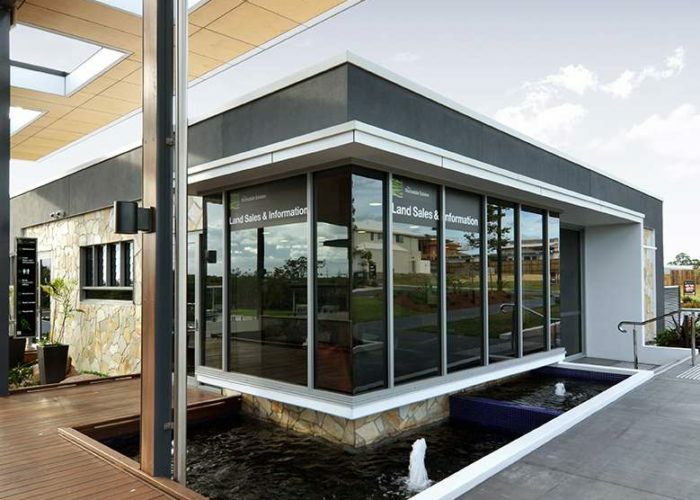 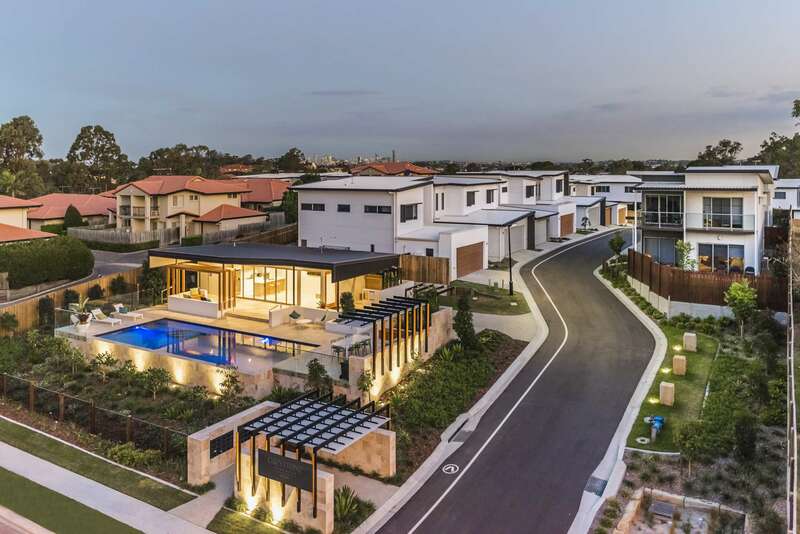 Its well connected locality has seen the suburb develop rapidly with new master planned estates. 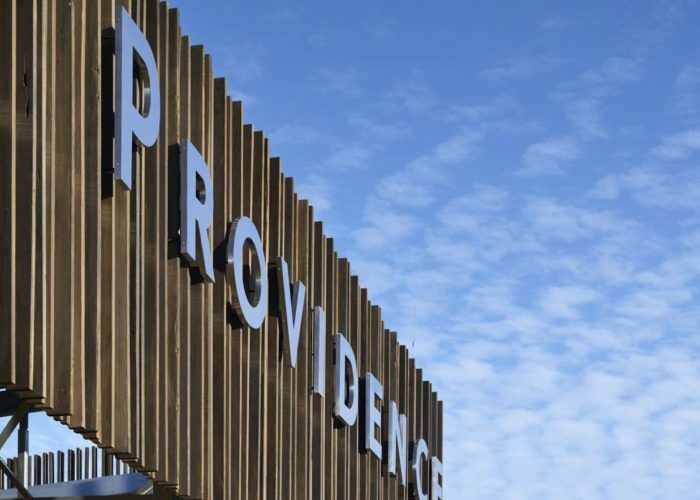 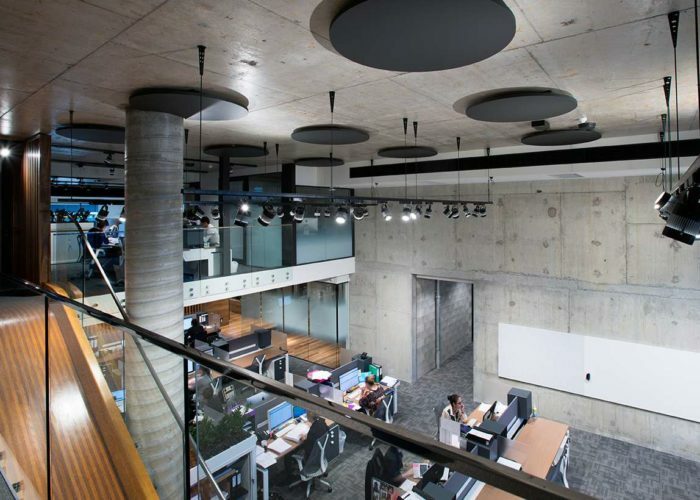 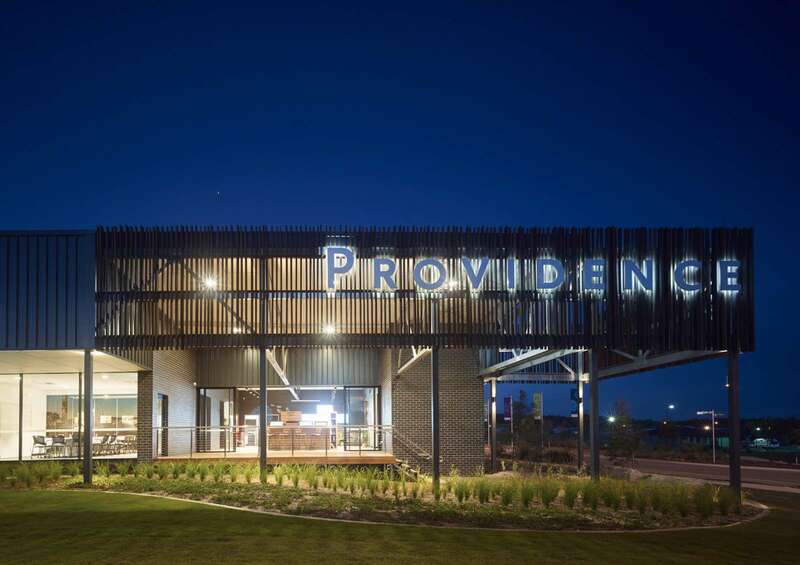 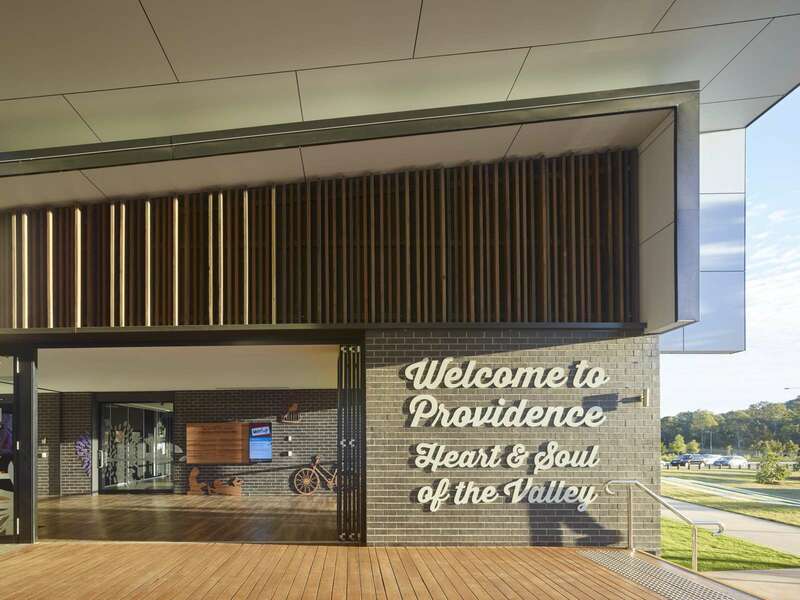 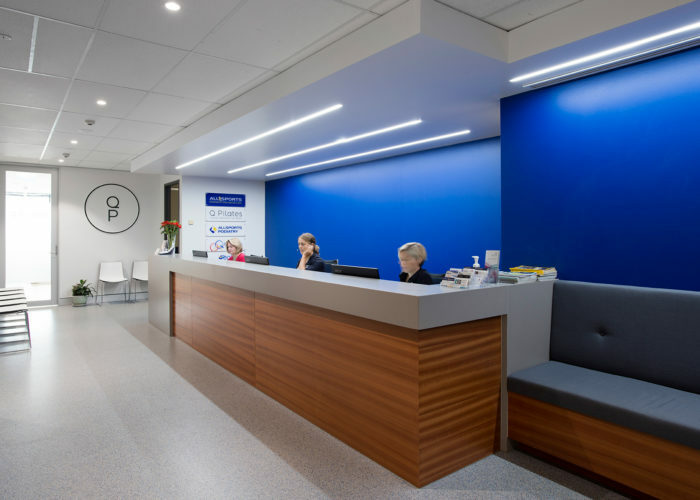 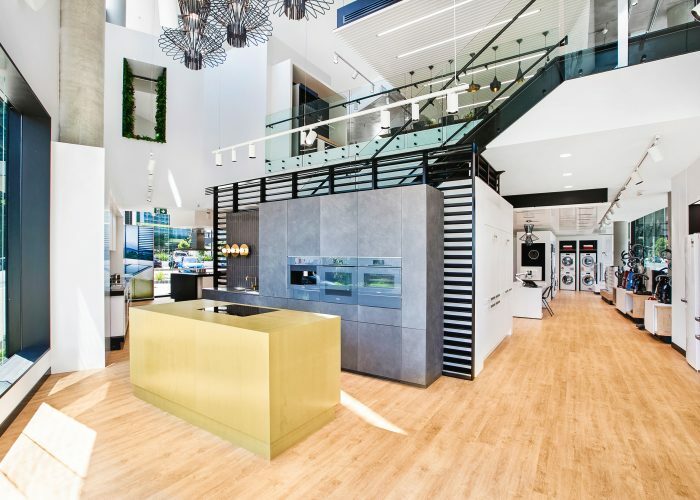 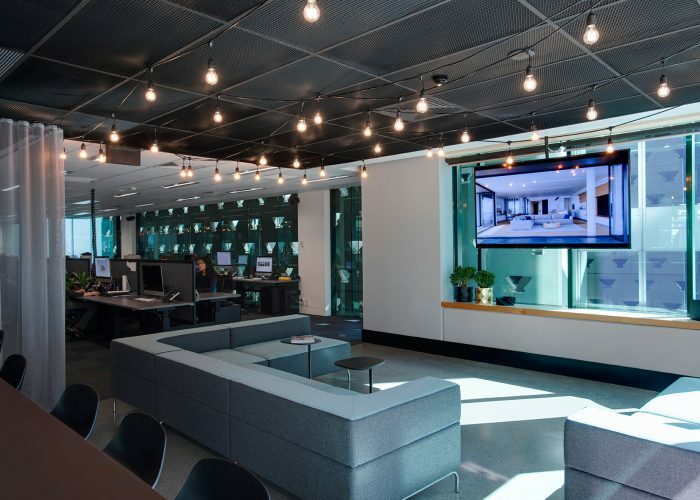 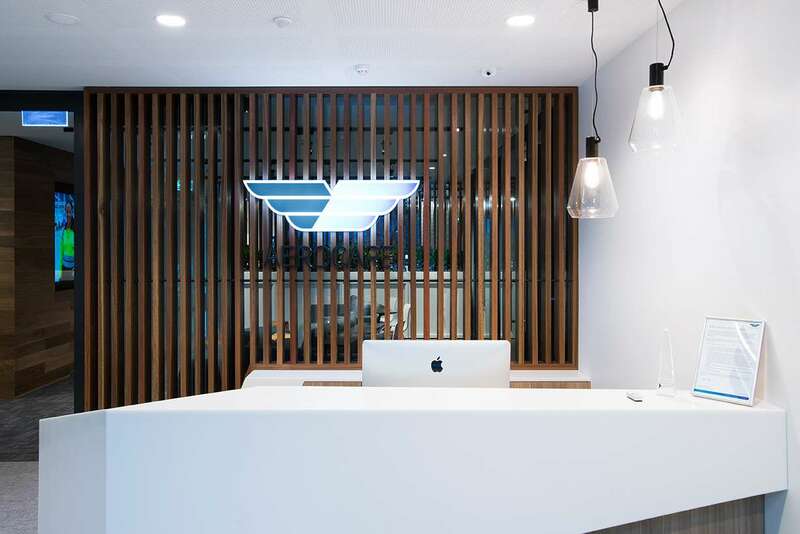 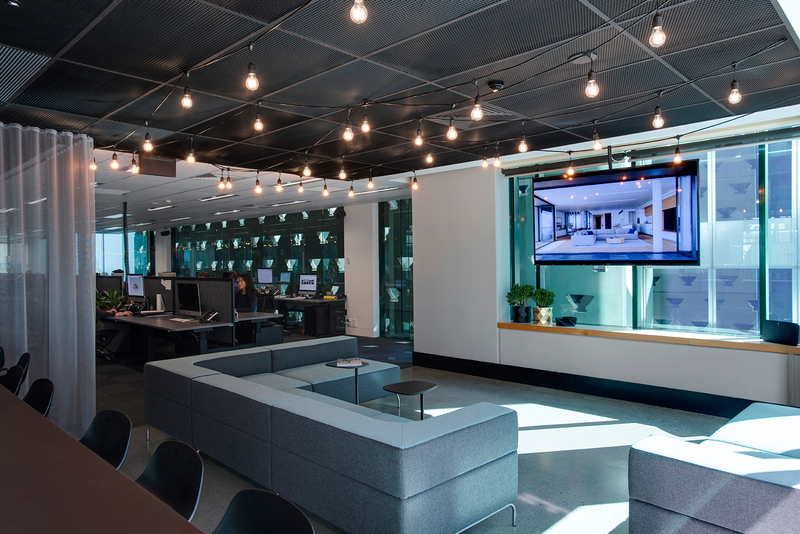 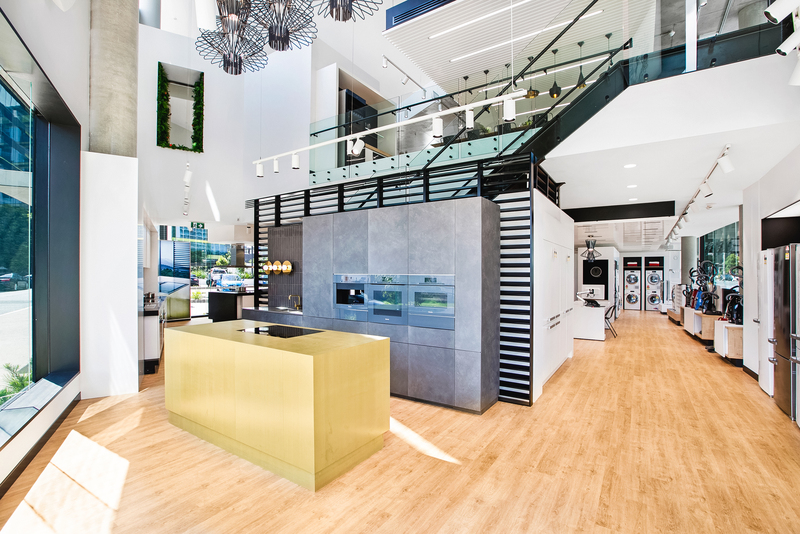 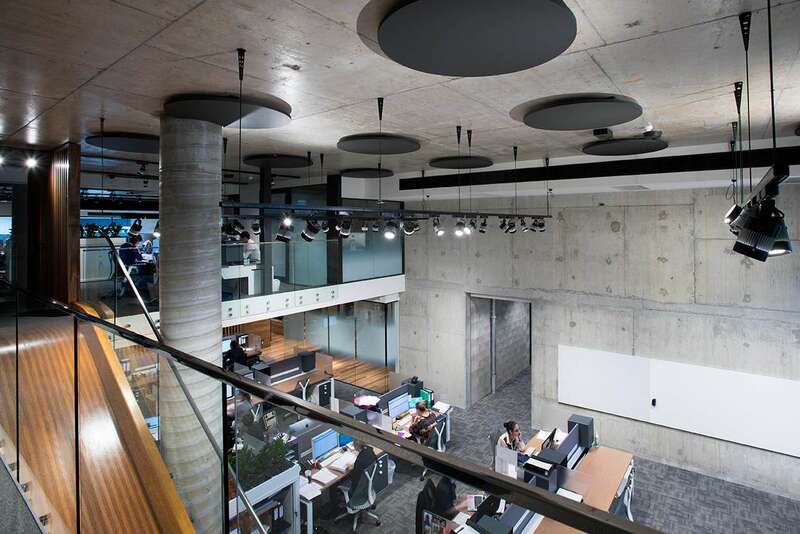 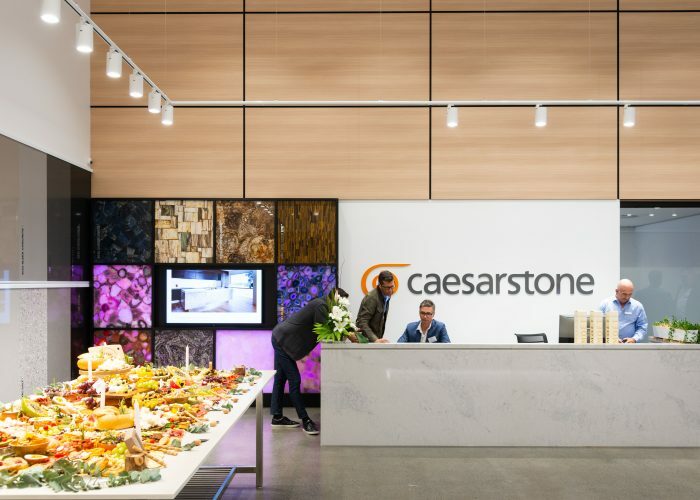 We partnered with Aveo Group to create a catalyst for a community’s wellness, fitness and connection. 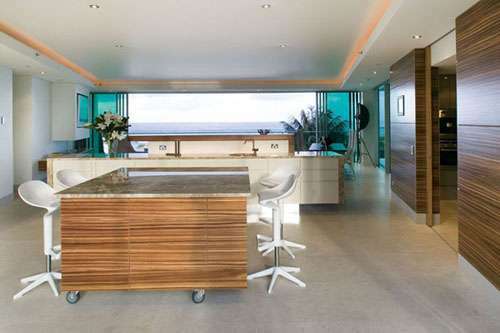 With resort style living a key component to the brief, it was hard not to have fun on this project. 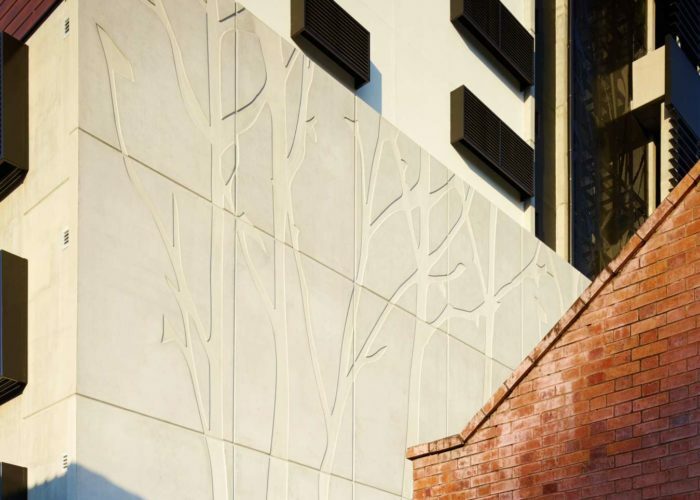 We studied the context, site opportunities and various building materials, to create a unique cultural feature of the area. 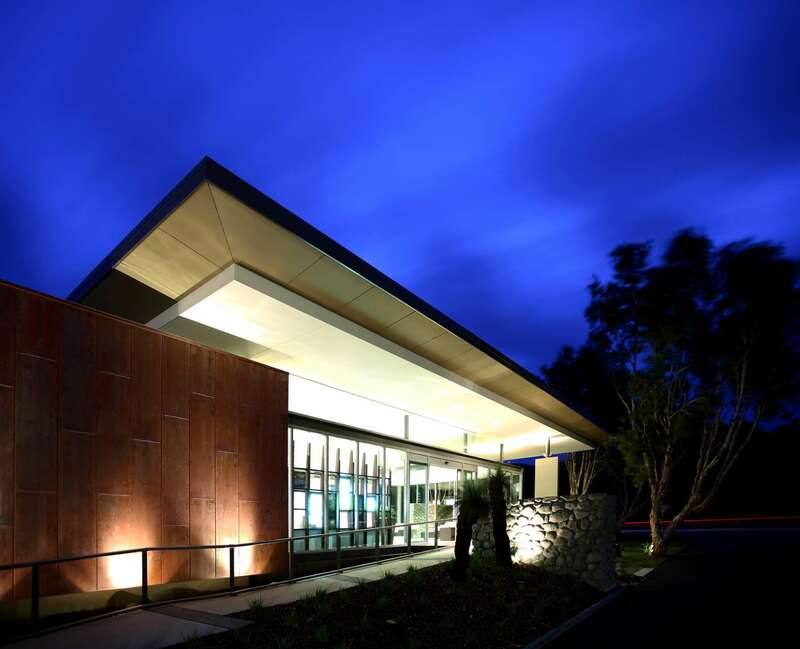 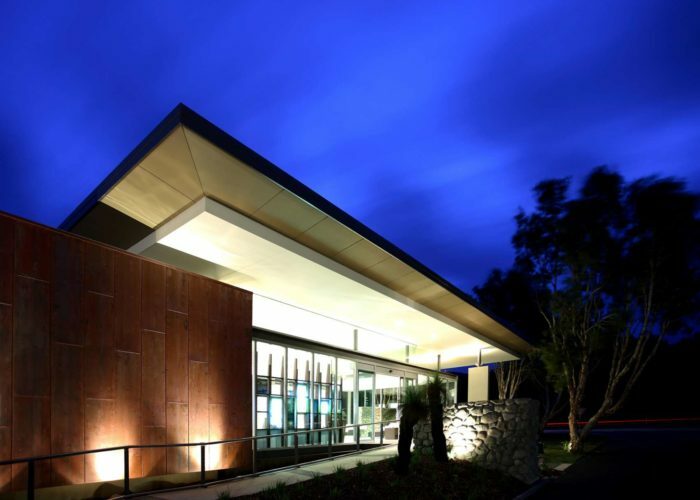 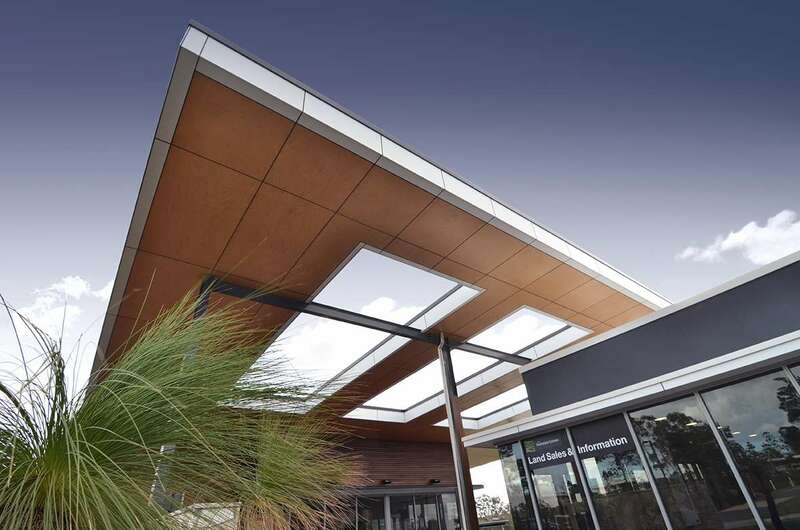 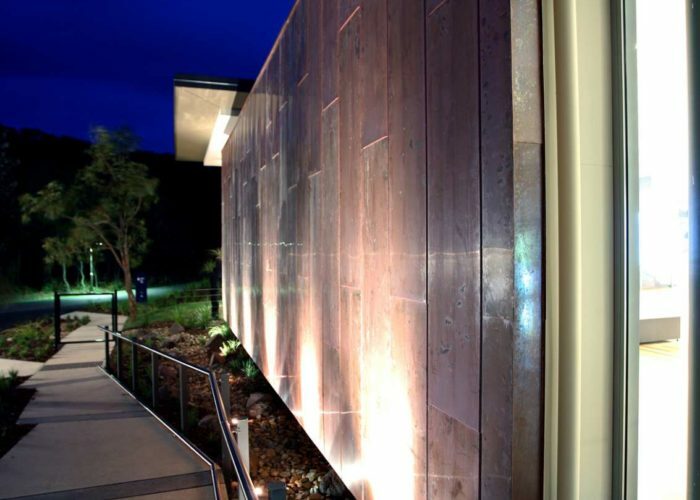 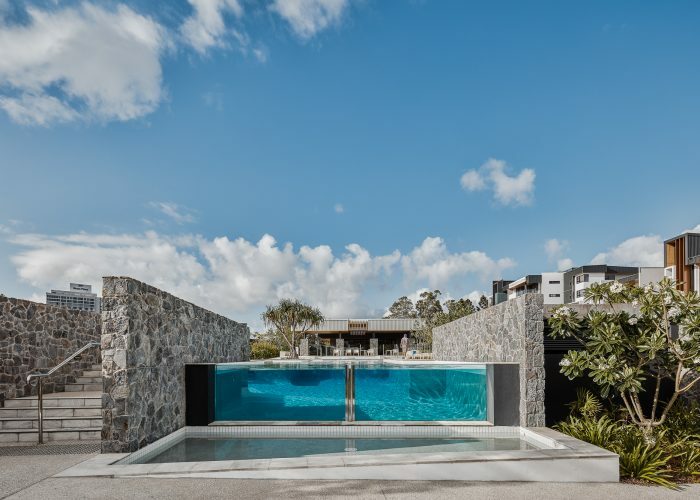 The Hyatt Coolum Visitor Centre for Lend Lease welcomes visitors with expansive walls of glass capturing views to Mount Coolum. 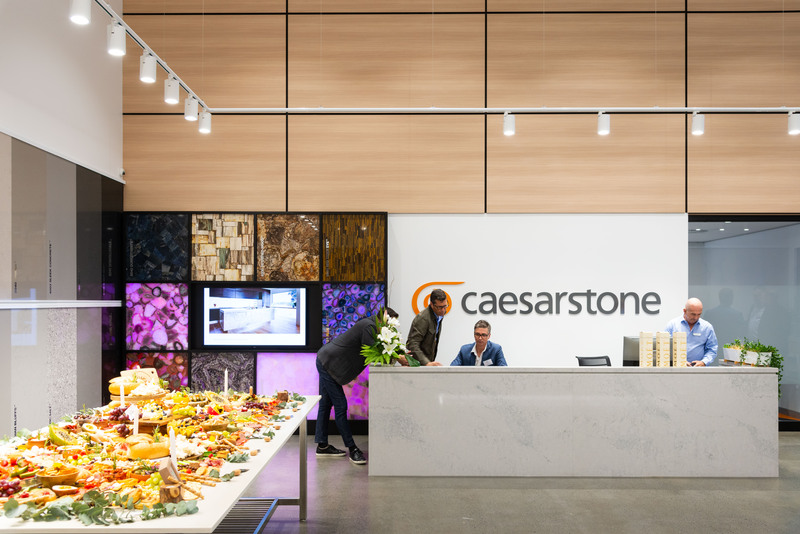 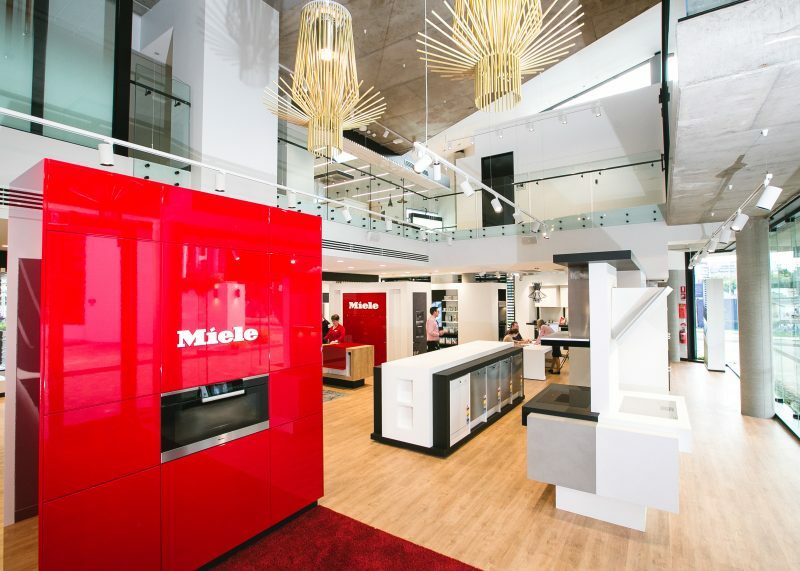 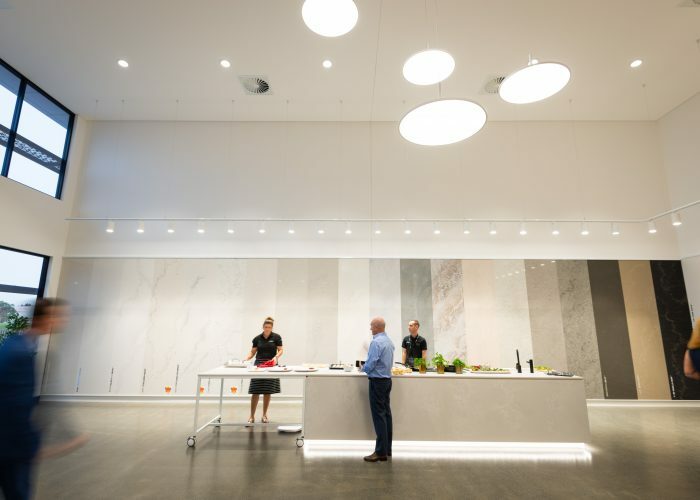 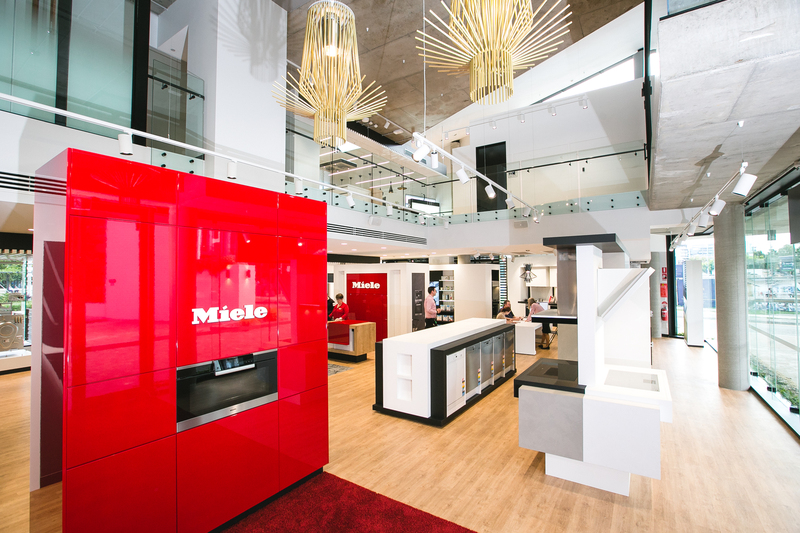 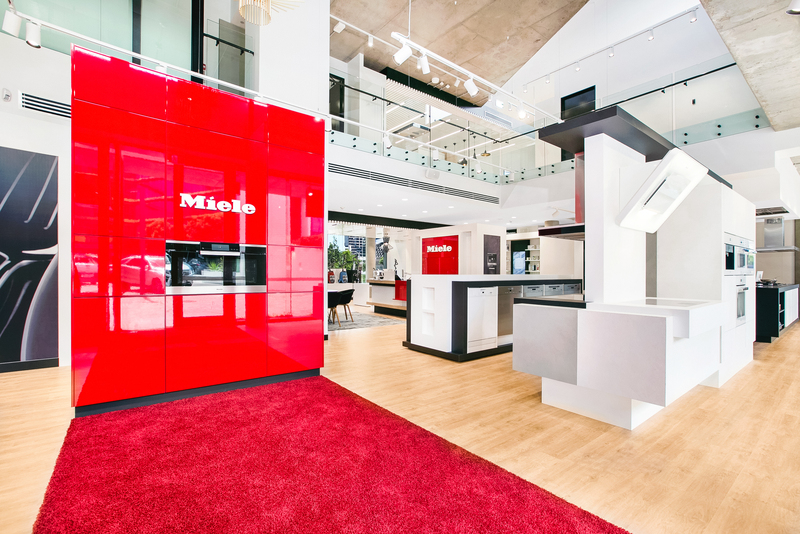 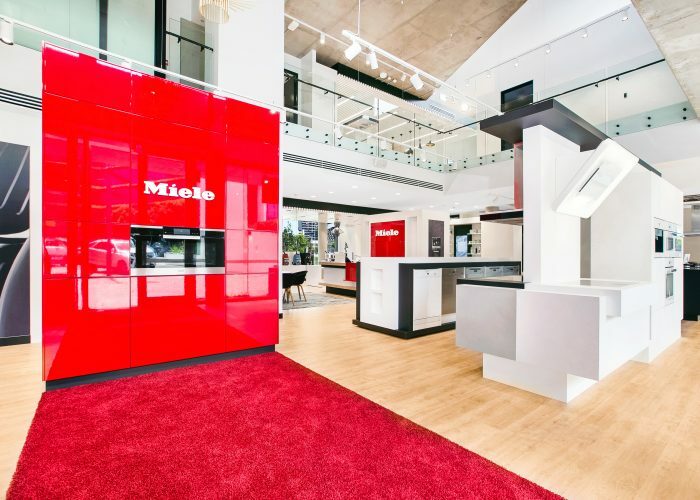 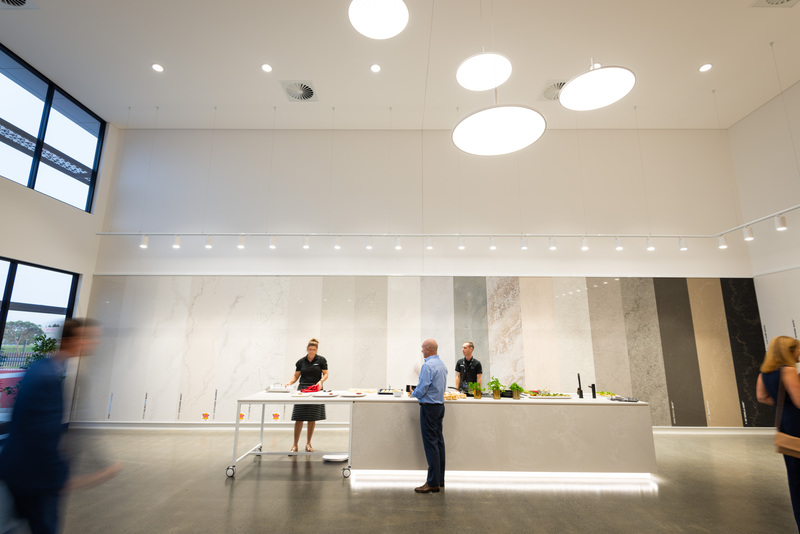 The light filled open plan space caters for functions, openings and a permanent sales display with associated offices. Copper clad walls and an earthy patina to the subdued material and colour palette, settling the building into its golf course location. 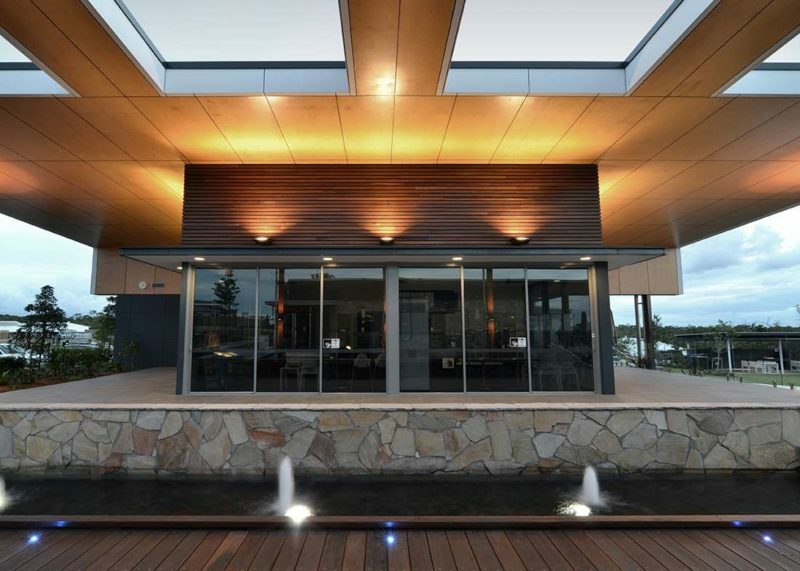 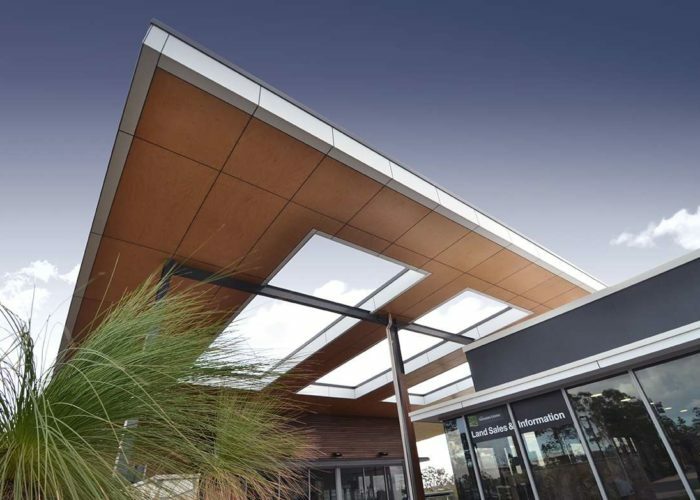 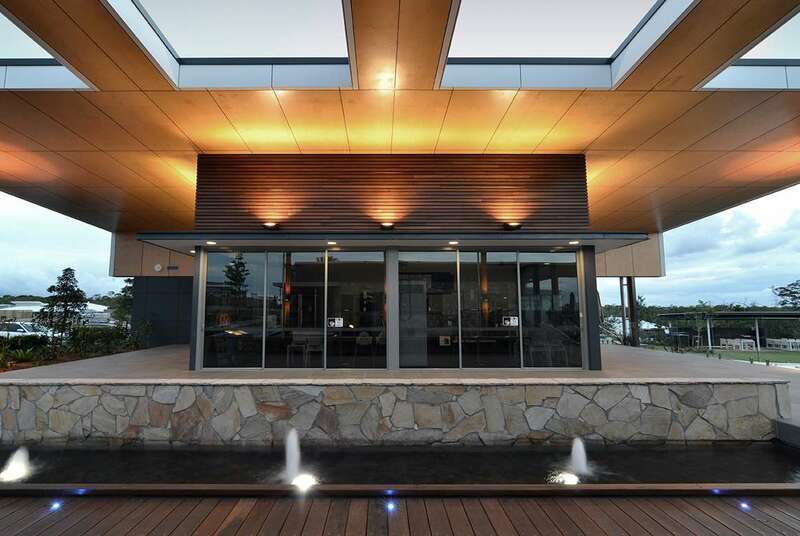 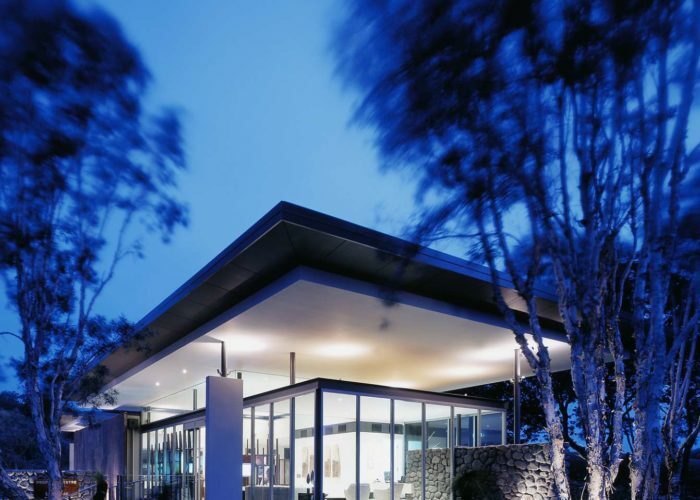 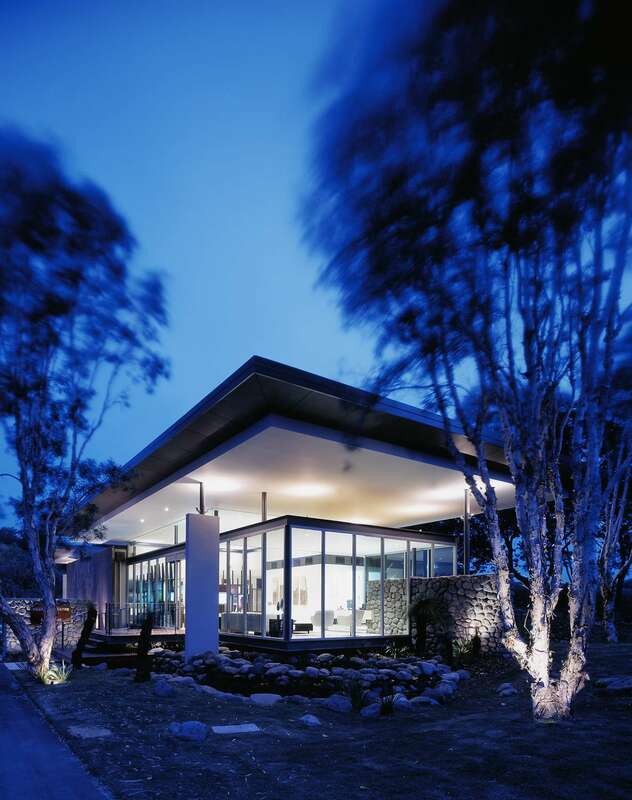 The floating roof is accentuated by effective lighting by night to give the appearance that the whole form floats lightly over the ponds beneath. 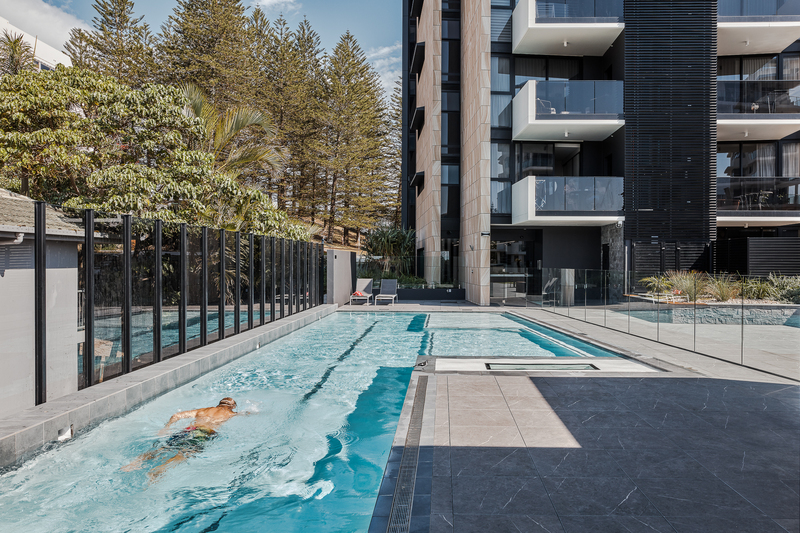 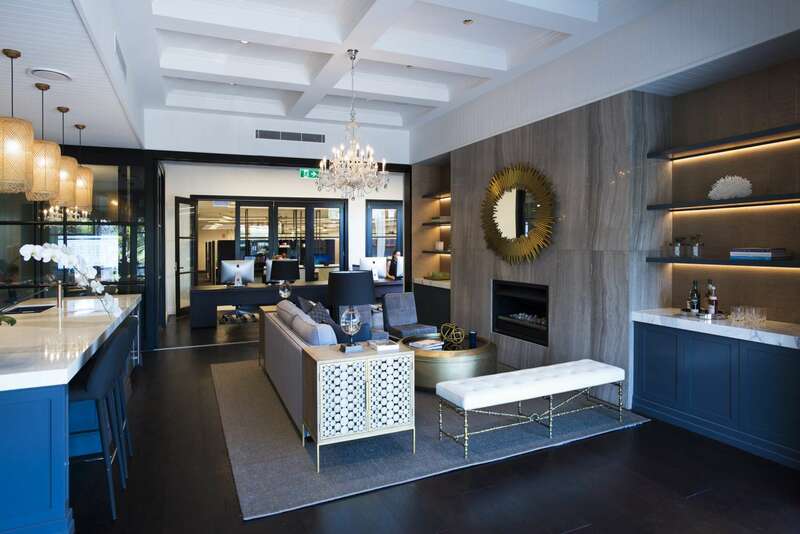 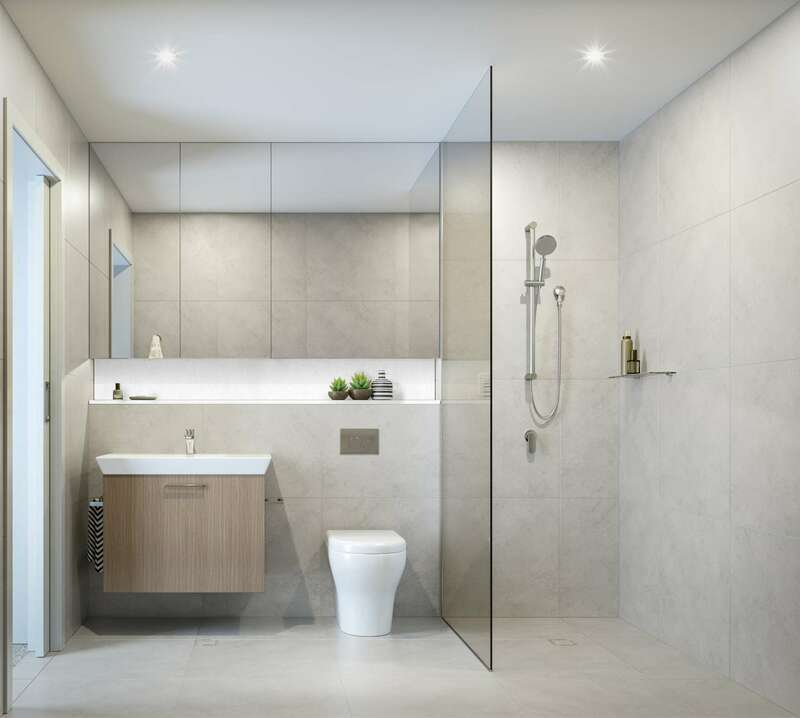 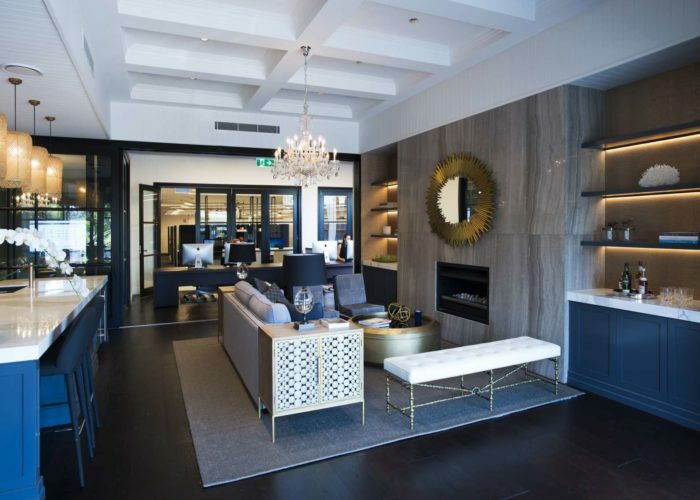 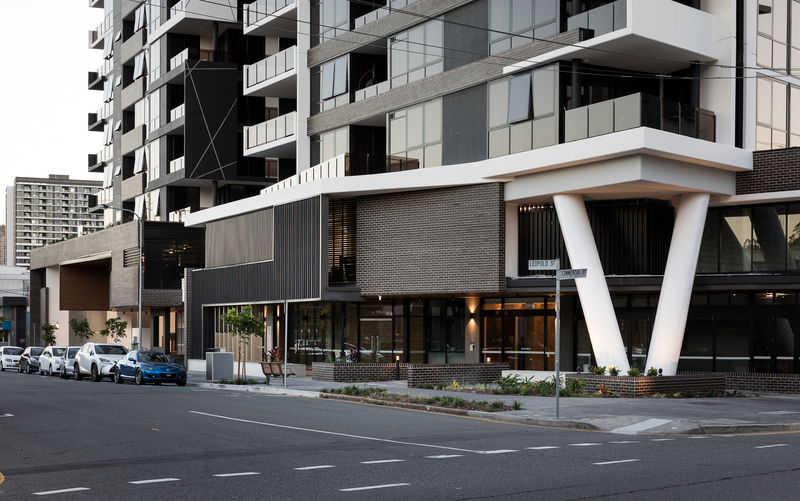 Located in the heart of the well-established Everton Park community, Greystone Terraces responds to a demand for low-maintained high-end living to down-sizing retirees and inner-city professionals. 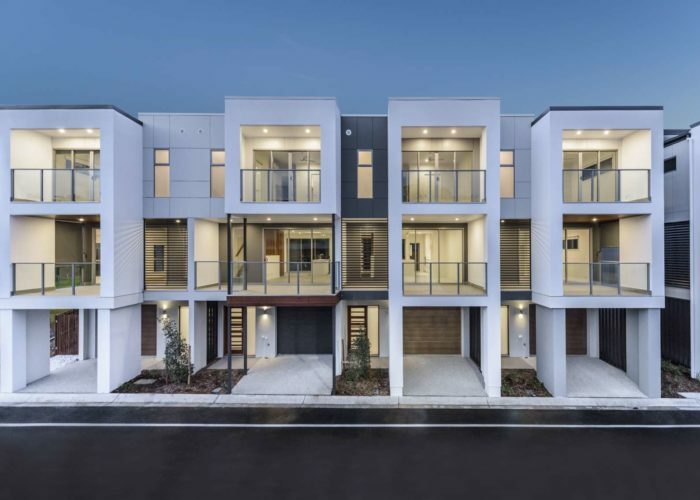 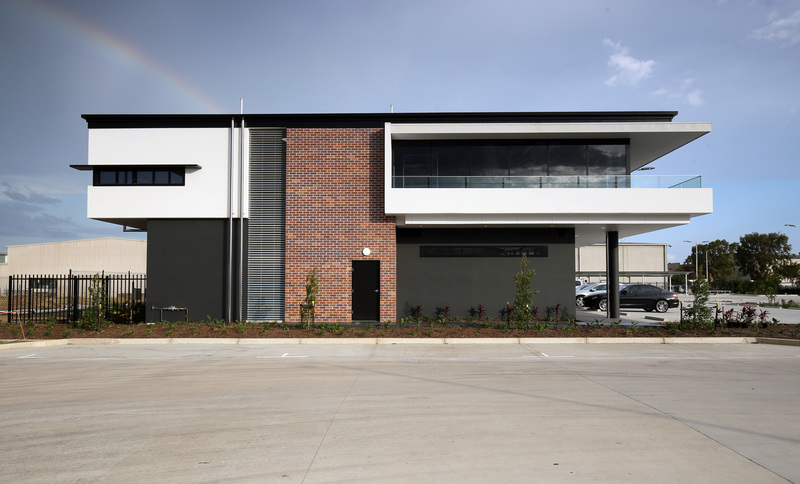 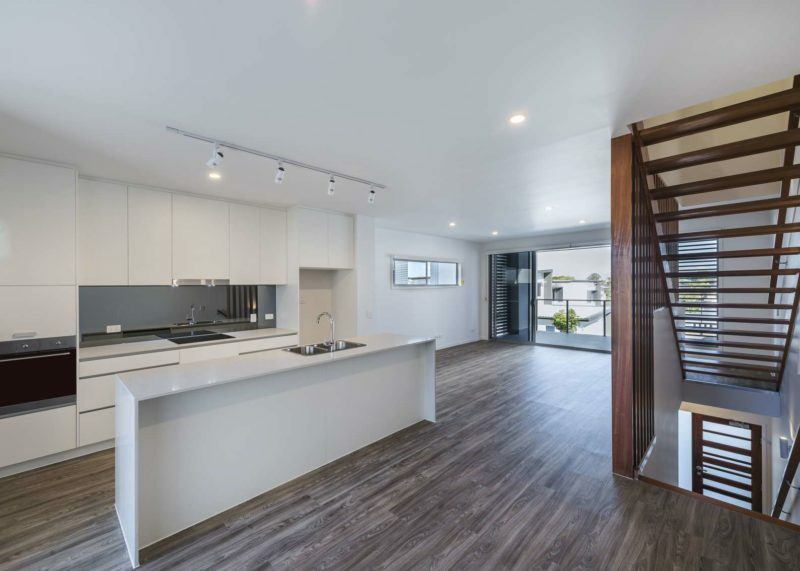 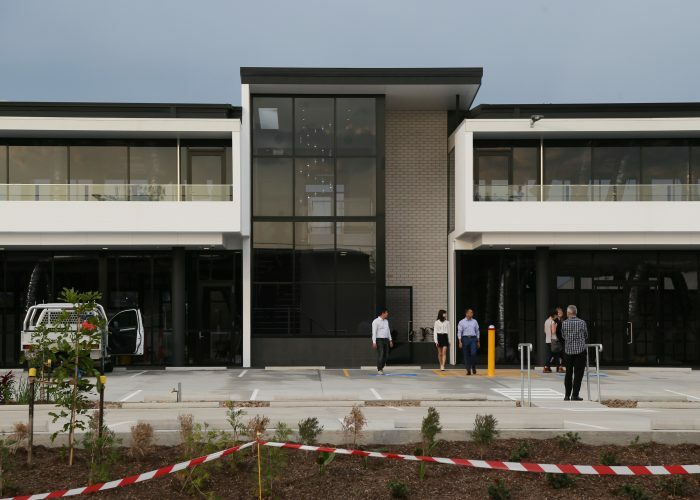 We partnered with Mirvac to provide a varied portfolio of 2, 3 and 4 bedroom homes catering to the varied Everton Park community. 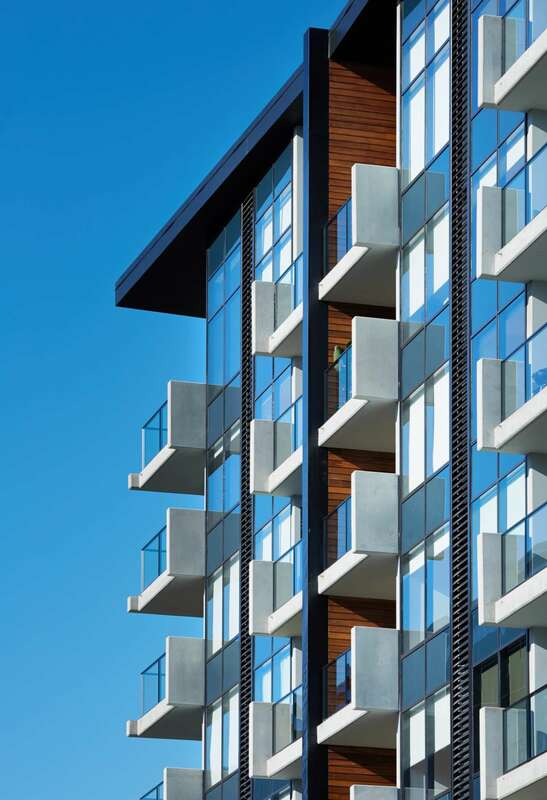 Together, our approach blends elegant, considerate architectural design. 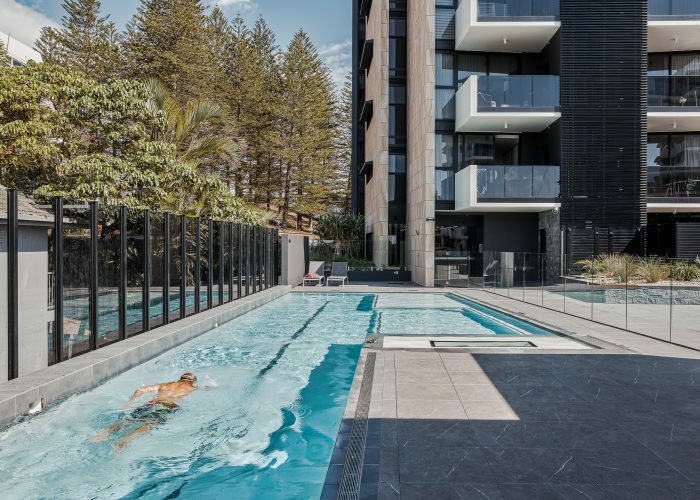 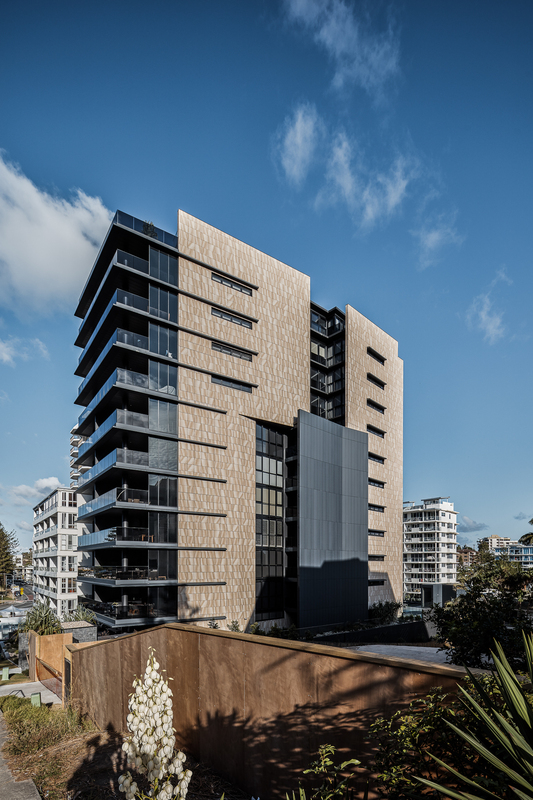 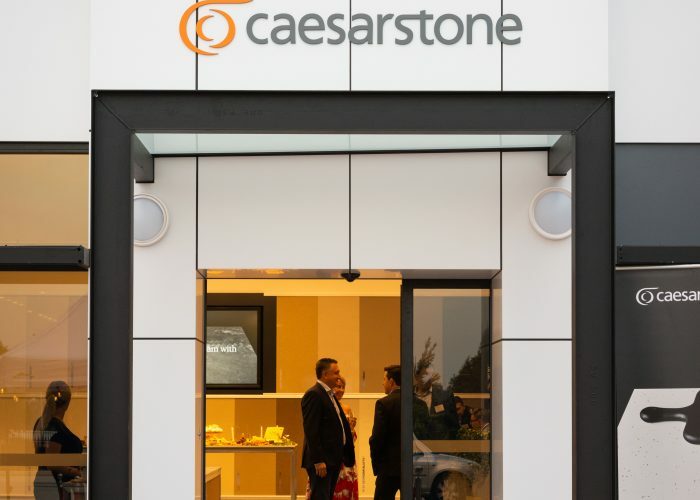 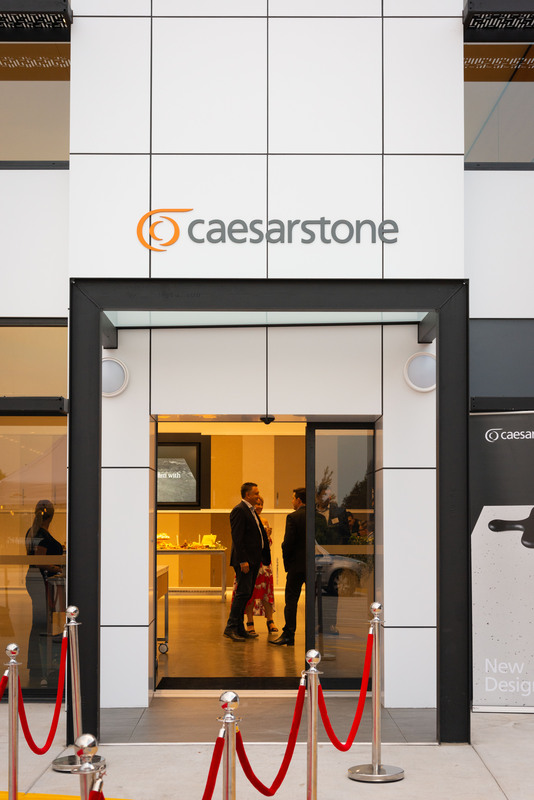 The success of the Greystone Terraces, with all homes sold out within weeks of release, was owed to a close working relationship with the client, consultant team and project builders. 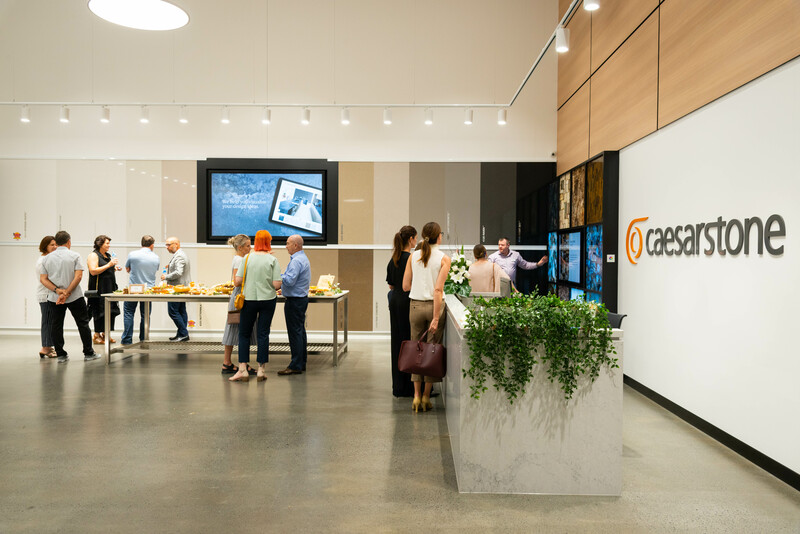 We are thrilled to have been a part of this catalyst project. 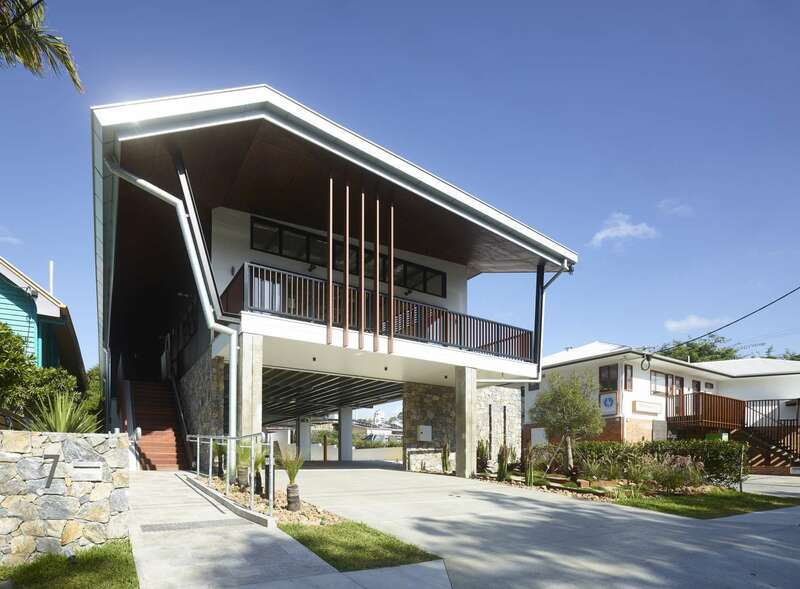 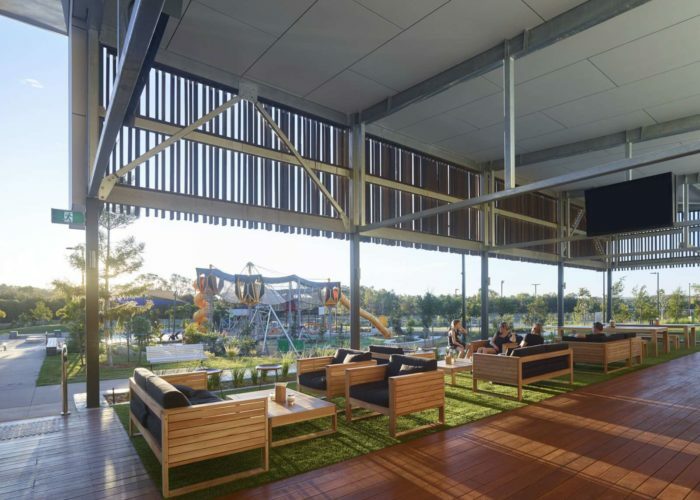 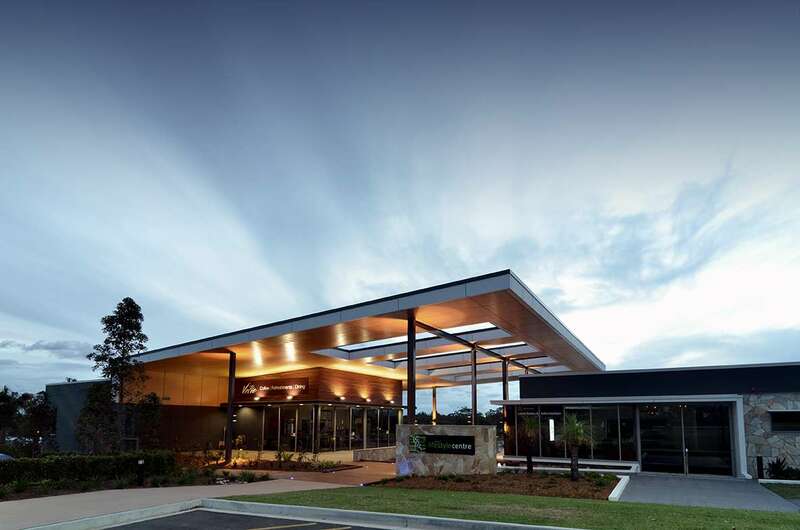 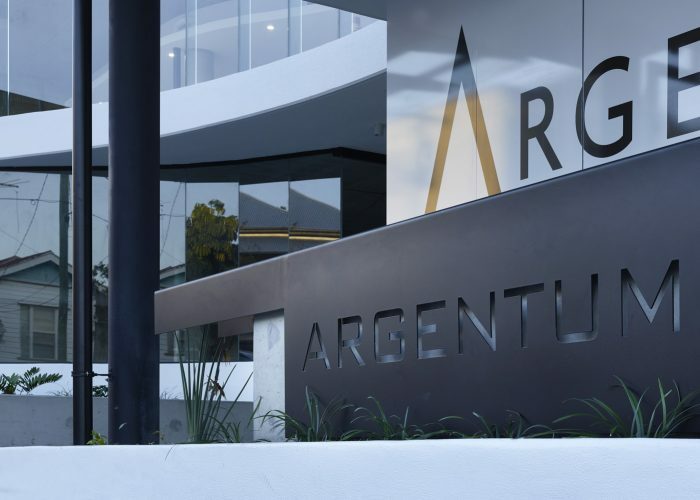 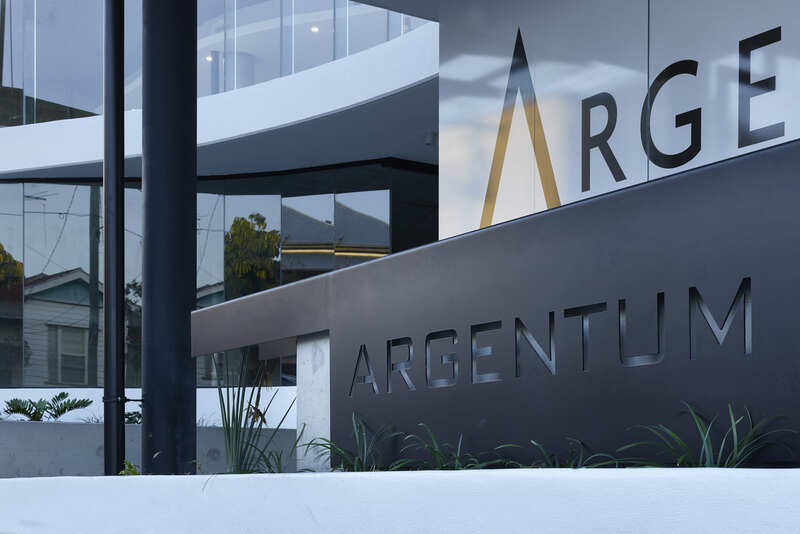 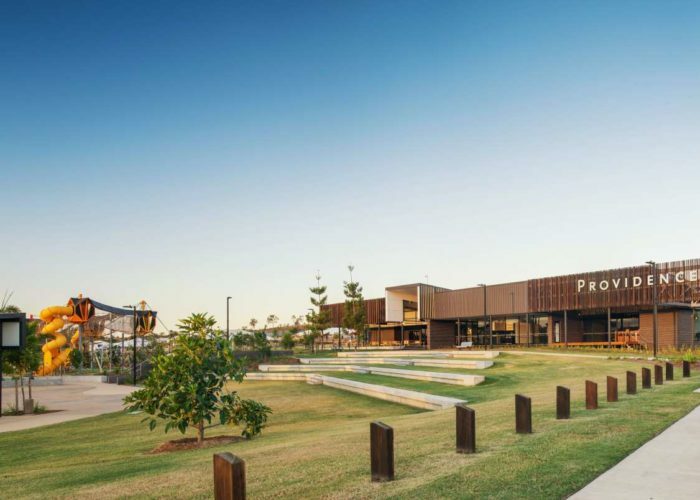 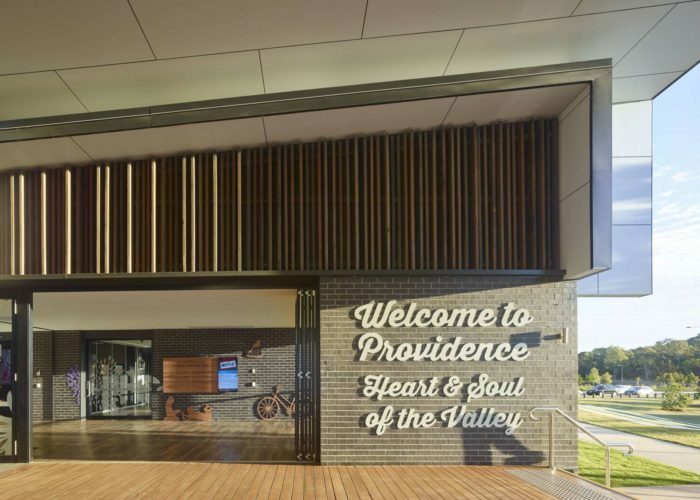 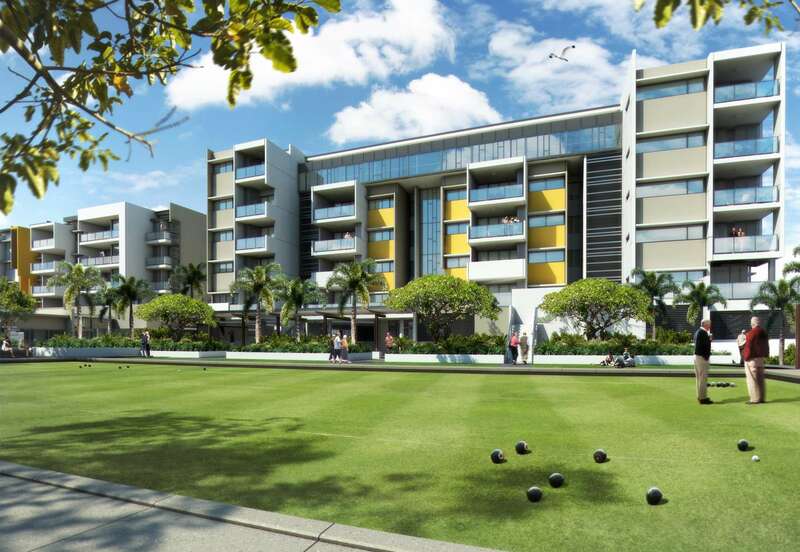 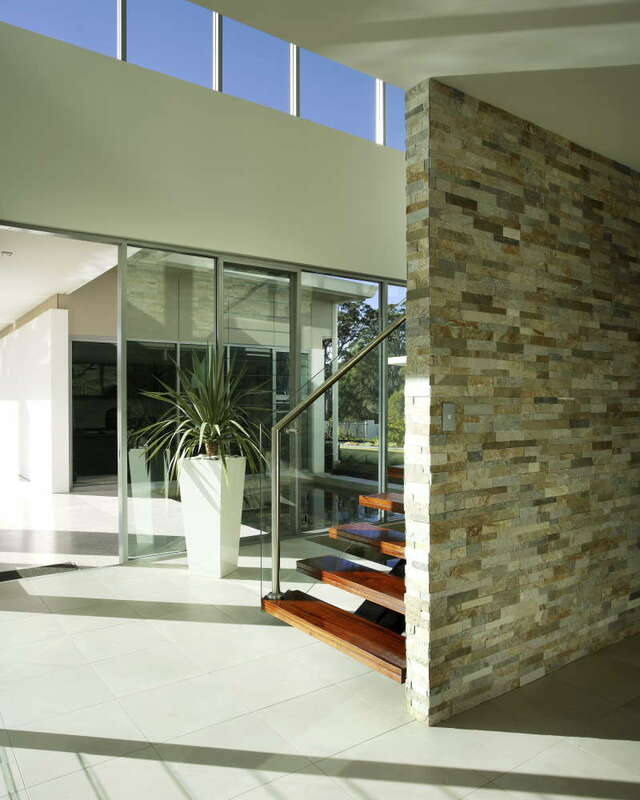 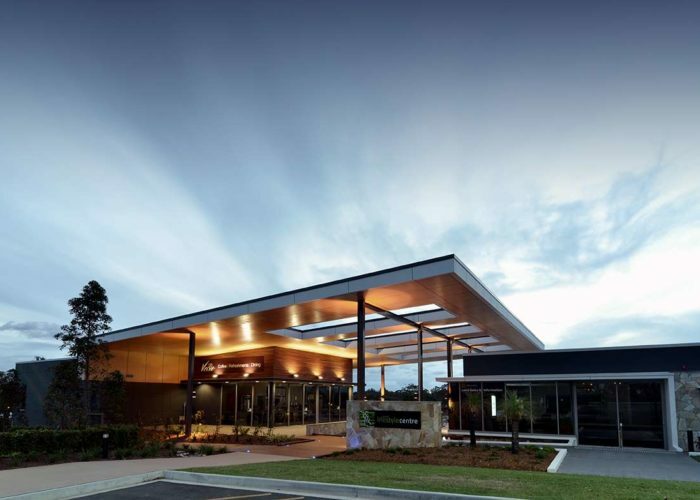 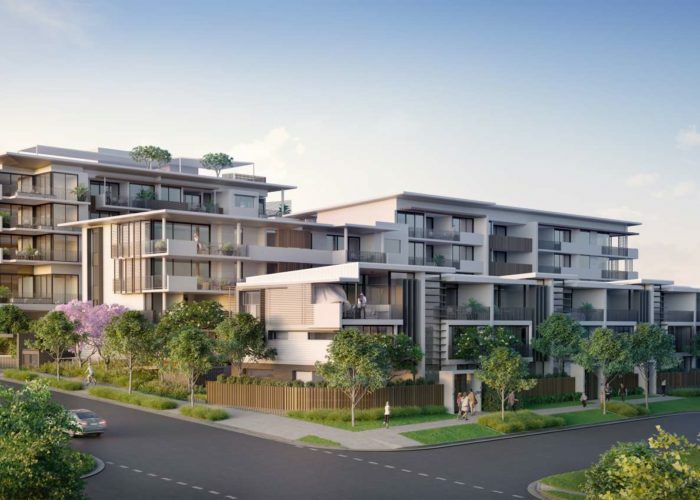 Vantage is located in the Royal Pines Gold Precinct known for its PGA Quality Golf Course and Carrara Stadium. 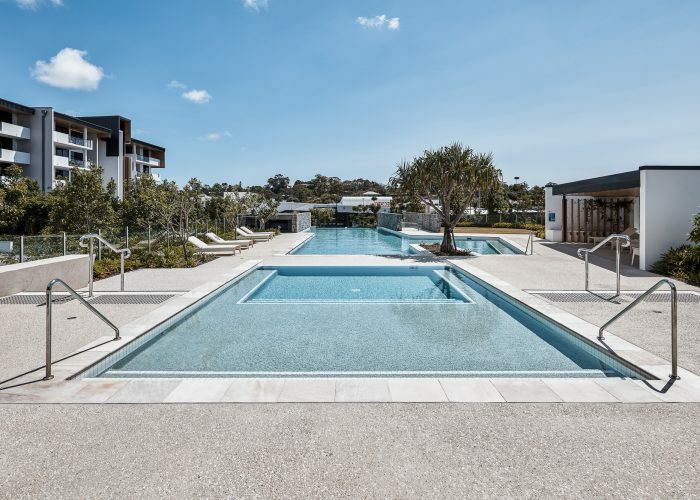 Nestled between Southport and Nerang, residents enjoy the close proximity to major Gold Coast hot spots and major golf courses, while also having a peaceful buffer away from the hustle and bustle. 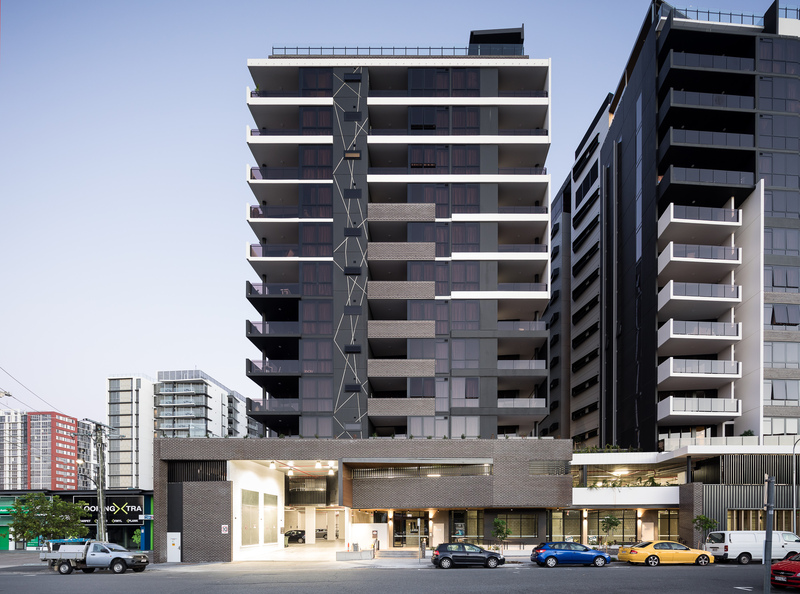 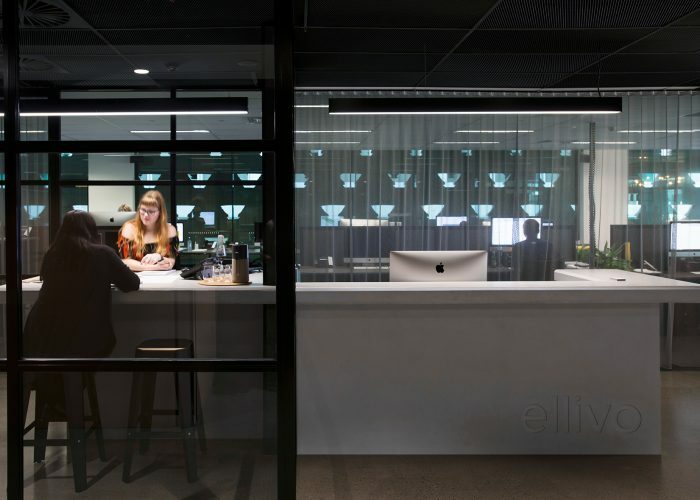 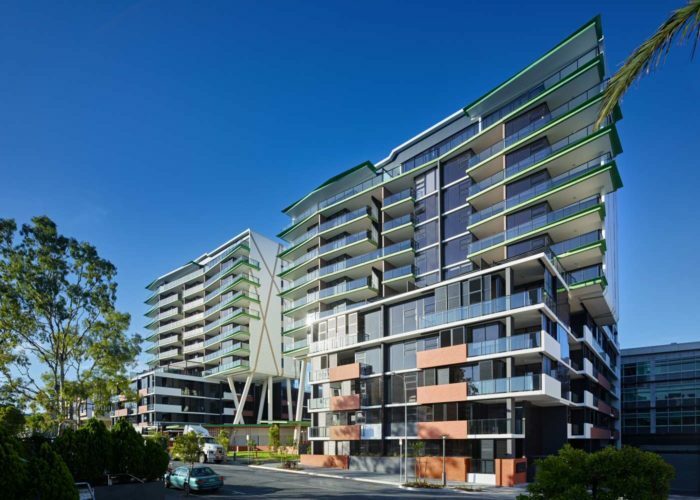 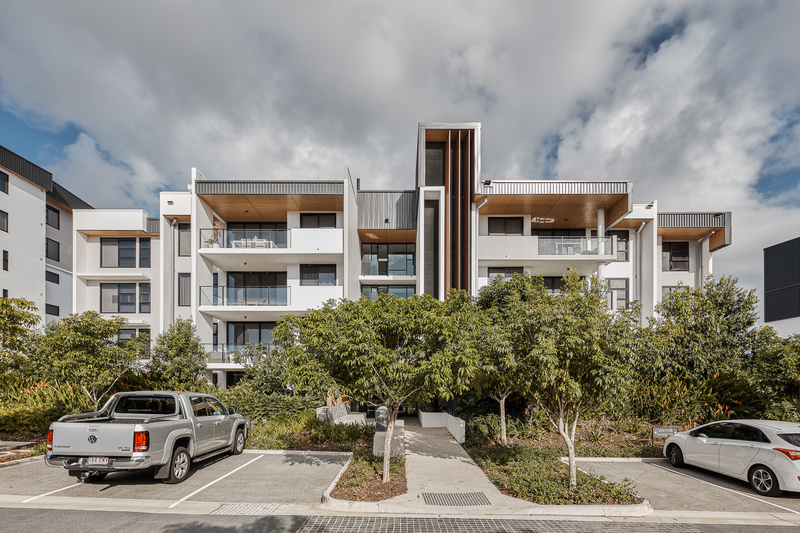 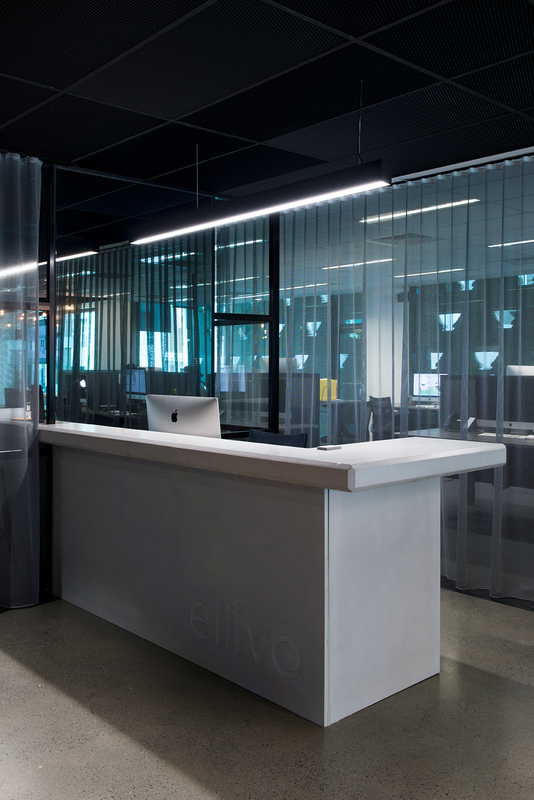 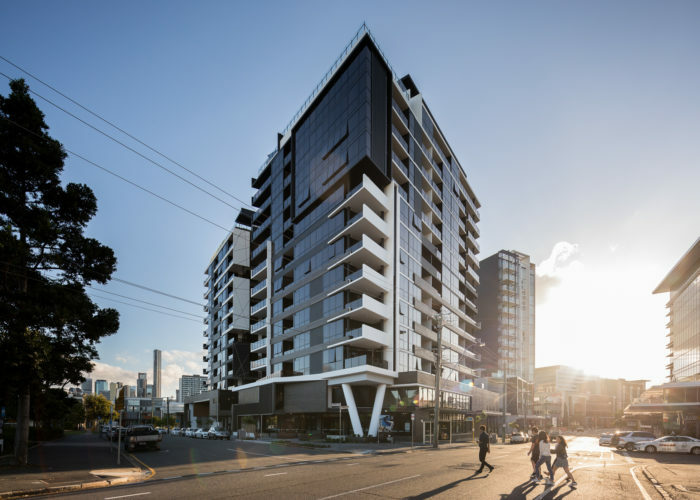 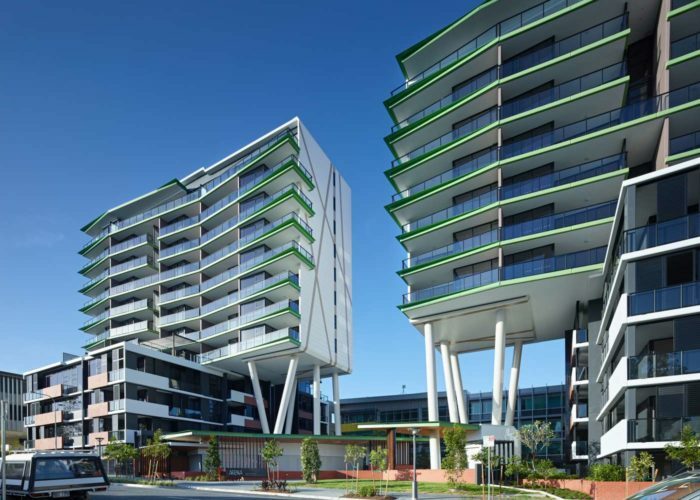 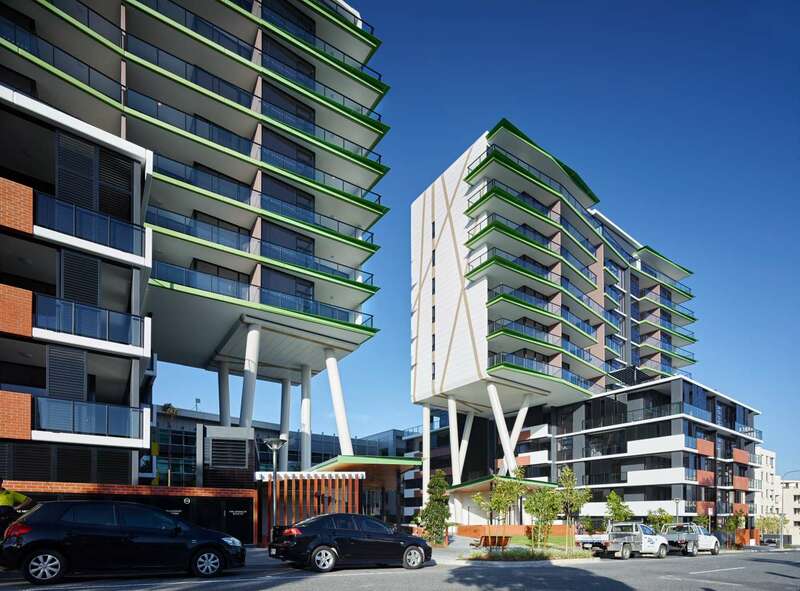 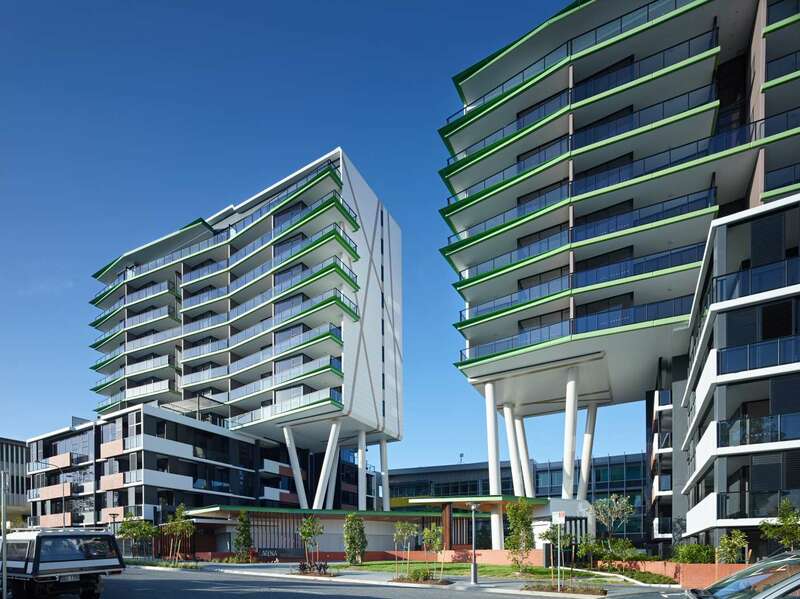 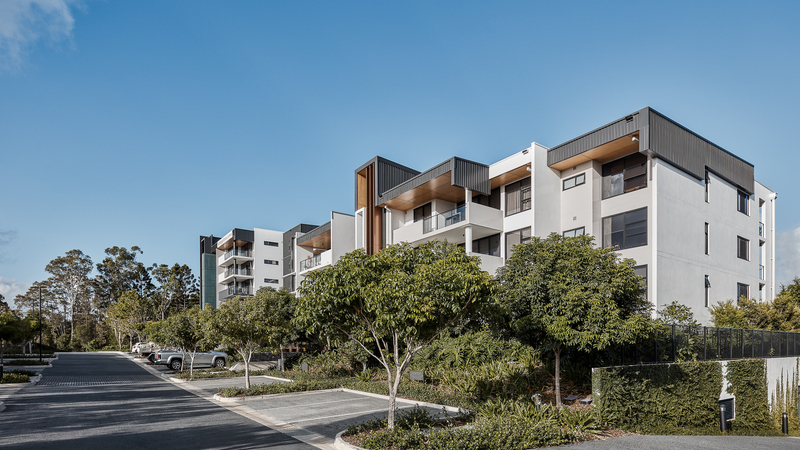 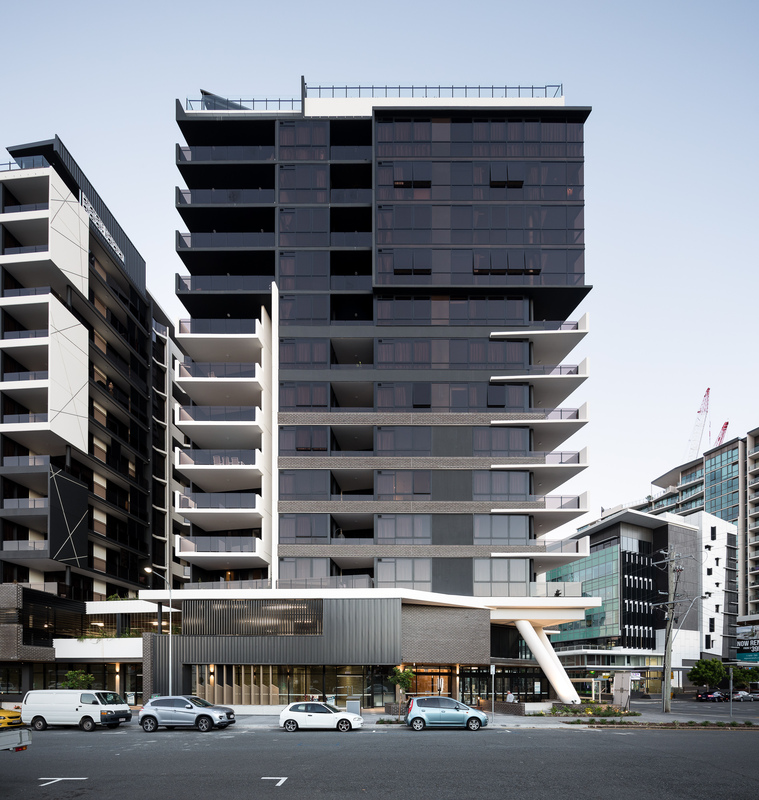 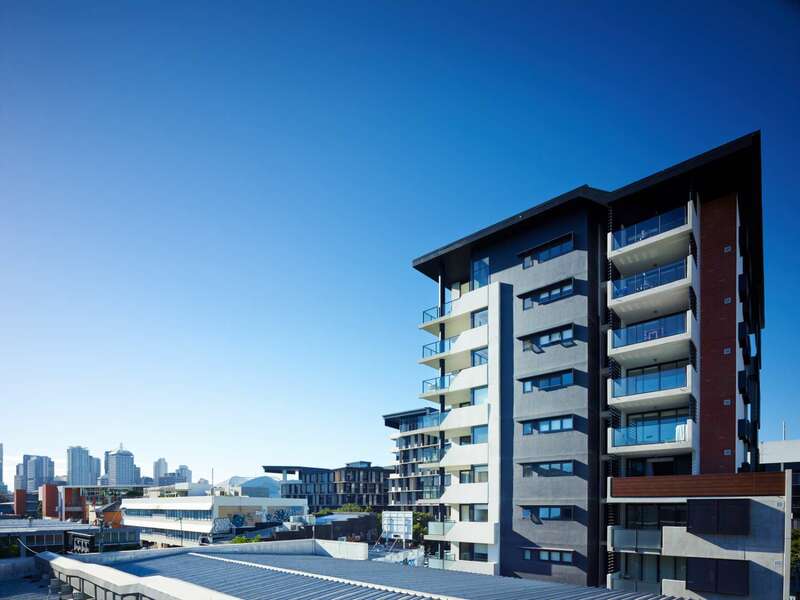 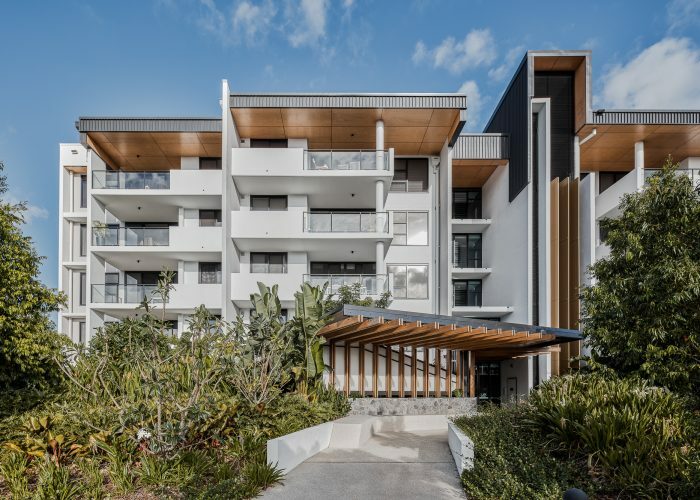 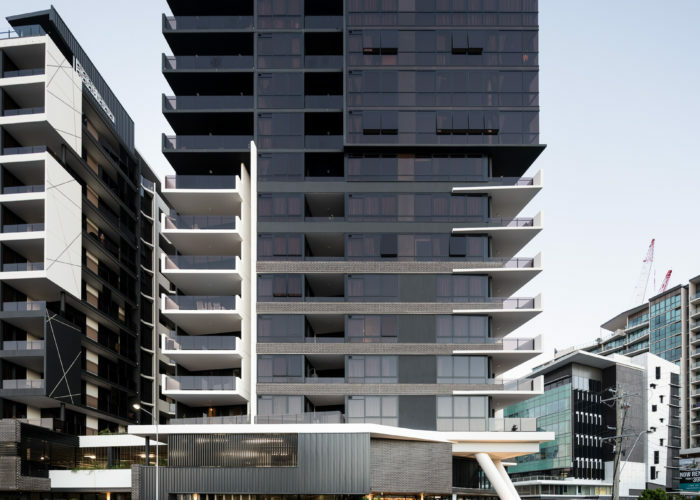 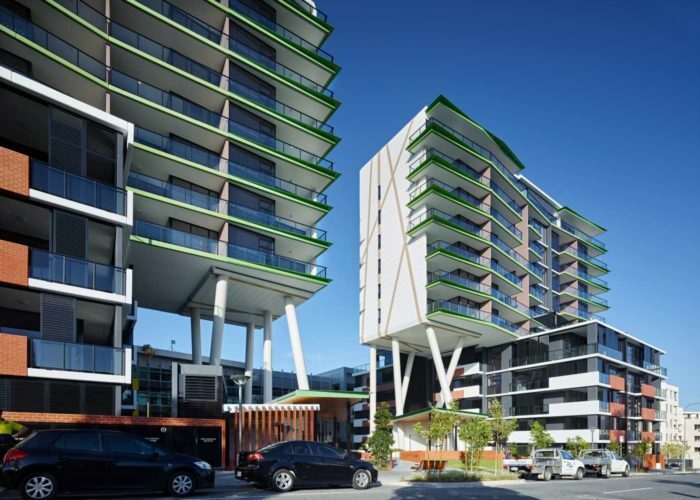 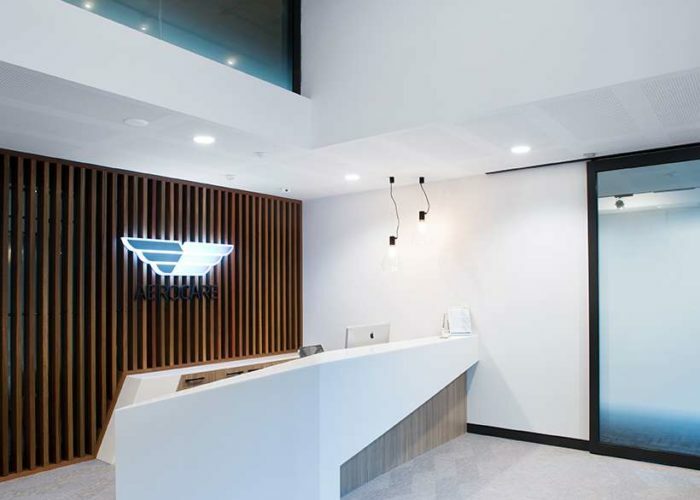 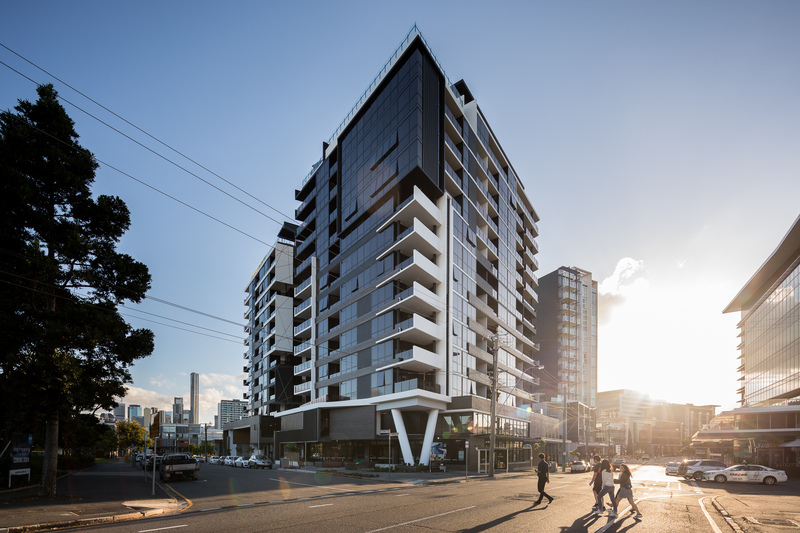 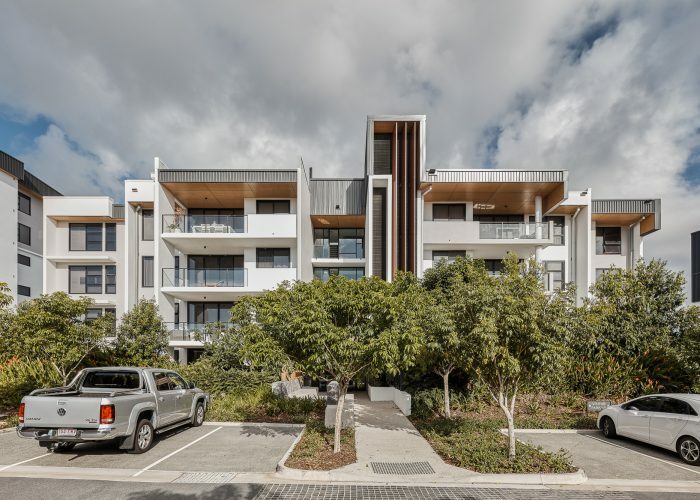 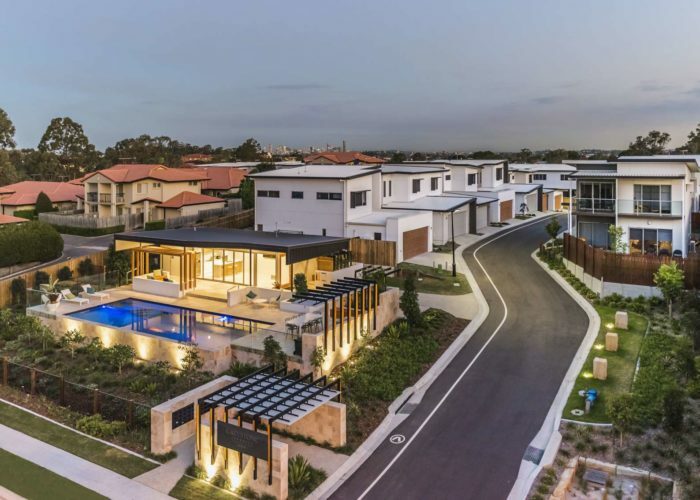 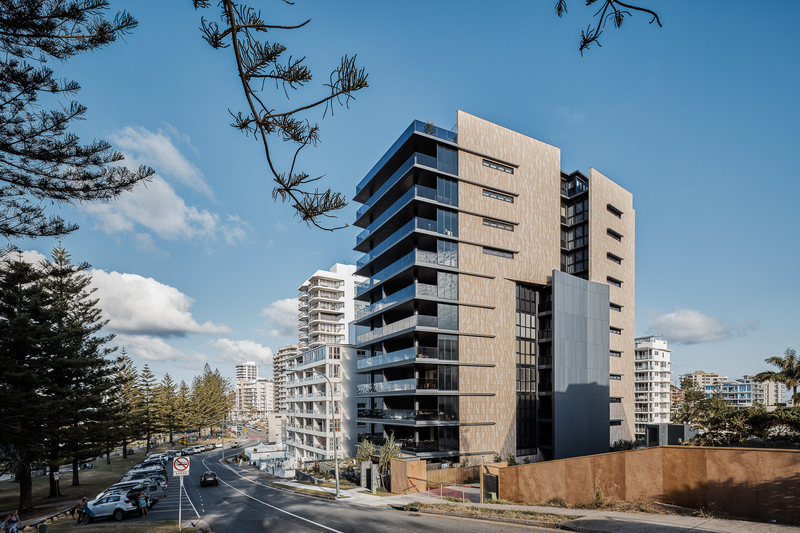 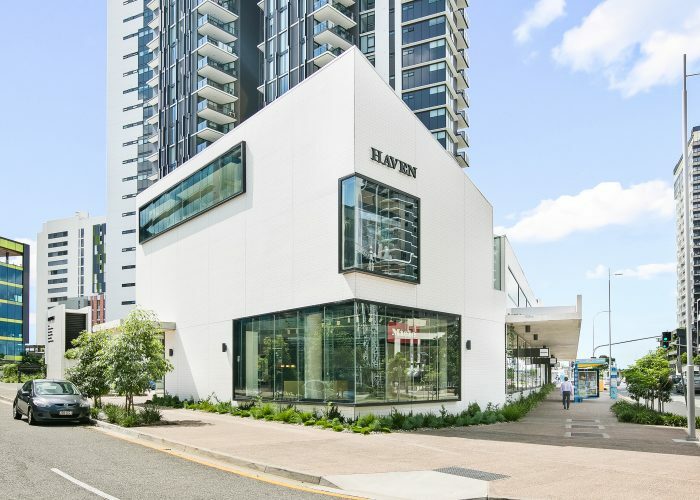 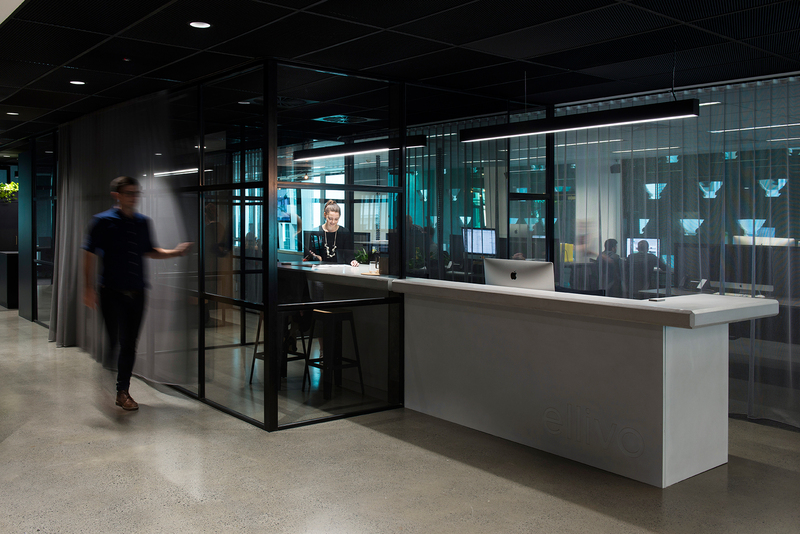 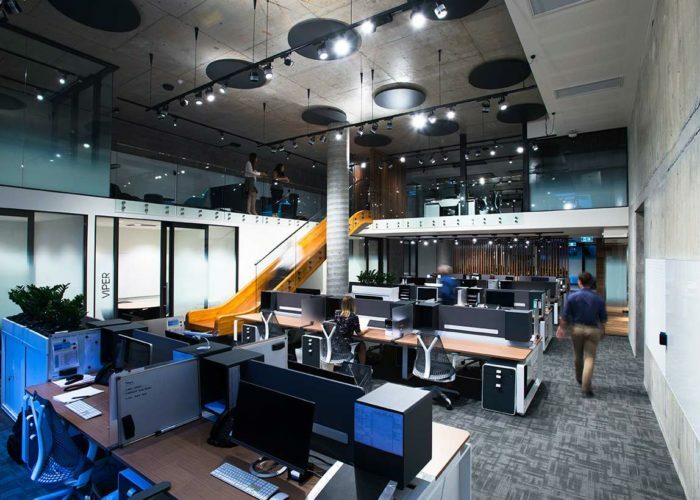 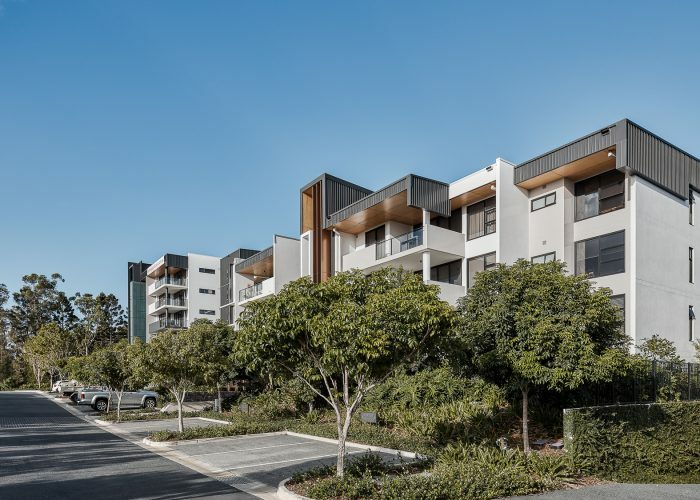 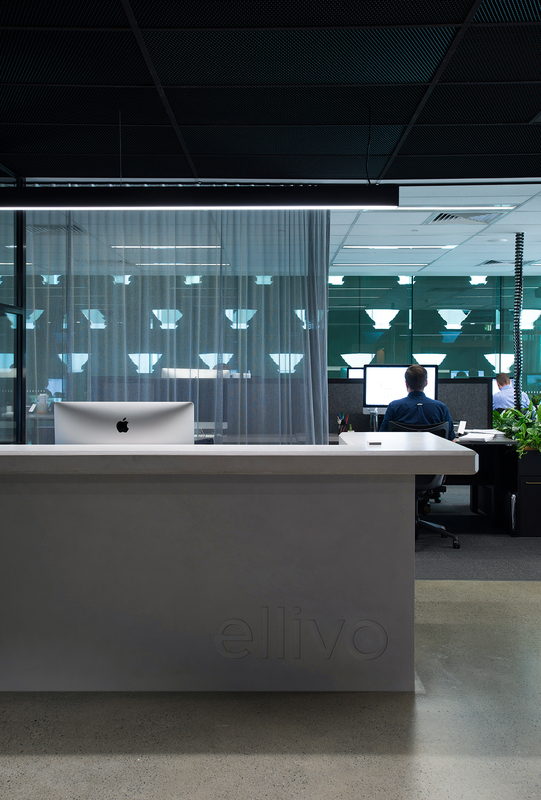 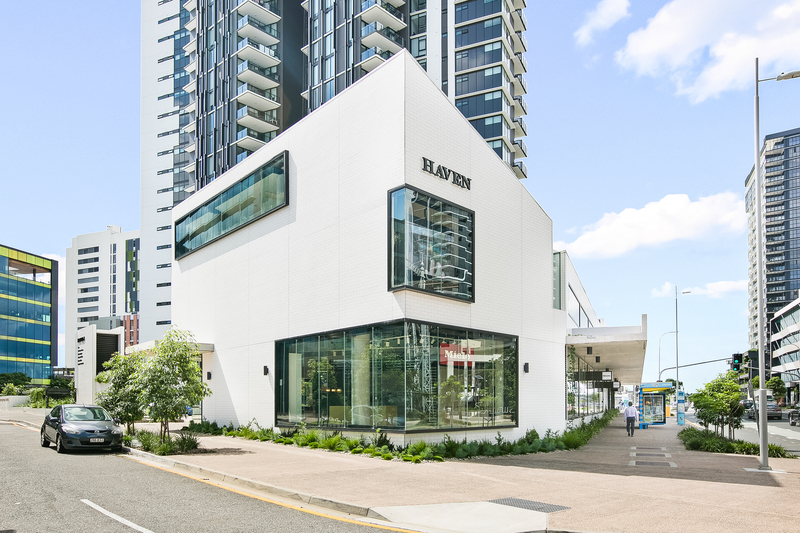 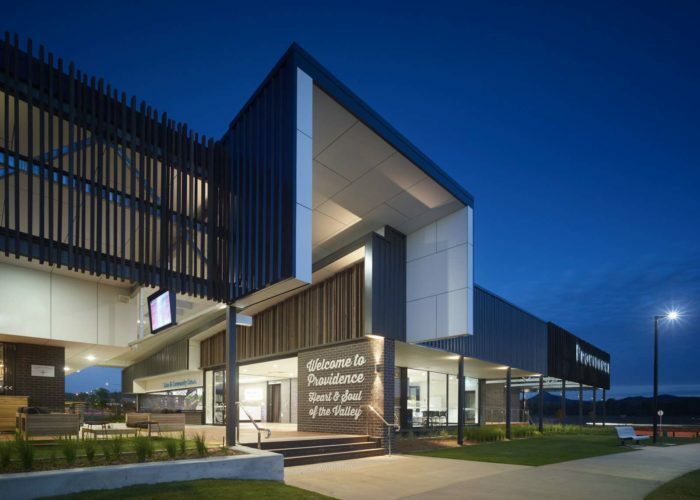 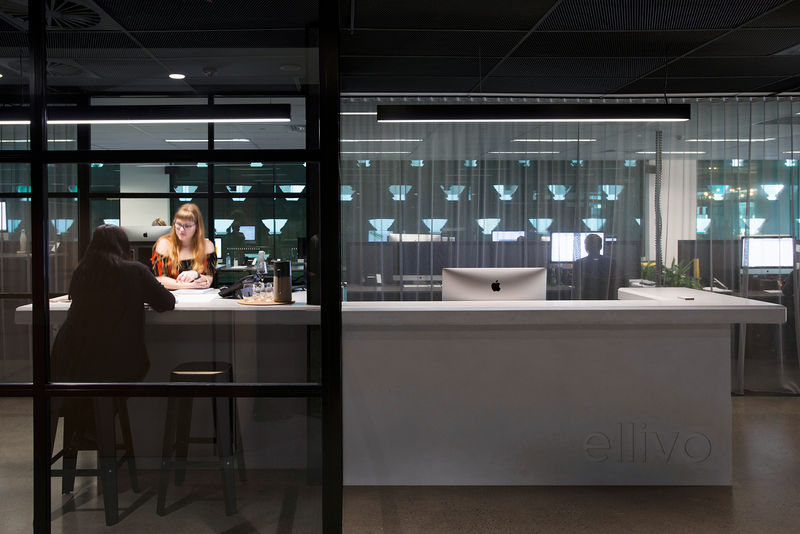 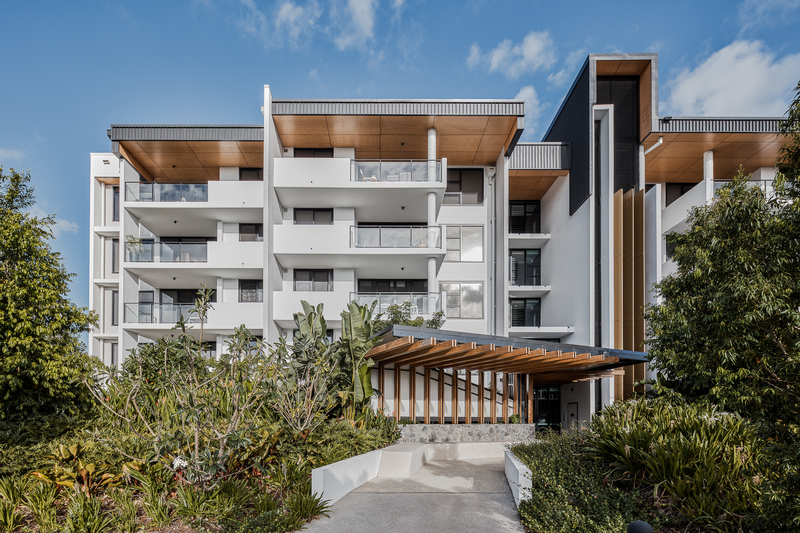 Ellivo partnered with the Rayjon Property Group, to maximise the potential area’s nature assets and create a rich community for people to live in. 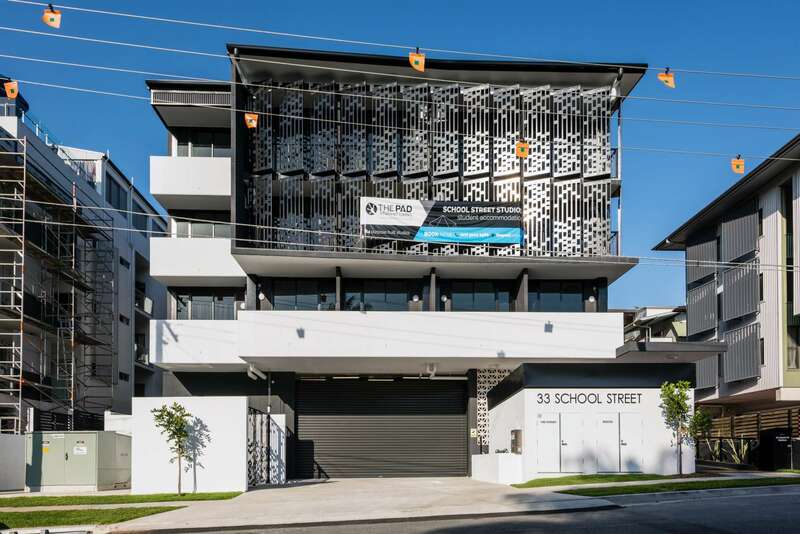 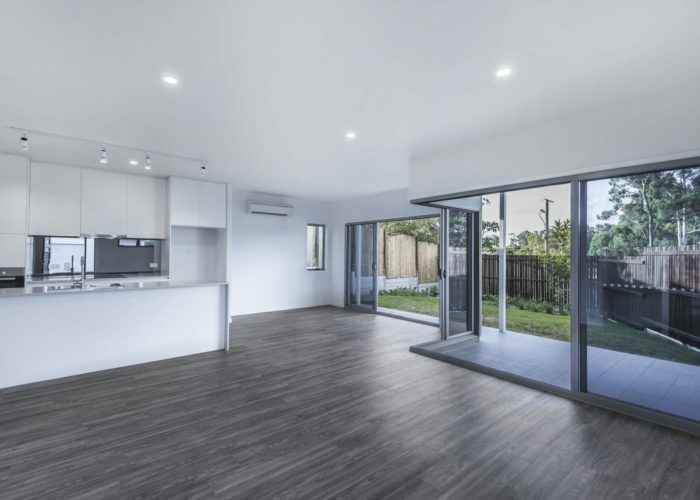 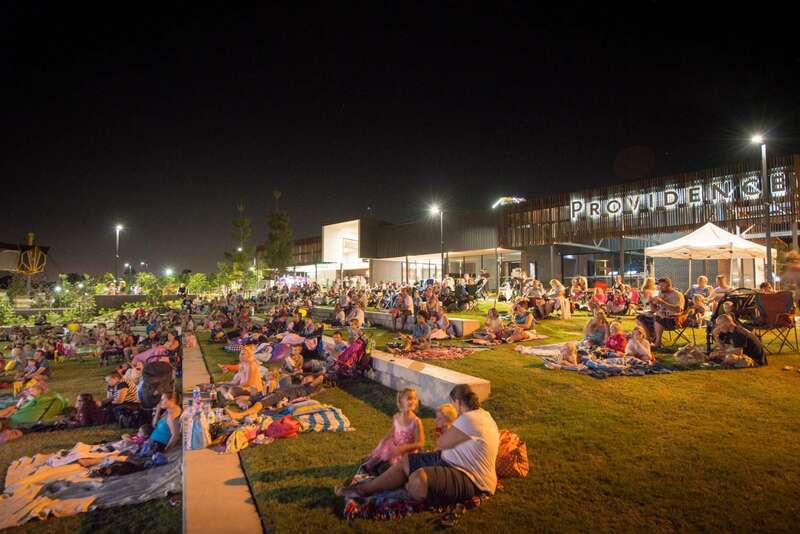 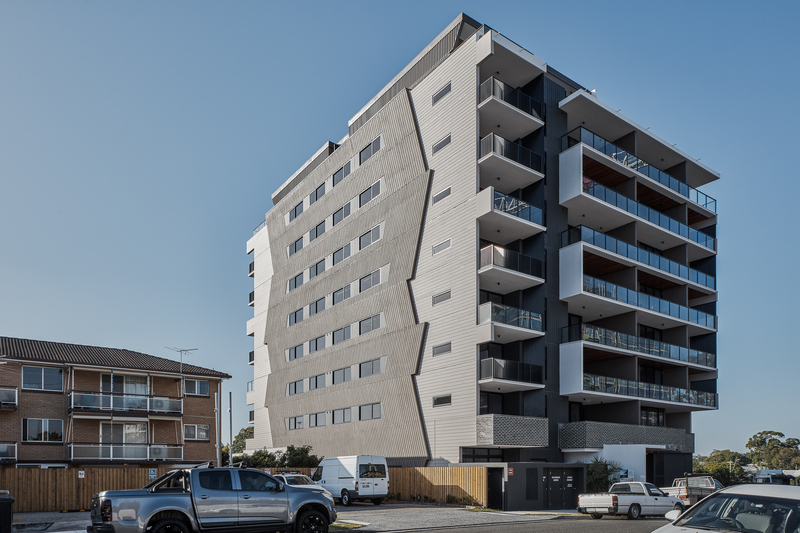 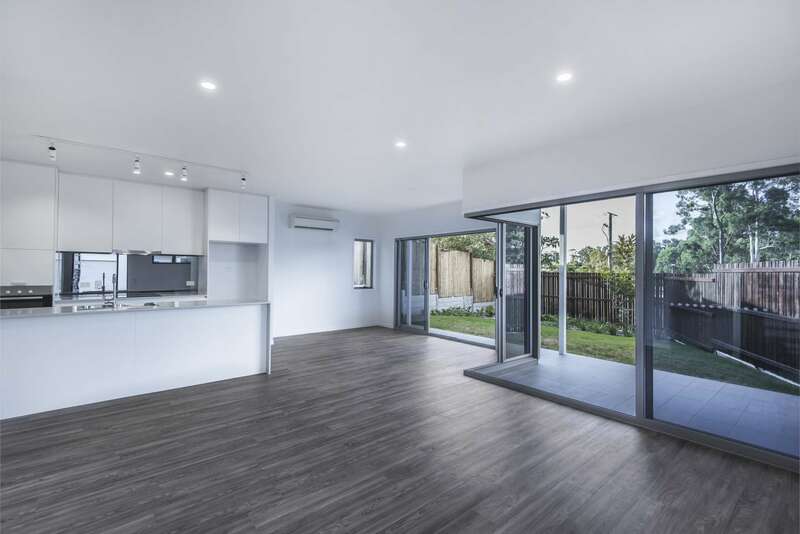 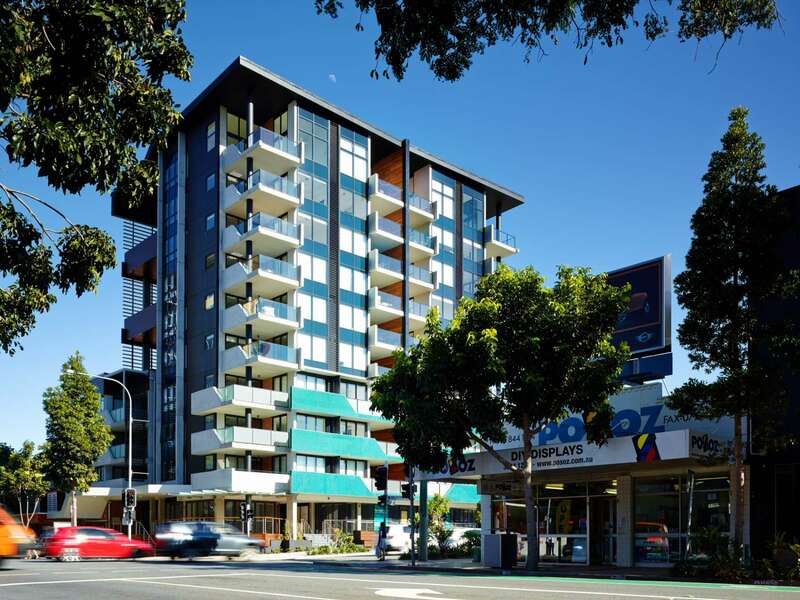 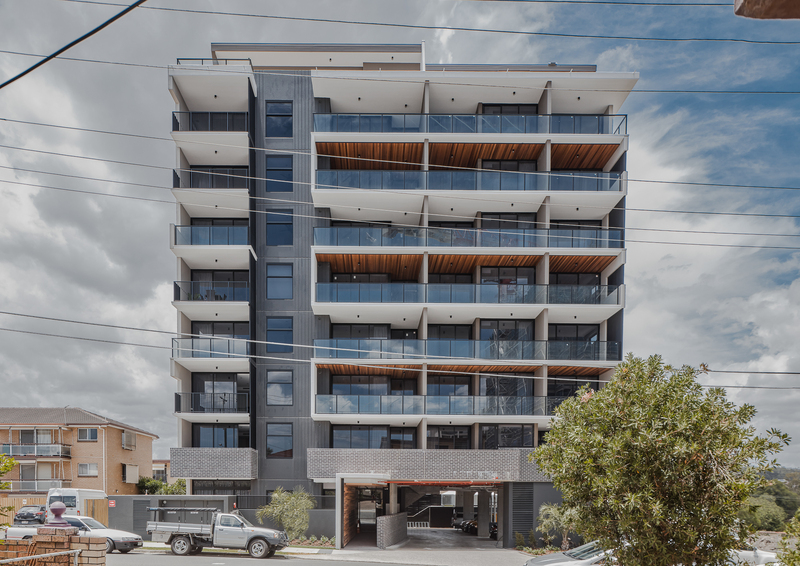 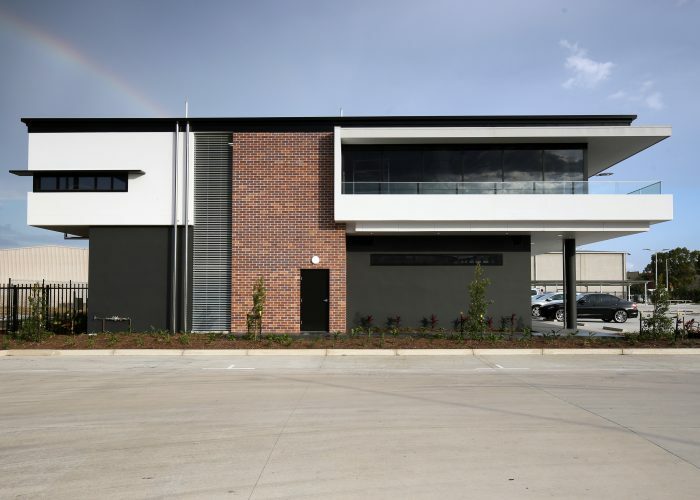 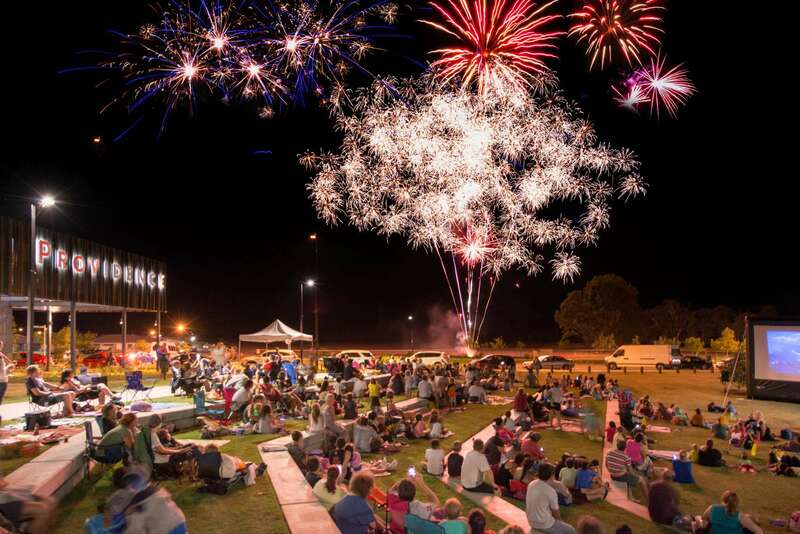 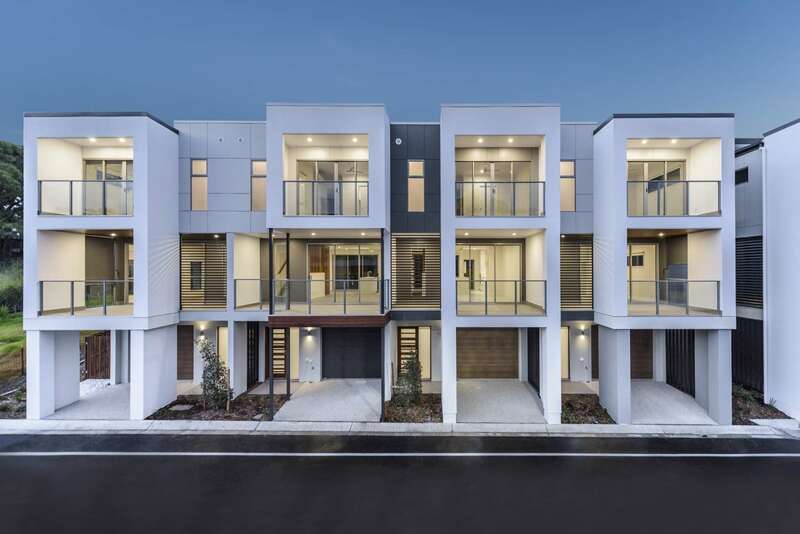 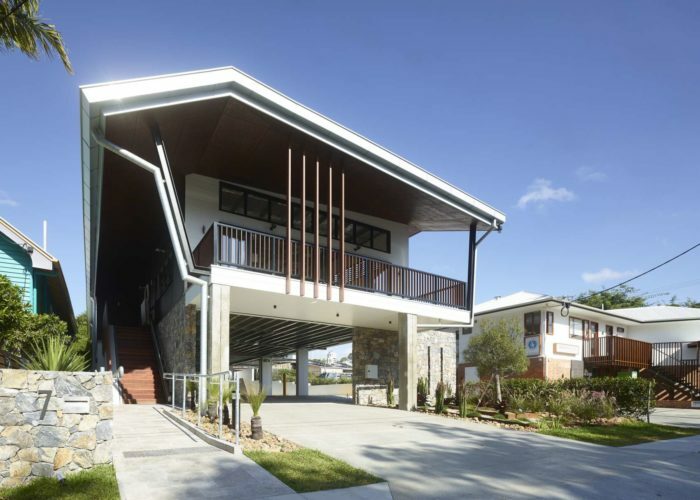 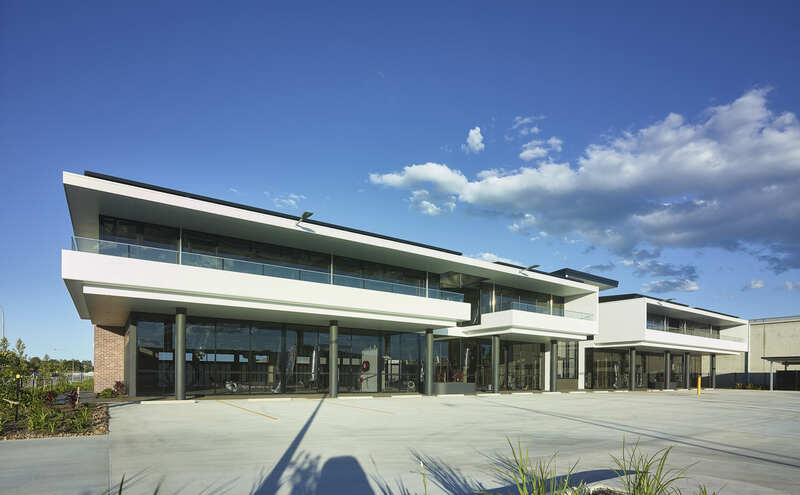 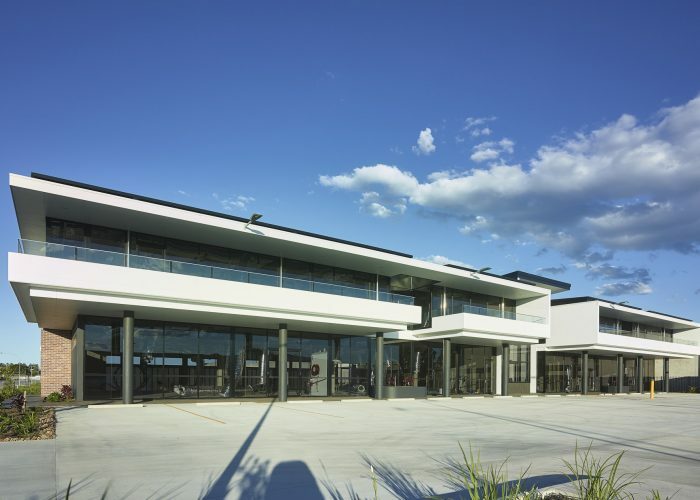 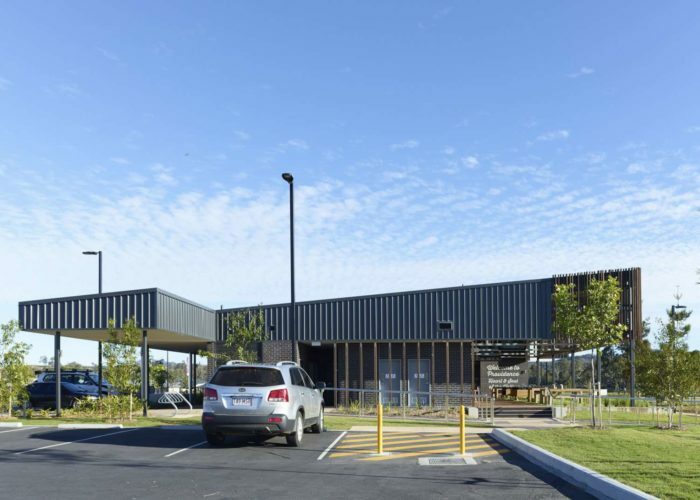 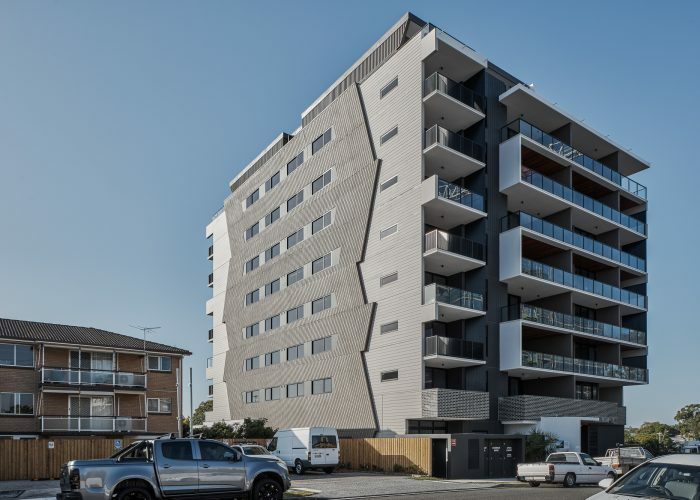 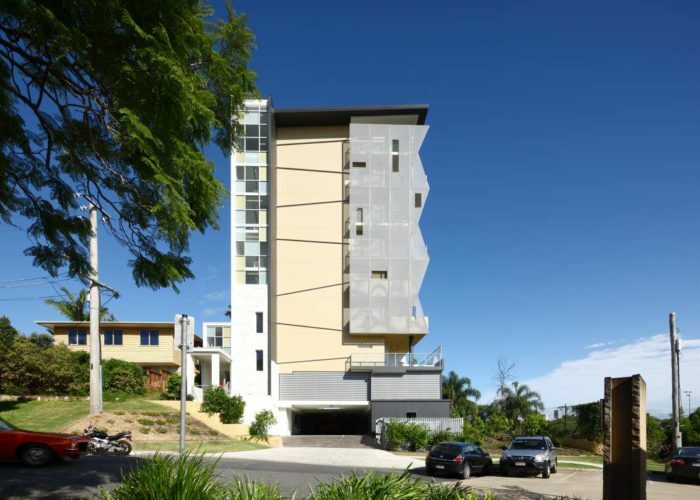 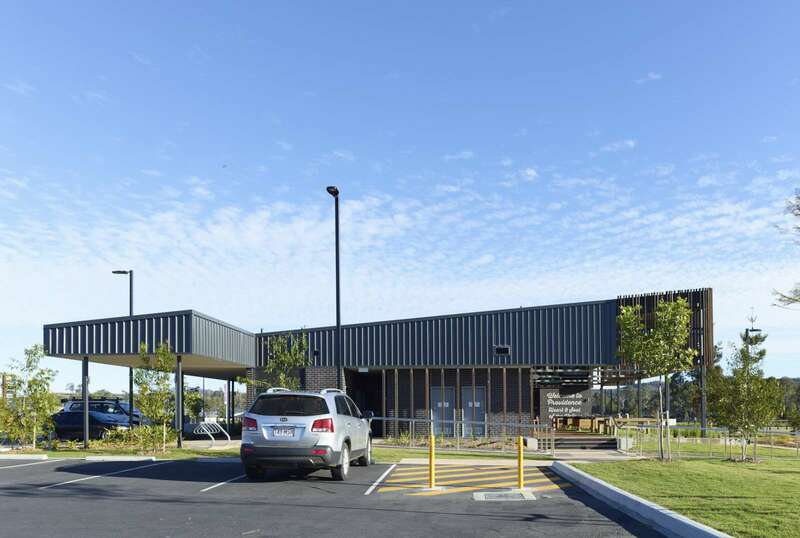 Less than five kilometres from Brisbane CBD, Stones Corner is a well-connected inner south-eastern suburb of the city nestled between Greenslopes and Woolloongabba. 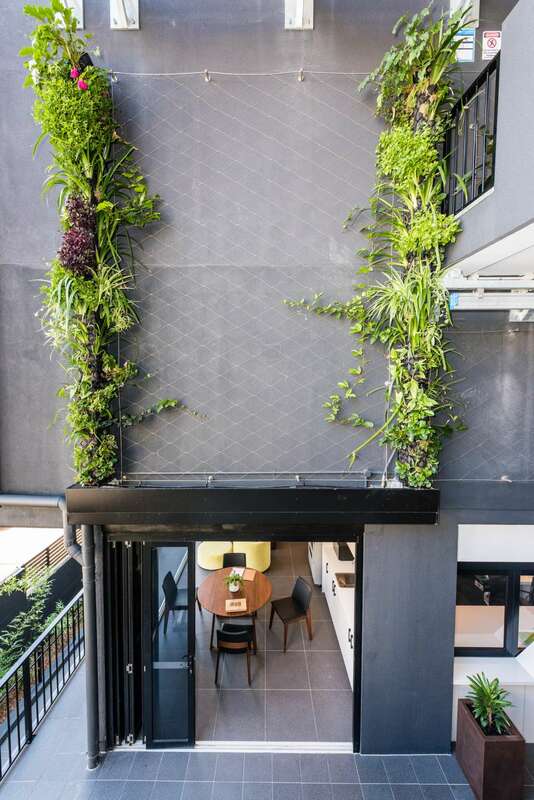 With a strong history, this gazetted nook is growing as a cultural and lifestyle precinct. 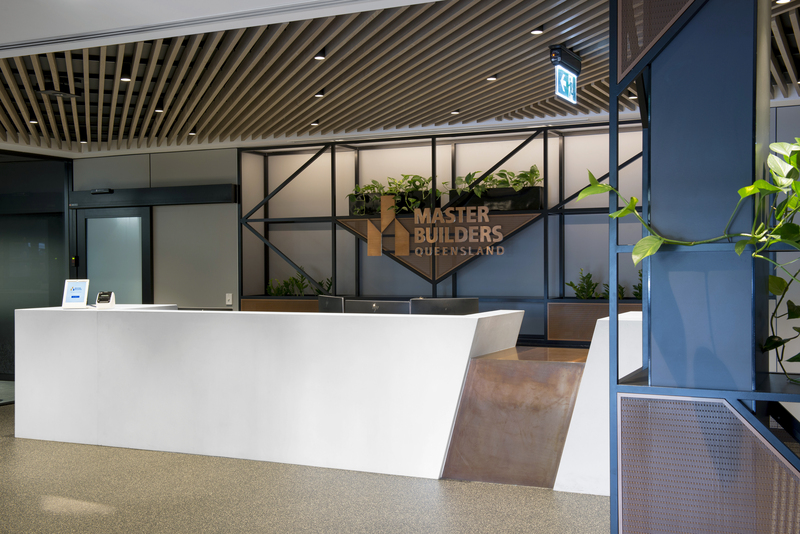 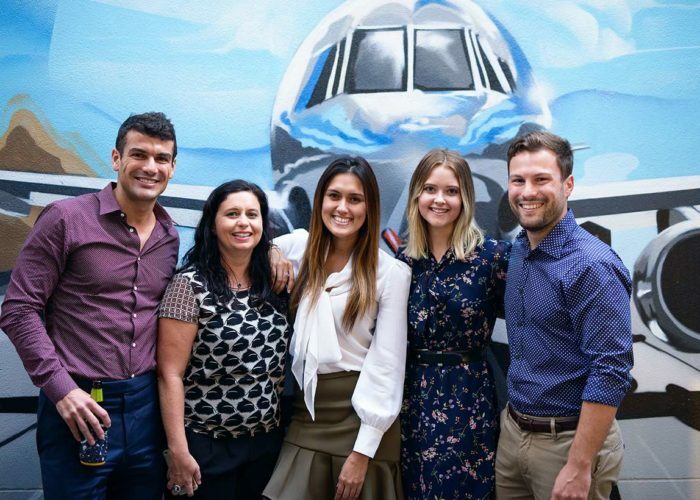 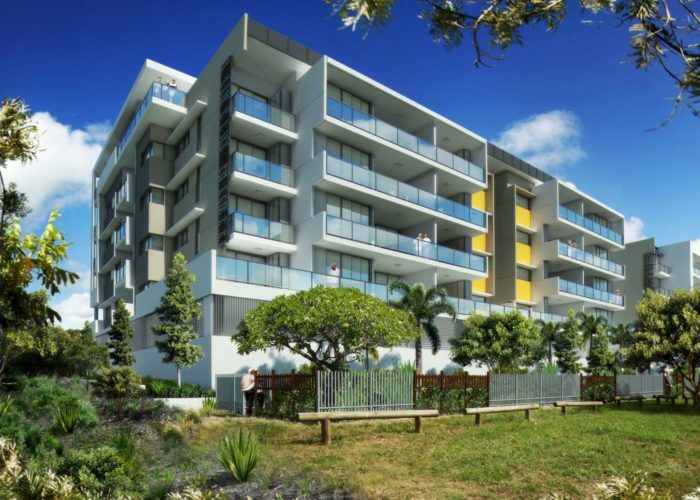 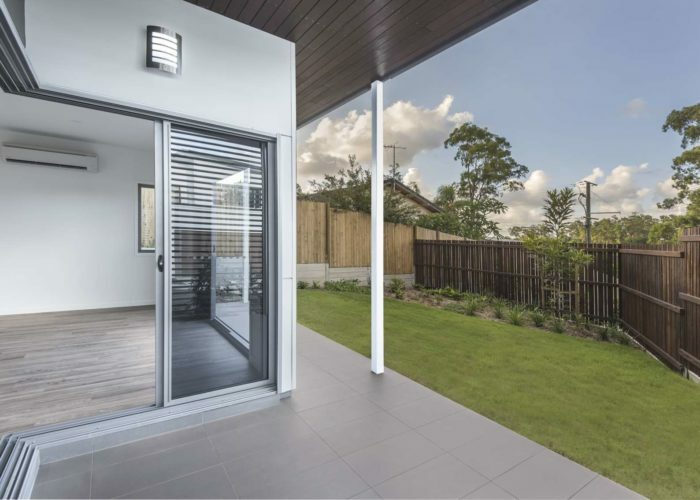 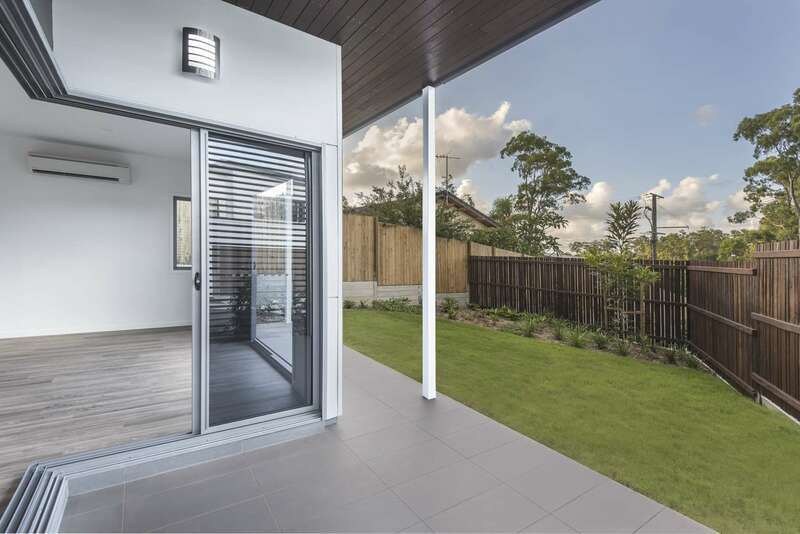 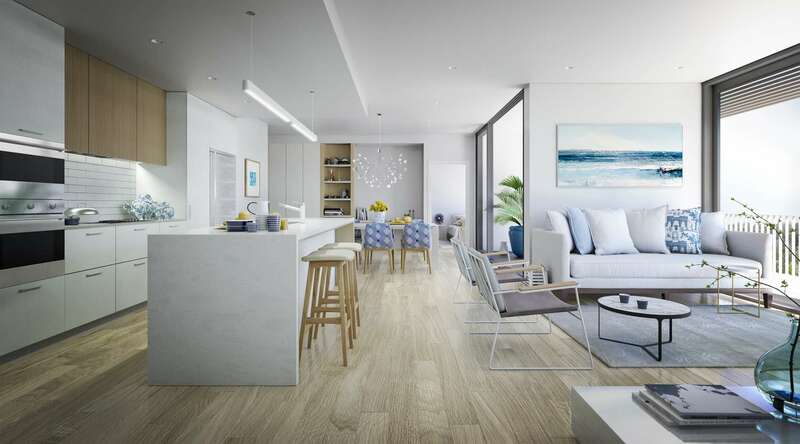 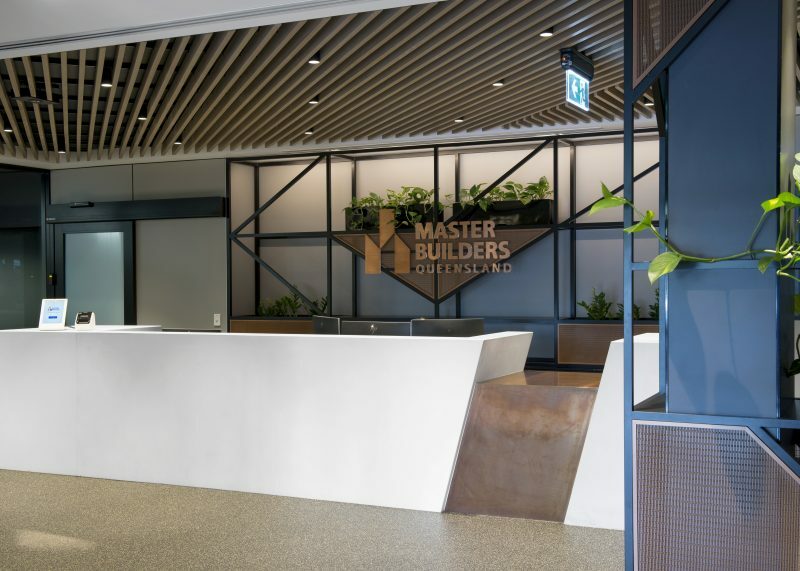 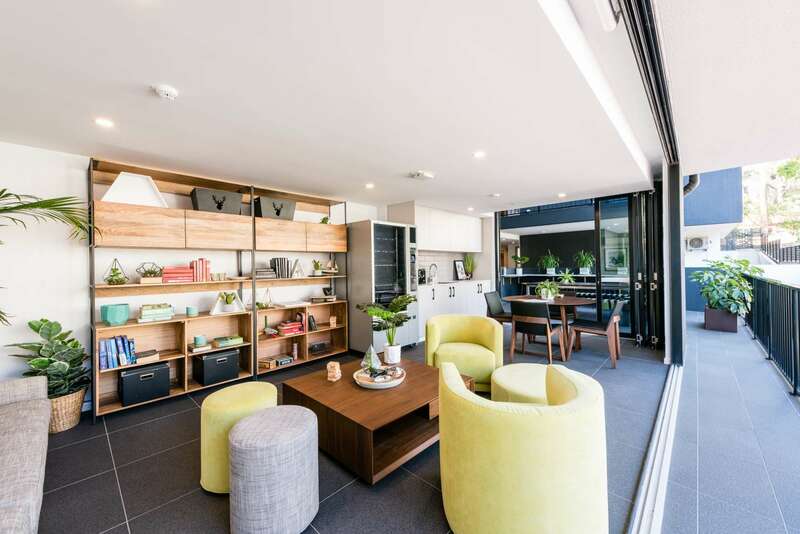 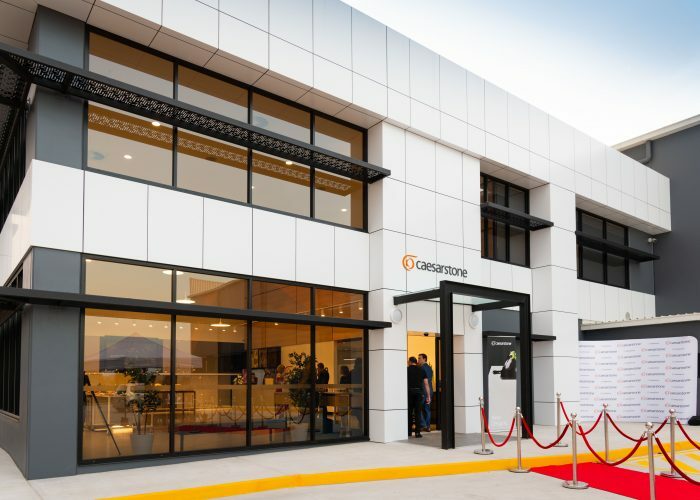 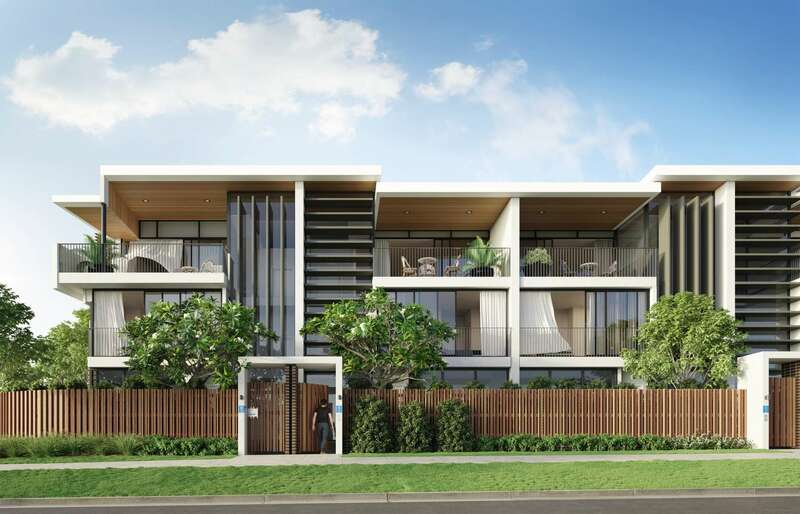 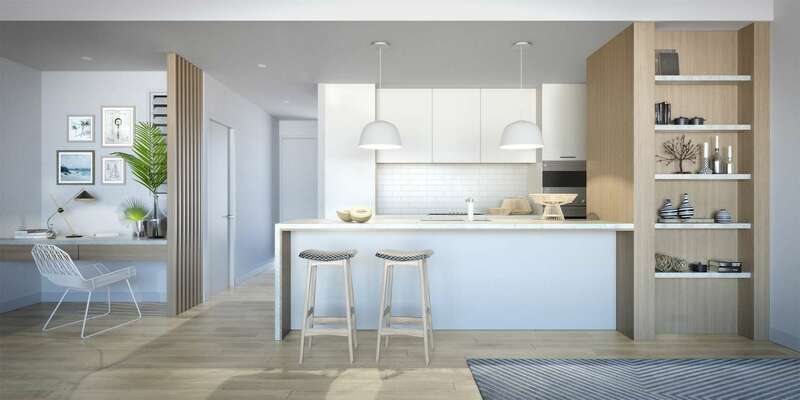 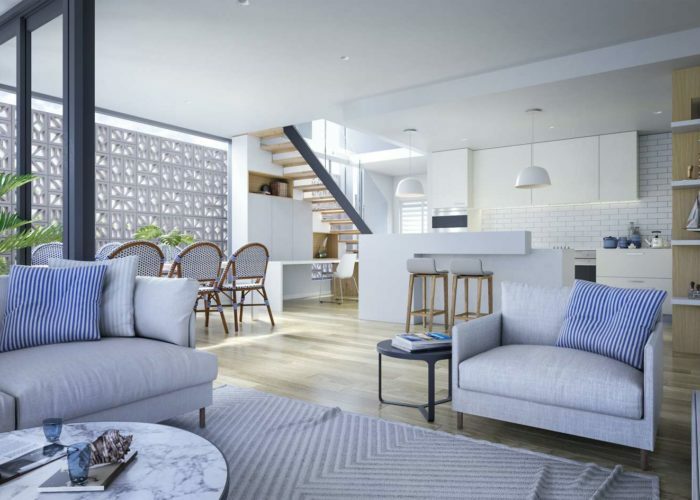 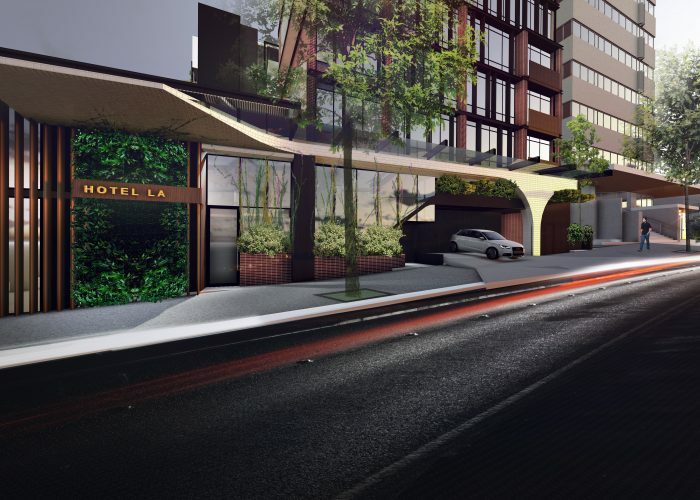 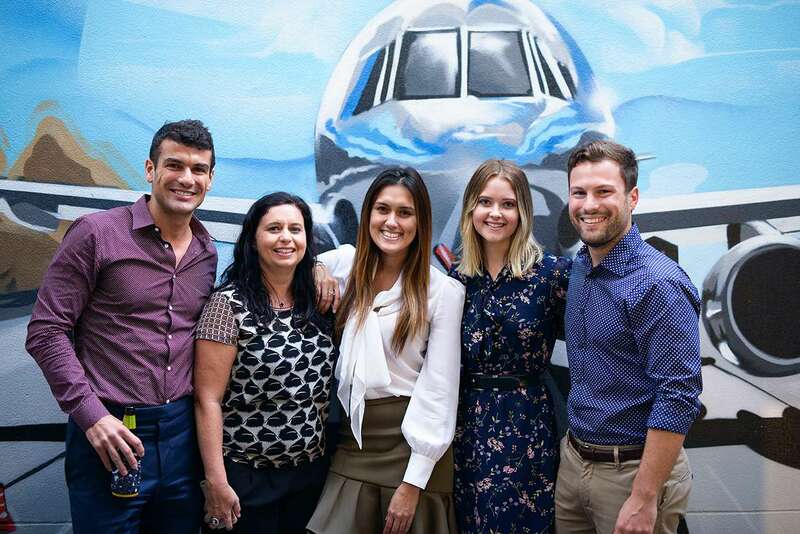 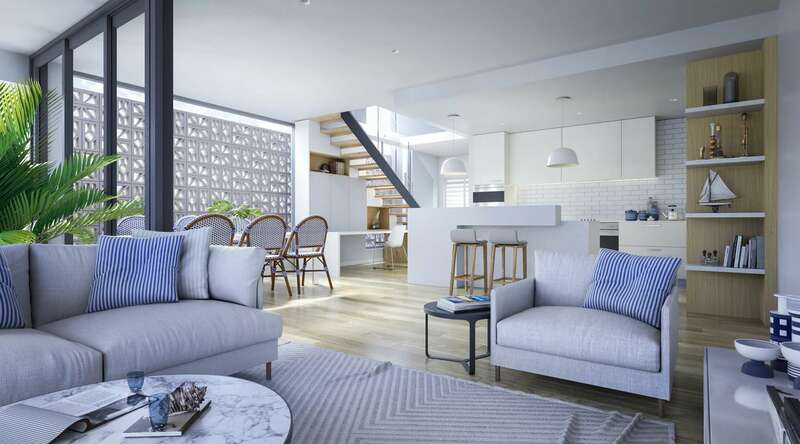 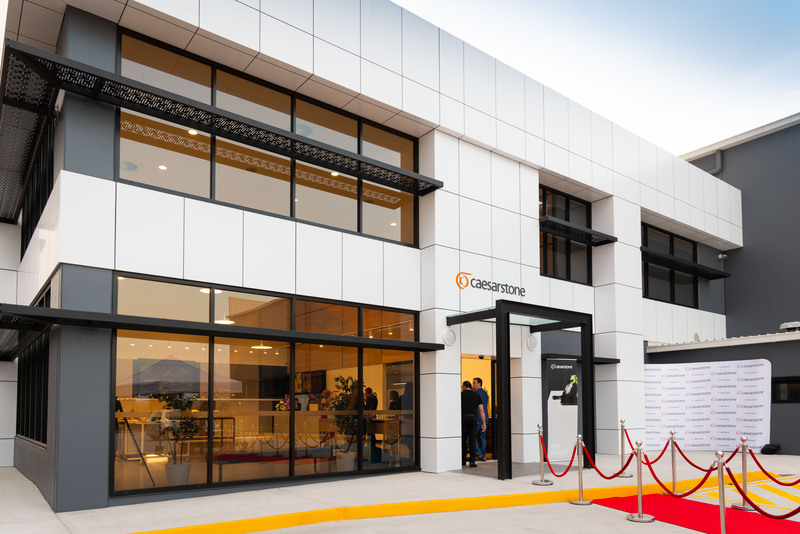 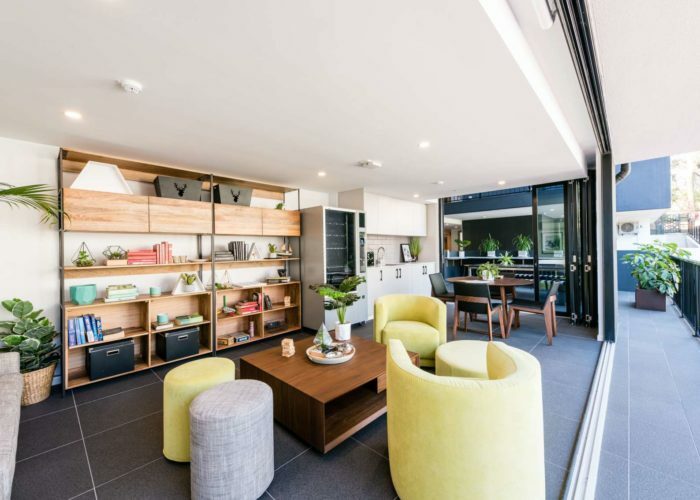 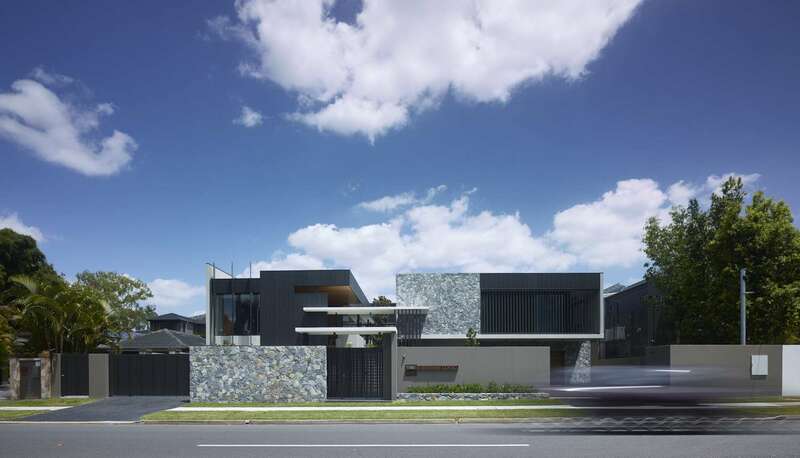 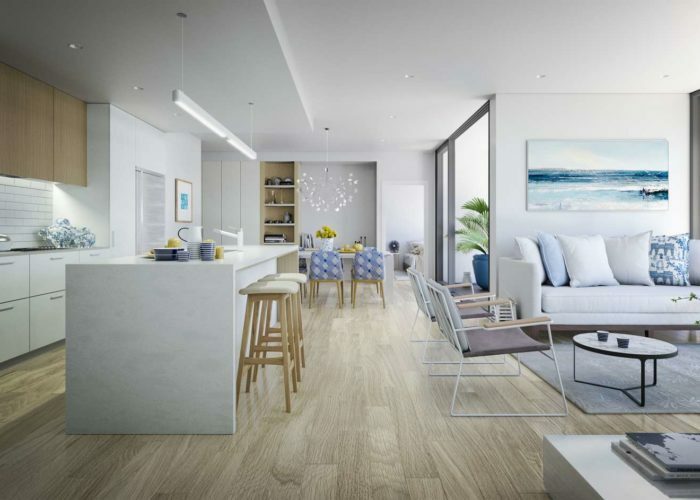 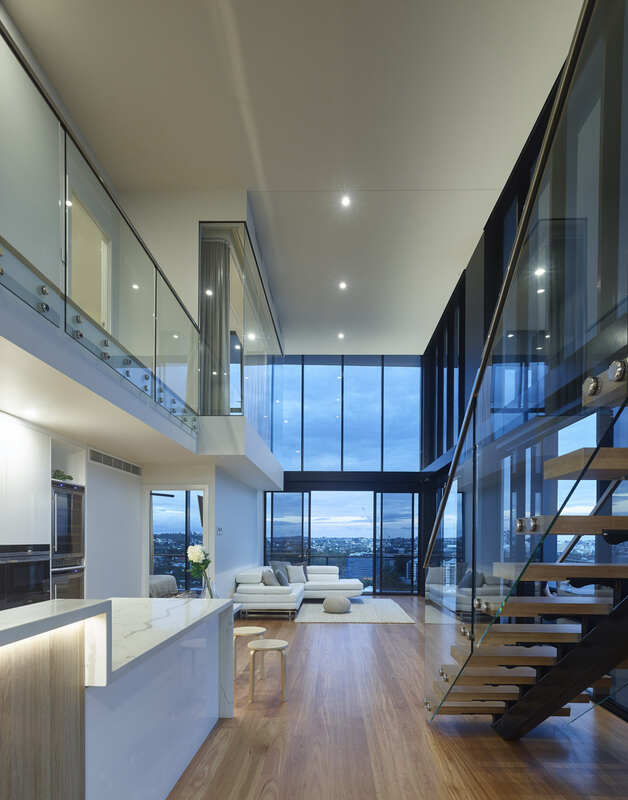 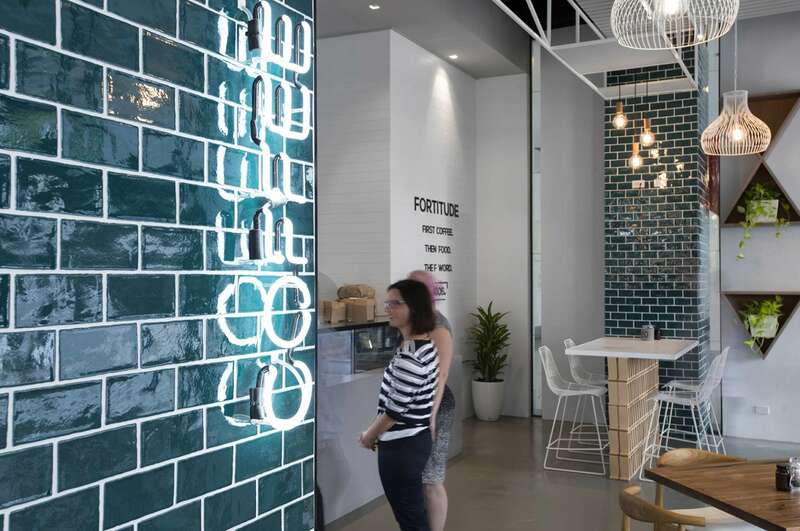 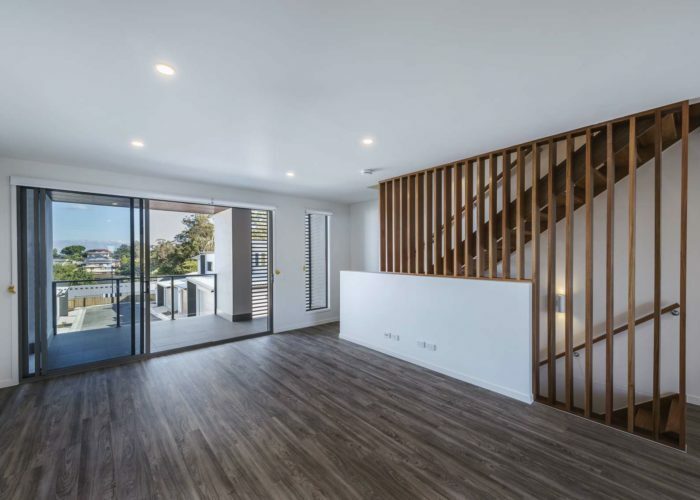 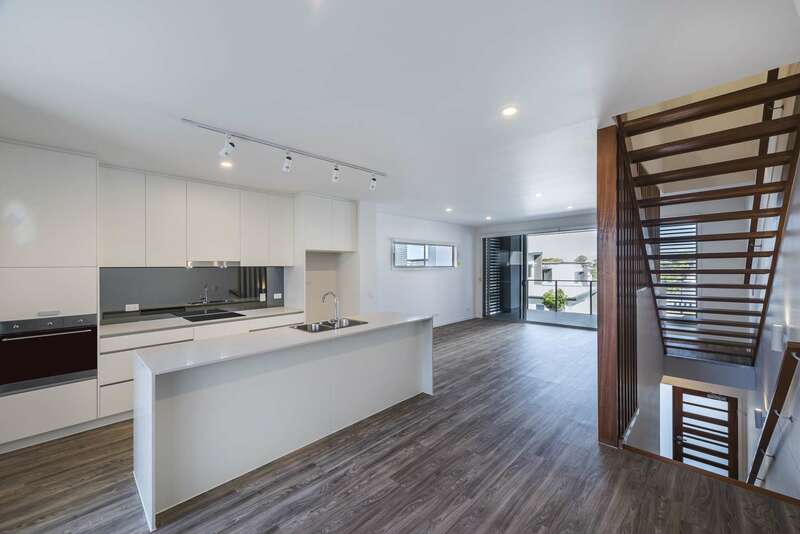 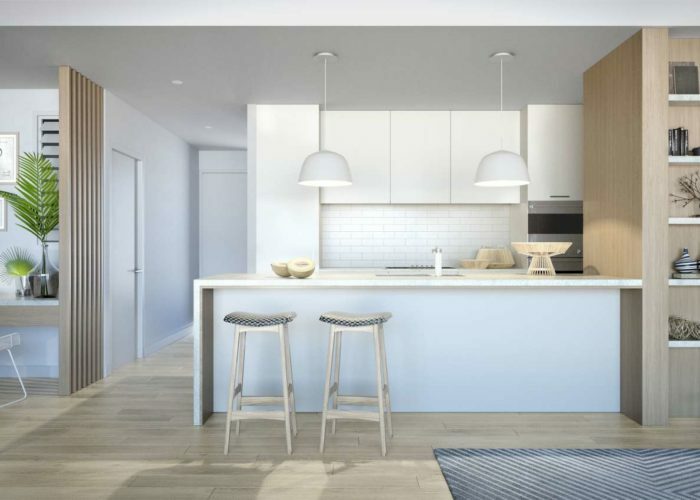 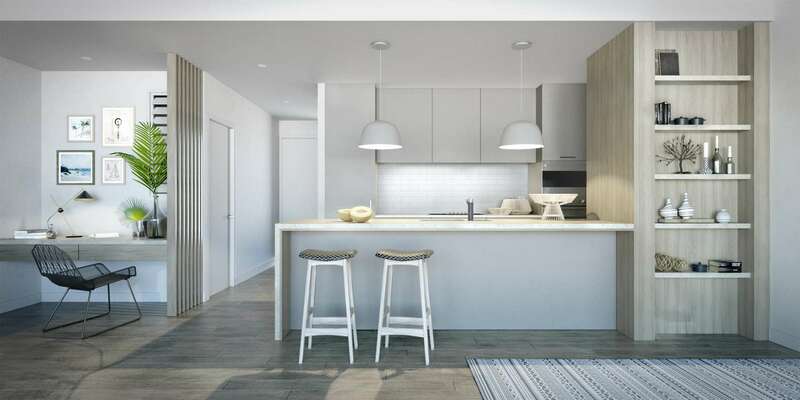 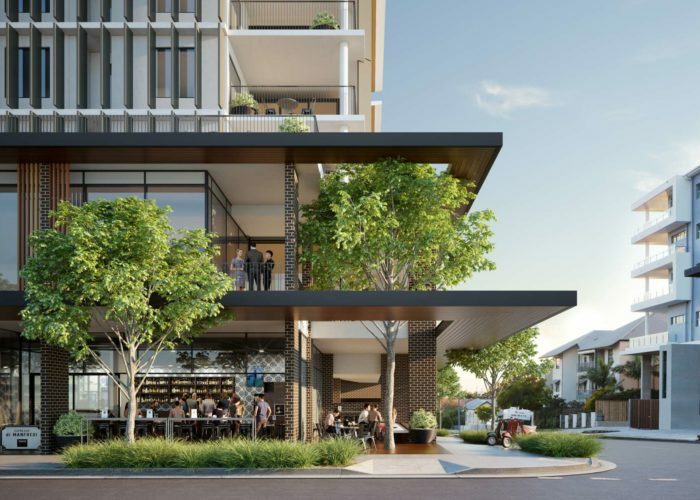 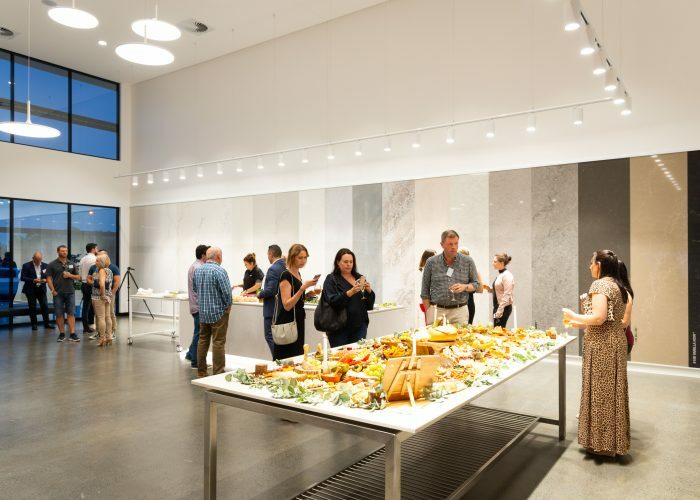 Being a major residential destination for Brisbane’s young professionals, Stones Corner residents seek a dynamic home which enhance the existing offerings of the area including its connections to Hanlon Park and Bikeway, and the active Stones Corner retail strip. 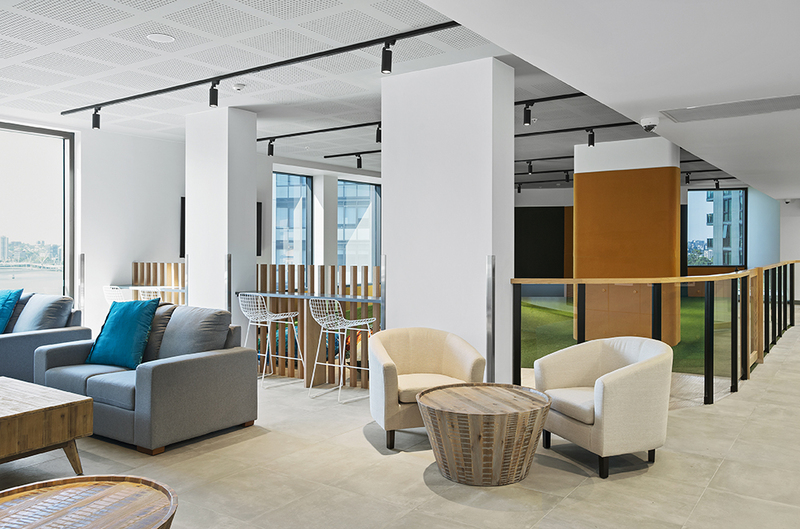 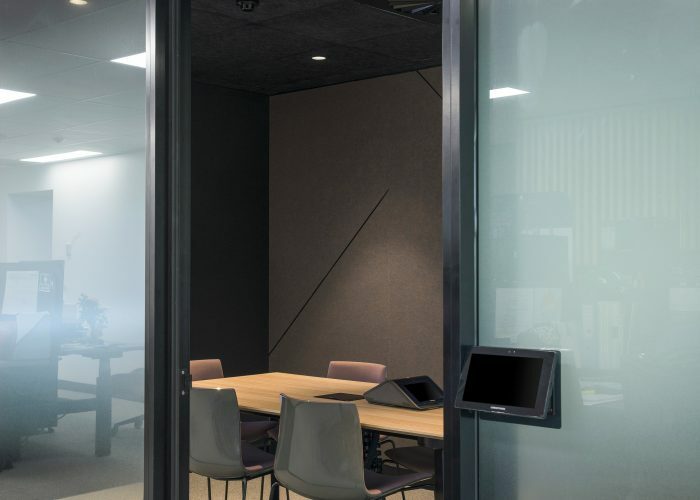 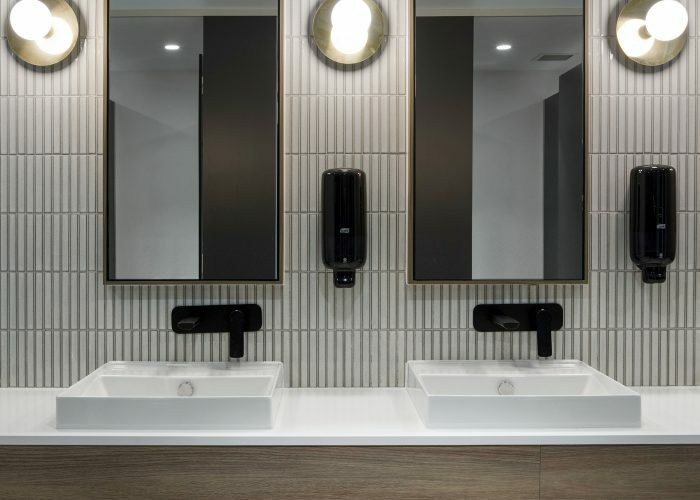 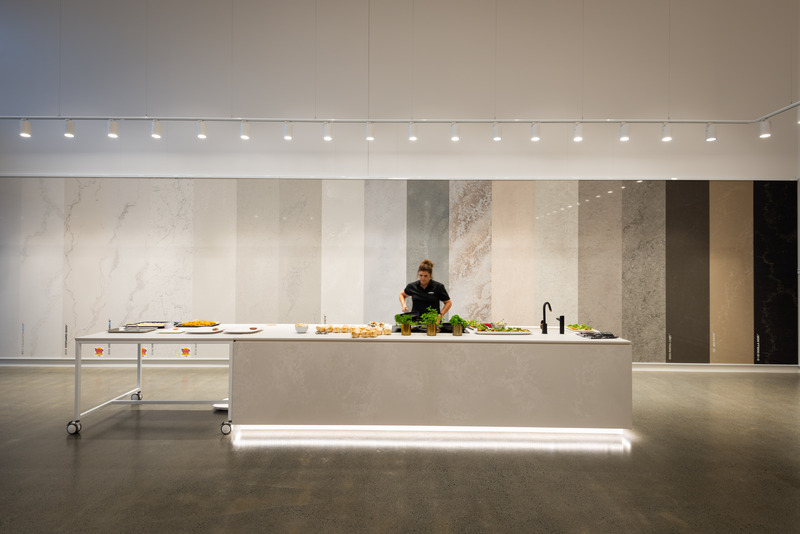 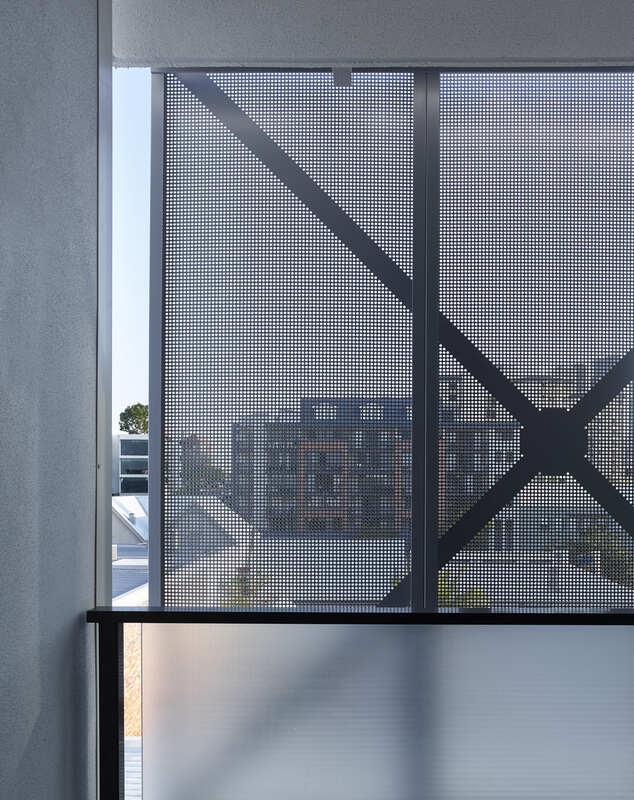 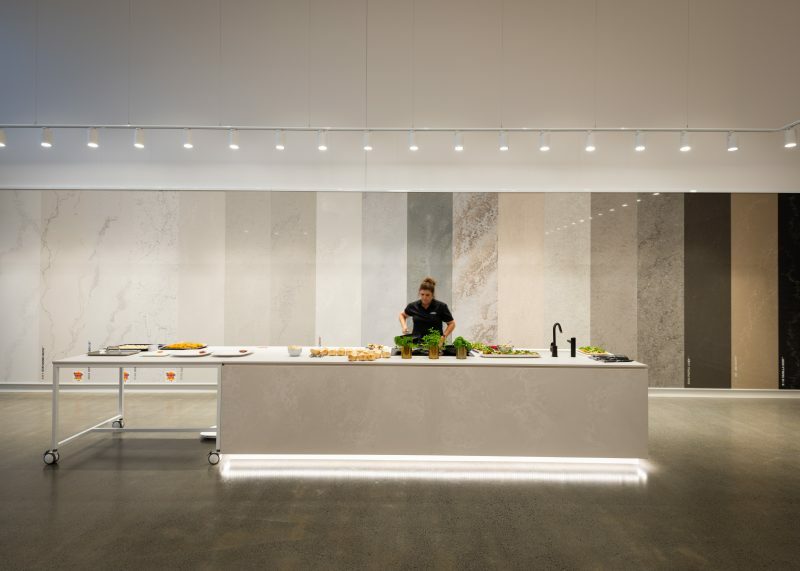 In Partnership with Lantona, the design of Oxy aims to be complementary to its context by using a material palette that is sympathetic to its surroundings, while providing a high level of private and social amenity. 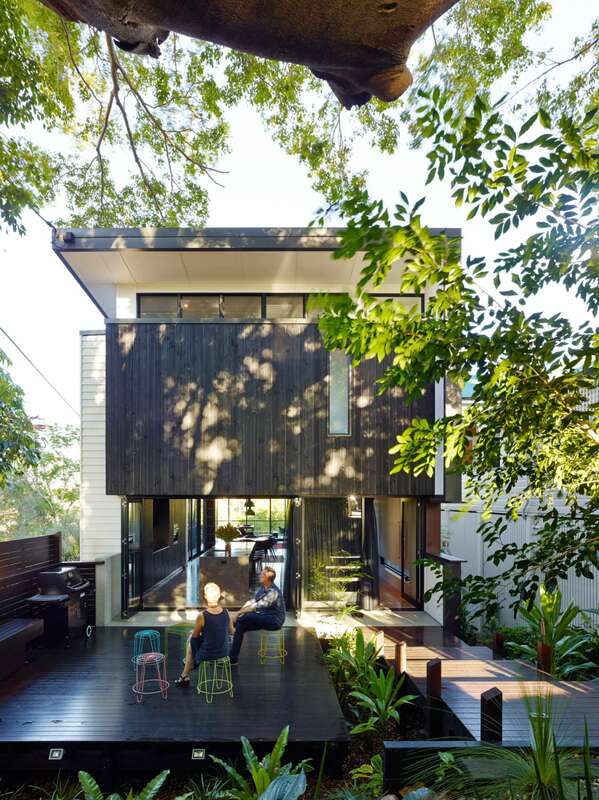 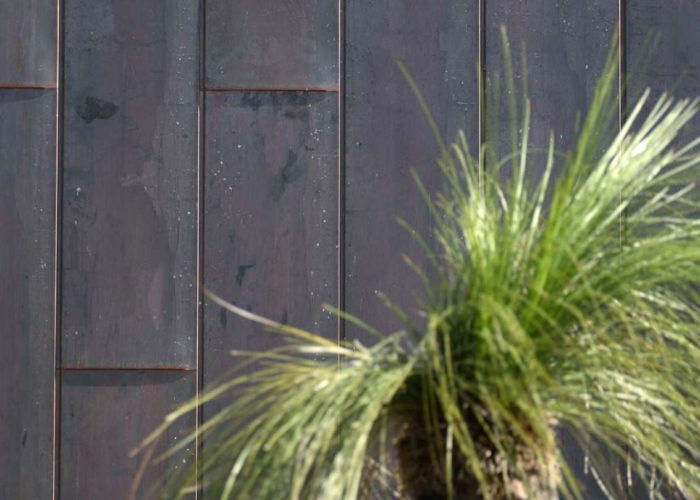 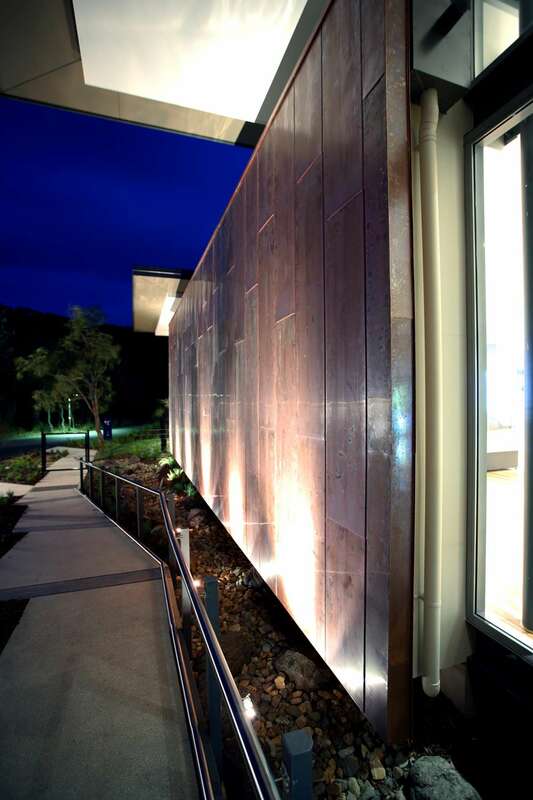 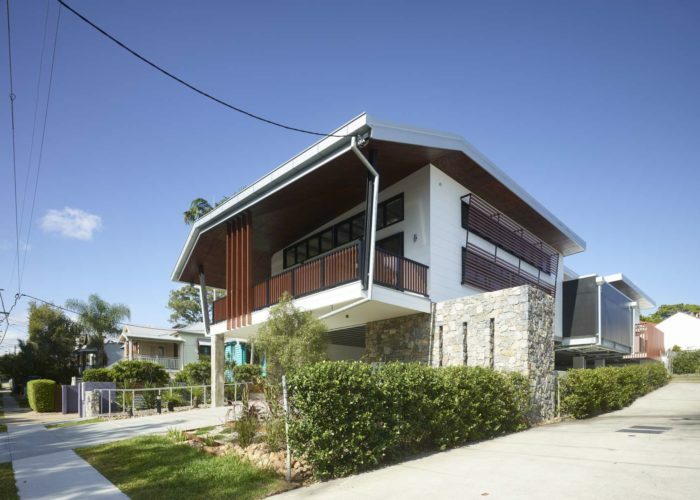 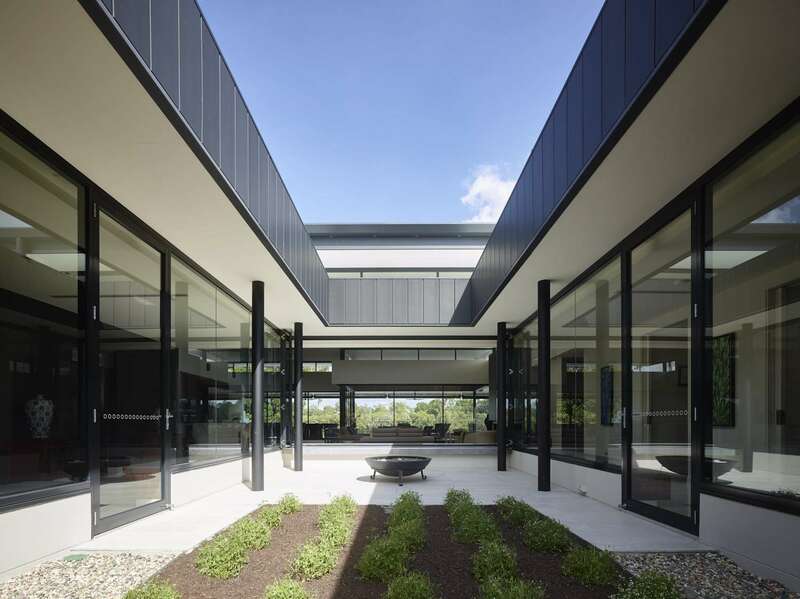 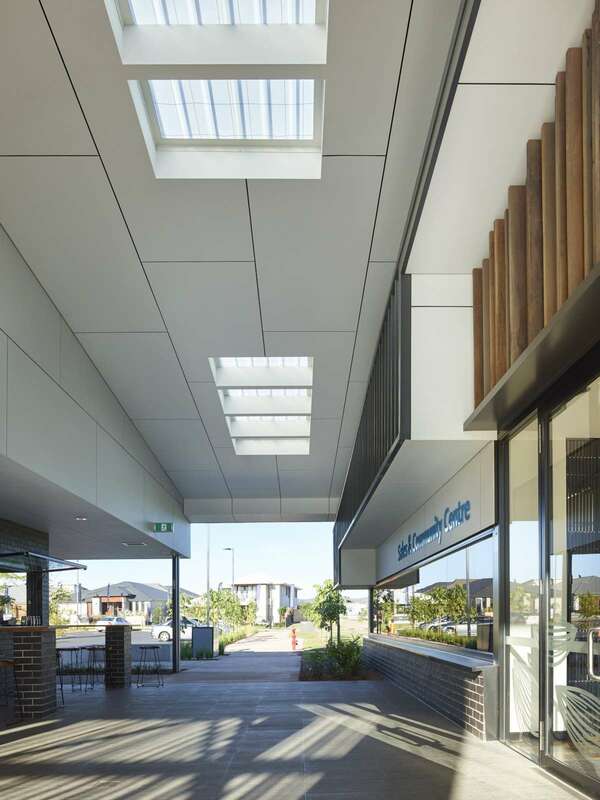 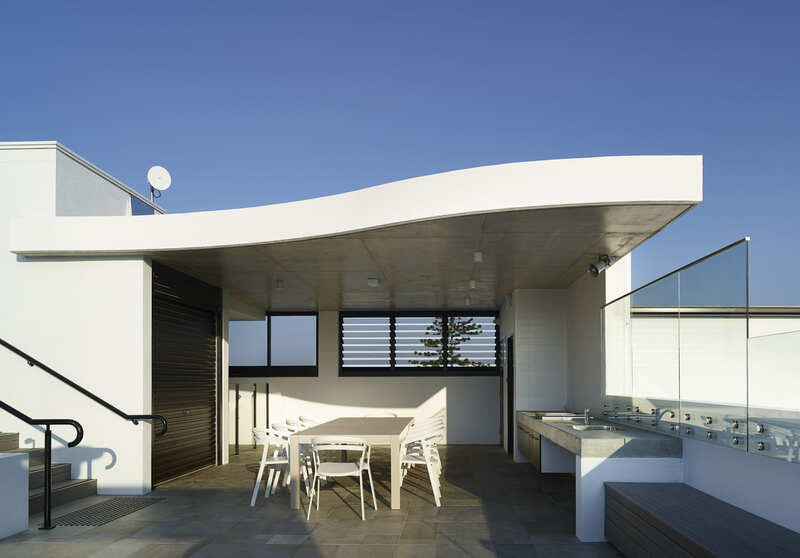 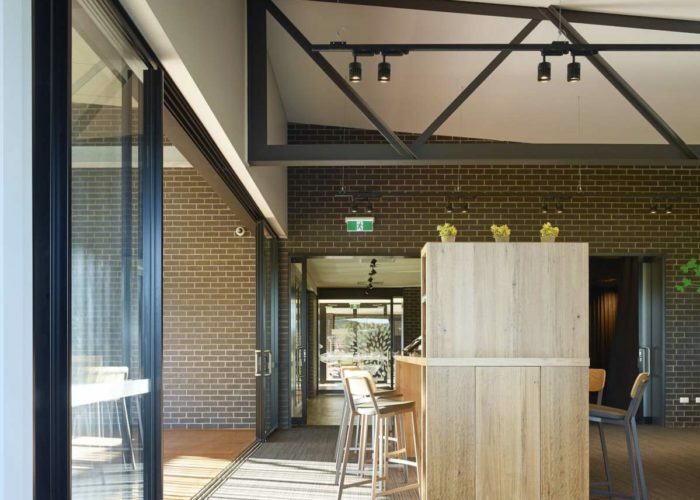 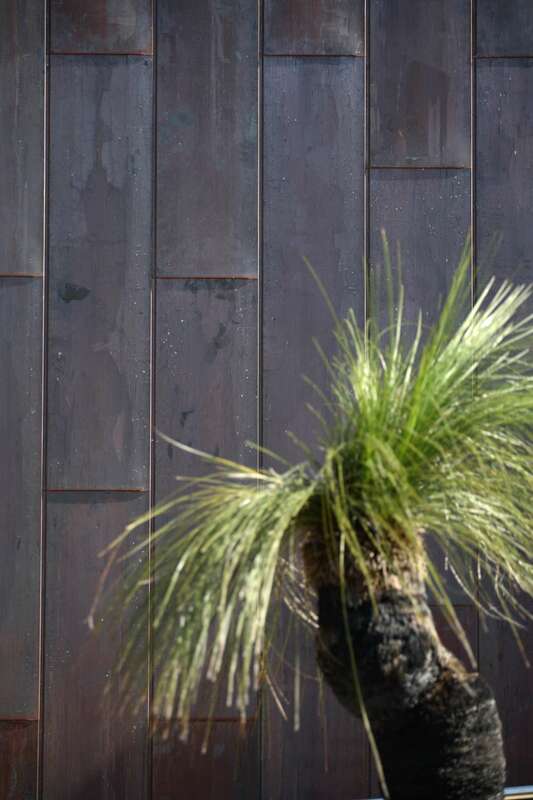 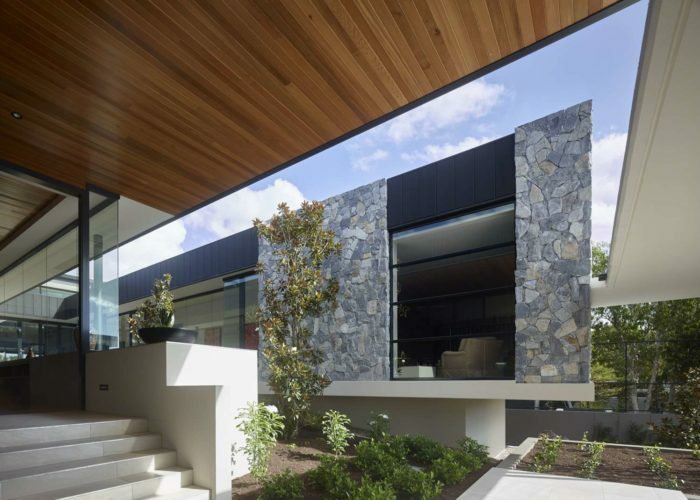 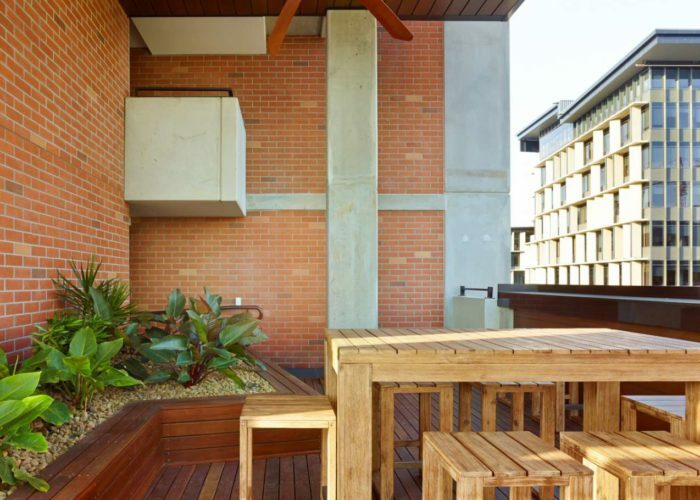 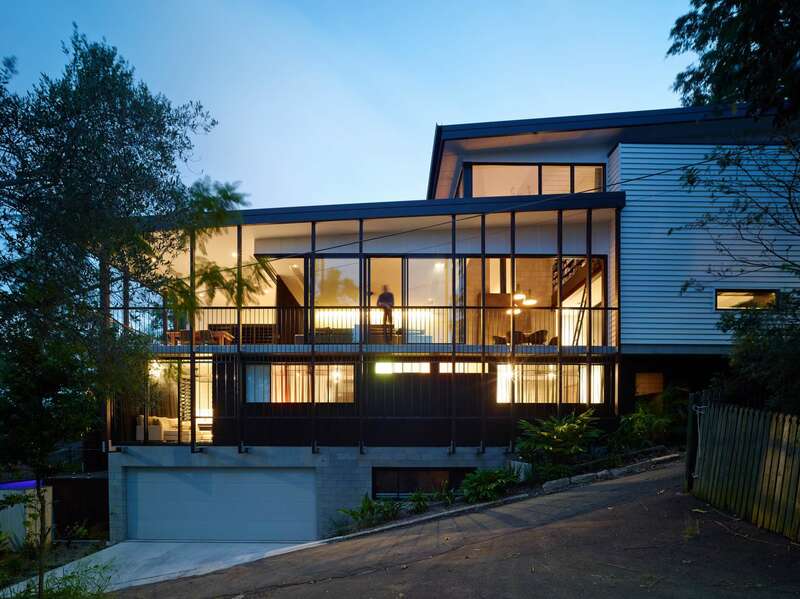 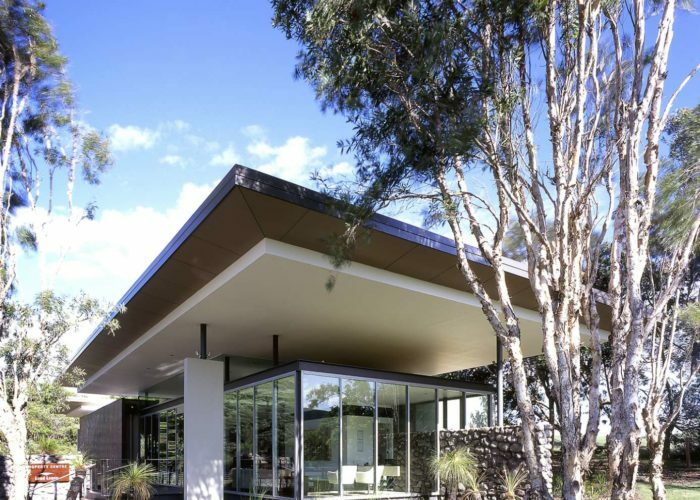 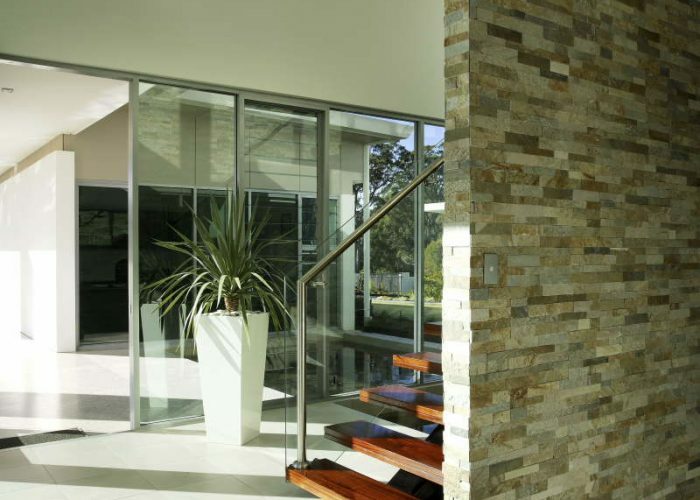 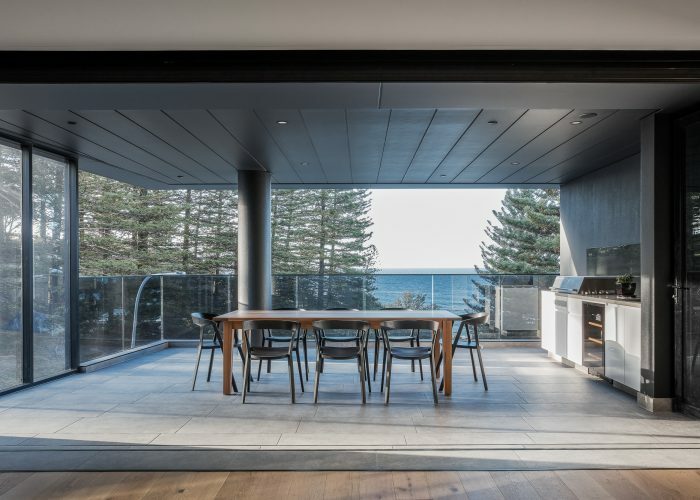 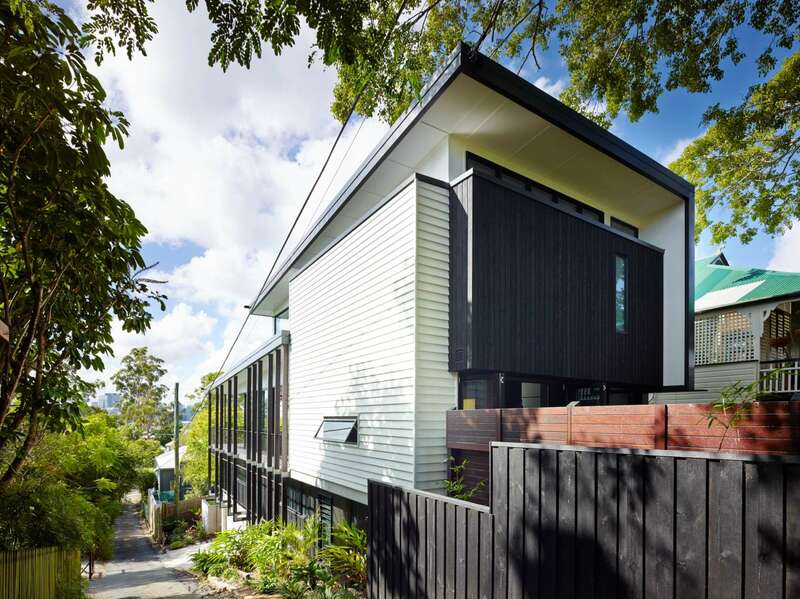 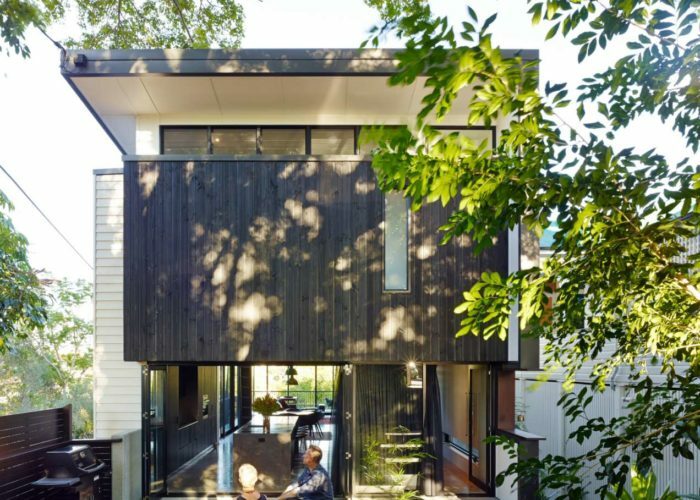 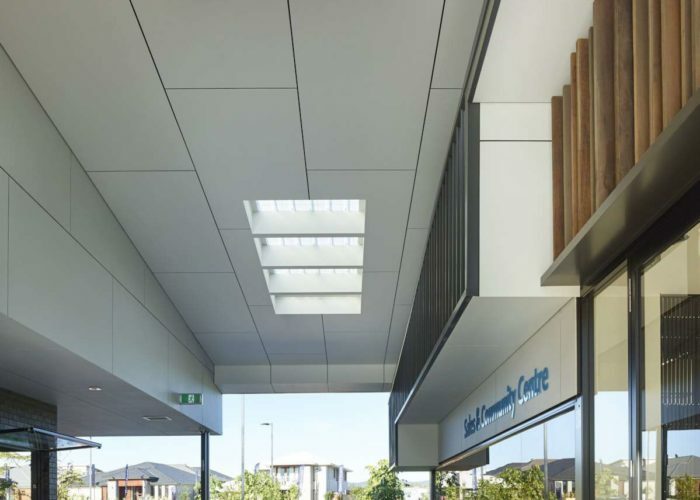 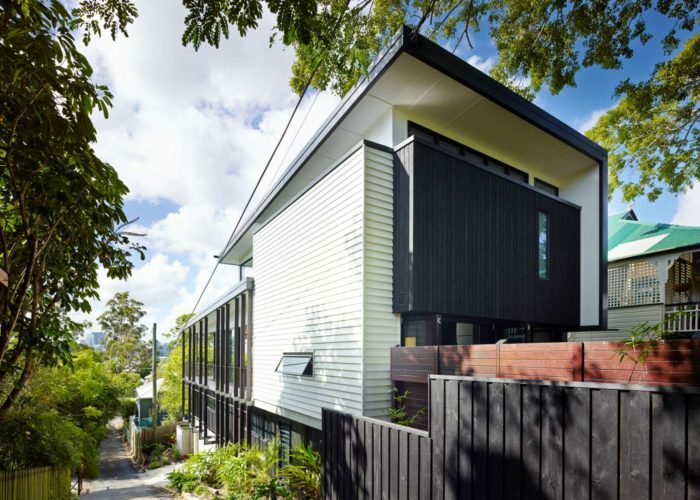 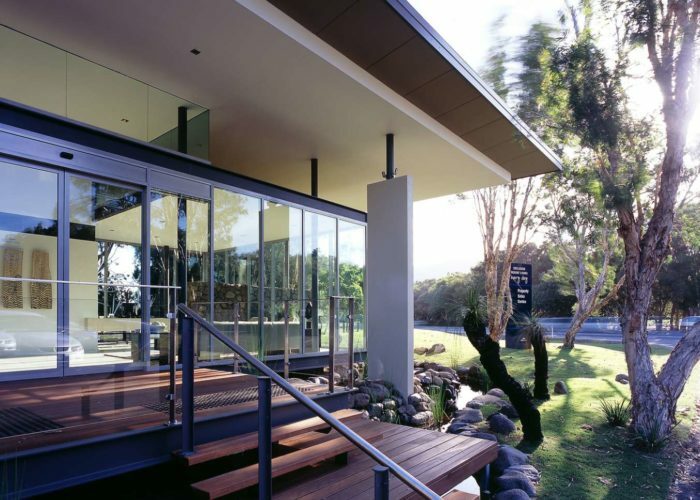 Materials such as weatherboard, timber palings and brickwork provide a sense of familiarly. 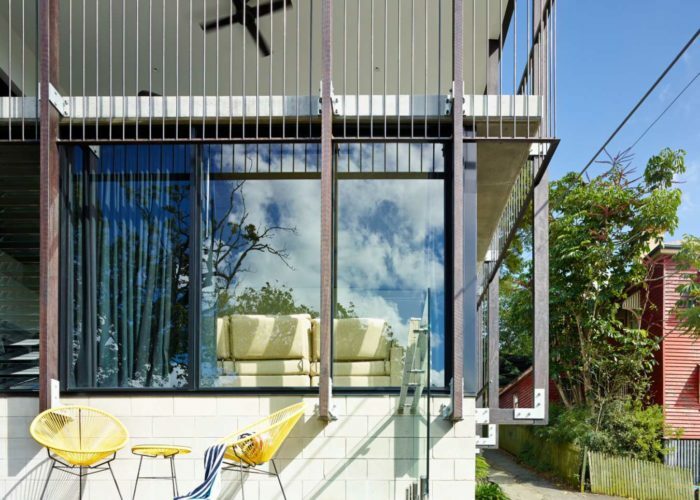 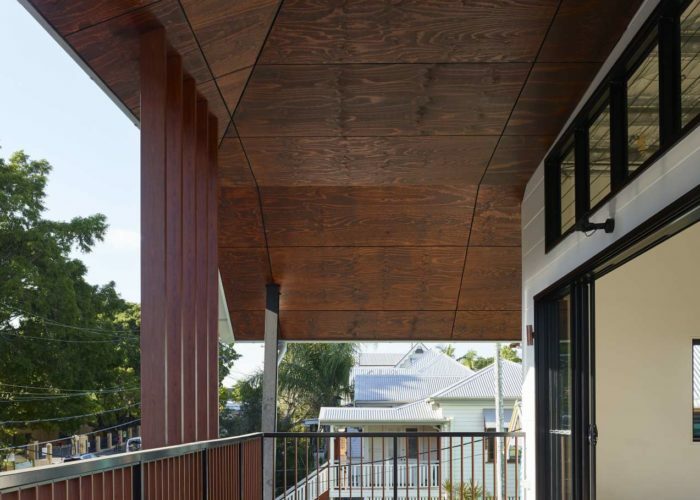 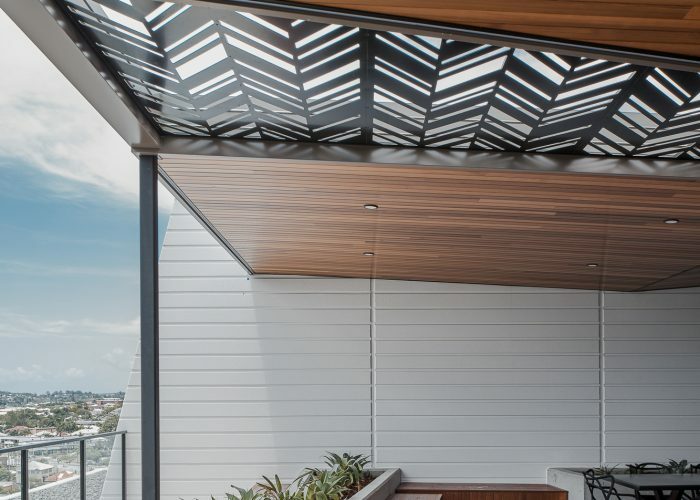 The weatherboard façade pattern represents the roof form of the traditional Queensland Cottage – a nod to the historical vernacular. 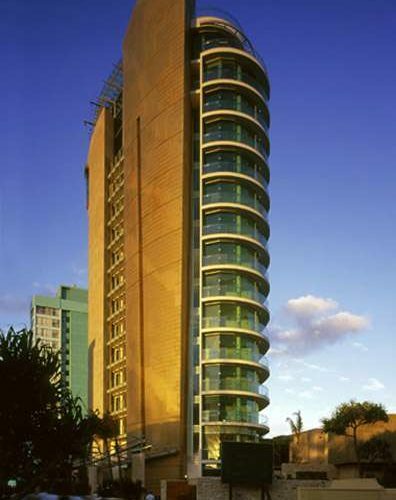 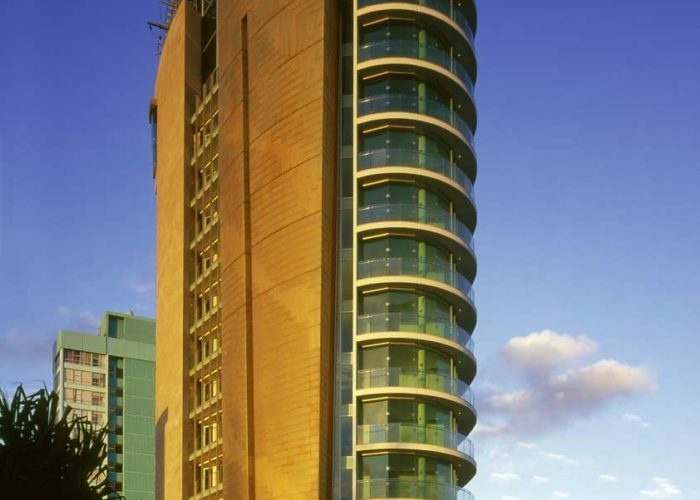 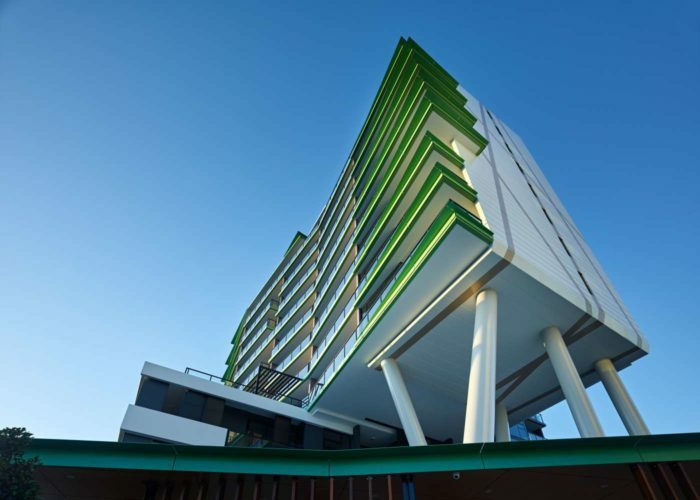 Jade is one of our most iconic and memorable projects. 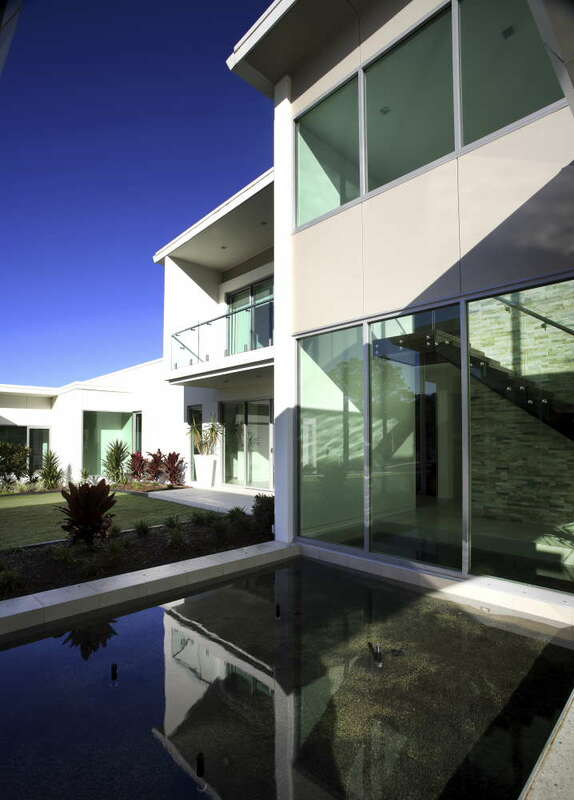 Everything about the project was exemplary. 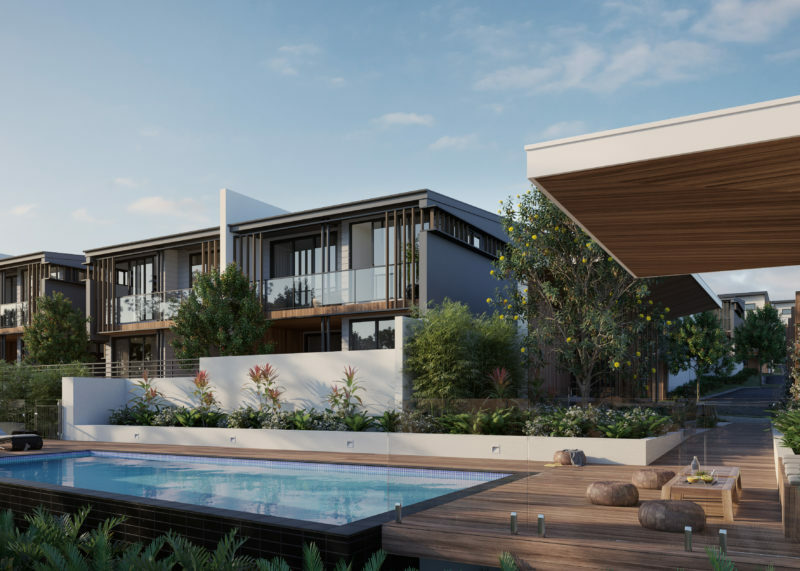 The vision for the project was to attract an international clientele who would be using these for permanent residences or for holidays. 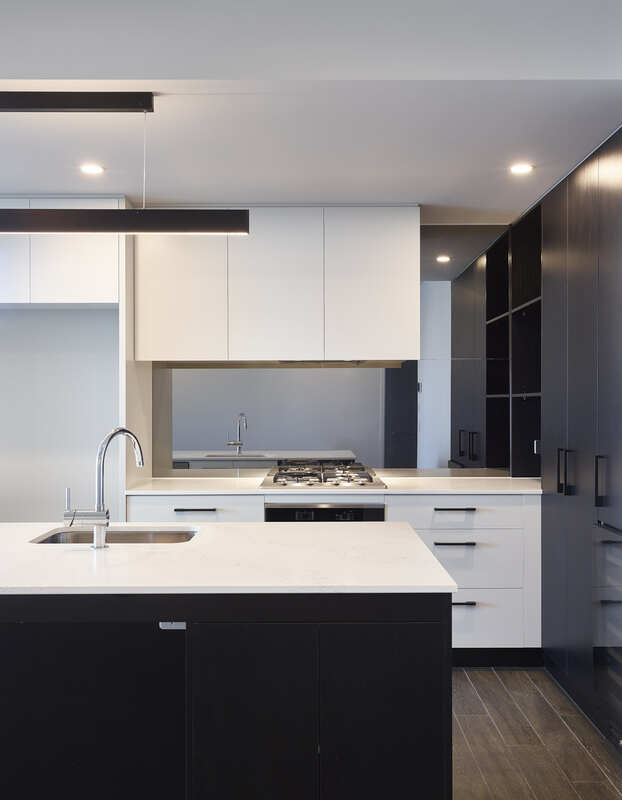 This understanding informed the project at every level, from the flow of the floor plan to the detailing of the understated but opulent finishes. 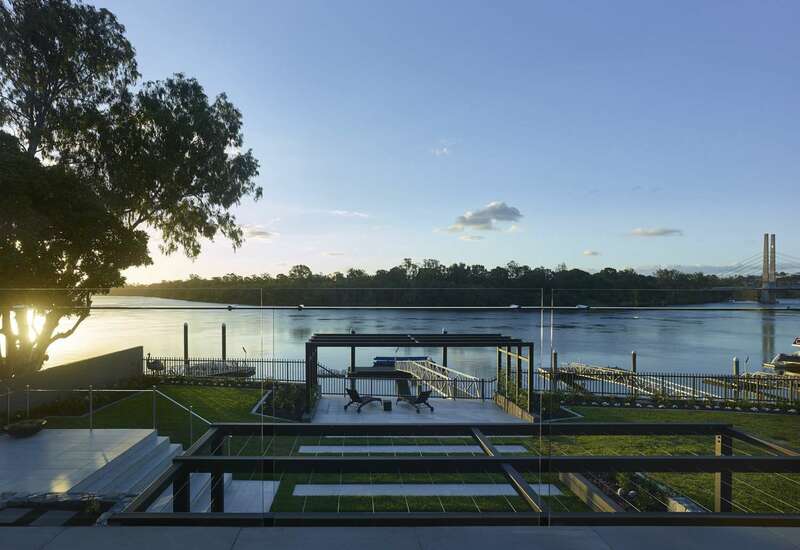 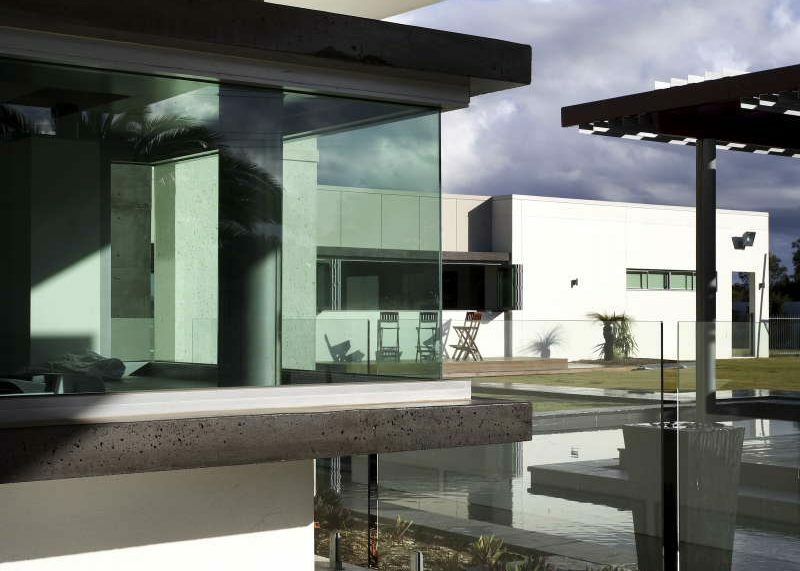 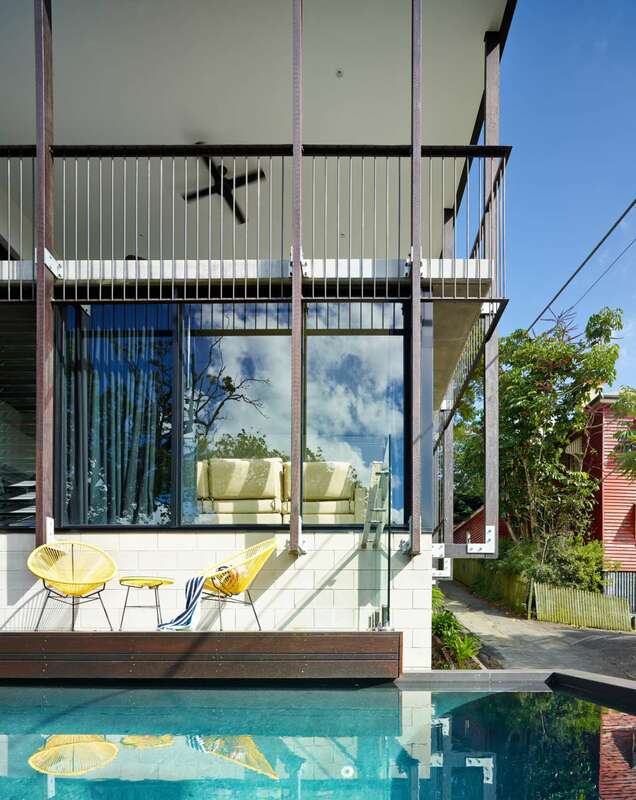 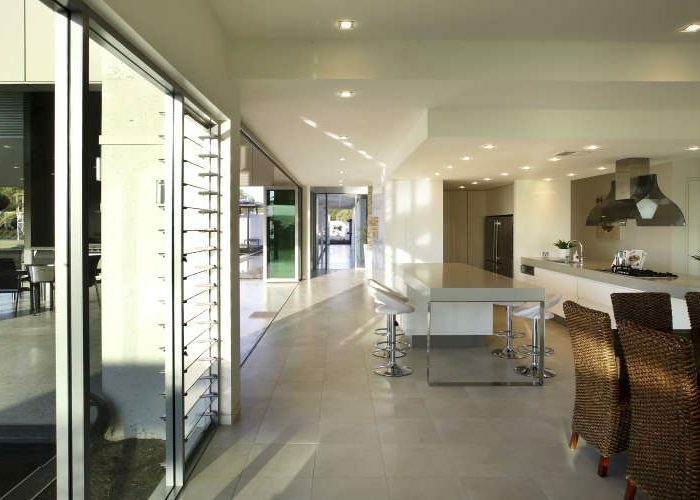 The result is pure luxury but with genuinely Queensland sense of relaxed living. 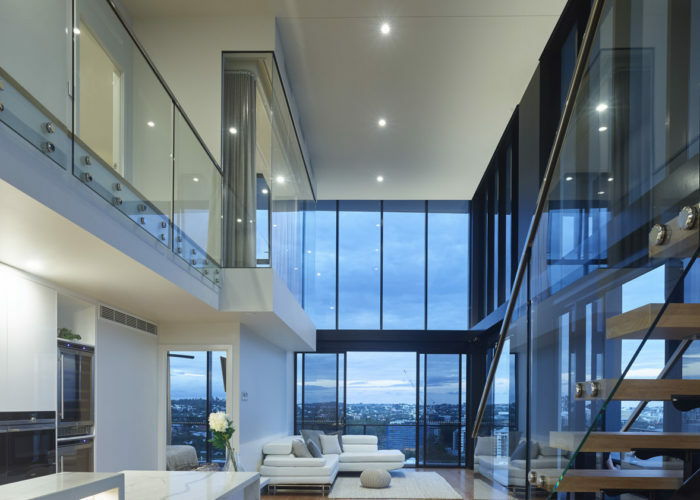 Timeless architecture is difficult to achieve, but there is no doubt that this project still remains one of our most recognised and enduring projects. 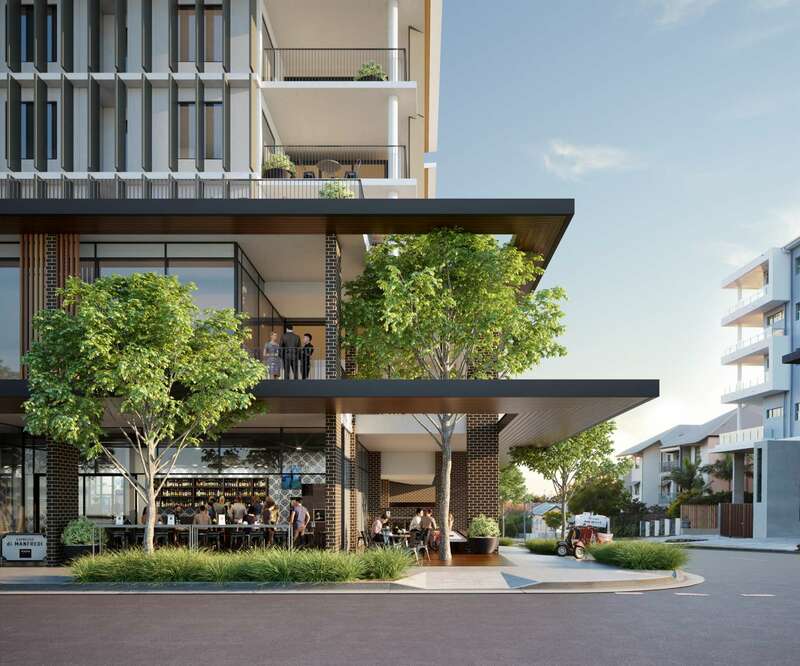 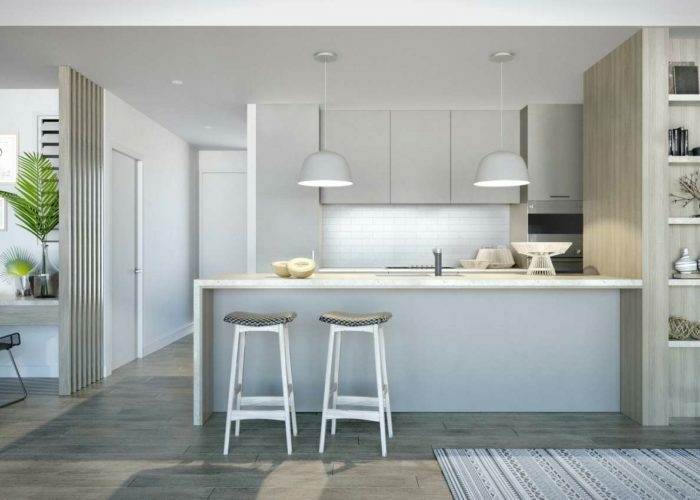 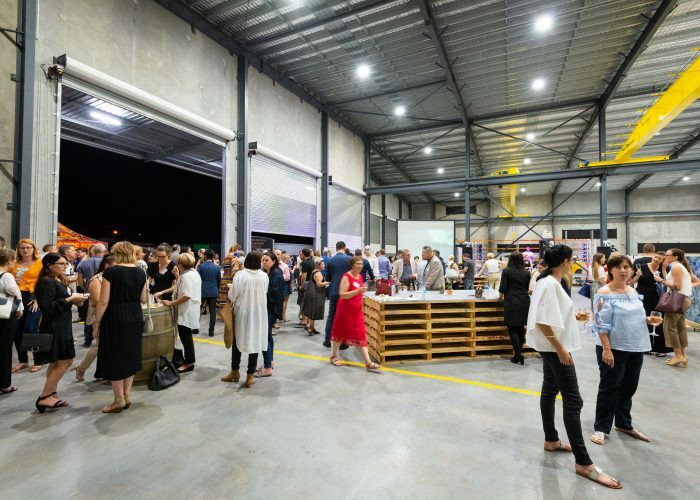 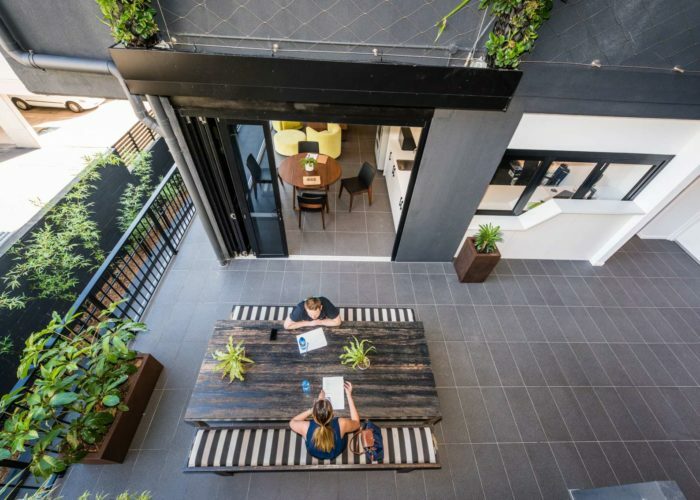 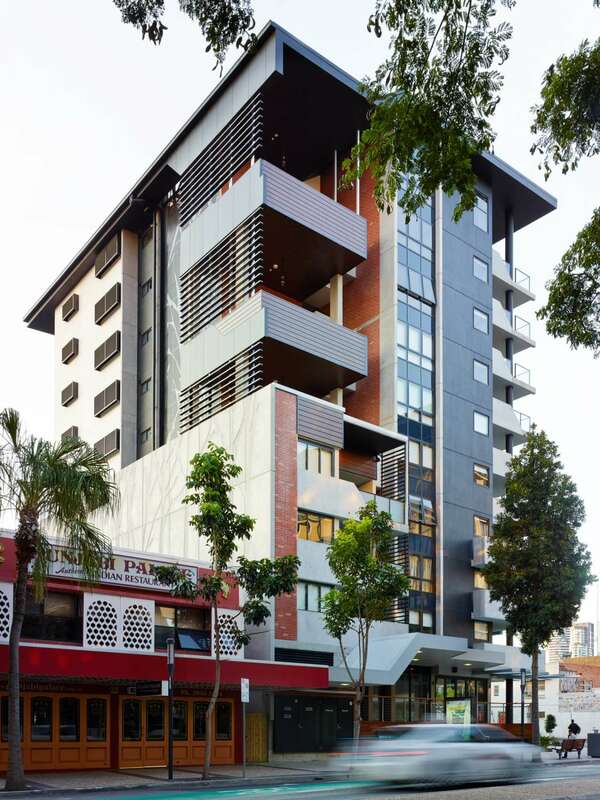 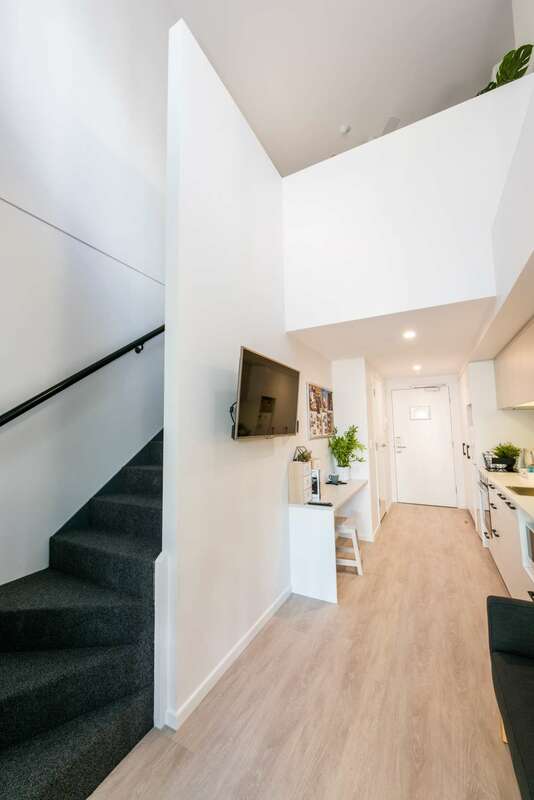 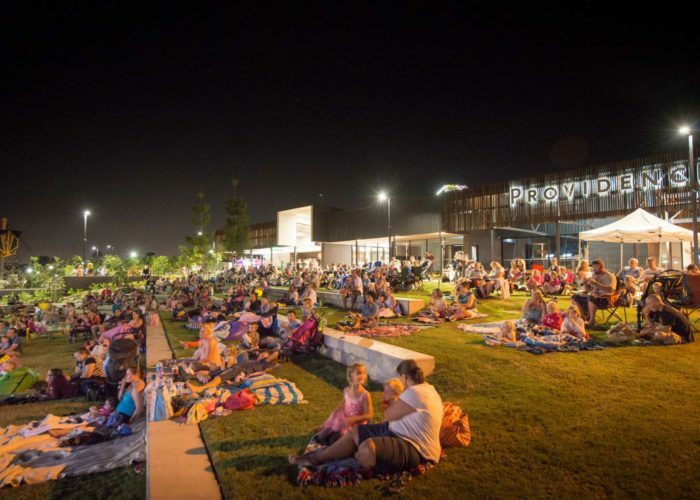 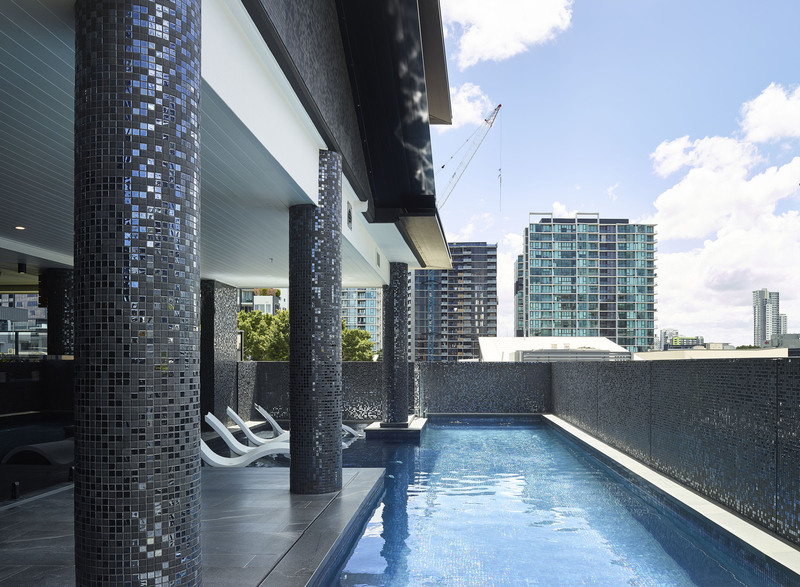 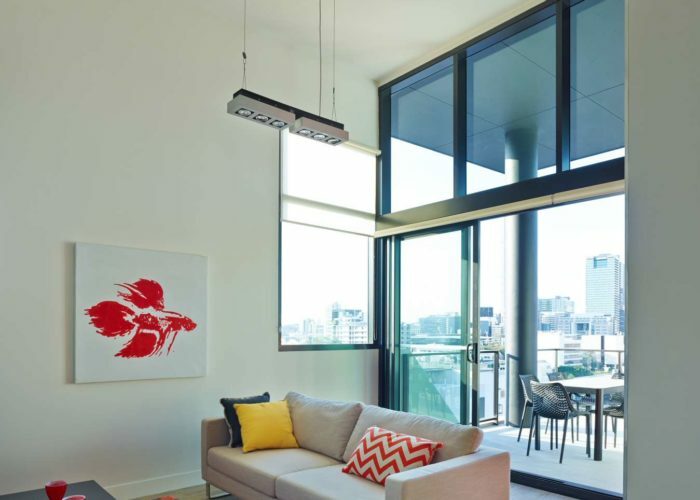 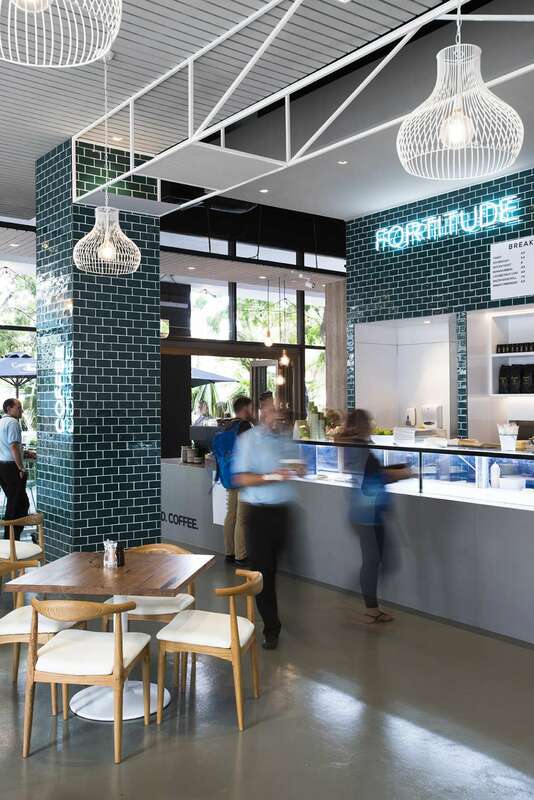 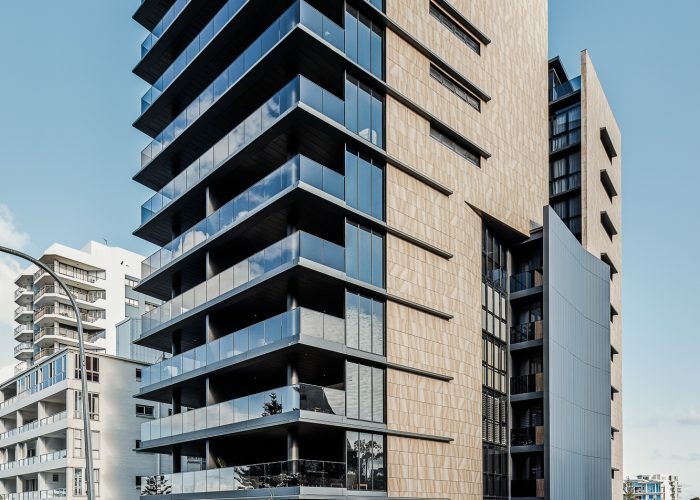 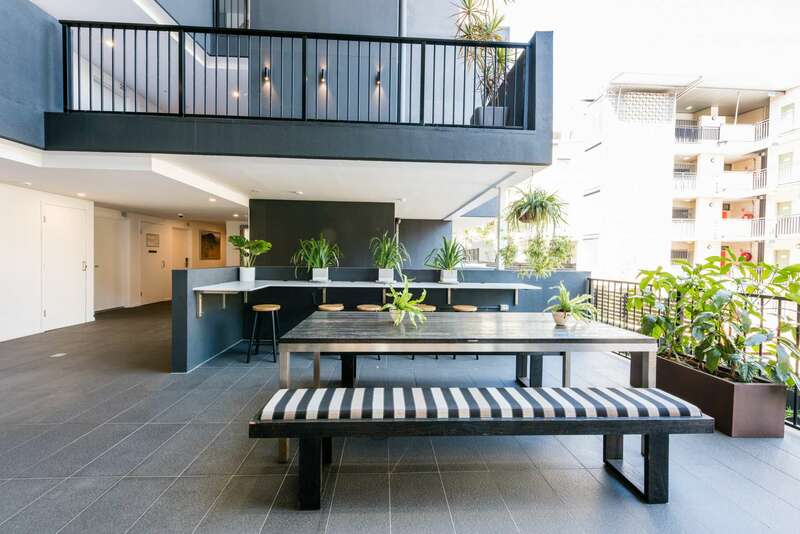 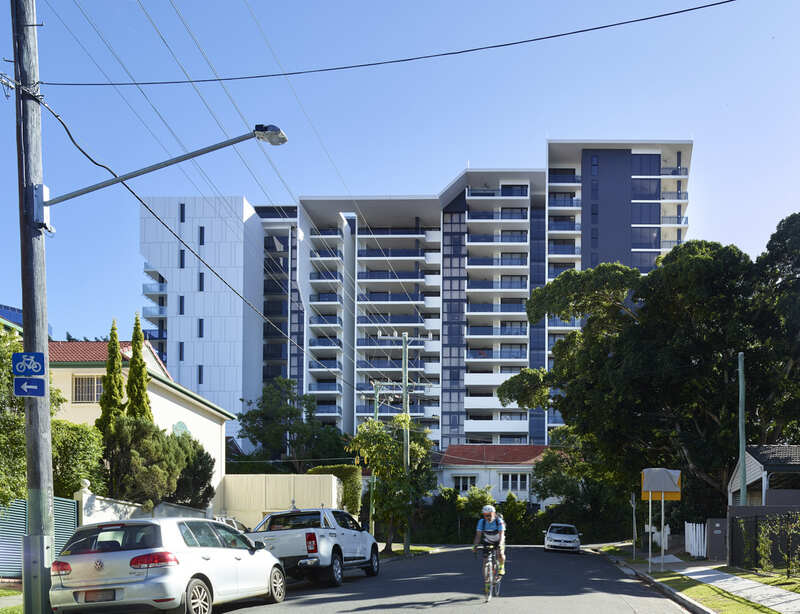 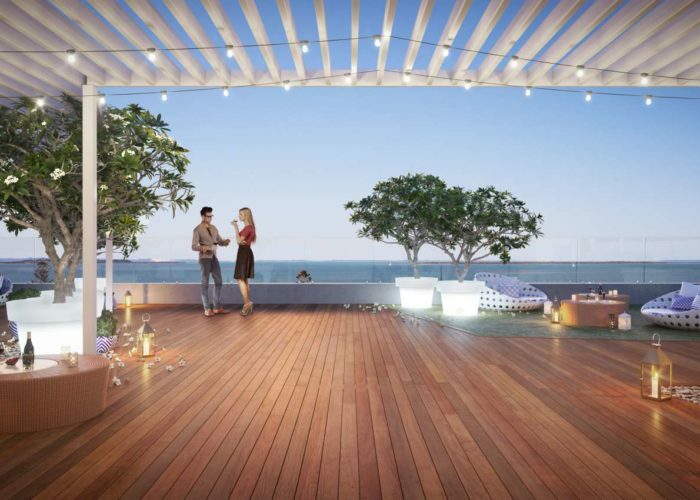 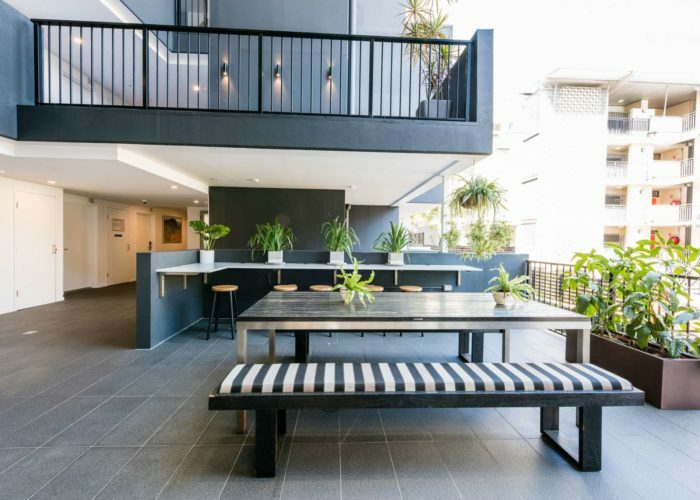 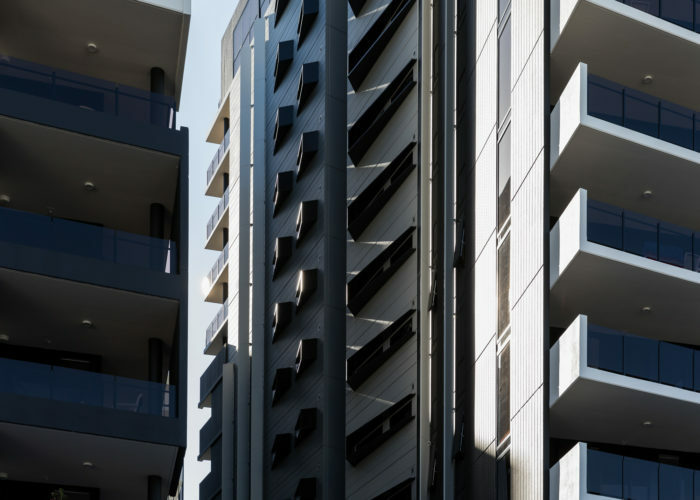 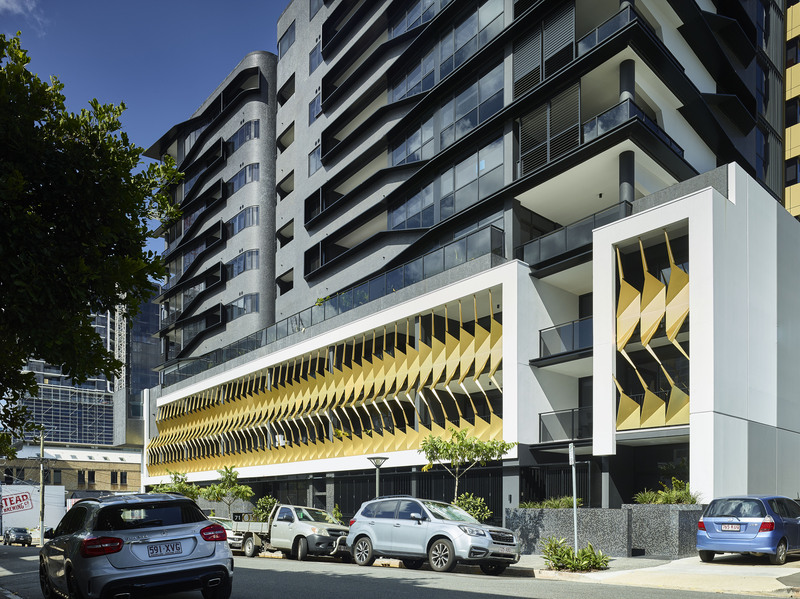 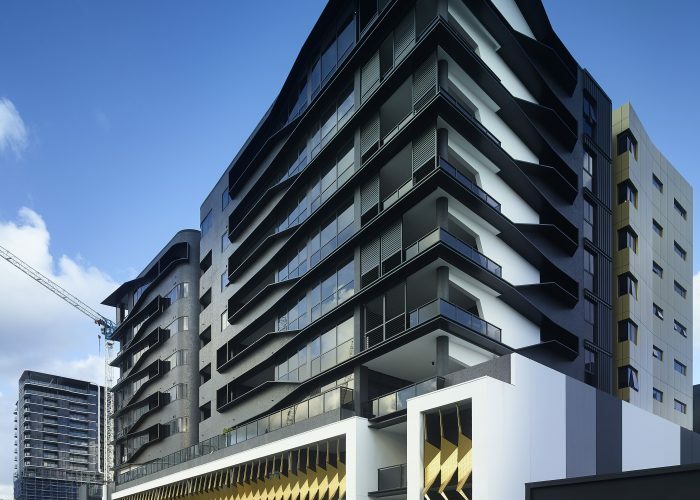 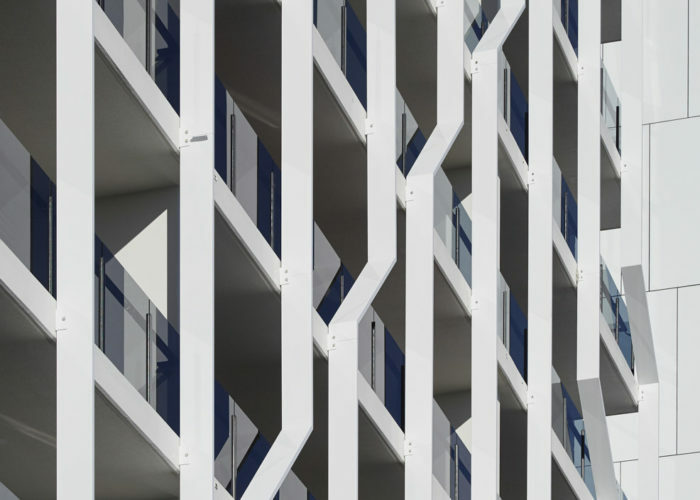 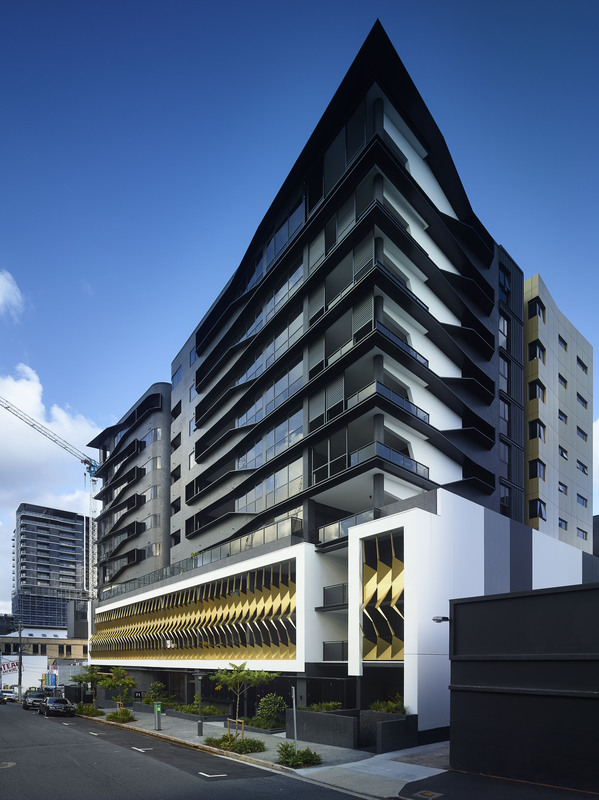 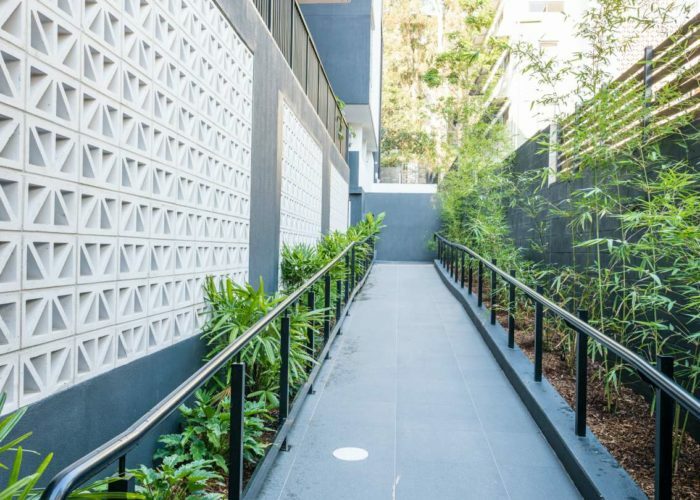 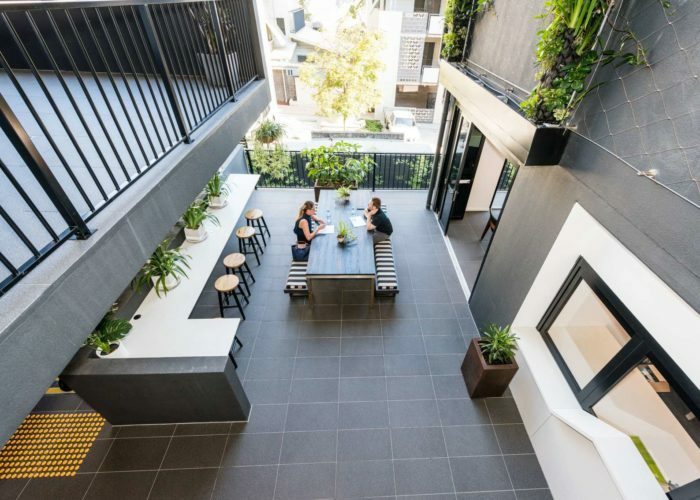 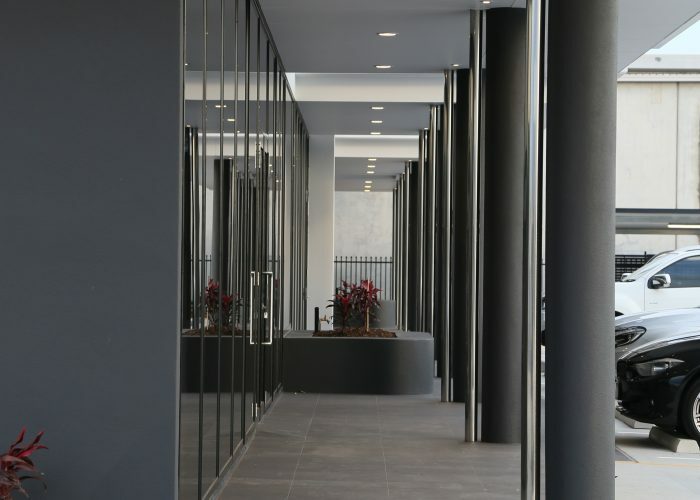 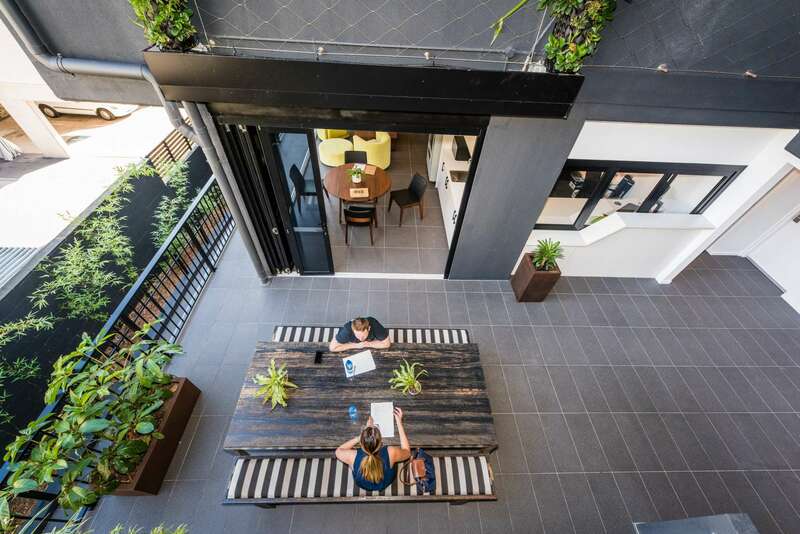 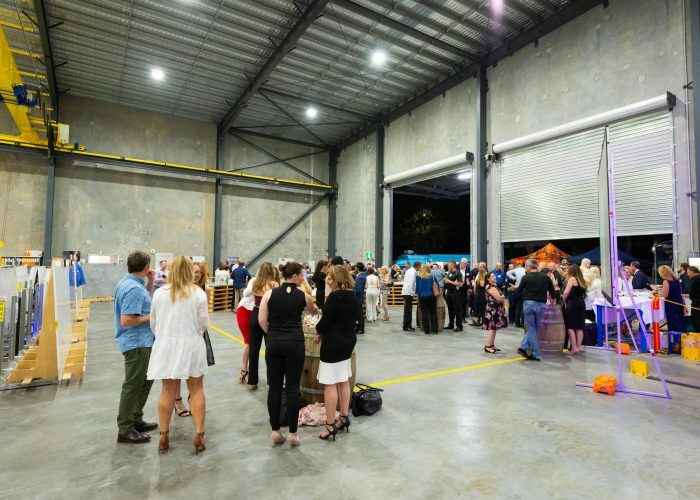 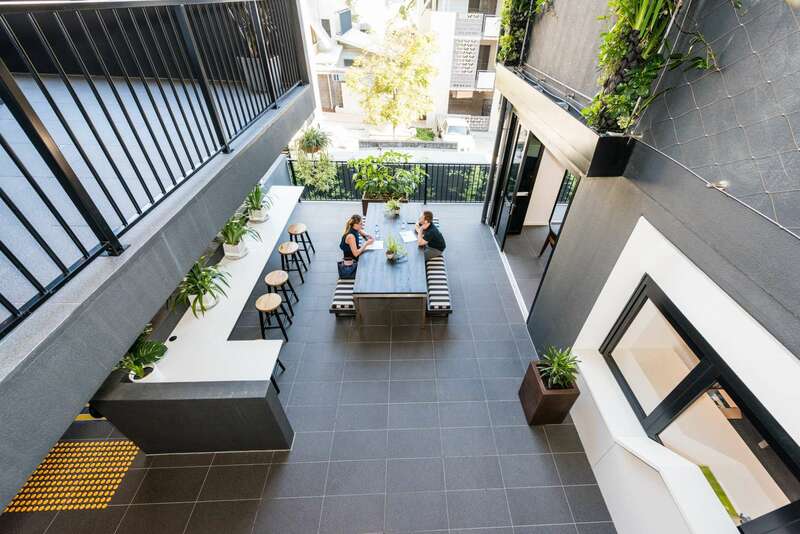 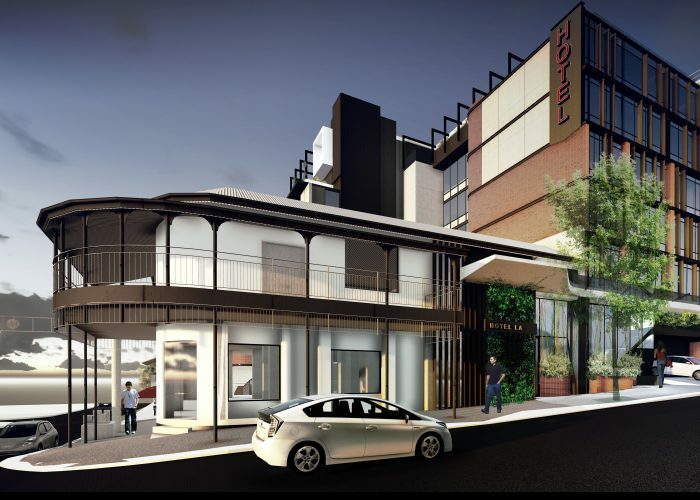 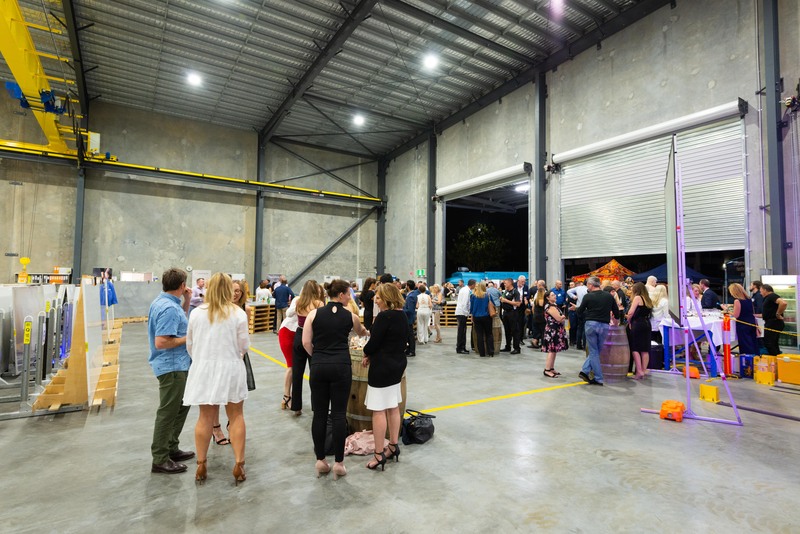 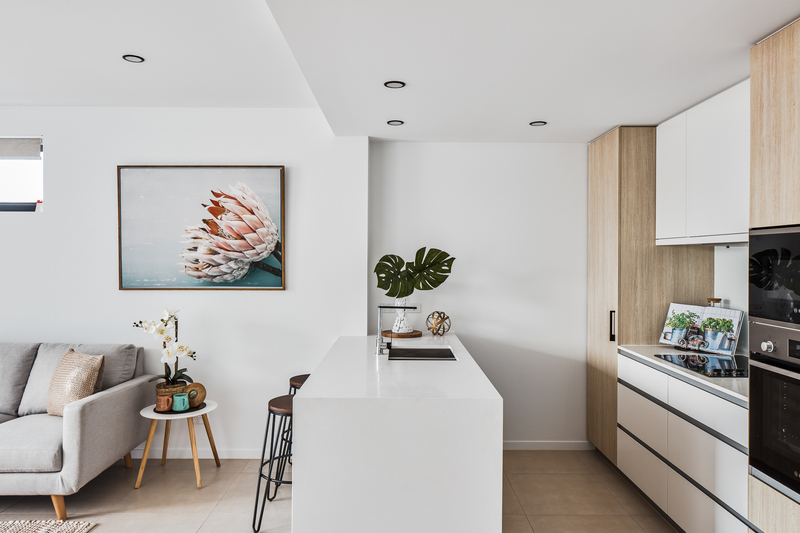 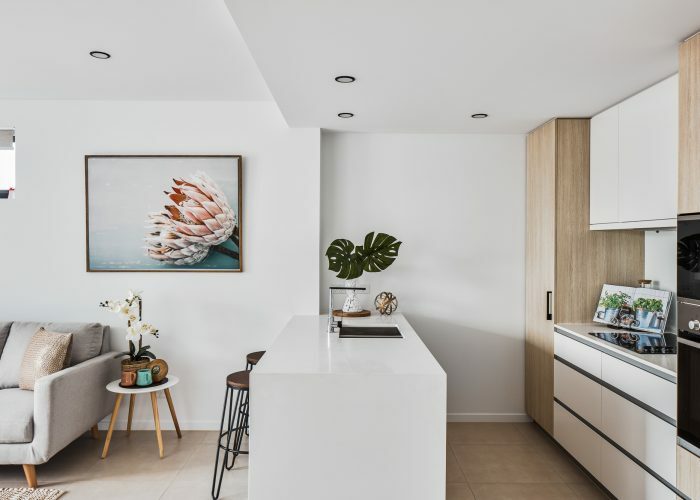 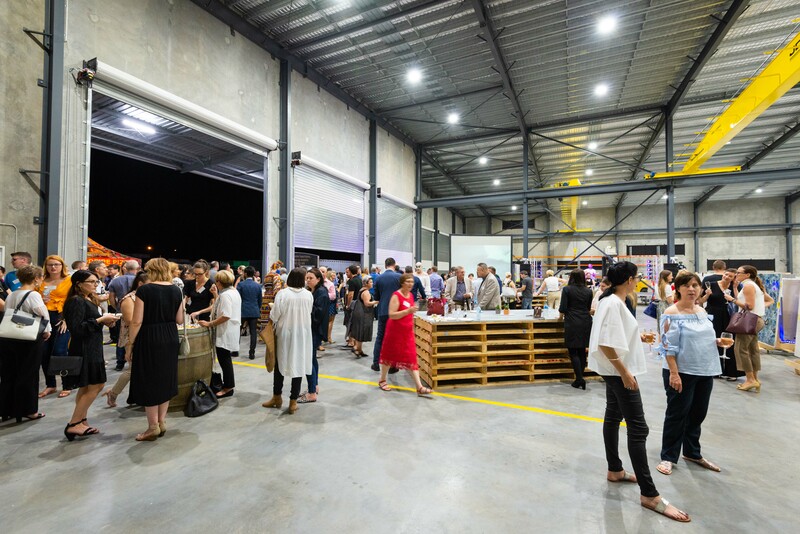 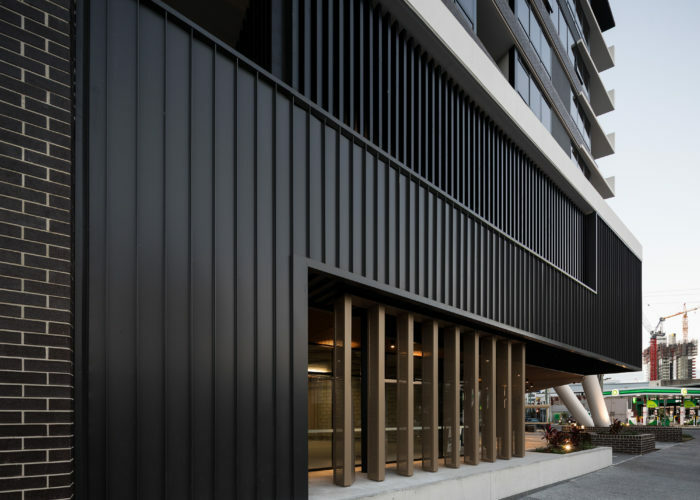 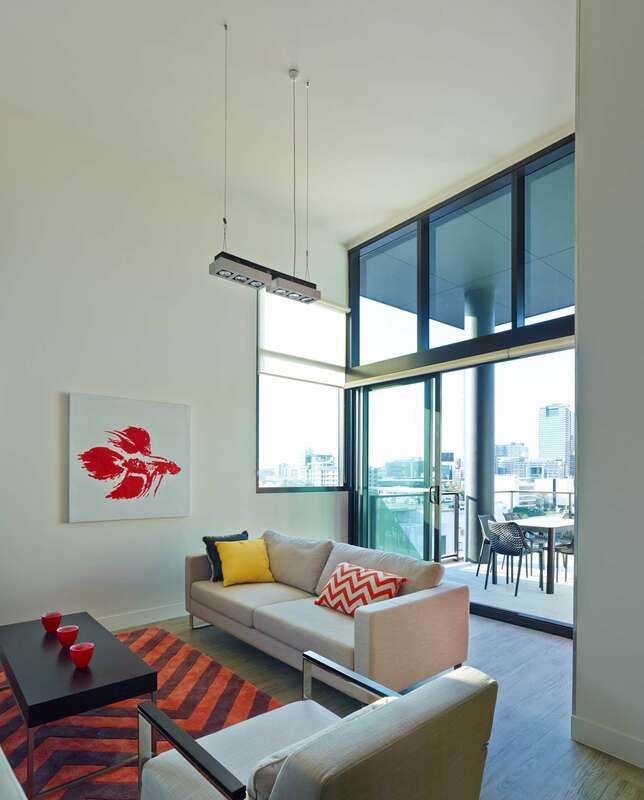 As a gateway to South Brisbane’s laneway culture and a stone’s throw from the cultural hub of West End, the site on the corner of Fish Lane attracted residents that were searching for more than just a place to call home. 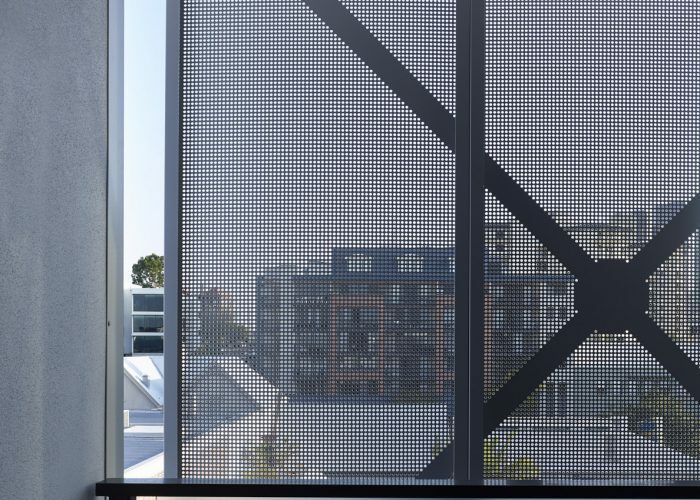 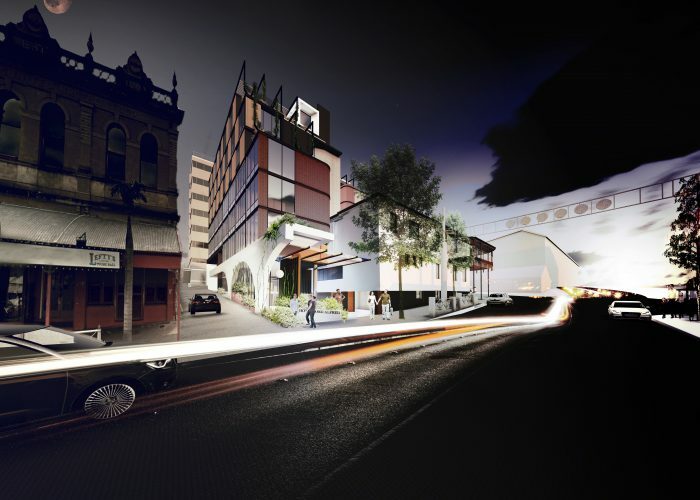 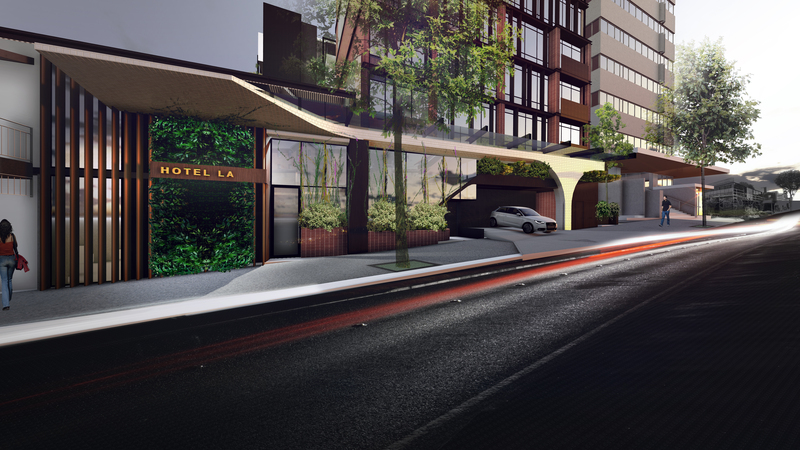 We identified the need for an alternative design vernacular in contrast to the existing commercial provisions in the South Brisbane precinct. 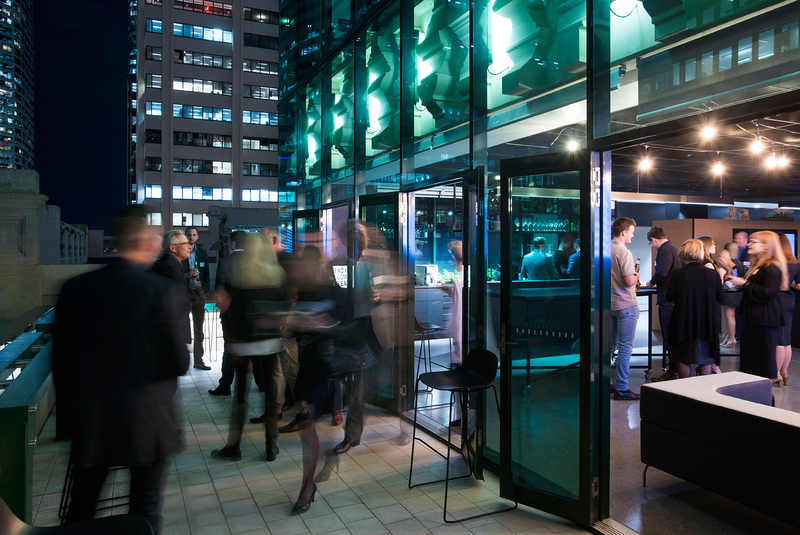 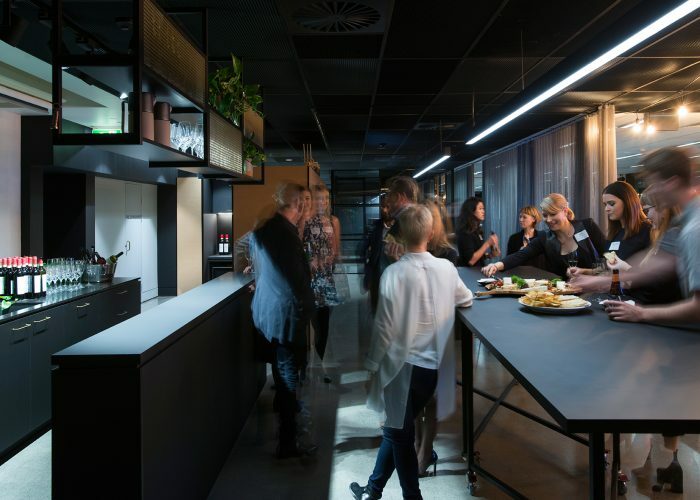 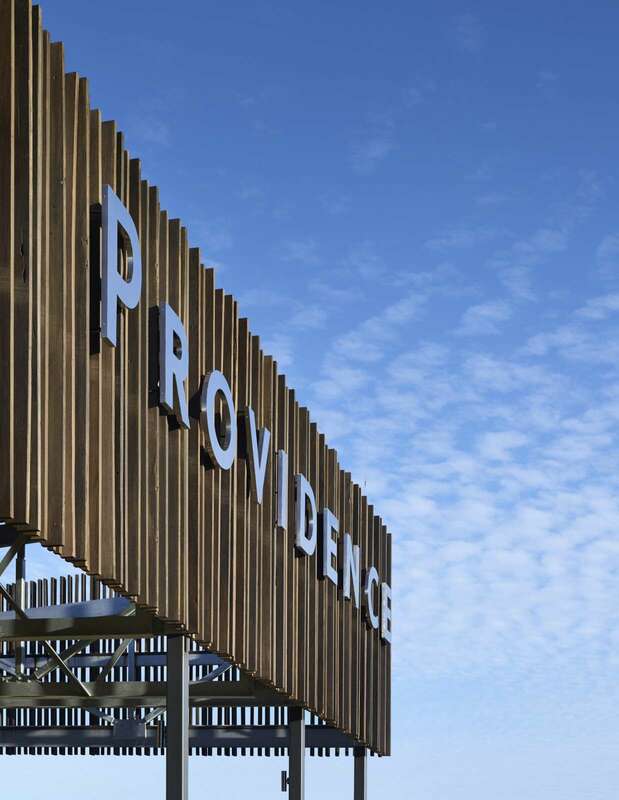 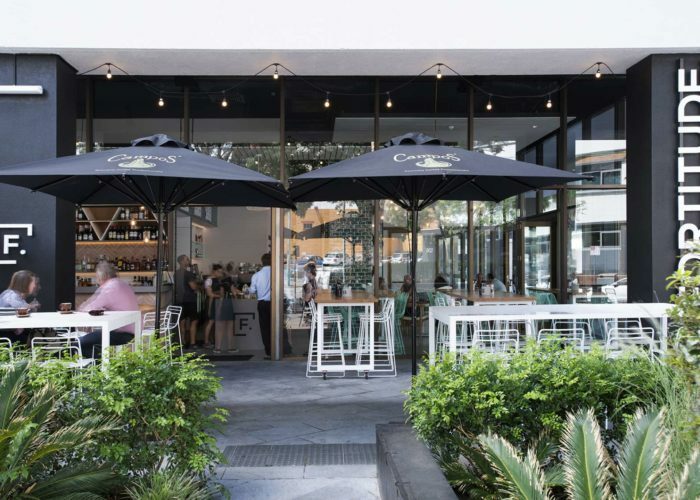 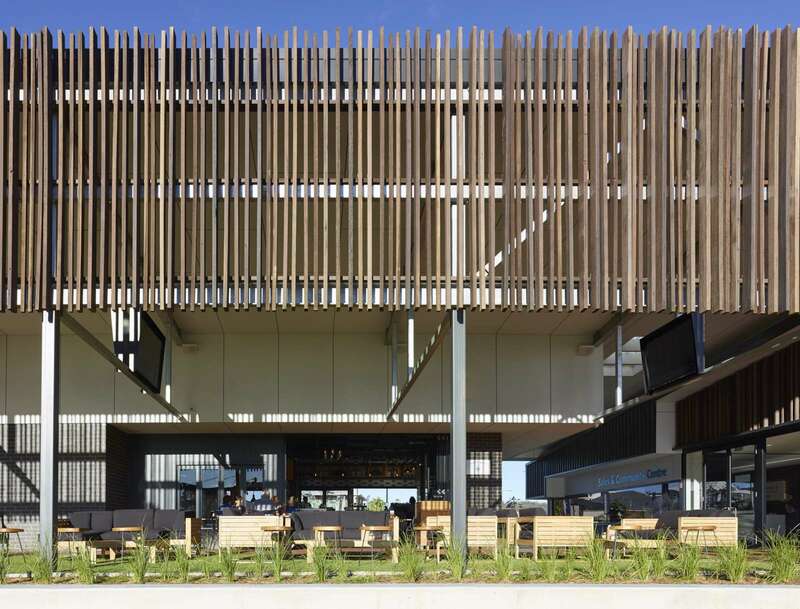 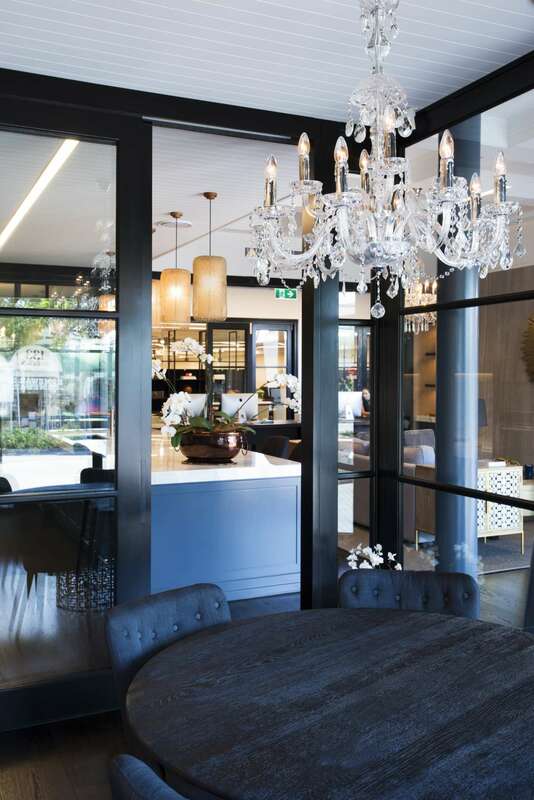 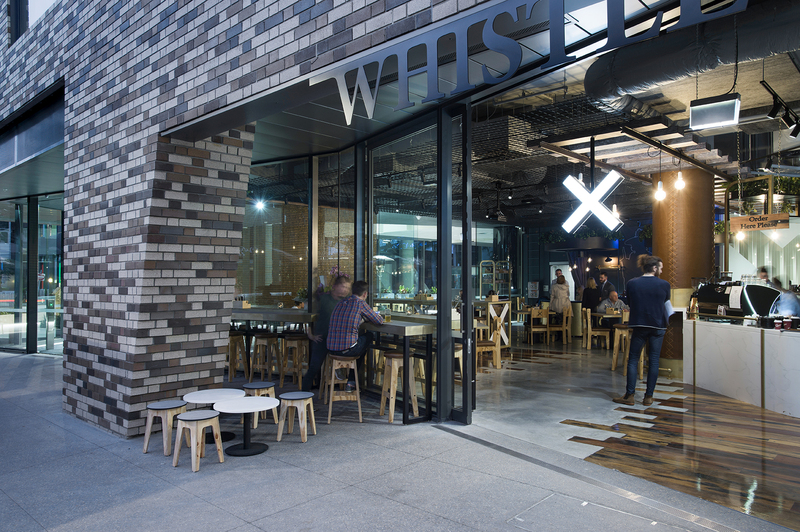 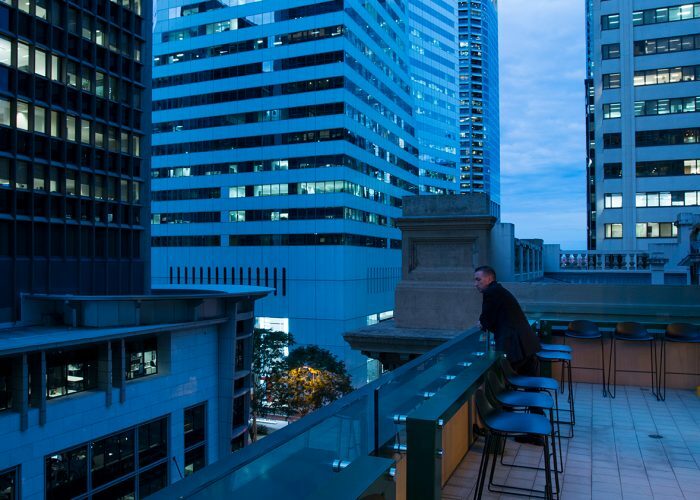 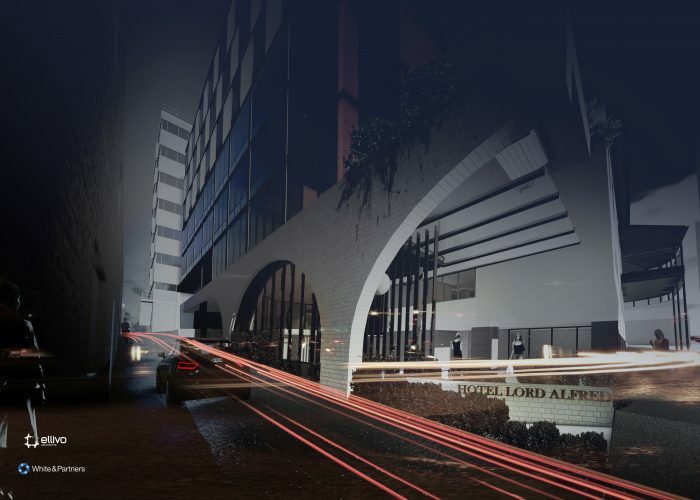 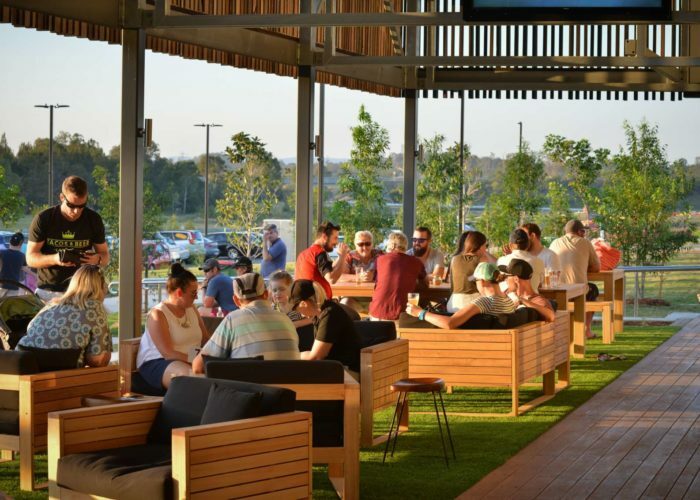 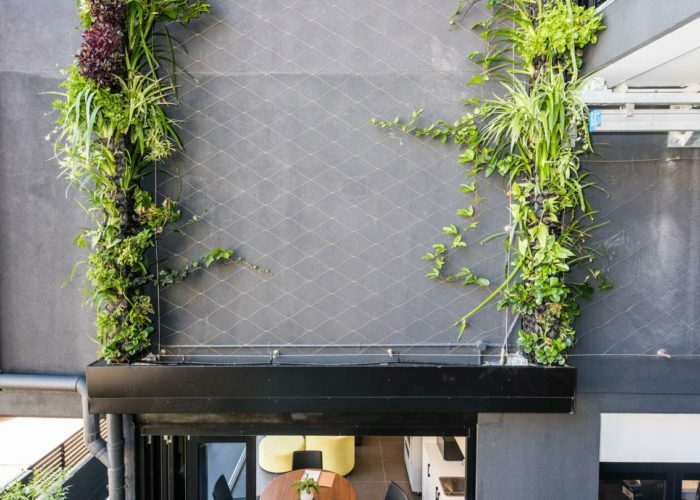 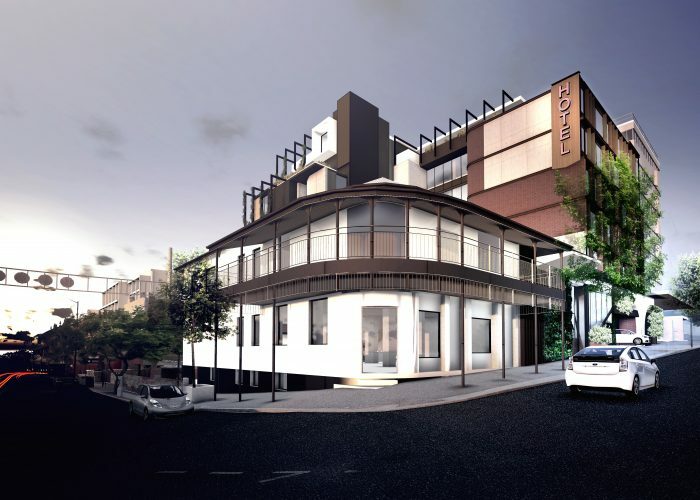 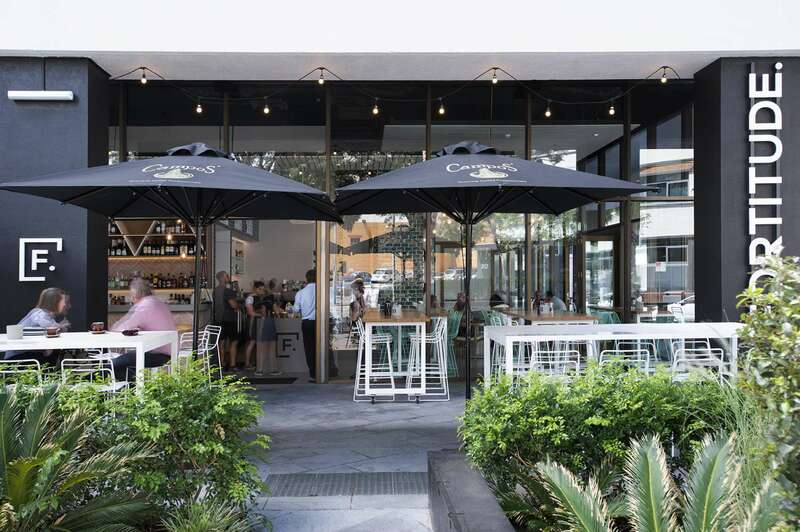 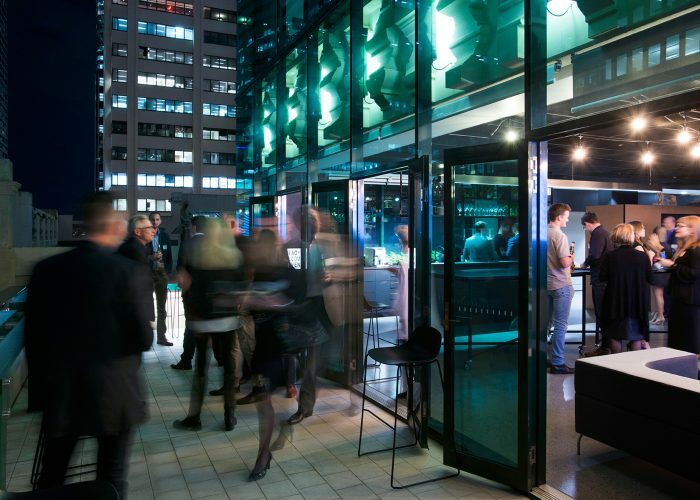 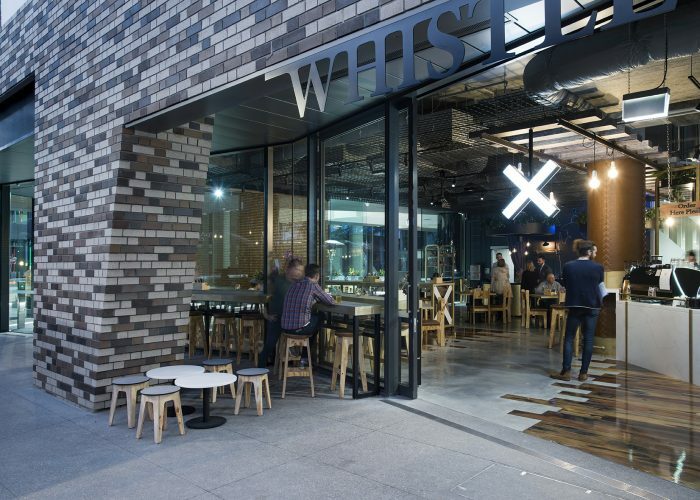 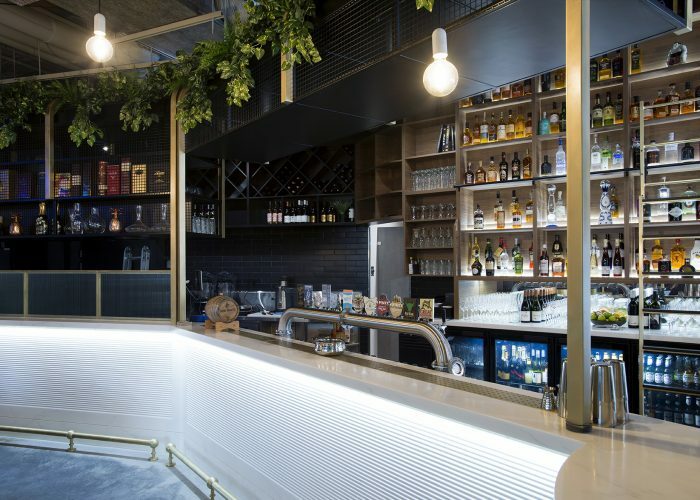 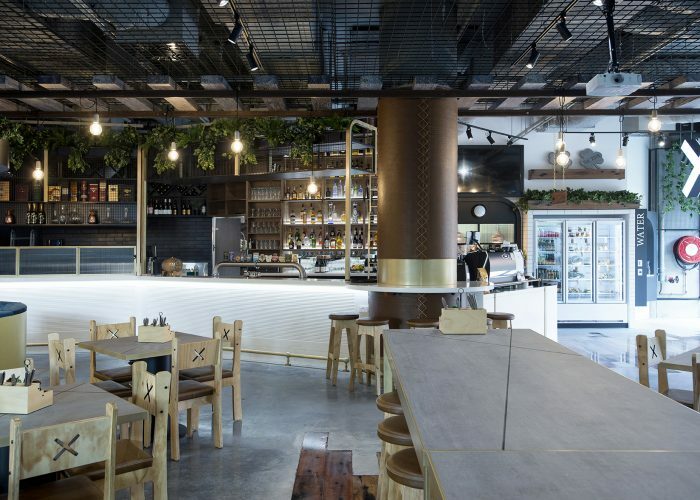 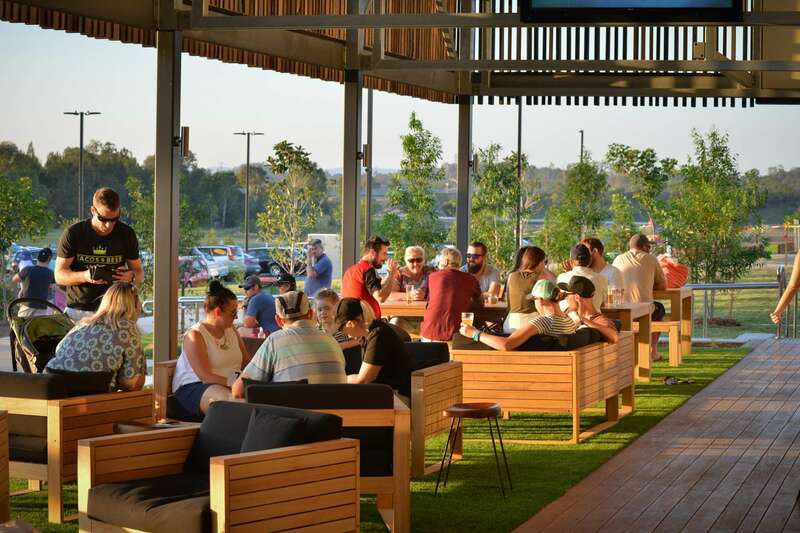 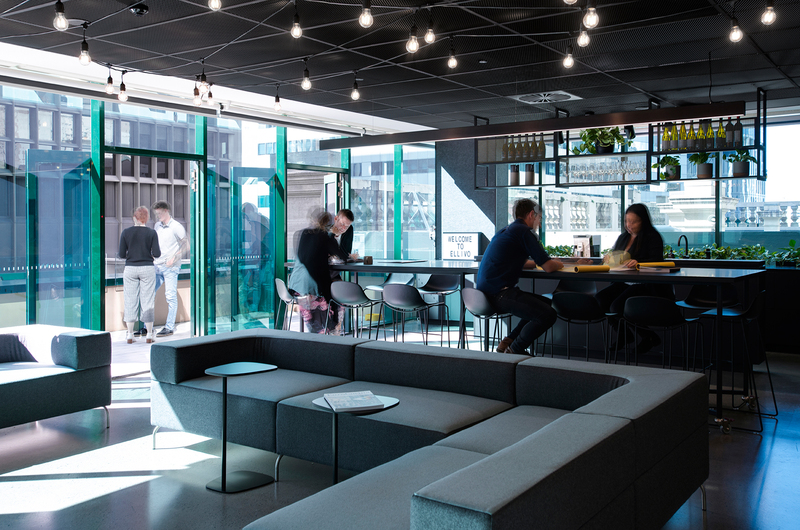 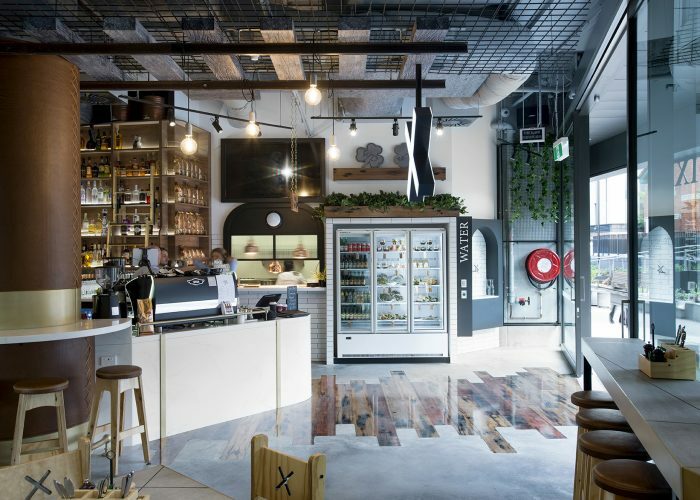 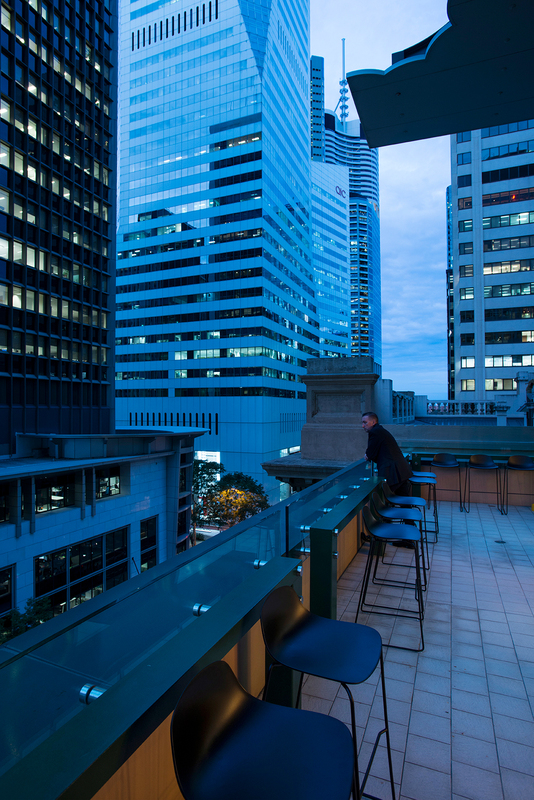 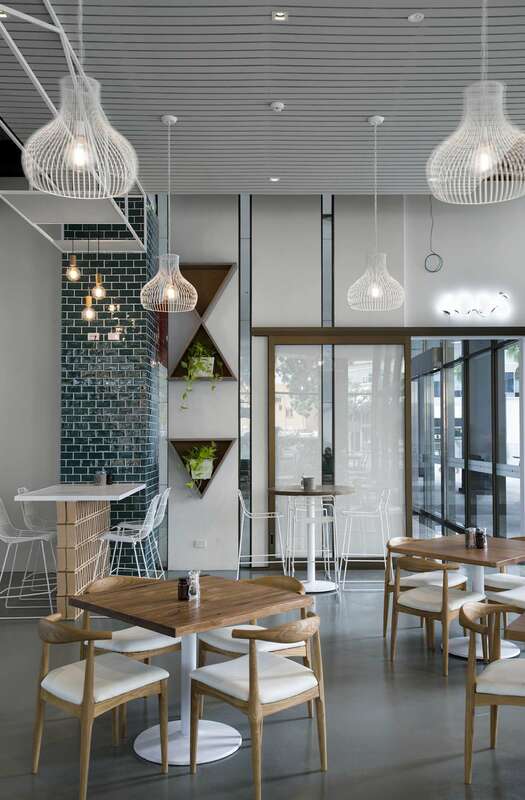 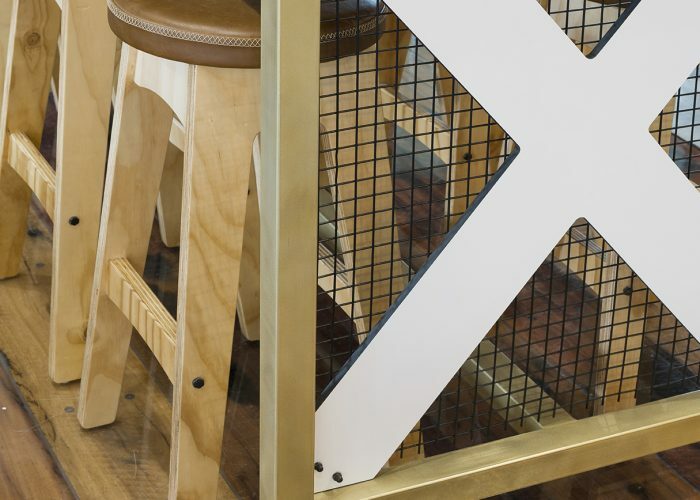 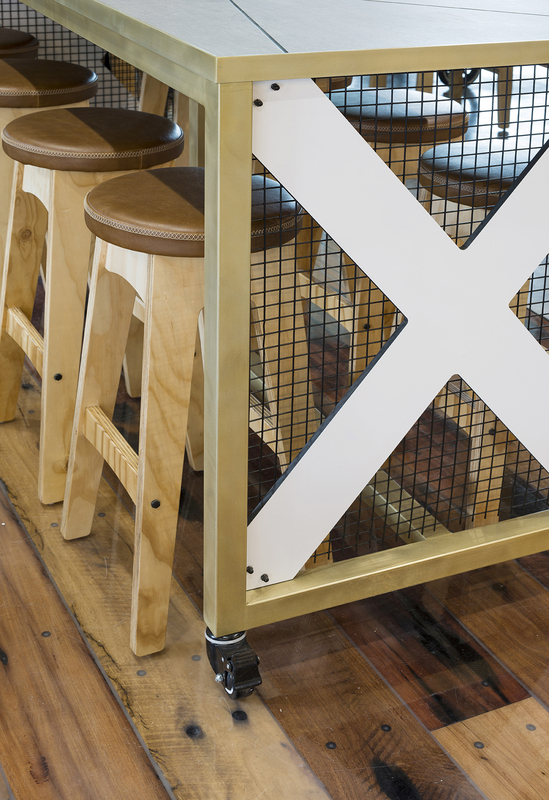 We placed a focus on connections with the outdoors, activation of the ground plane network of bustling cafes and bars, and providing visual connection to neighbouring precincts of West End and the CBD were essential components of their living criteria. 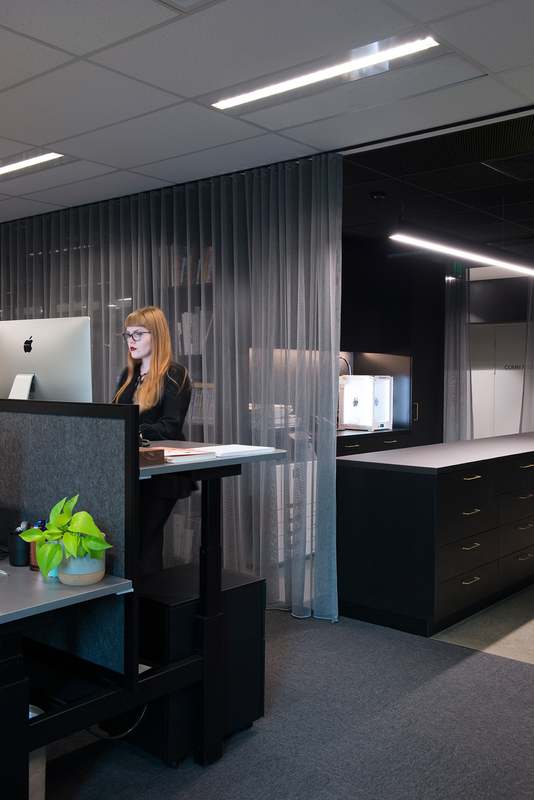 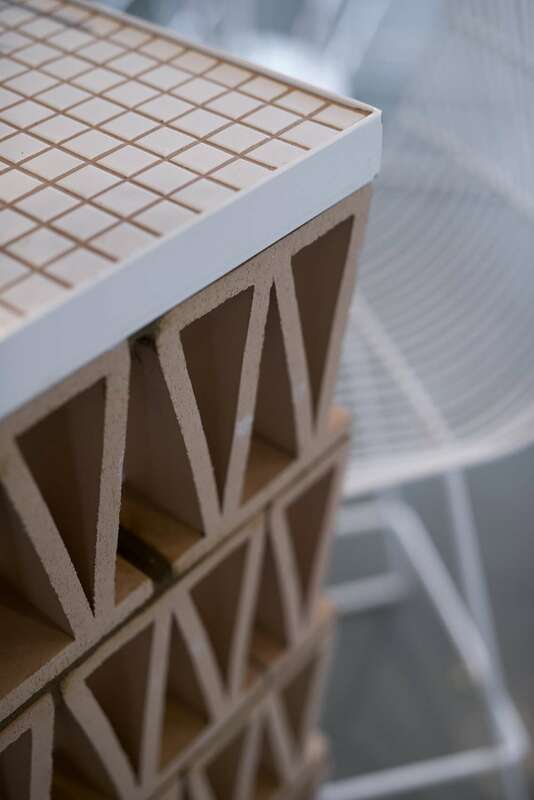 Designing for the specific characteristics of a place and its people is a mantra in our studio. 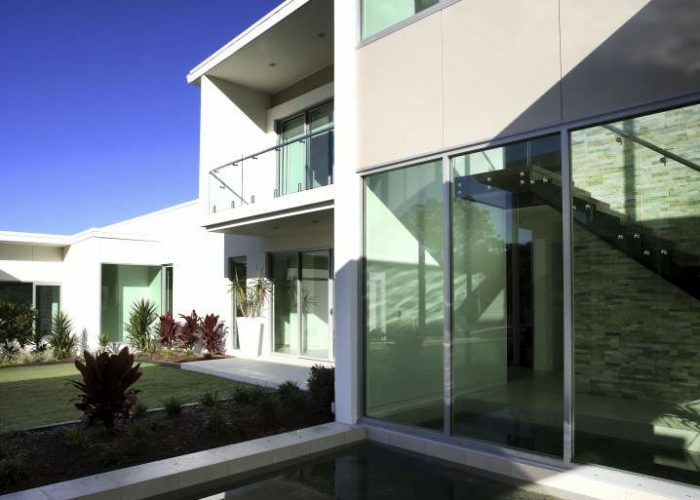 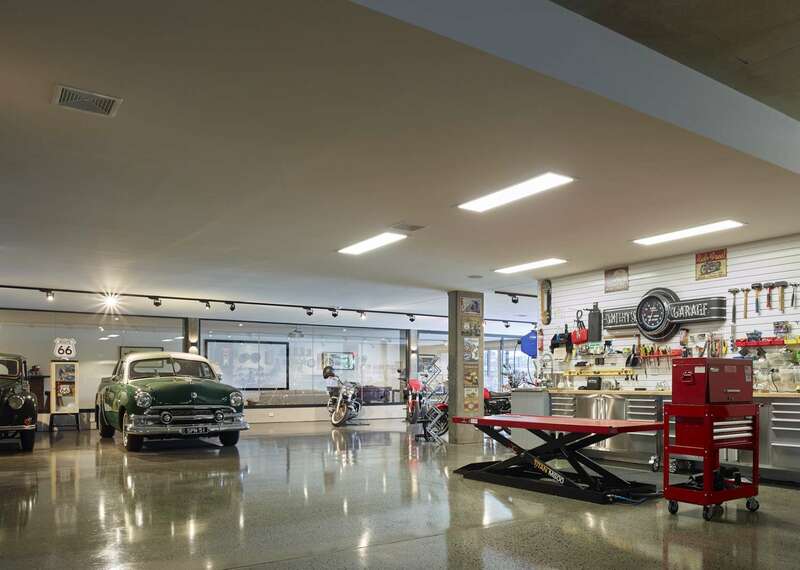 Enclave at is a great example of how an understanding of these elements can make a great place. 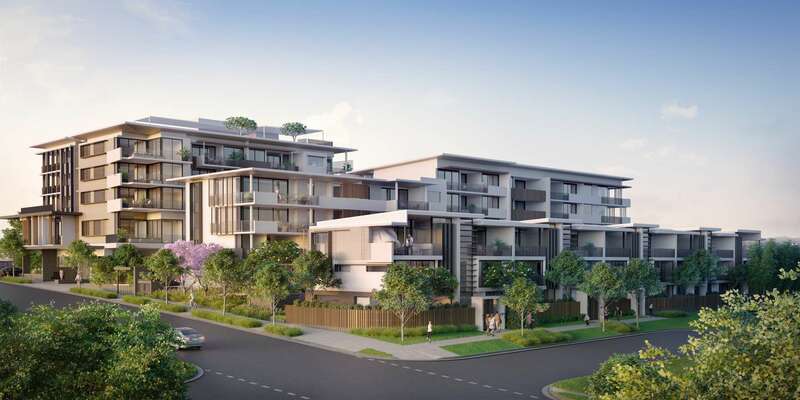 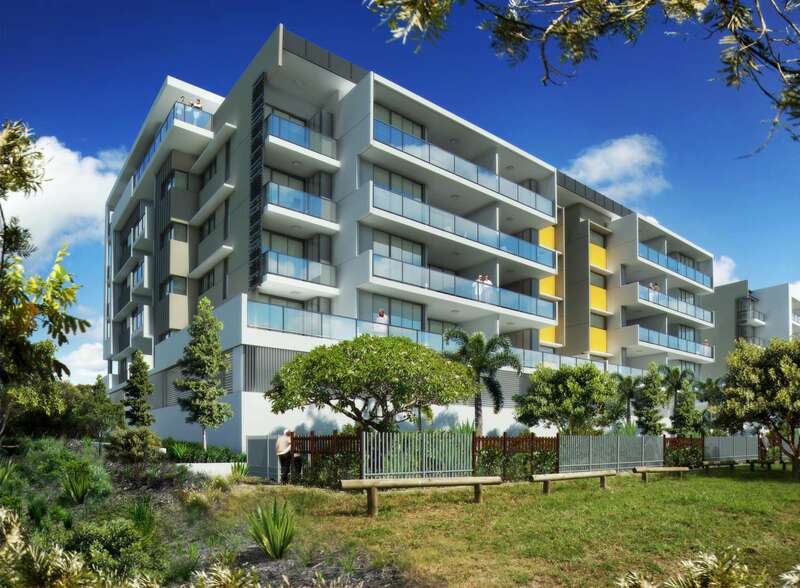 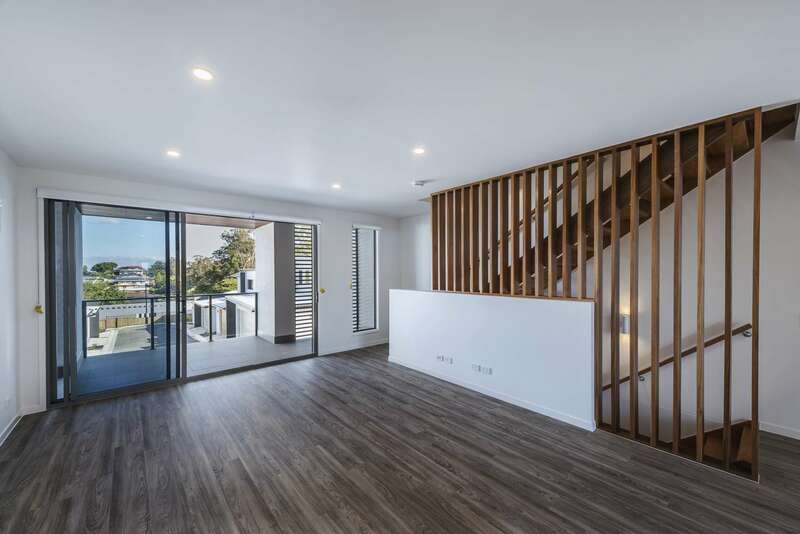 Our client recognised the limited offerings for medium density options in the Wynnum Manly area. 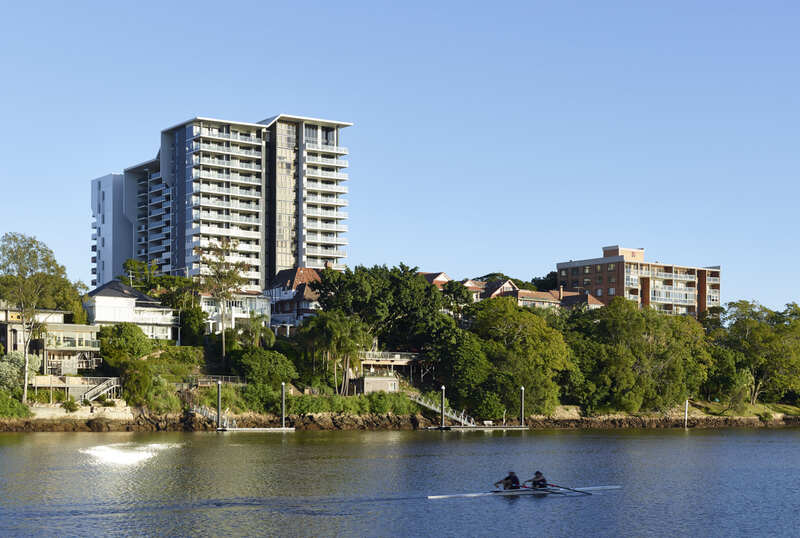 Our brief was born out of the area, its residents and the characteristics that define bayside living. 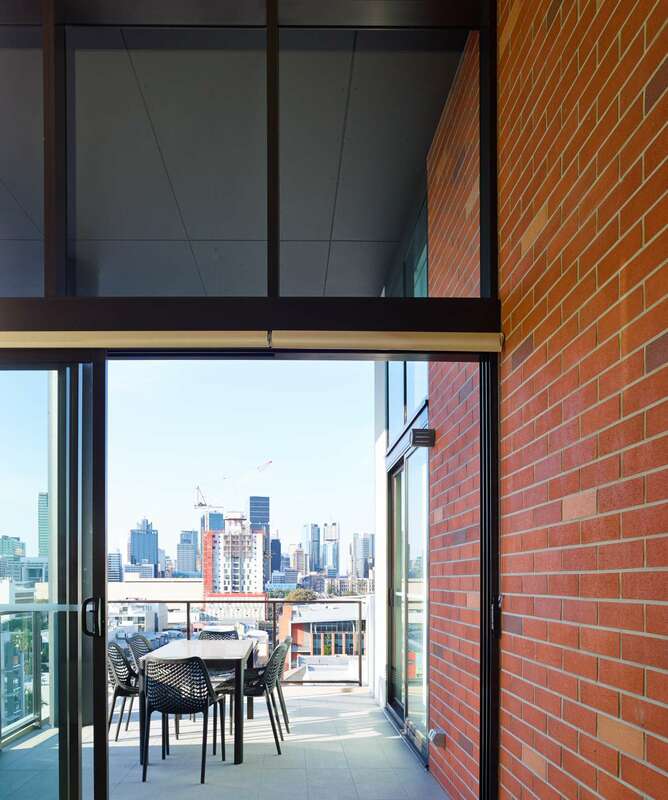 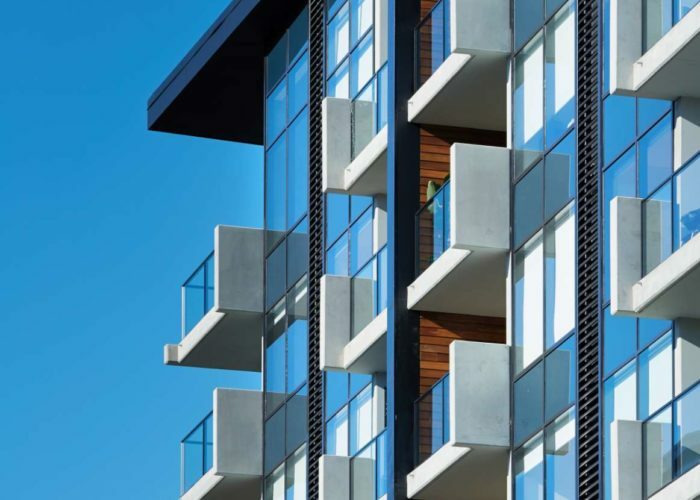 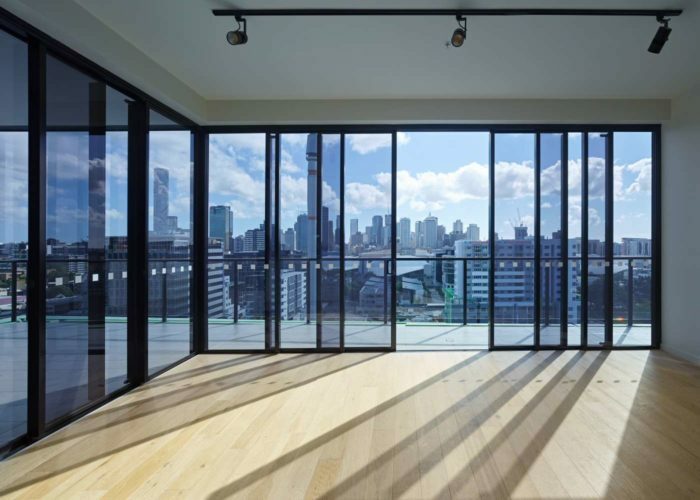 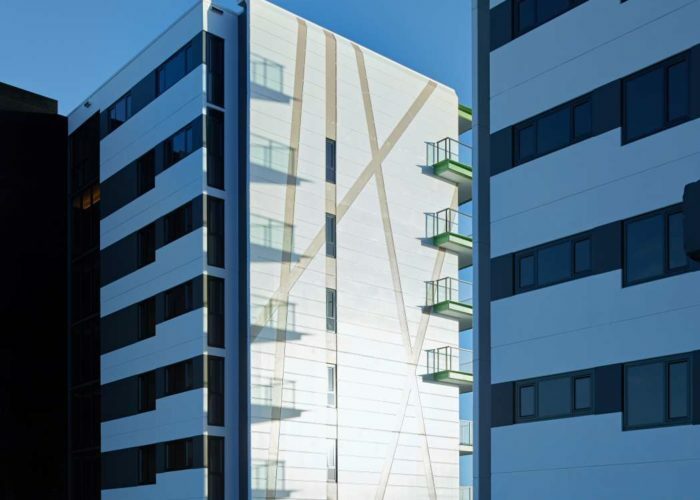 Three buildings offer three types of living, from townhomes to generous apartments. 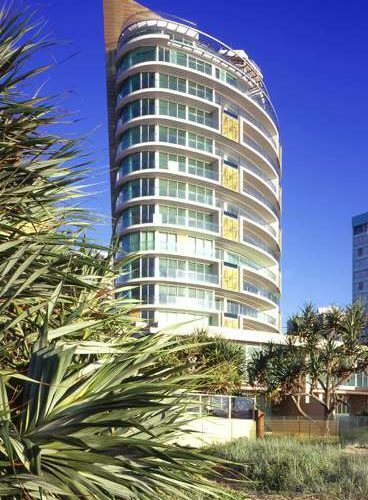 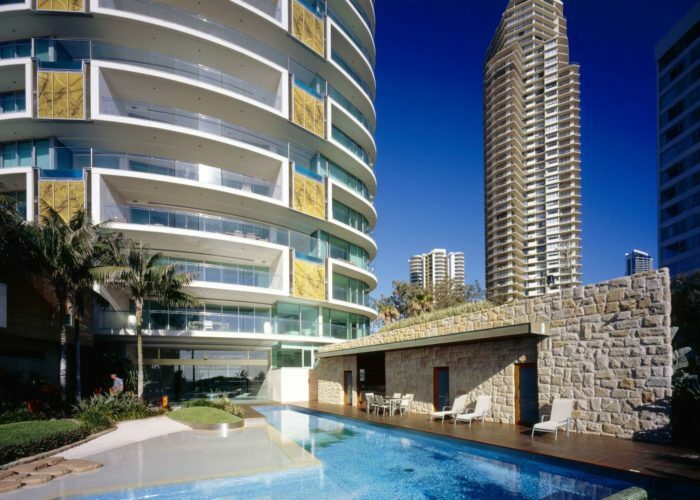 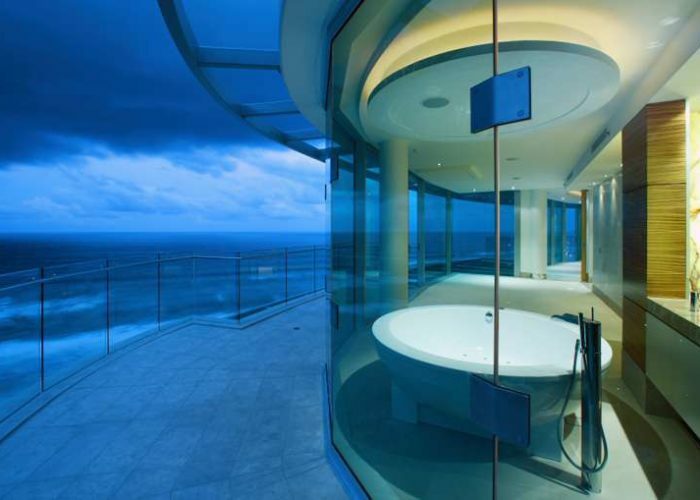 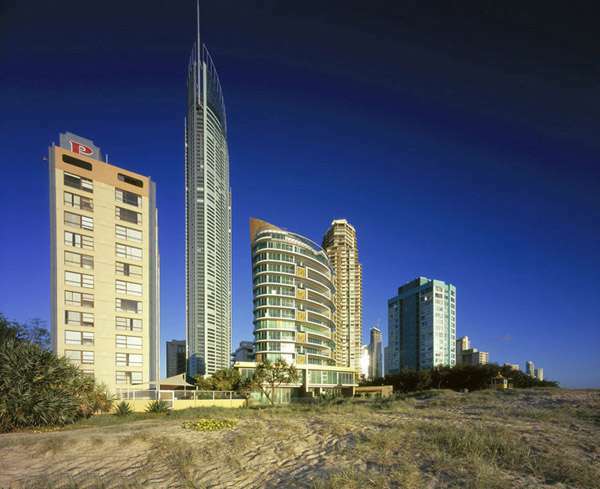 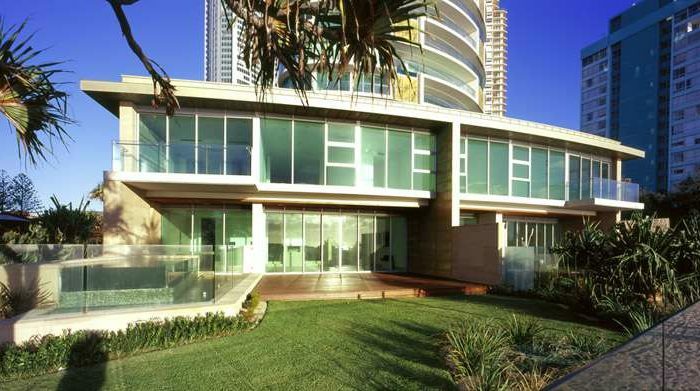 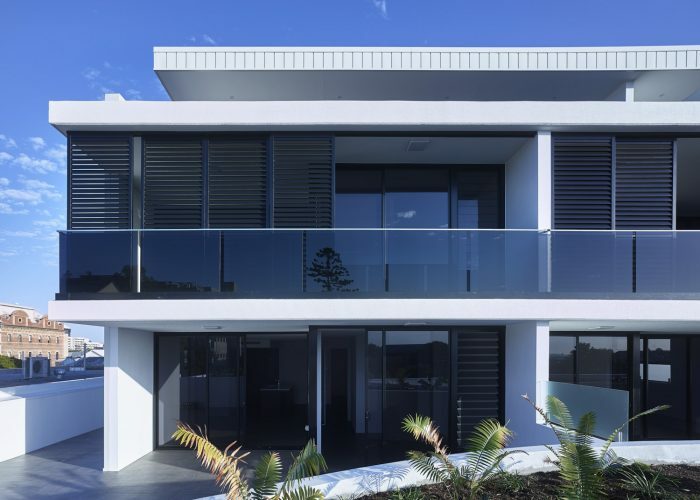 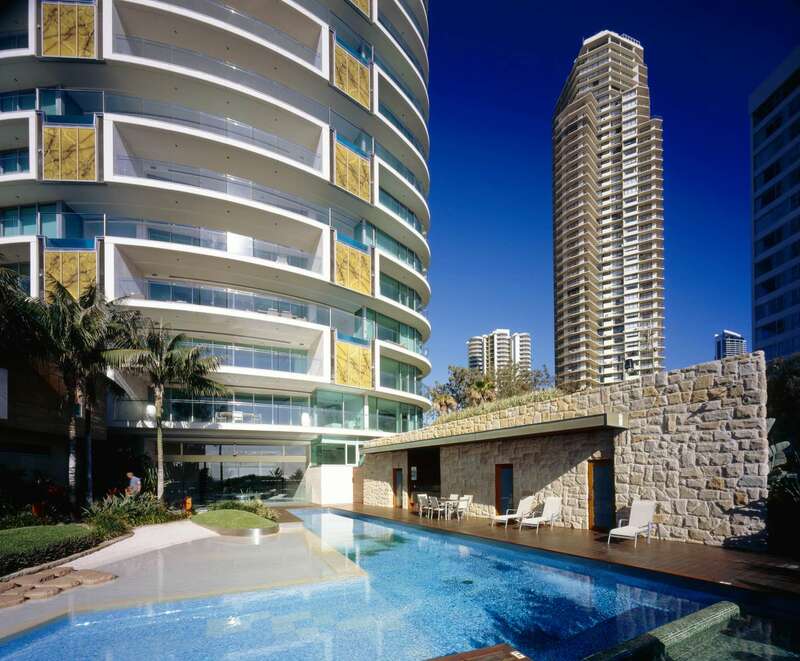 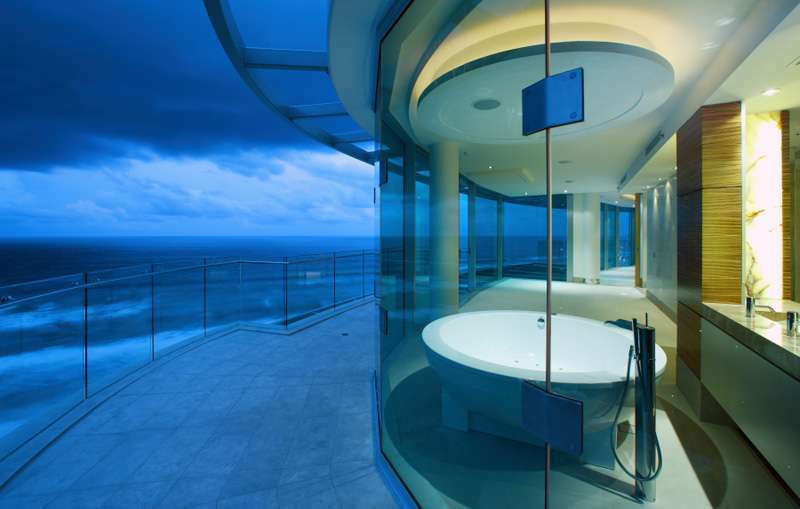 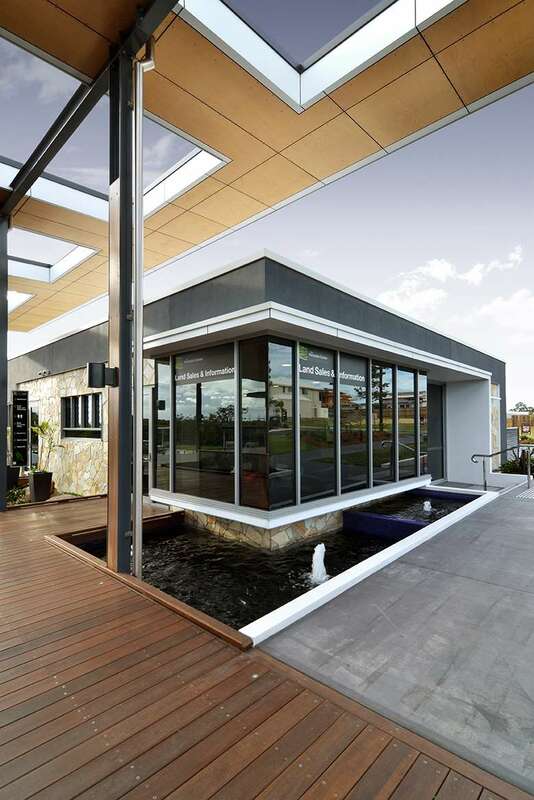 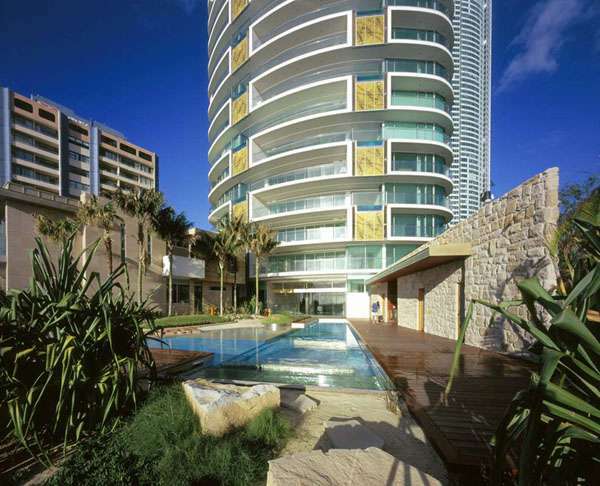 The key elements of the design are views, bay breezes, and a level of accommodation that appeals to owner occupiers. 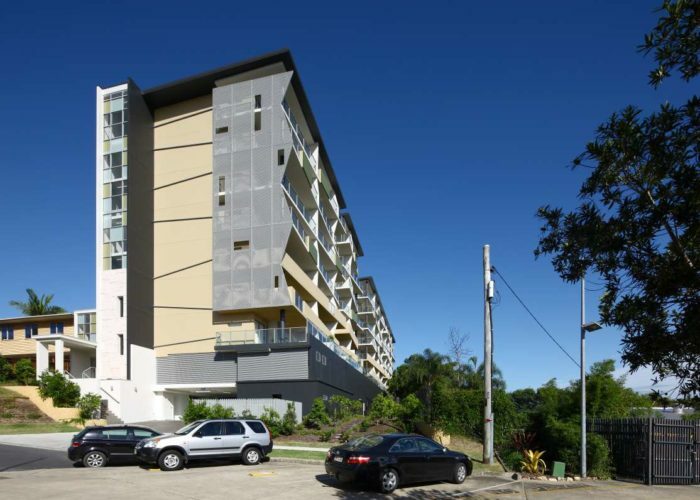 It also has to “fit“ in the local area. 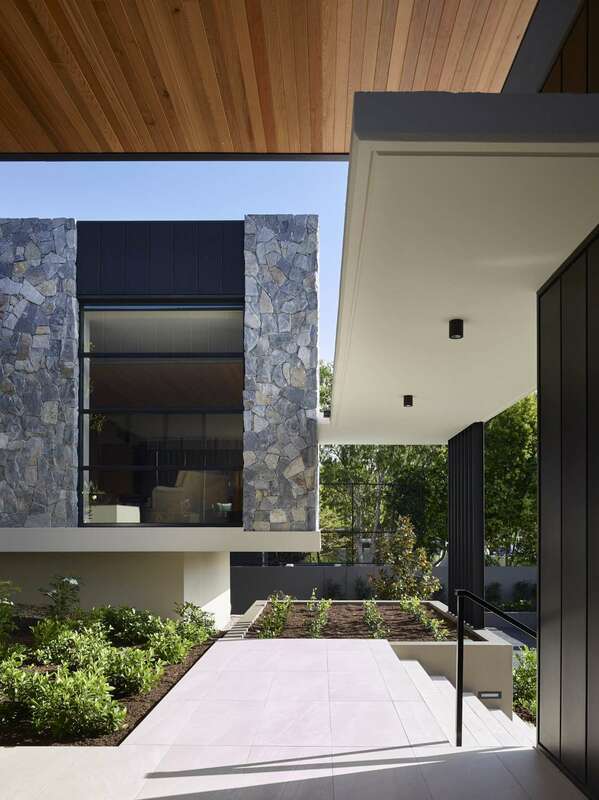 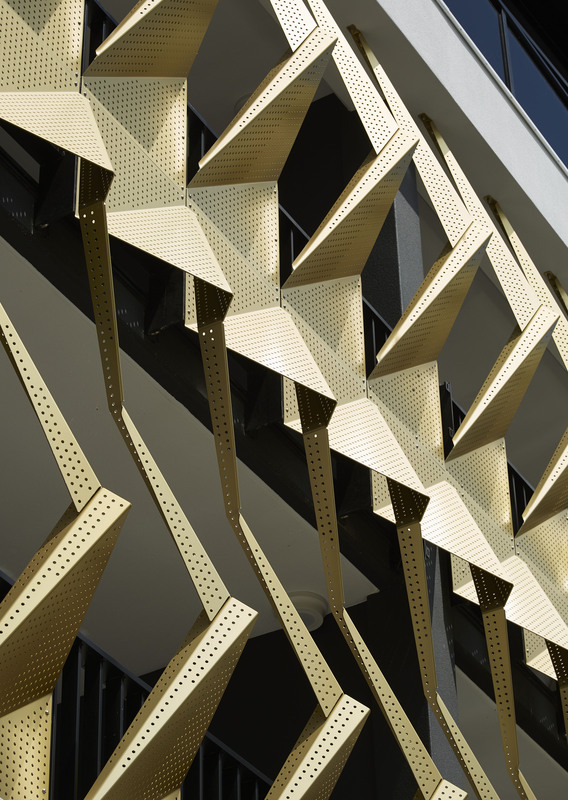 The materials and scale were driven by the desire to embrace and reflect the scale and feel of the neighbourhood. 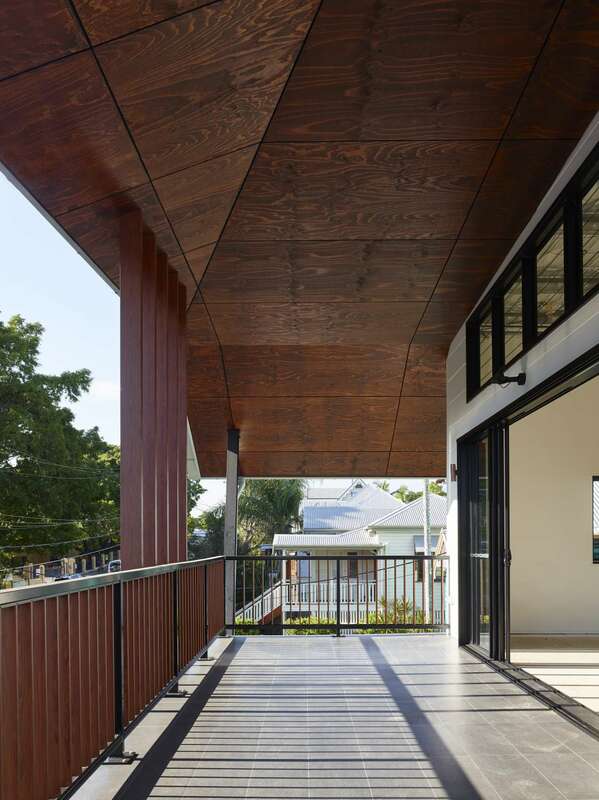 The central timber boardwalk reflects the nearby mangrove boardwalks. 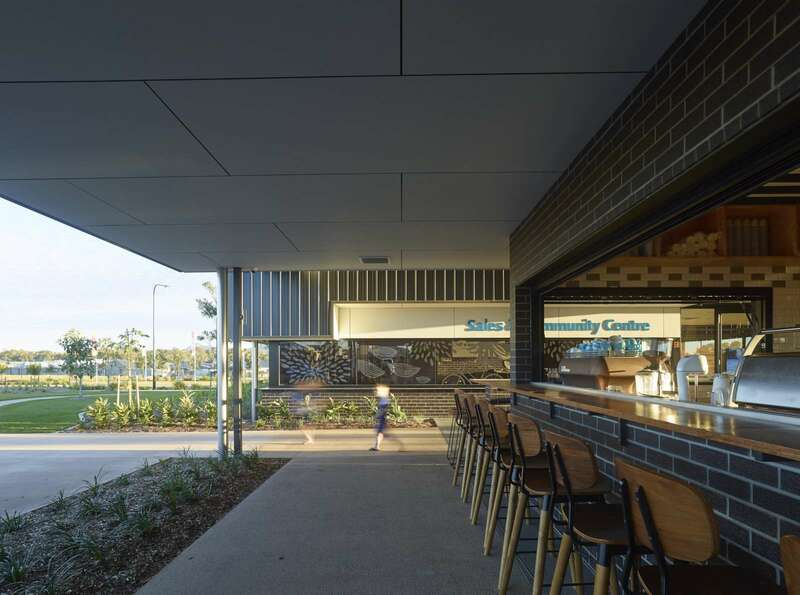 But the most important ingredient is to create the spaces that reinforce community. 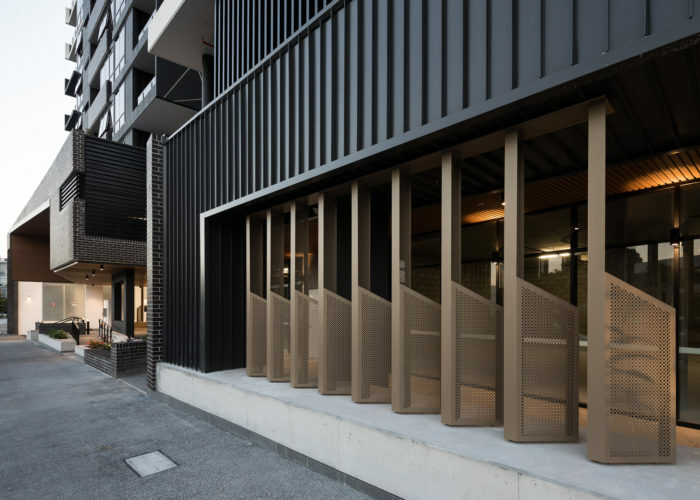 This is not a gated community, it provides security but contributes to the streetscape and provides great communal spaces for the owners. 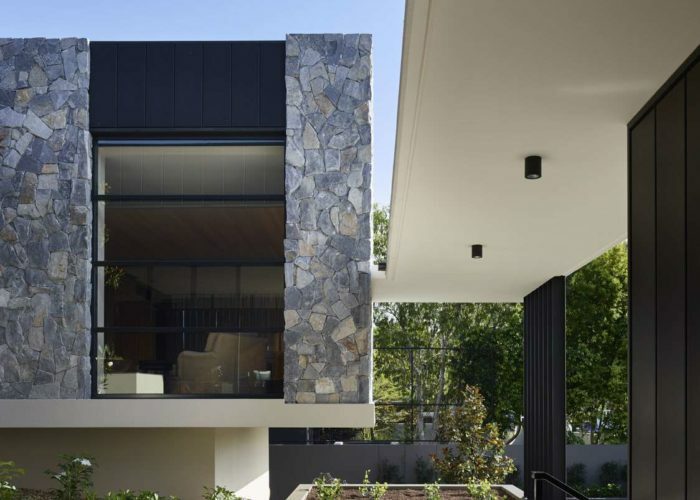 Minimal and raw yet textured and welcoming, the Paddington Residence is an exploration of space and materials for a rigorously contemporary family home in a historical setting. 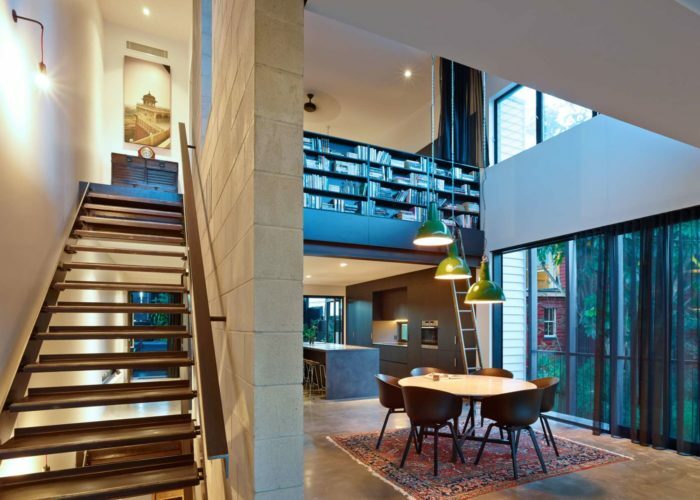 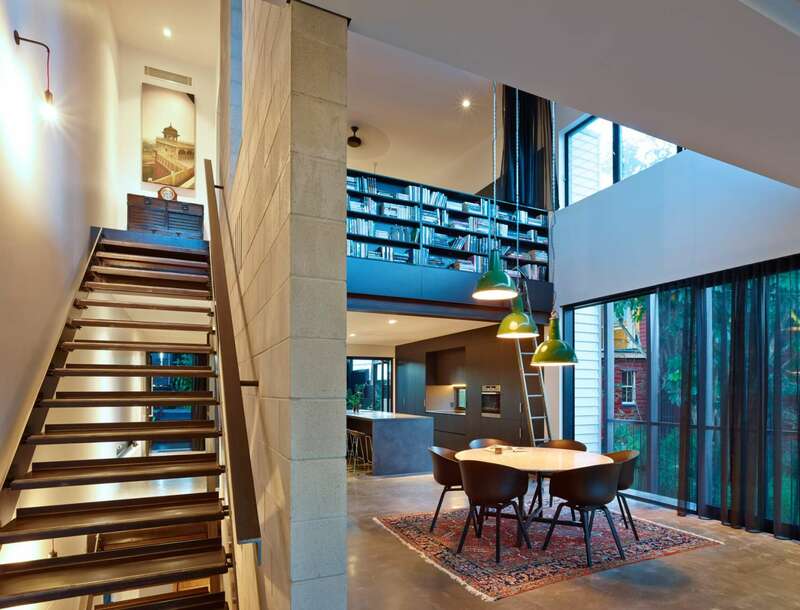 What is the appropriate response when designing a contemporary family home in a sensitive and historical setting? 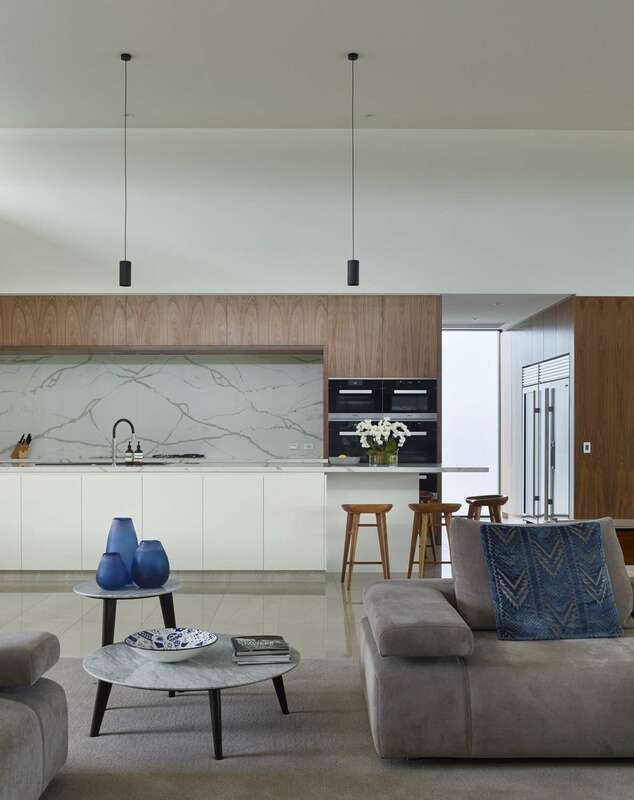 Minimal and raw yet textured and welcoming, the Paddington Residence is an exploration of space and materials for a rigorously contemporary family home in a historical setting. 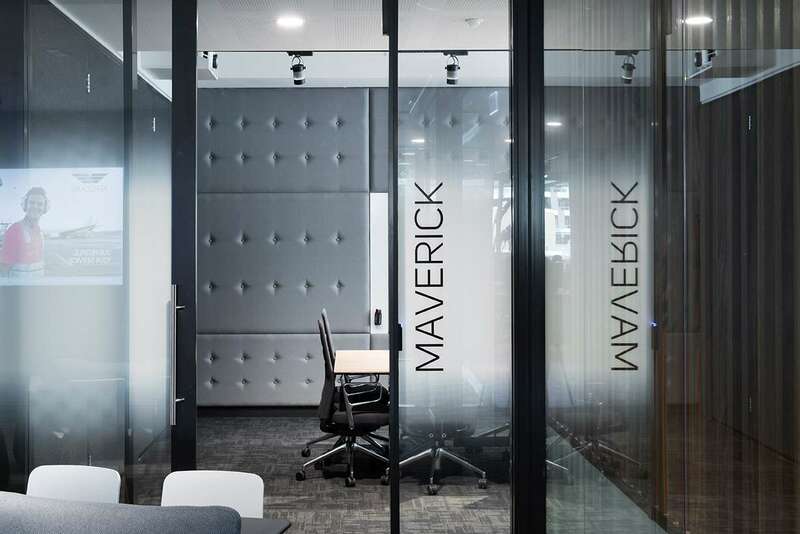 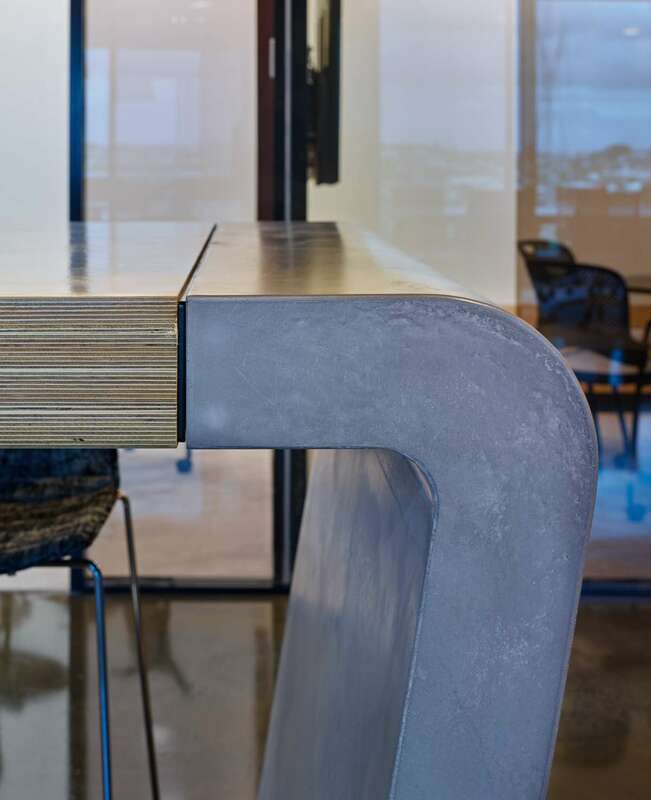 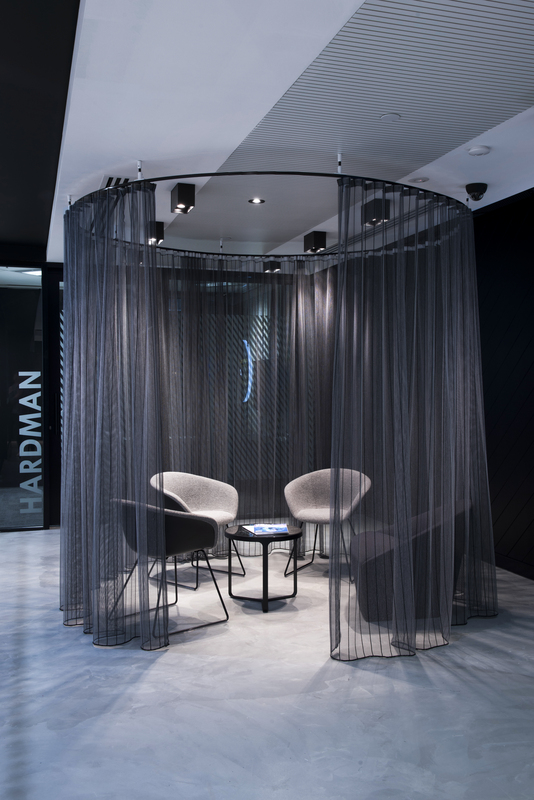 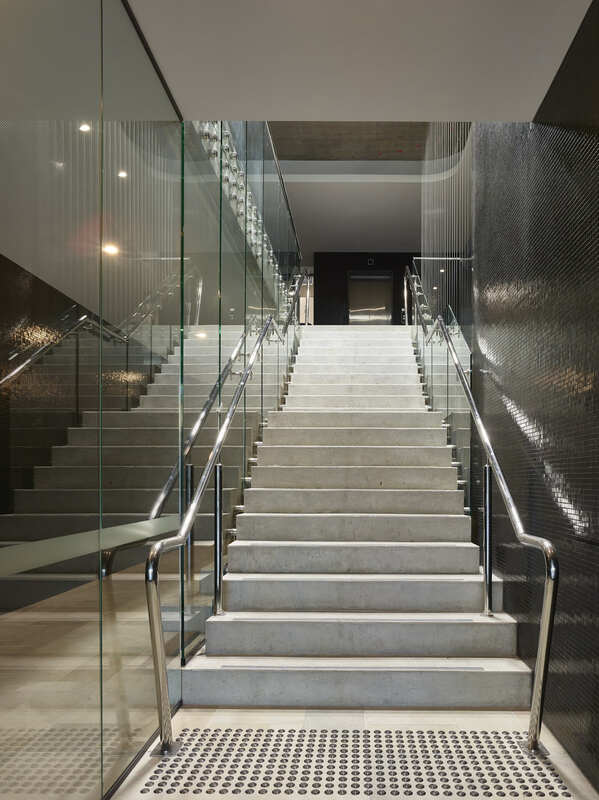 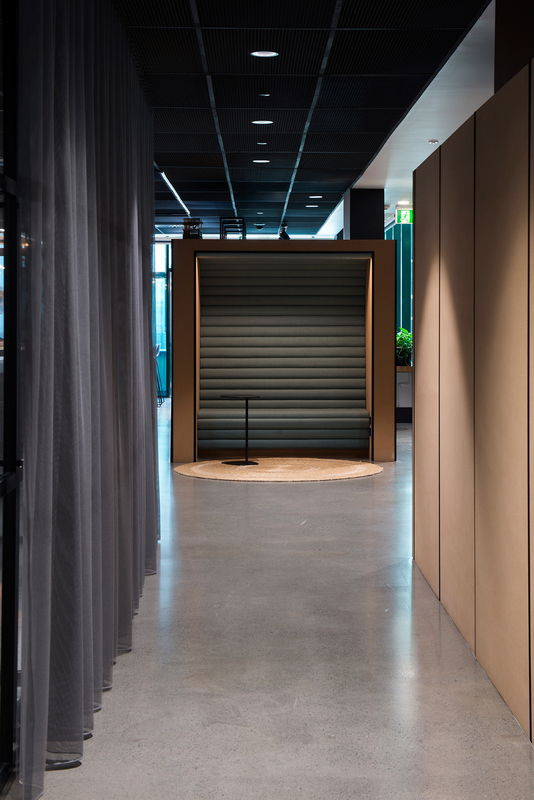 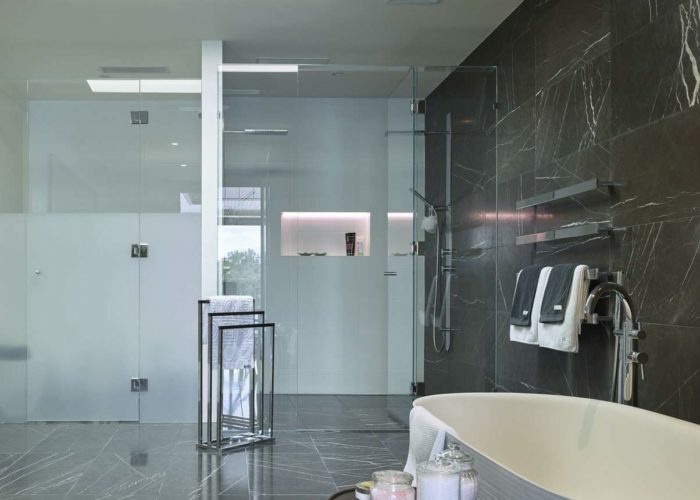 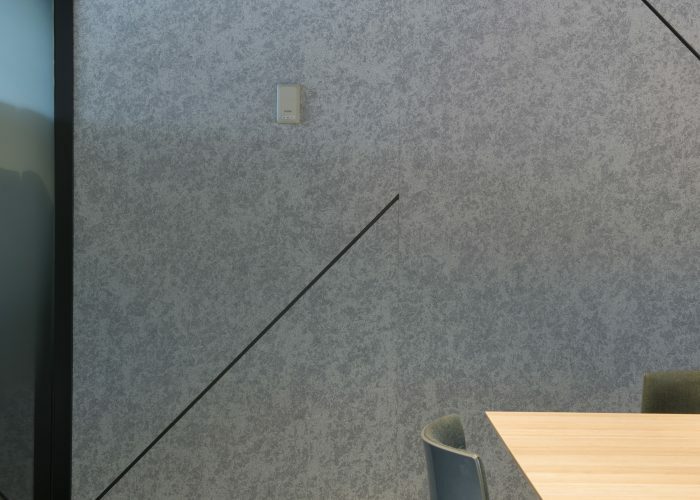 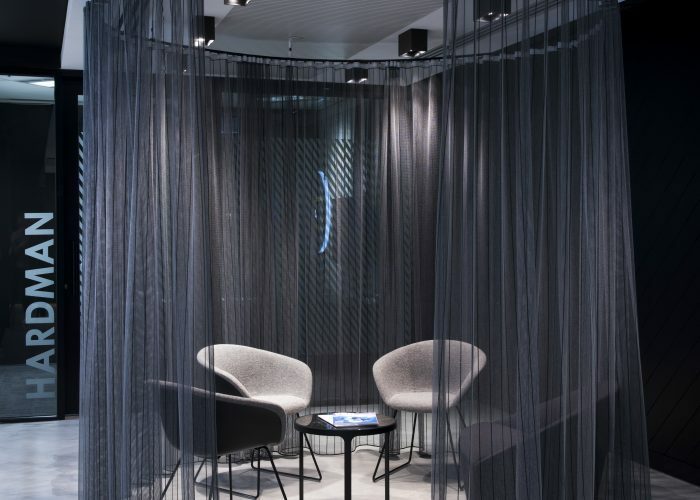 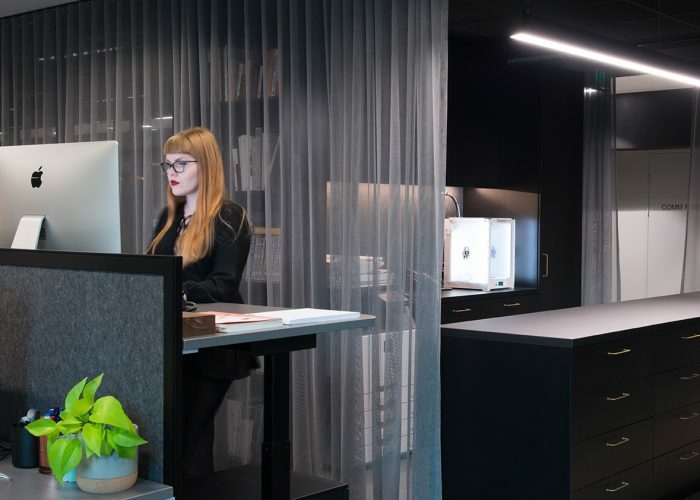 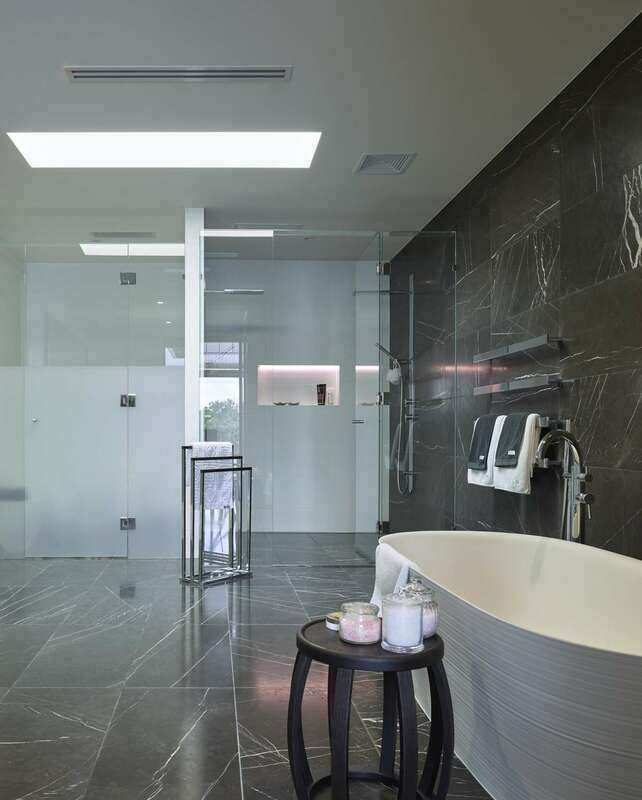 Beyond simply satisfying the client’s spatial requirements, the design explores how to create layered spaces with edges that offer privacy and flexibility. 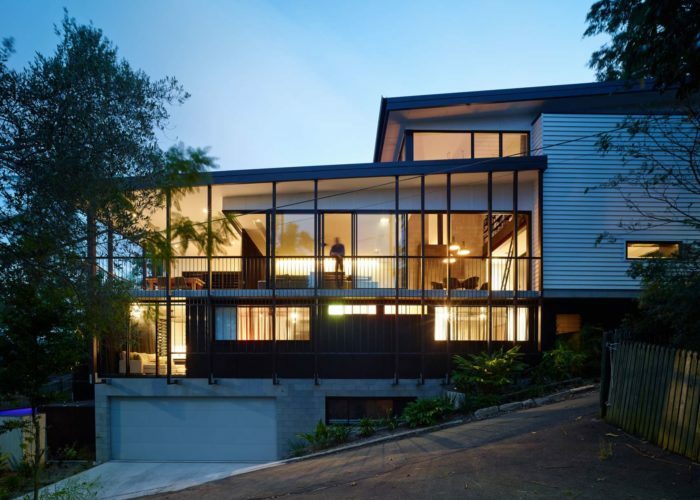 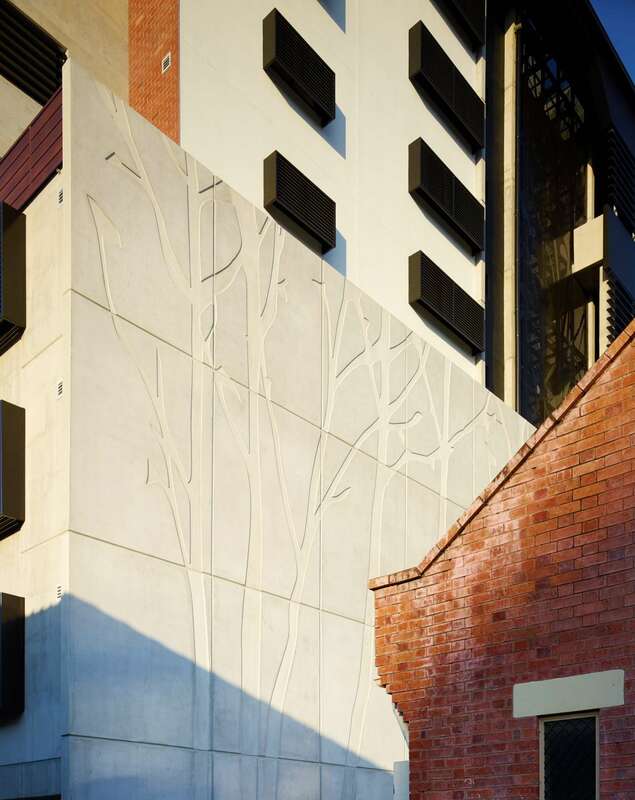 The challenge within this brief was to deliver their spatial requirements on a small 400 square metre site with heritage neighbours, a very steep slope and ensuring protection of the significant tree. 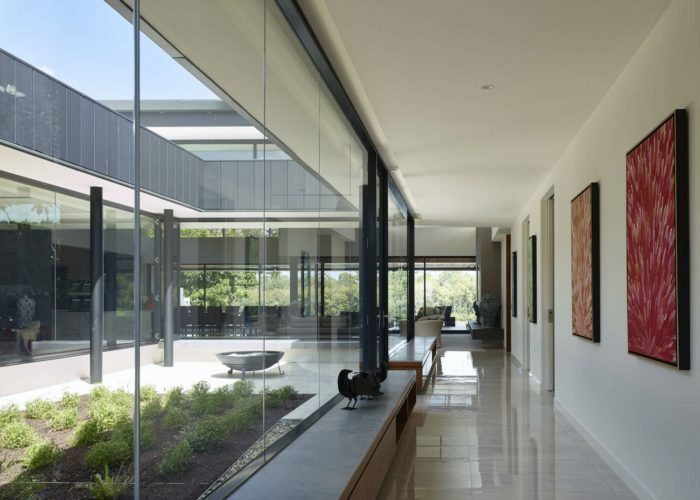 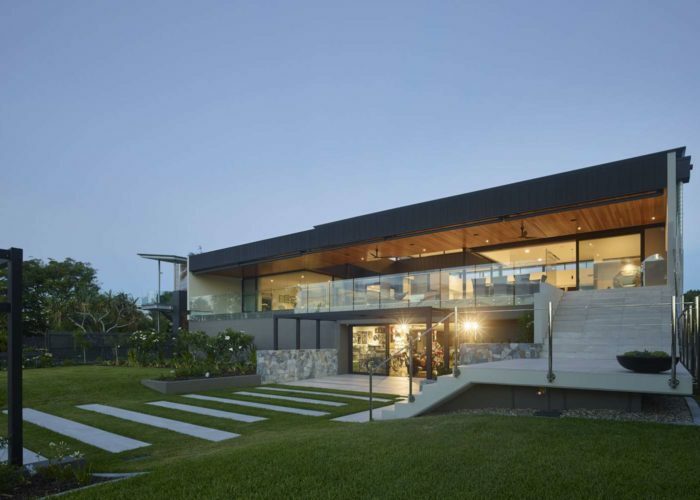 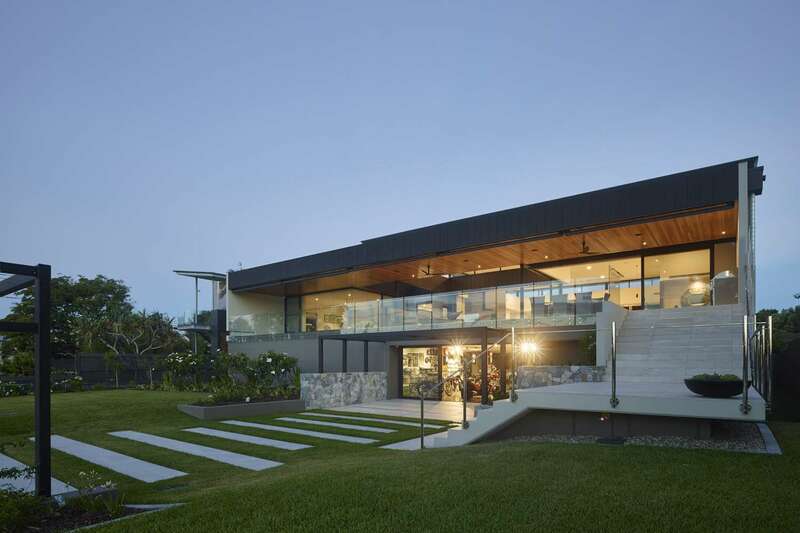 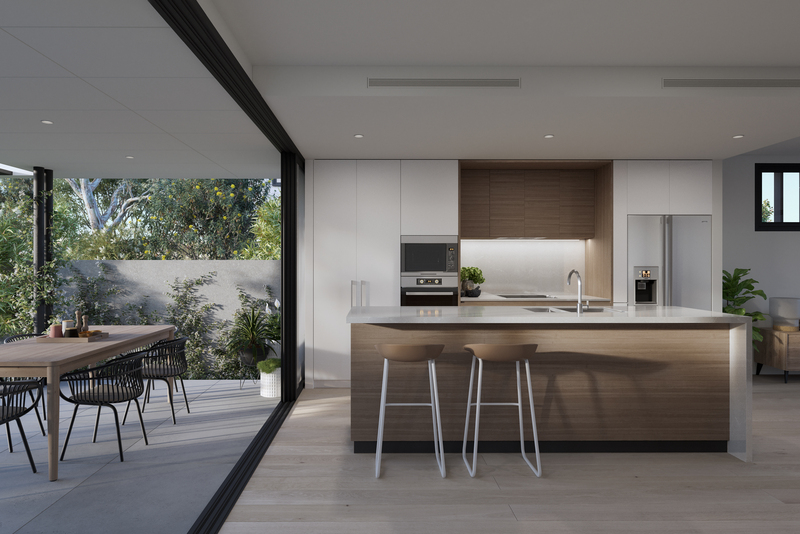 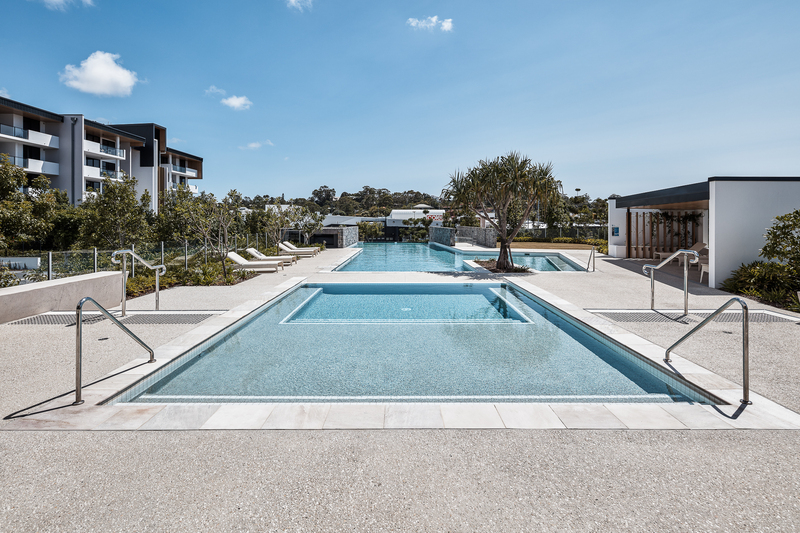 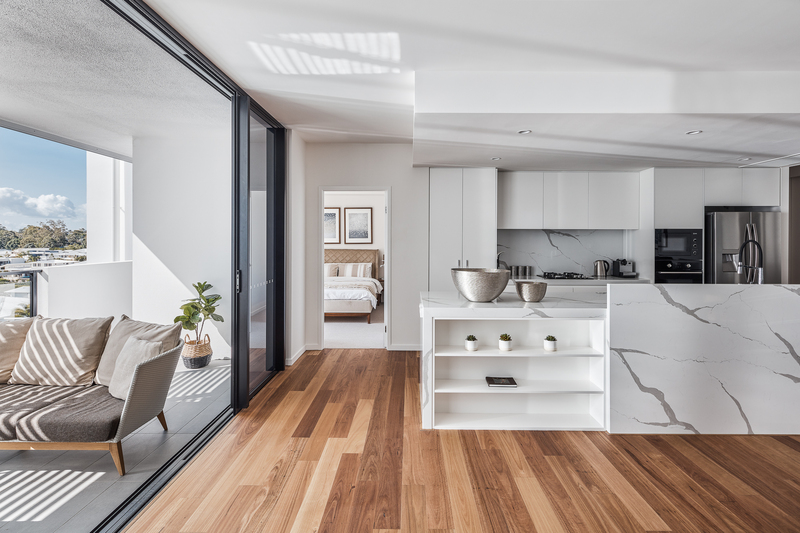 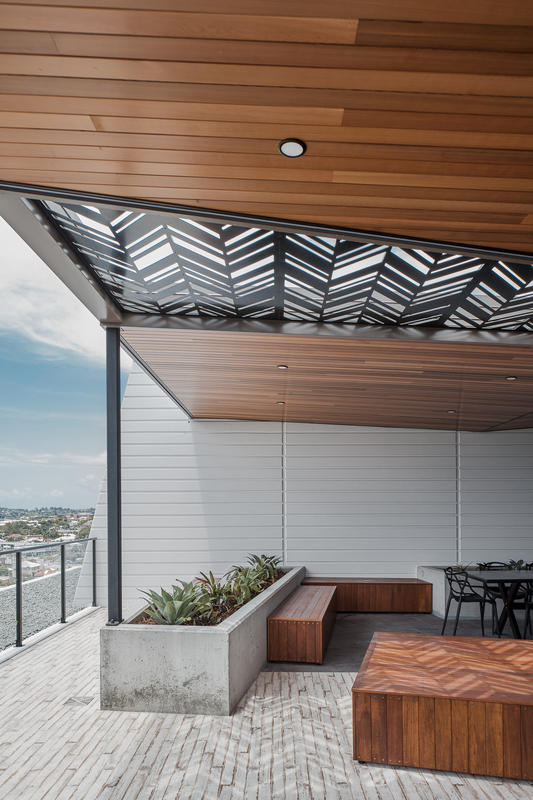 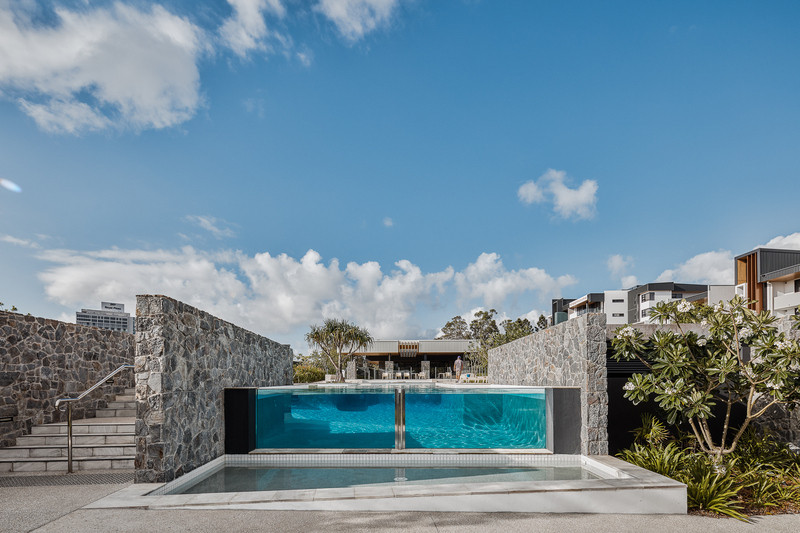 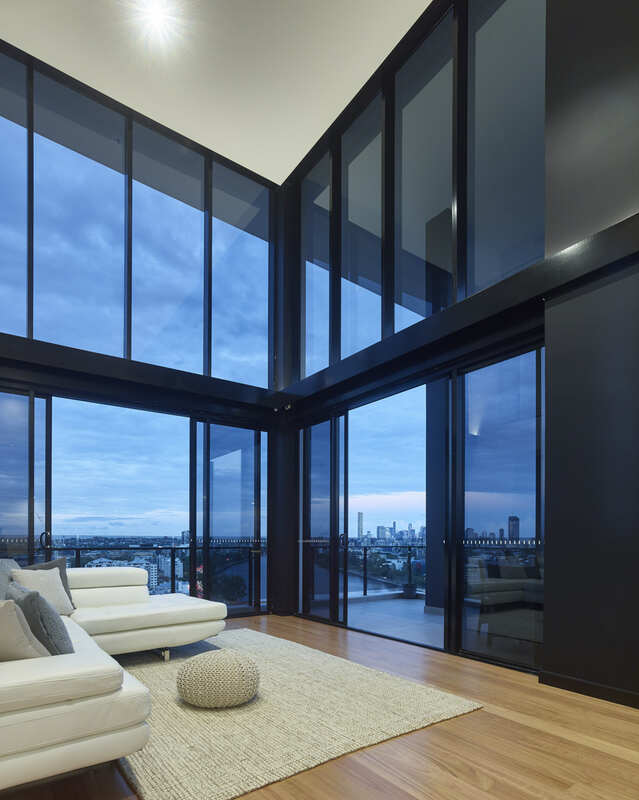 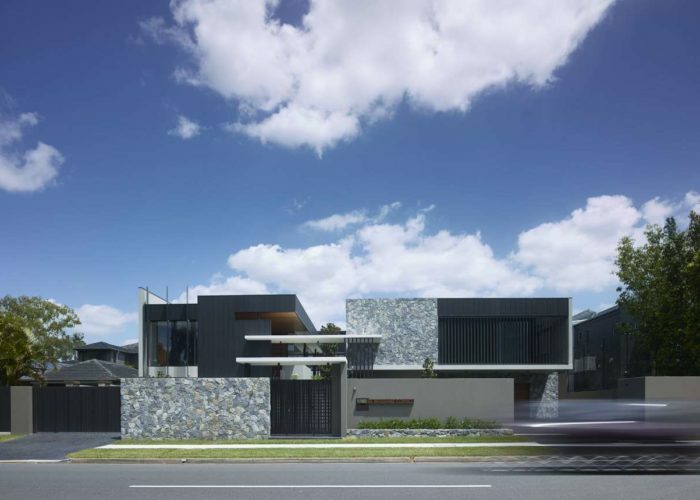 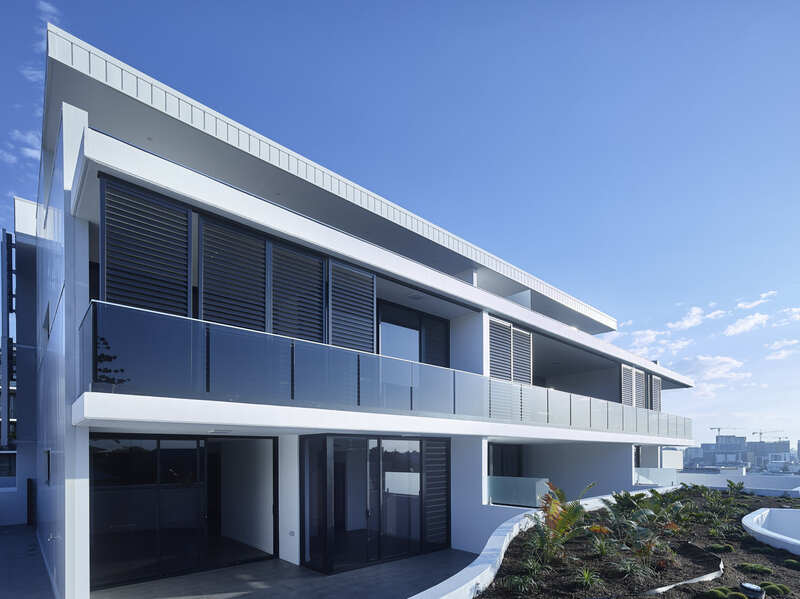 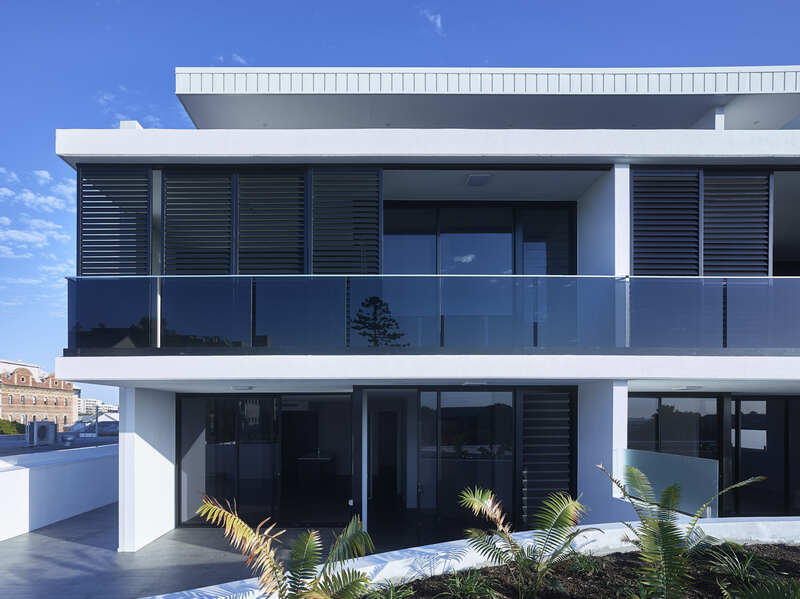 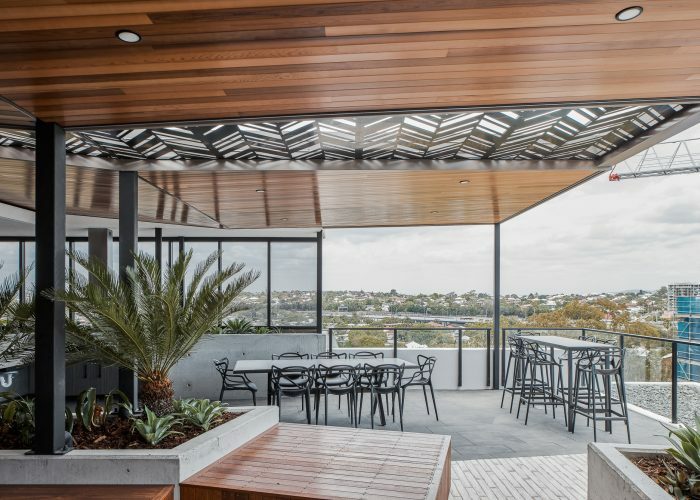 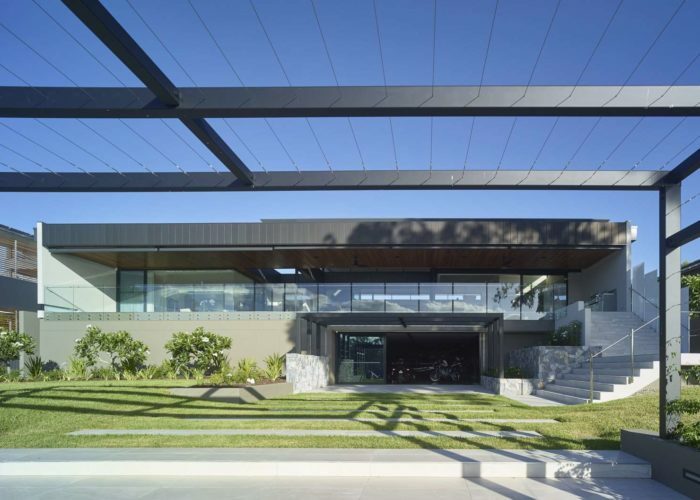 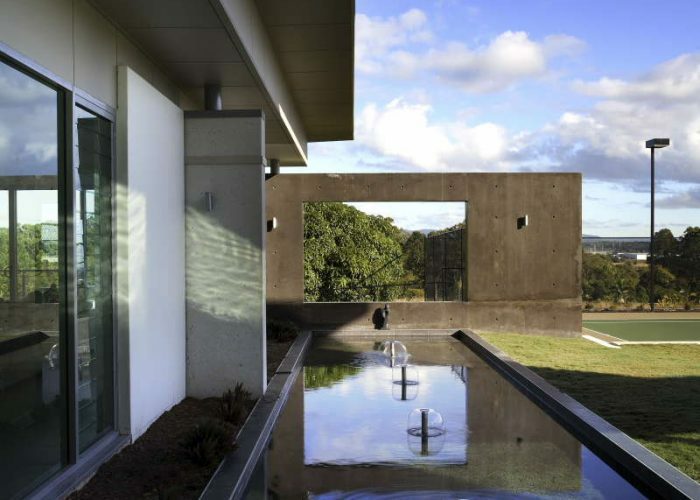 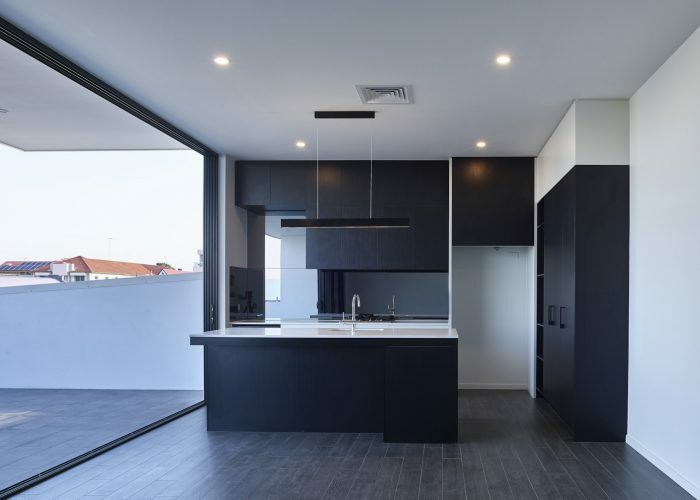 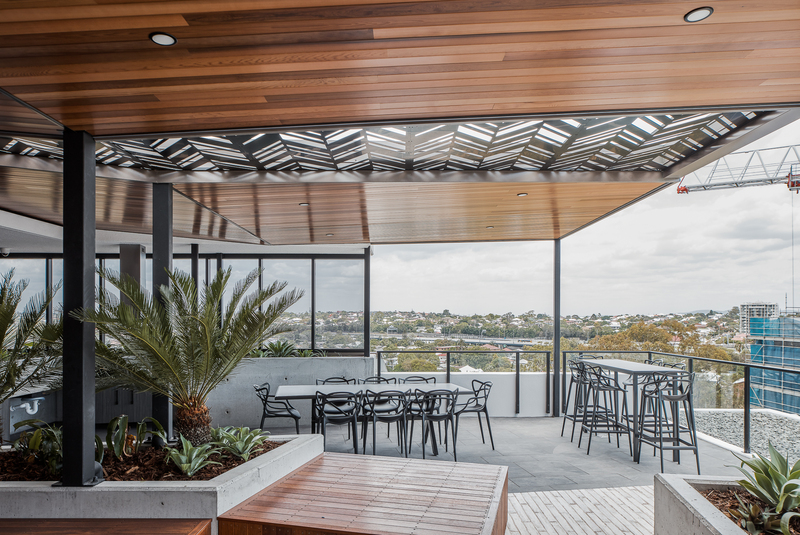 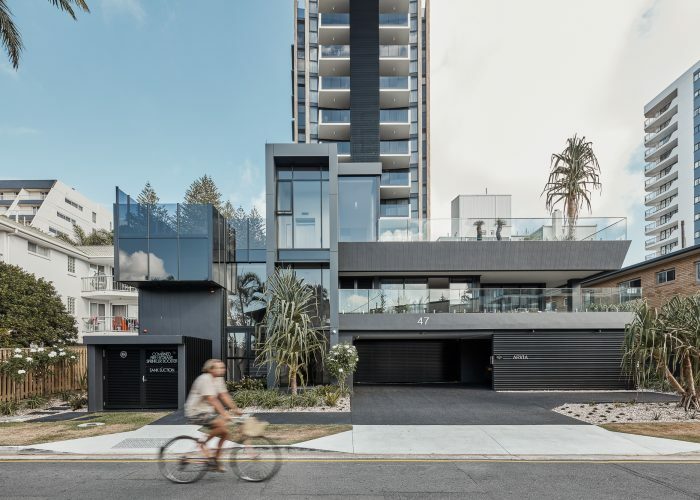 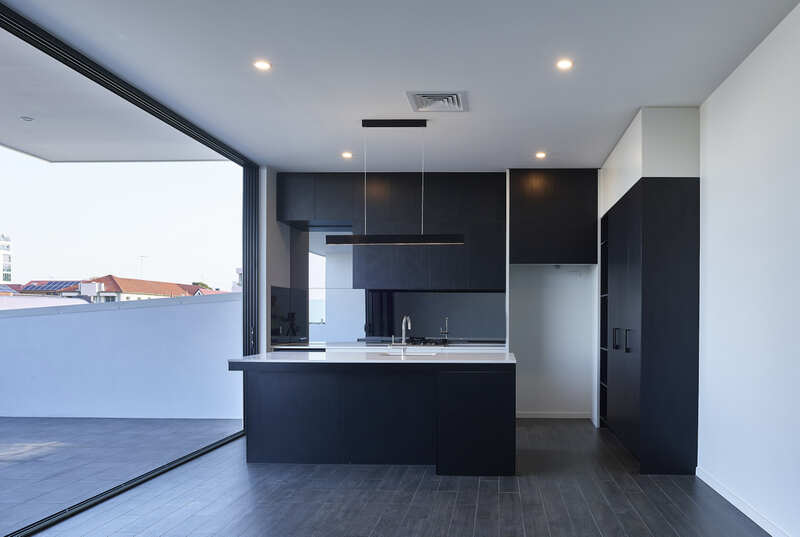 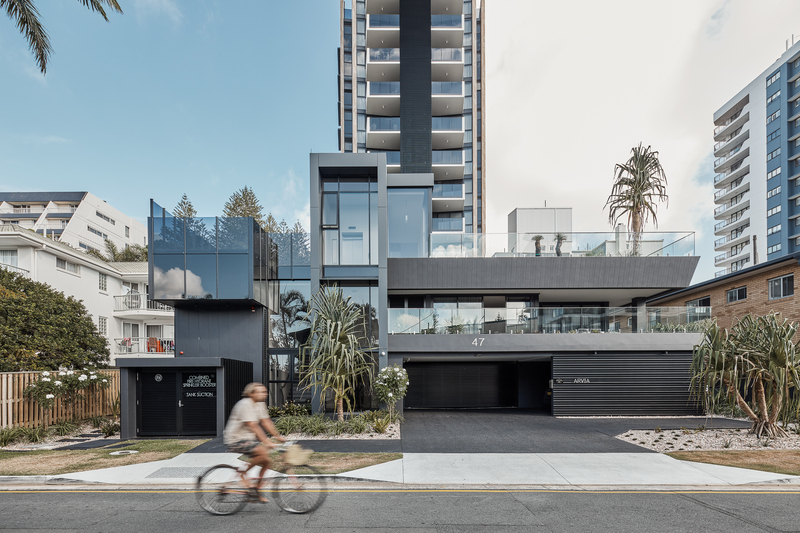 The design response has been to imagine the home as a procession of 5 distinct spaces, each with their own function, transitioning from the historic Moreton Bay Fig Tree to the west and the views to the city to the east.